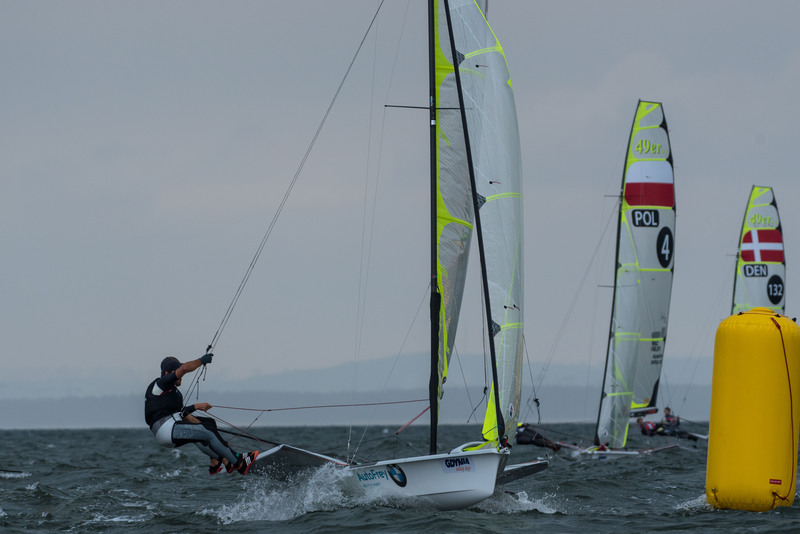 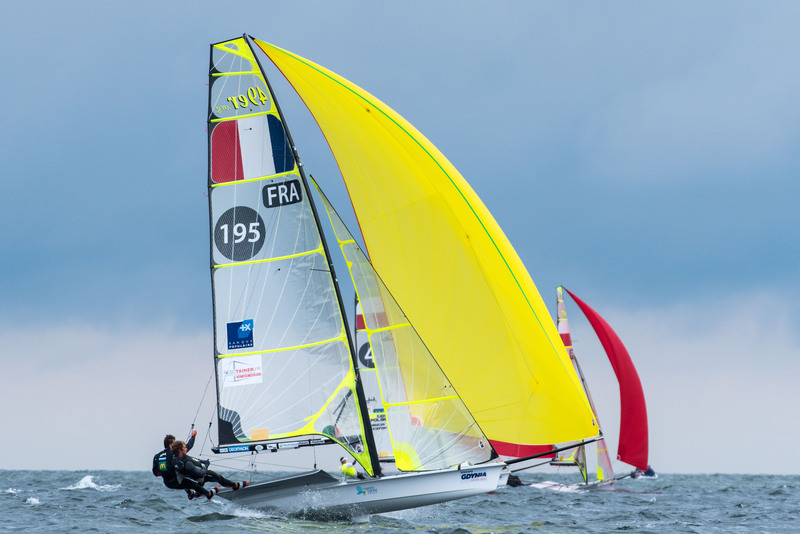 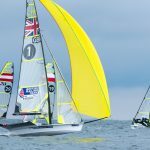 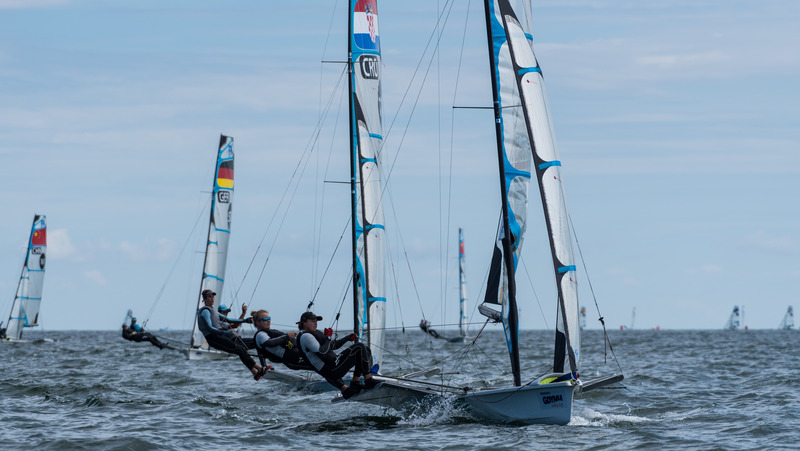 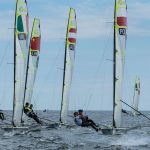 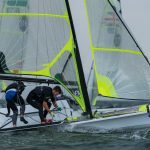 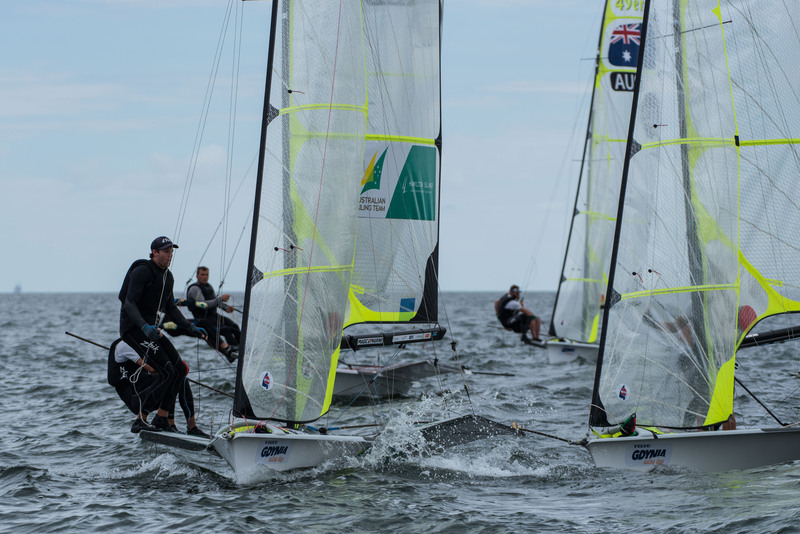 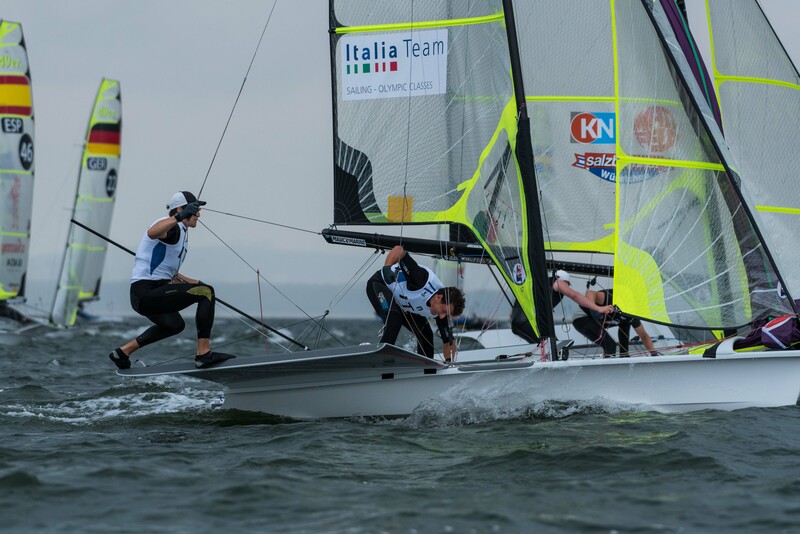 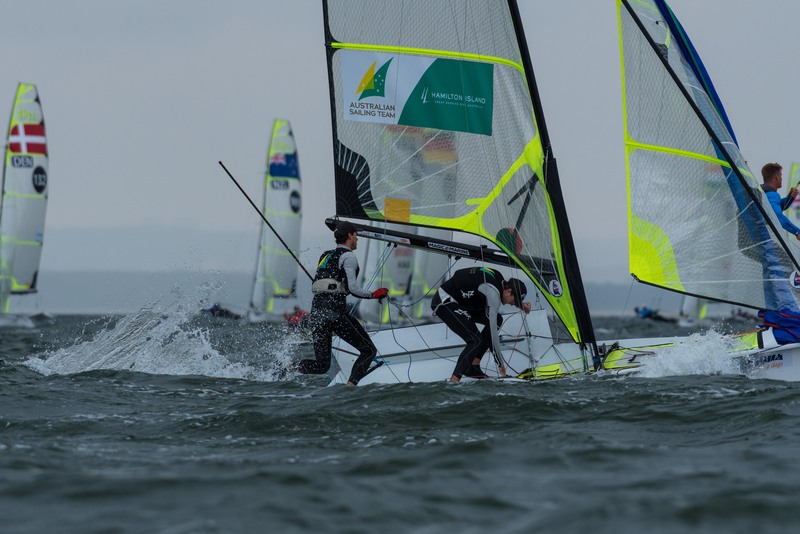 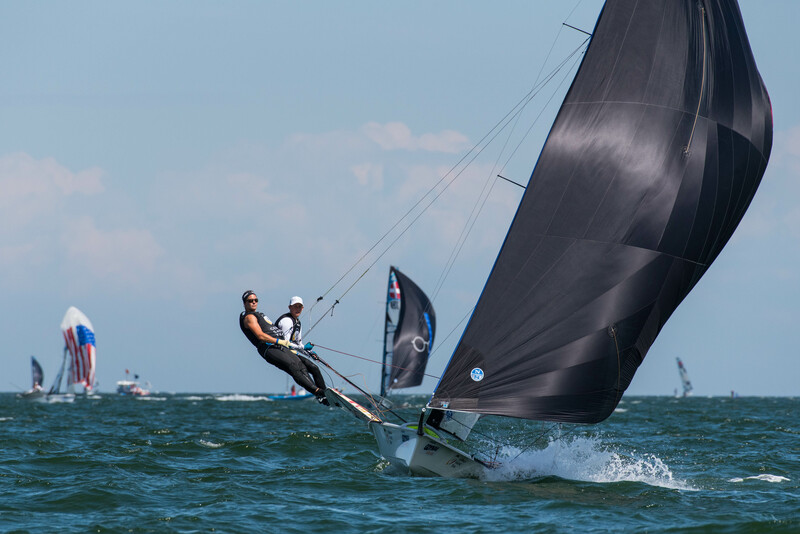 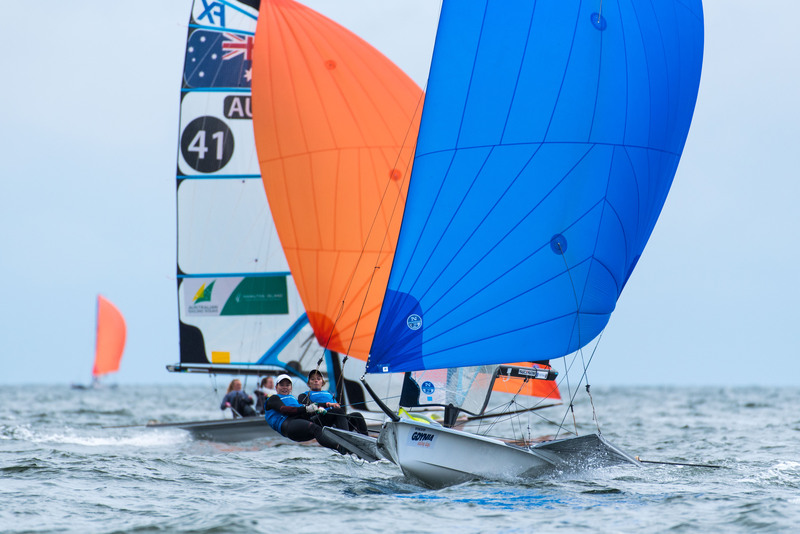 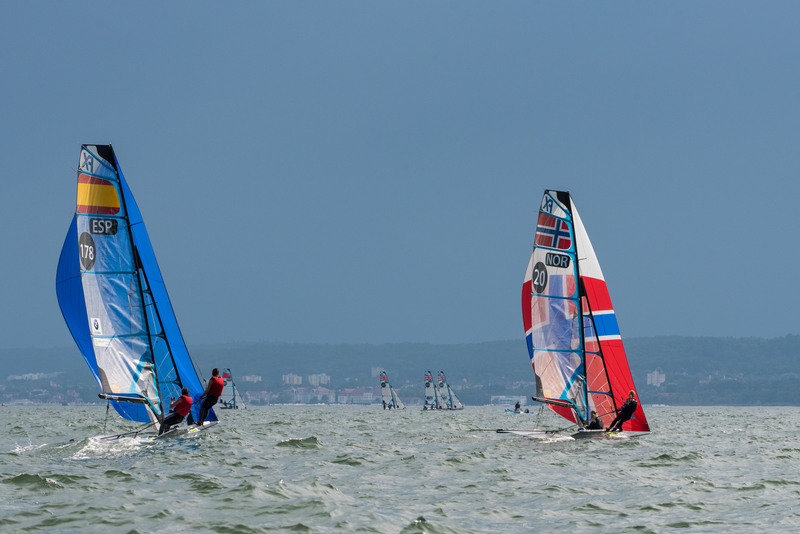 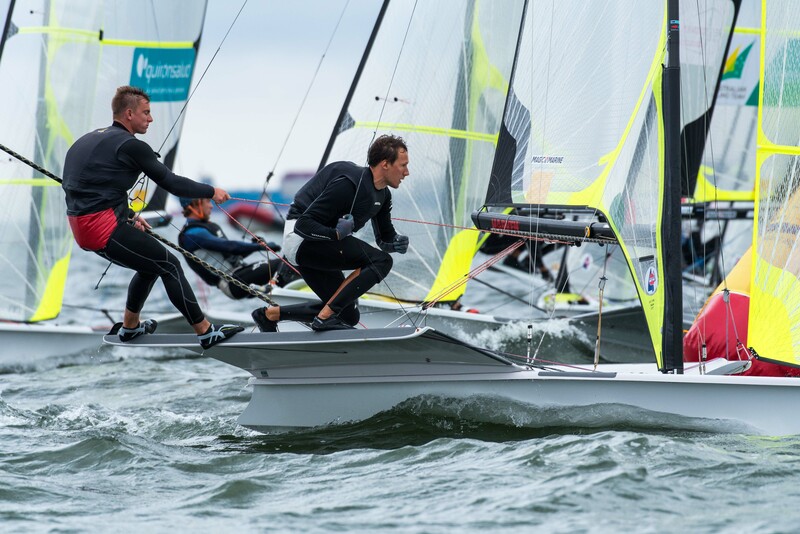 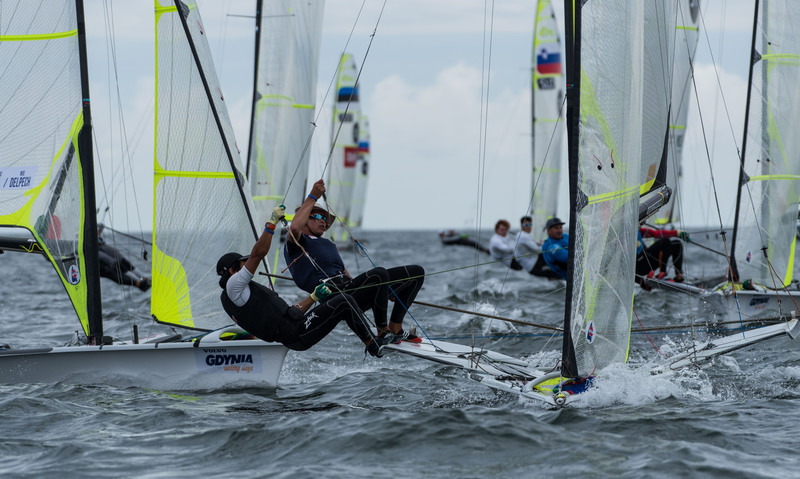 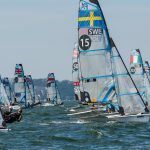 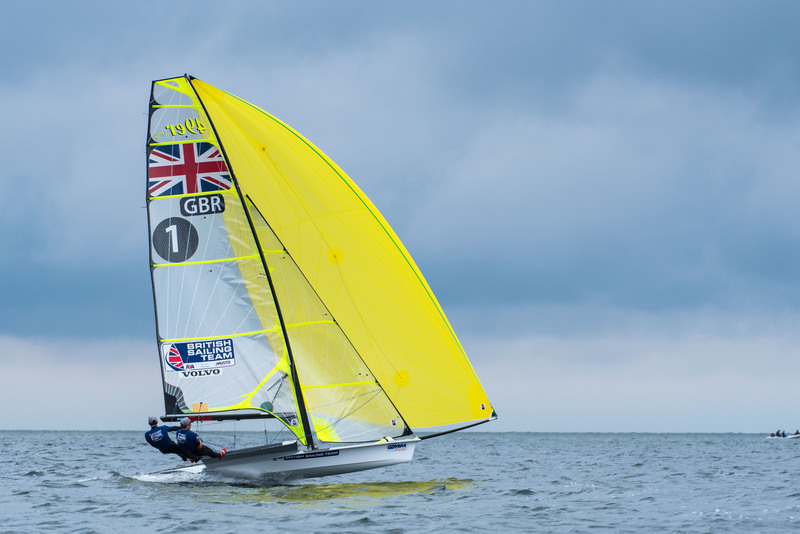 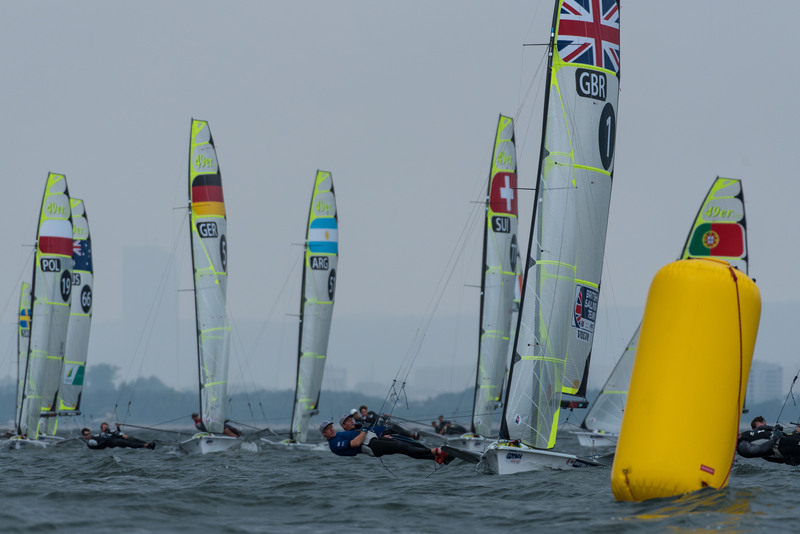 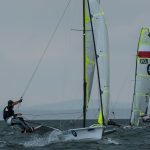 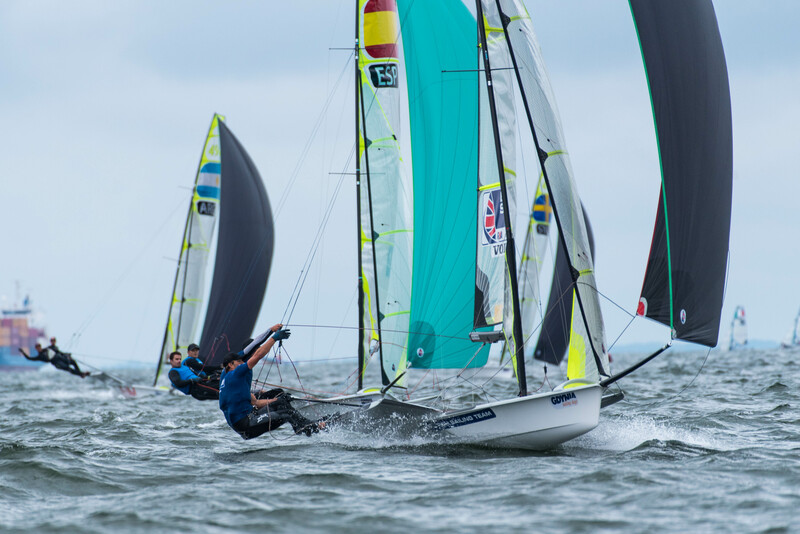 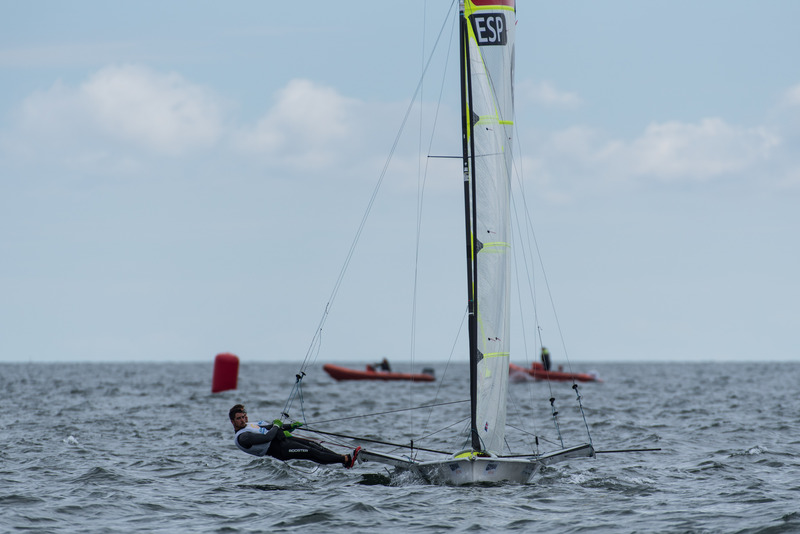 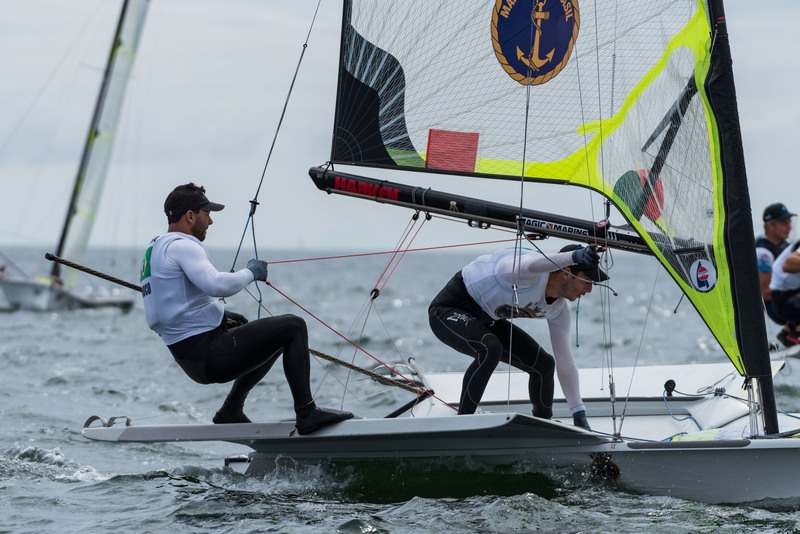 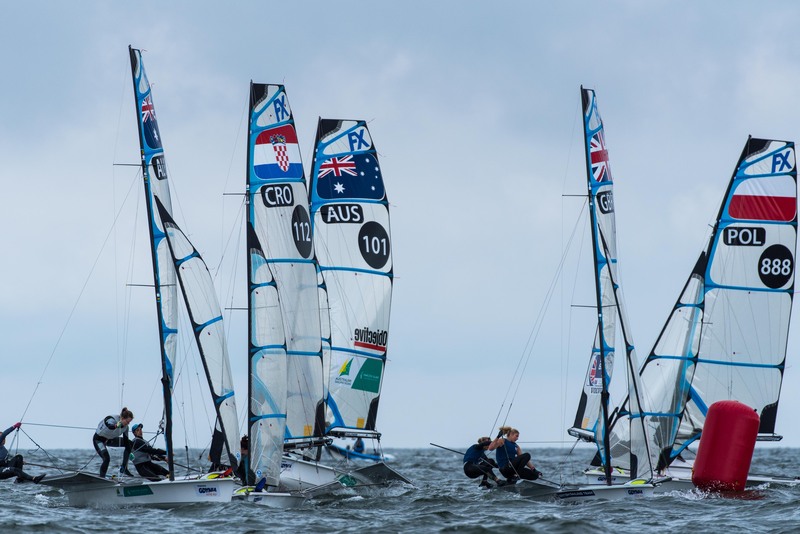 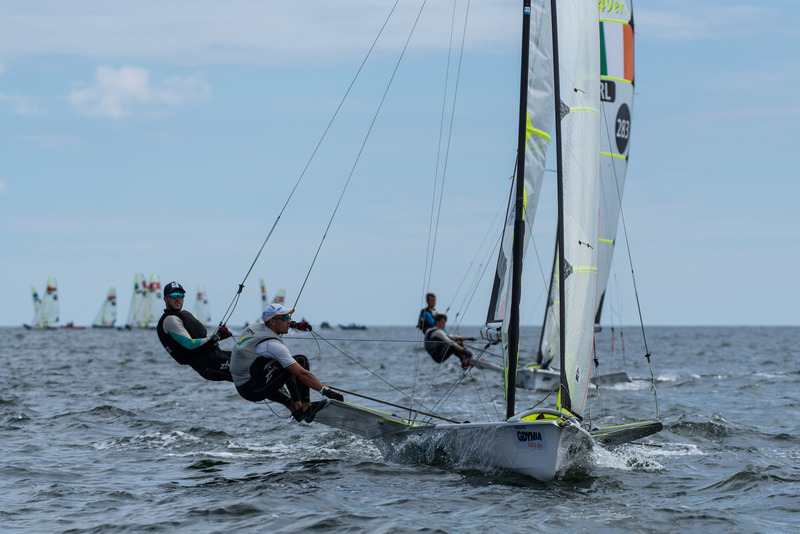 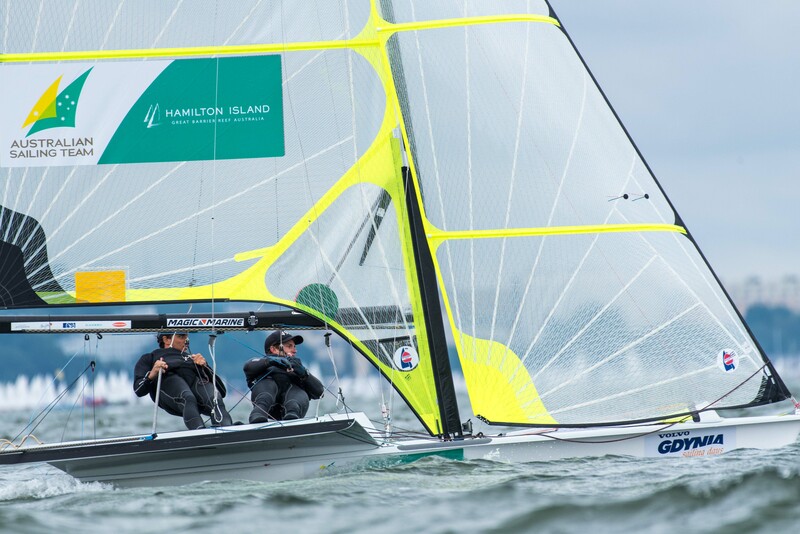 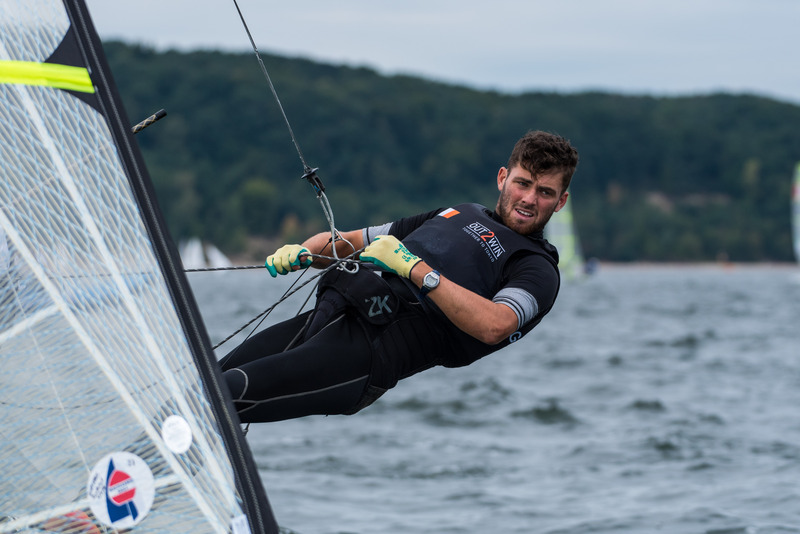 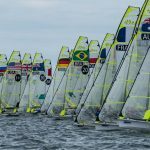 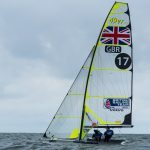 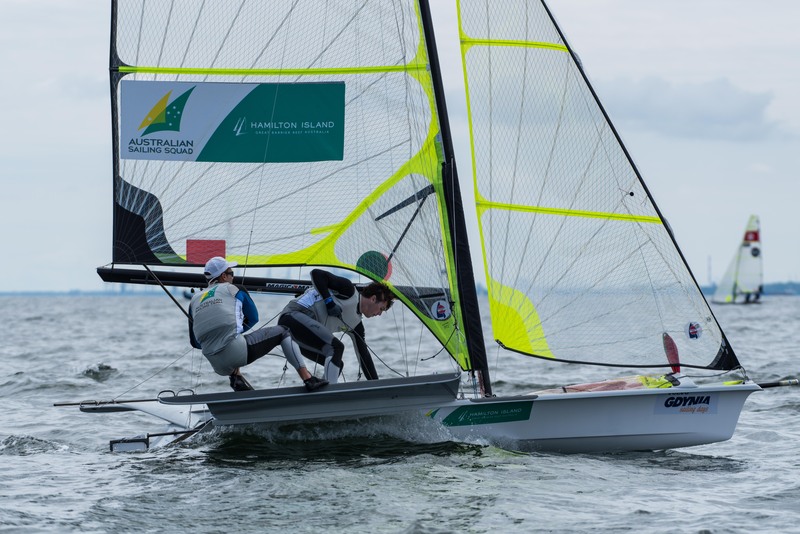 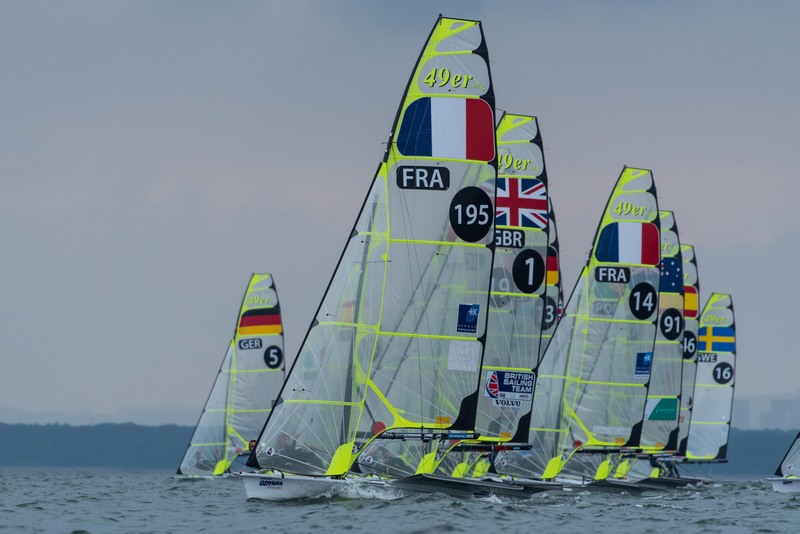 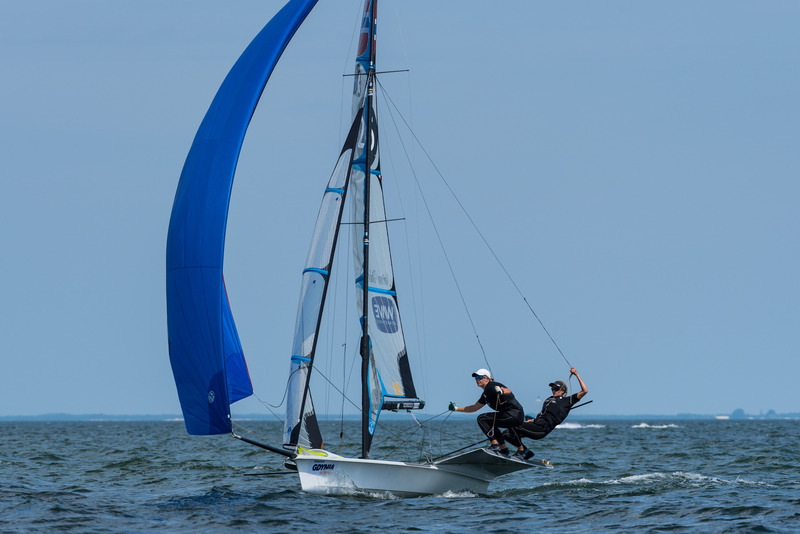 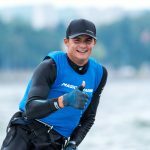 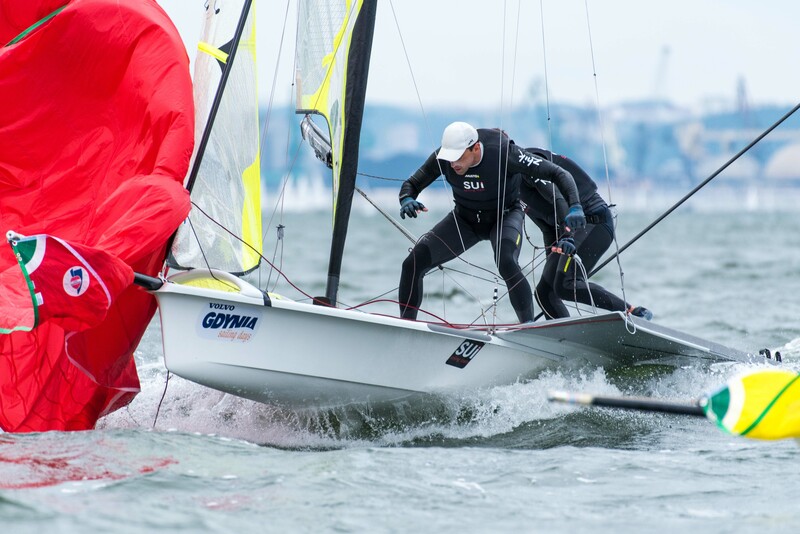 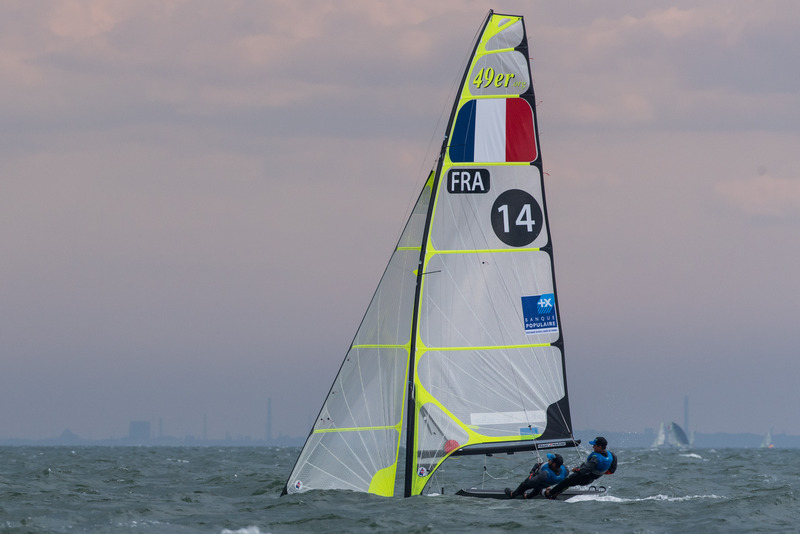 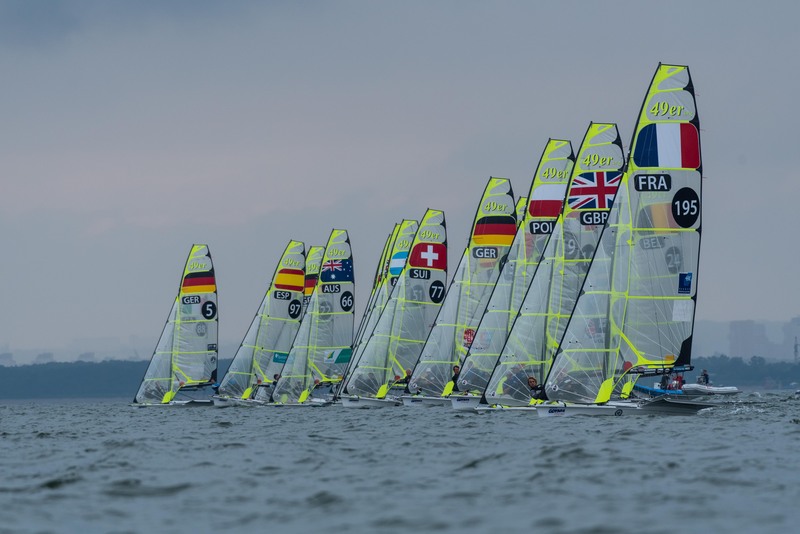 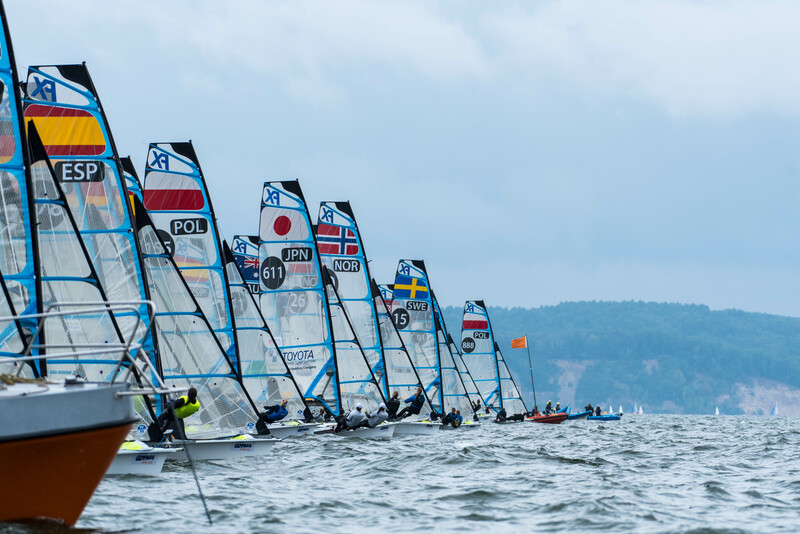 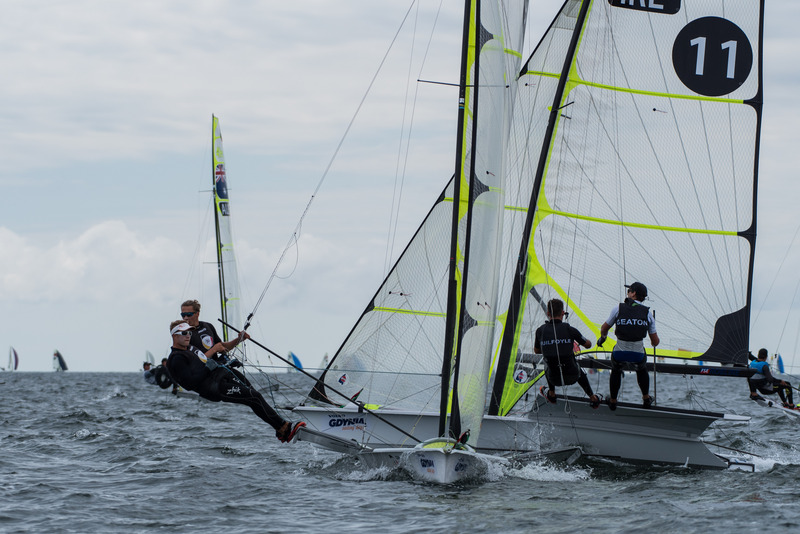 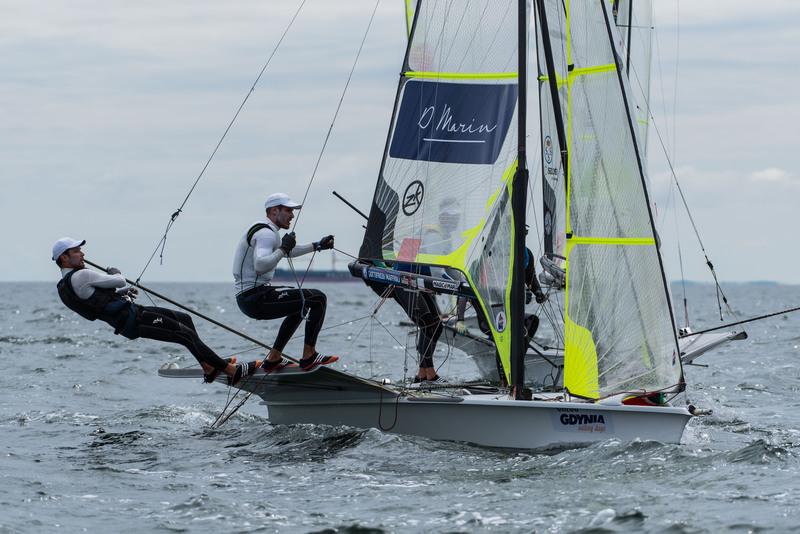 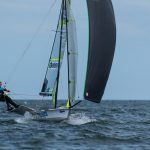 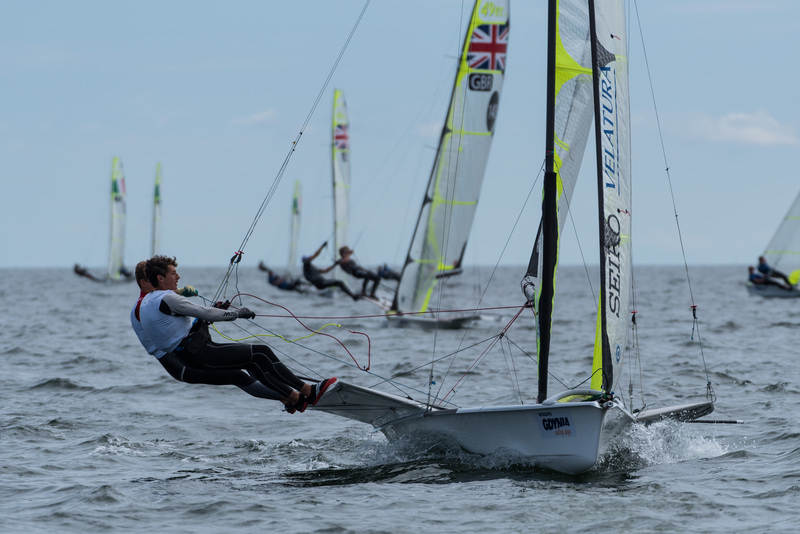 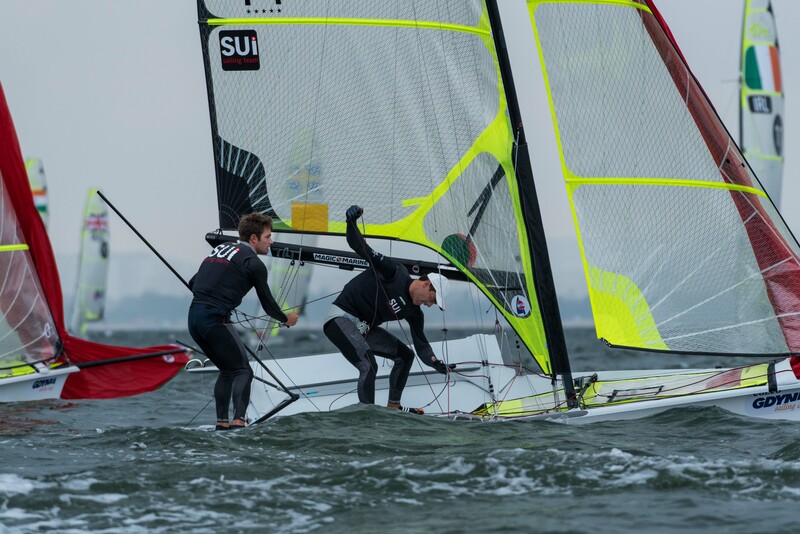 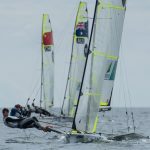 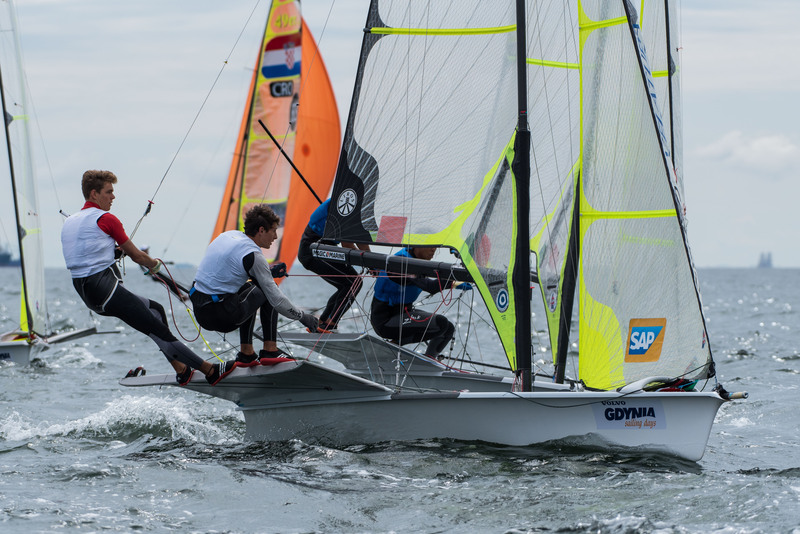 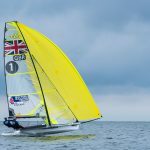 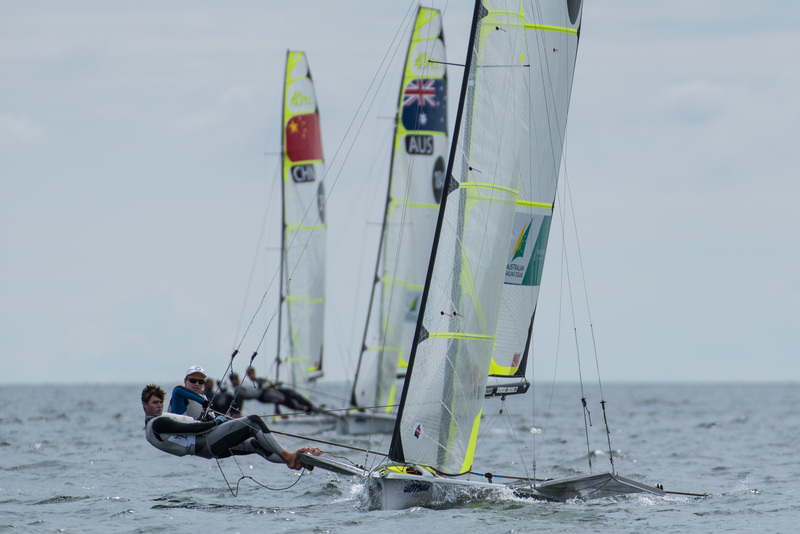 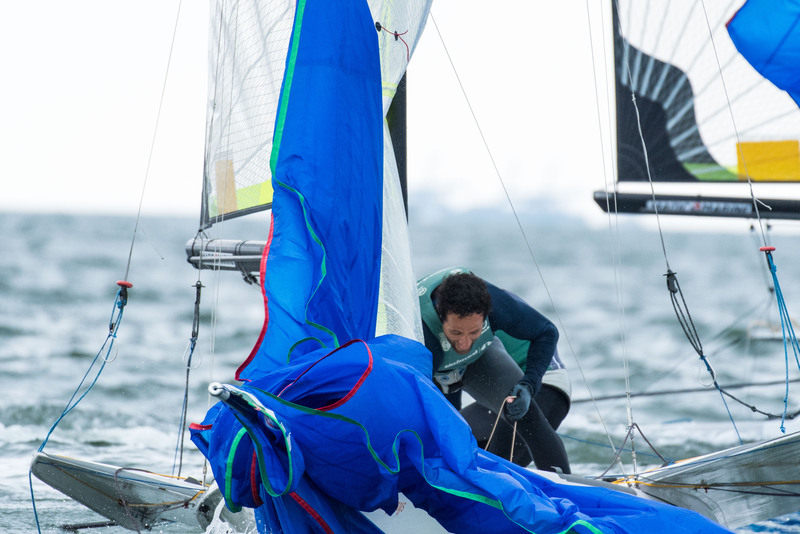 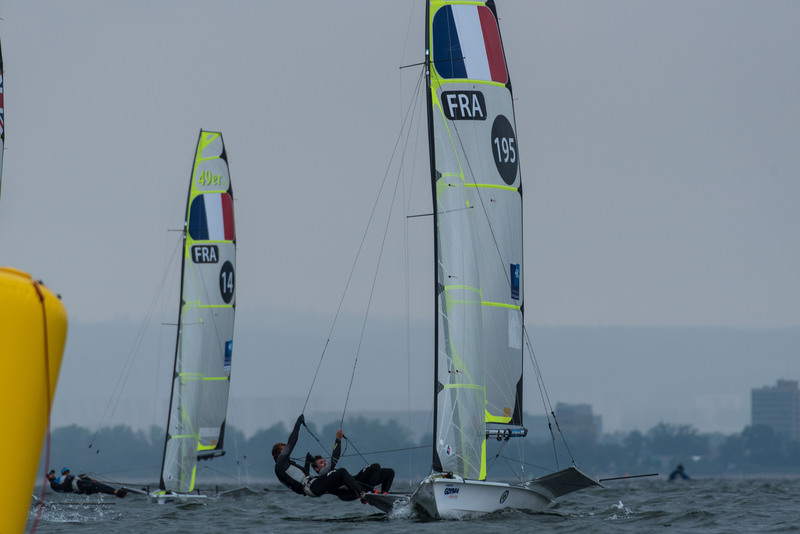 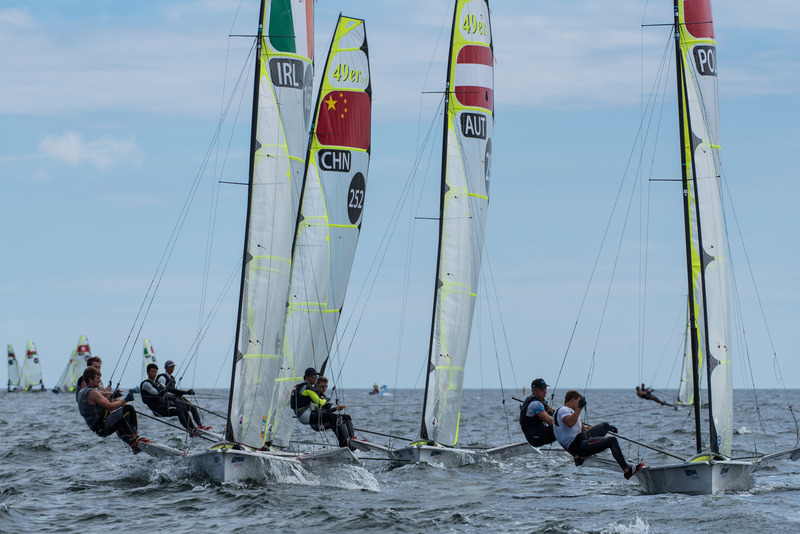 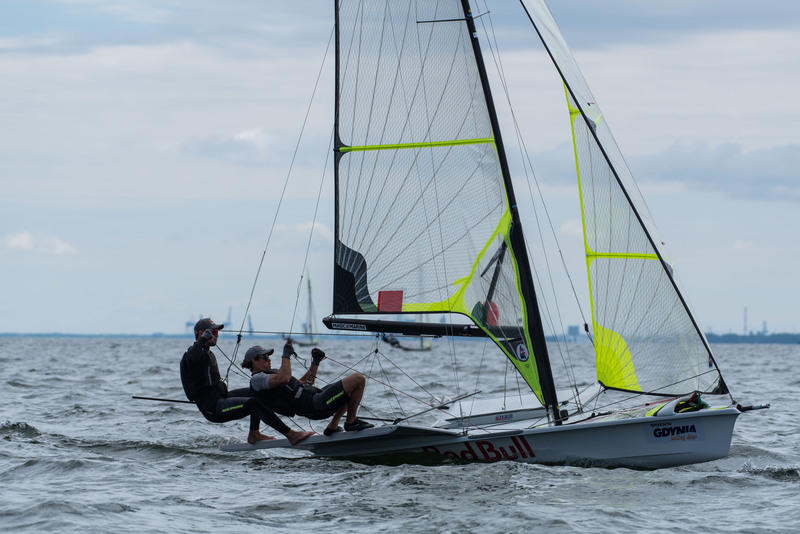 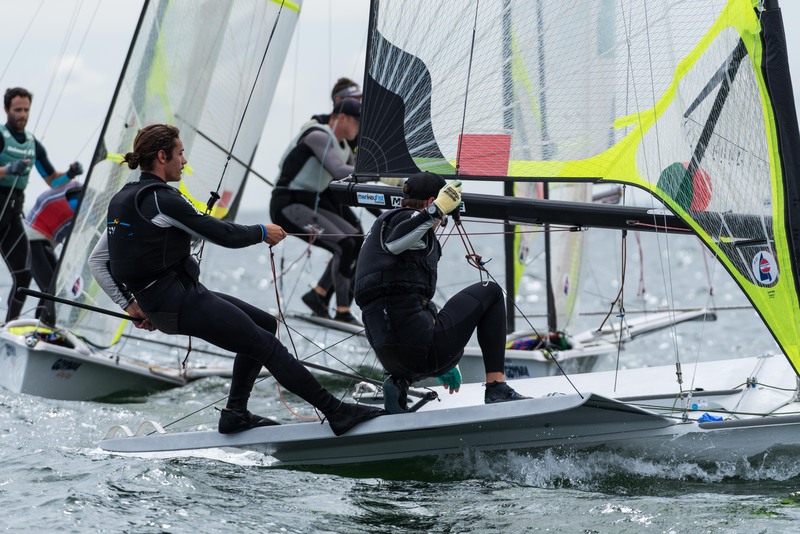 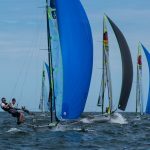 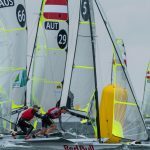 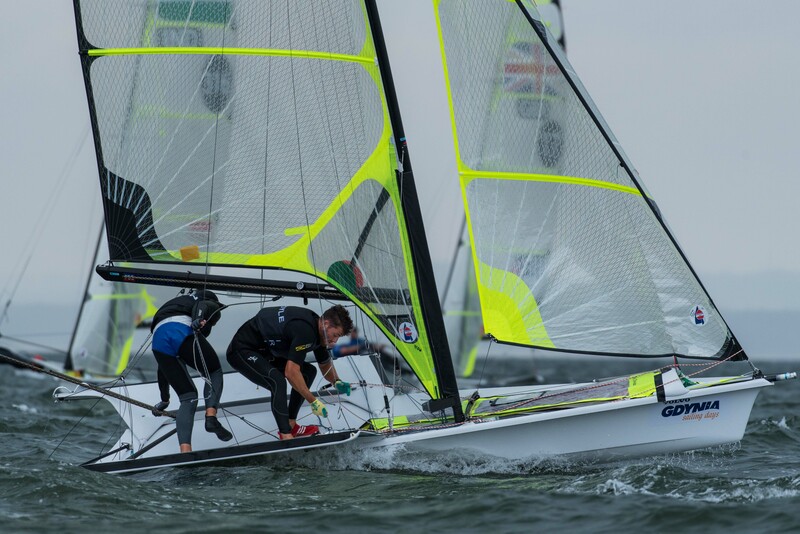 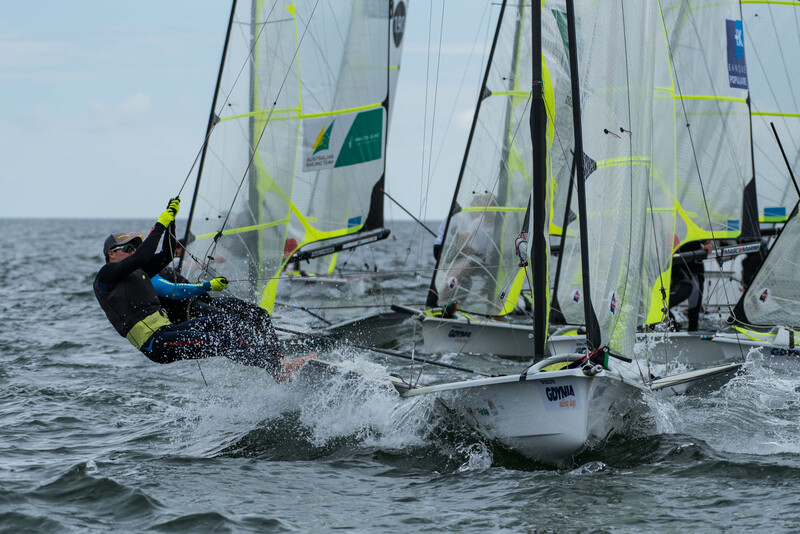 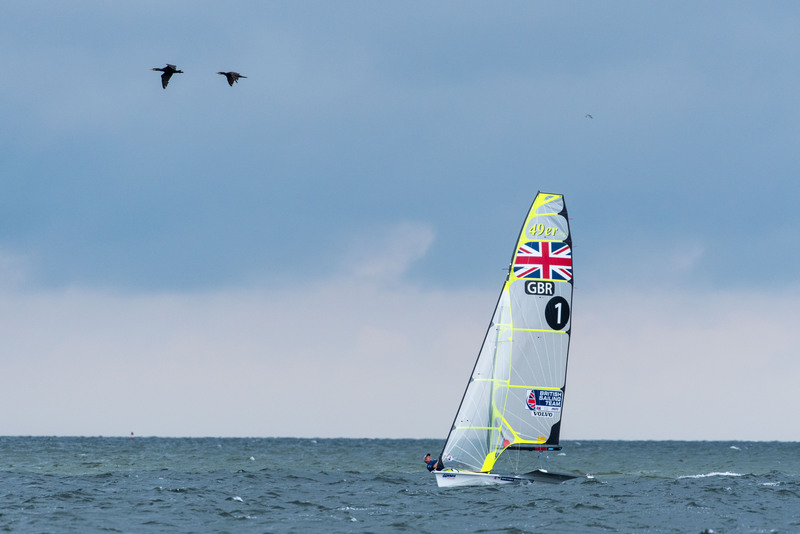 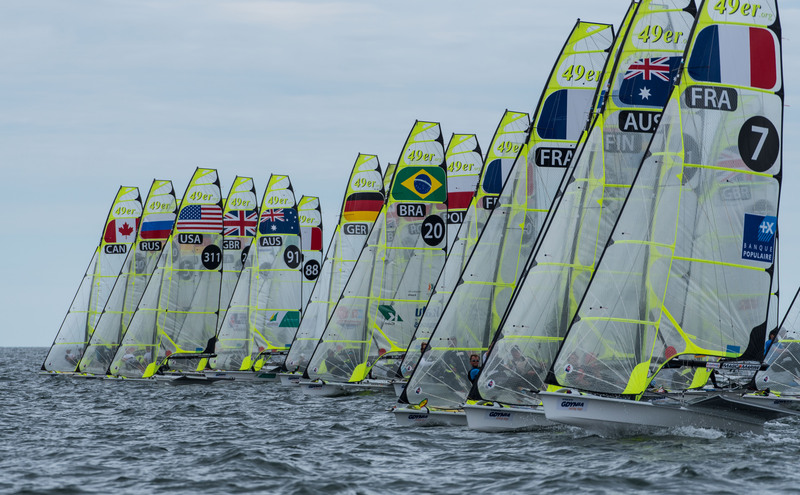 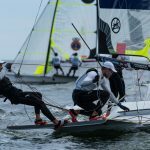 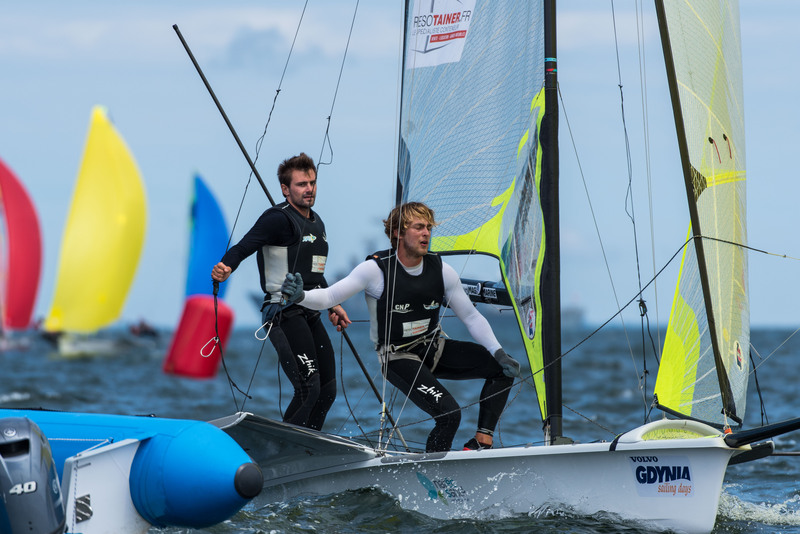 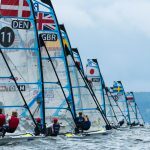 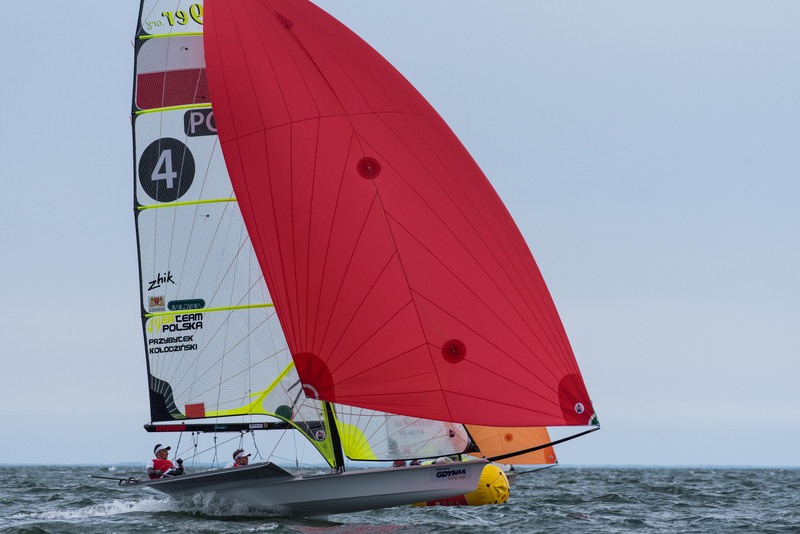 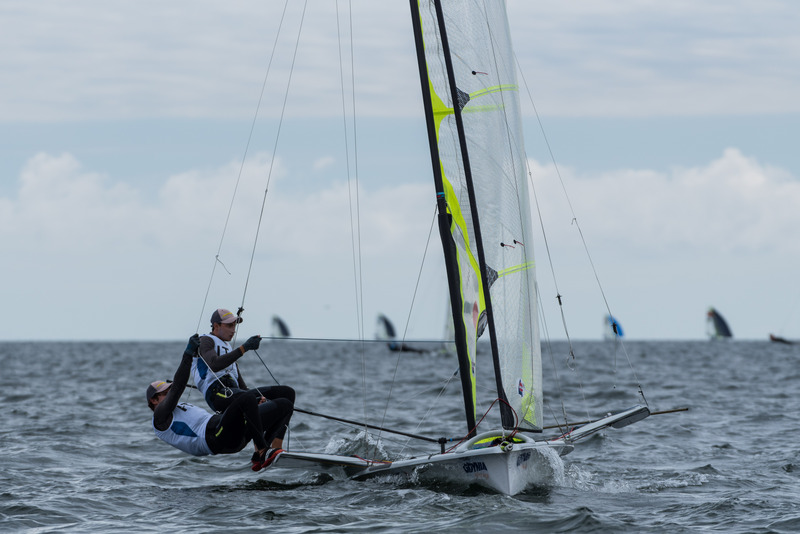 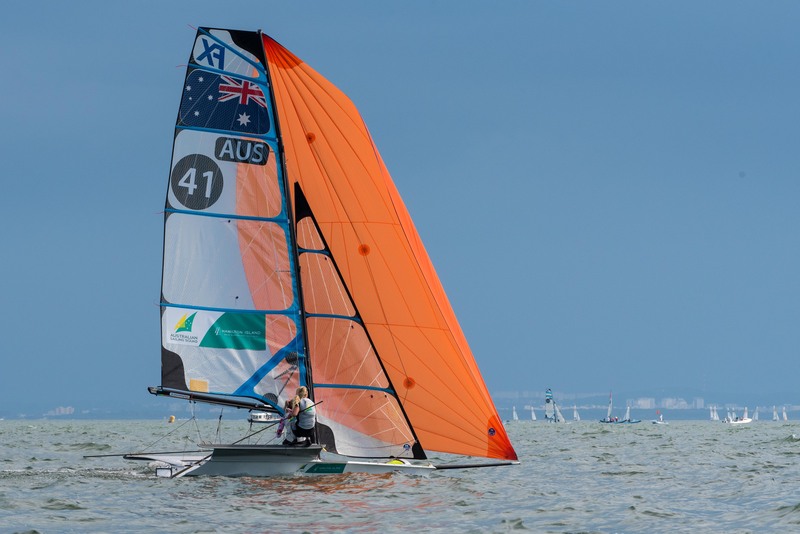 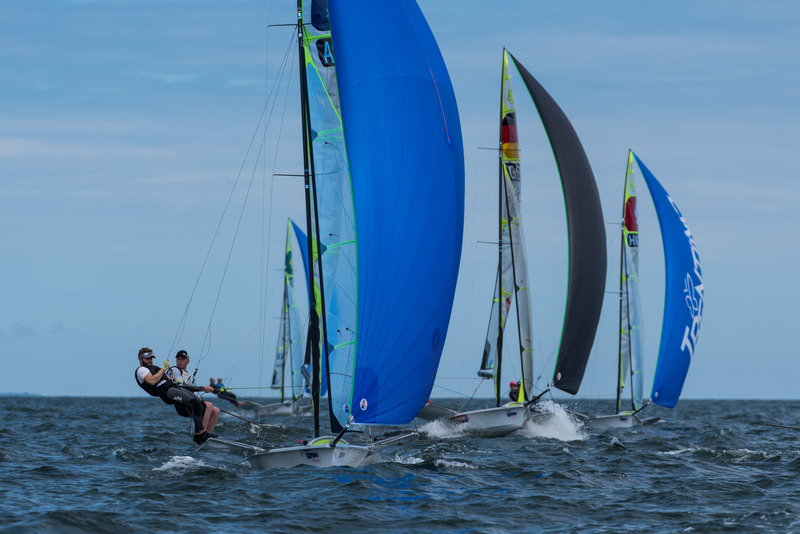 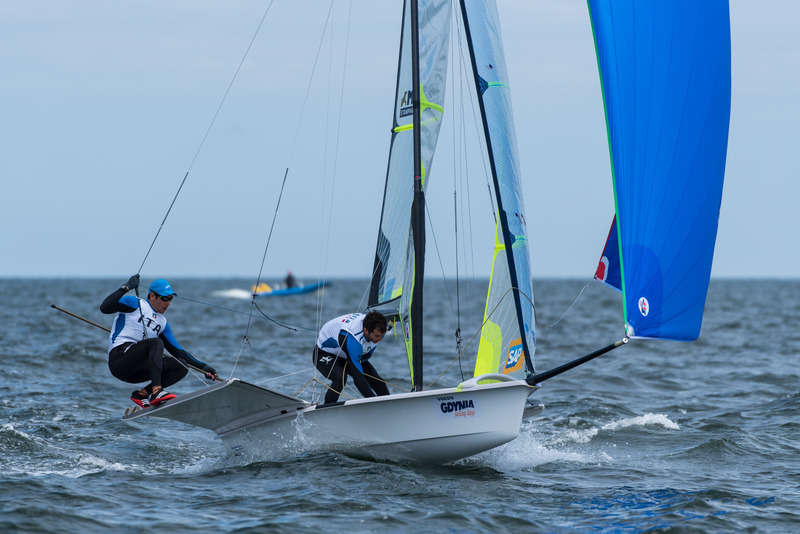 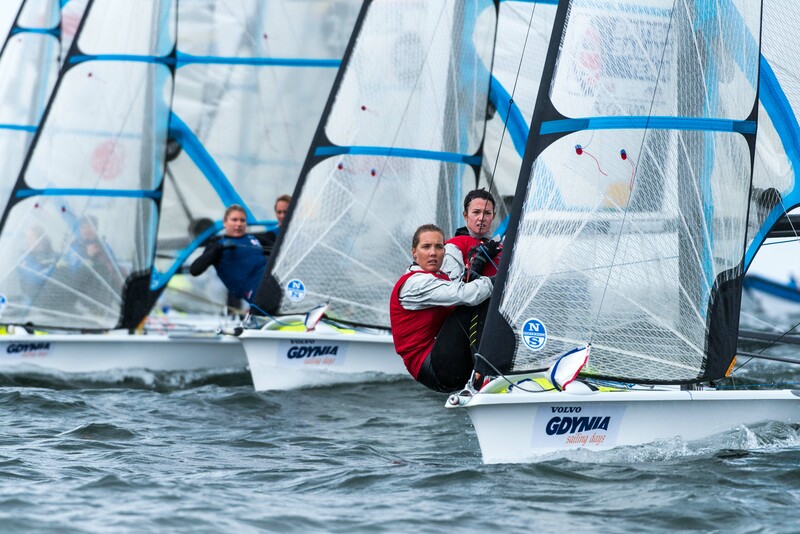 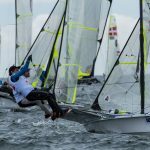 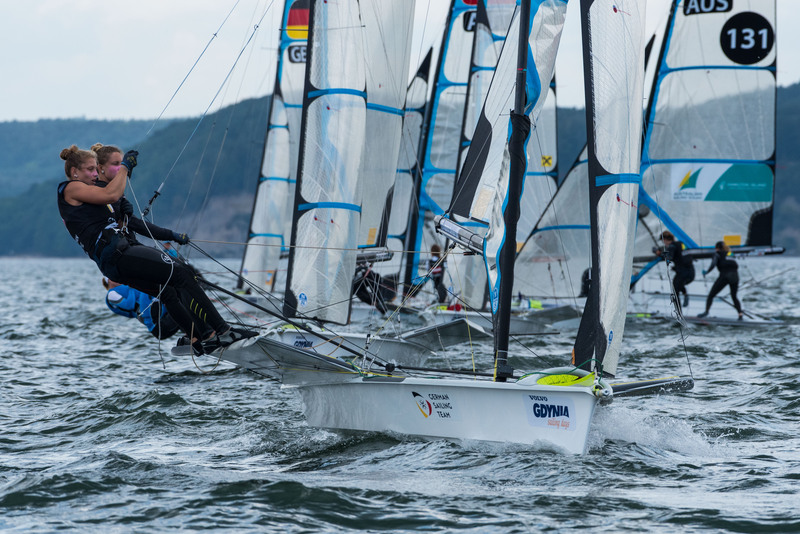 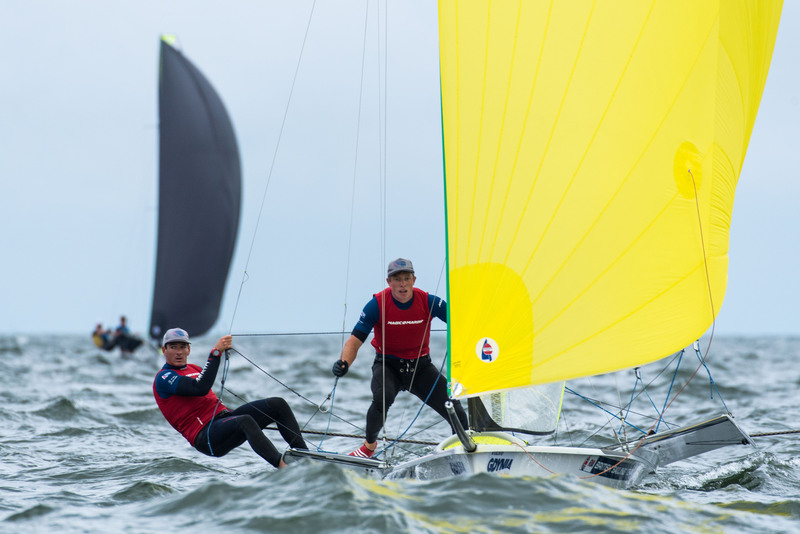 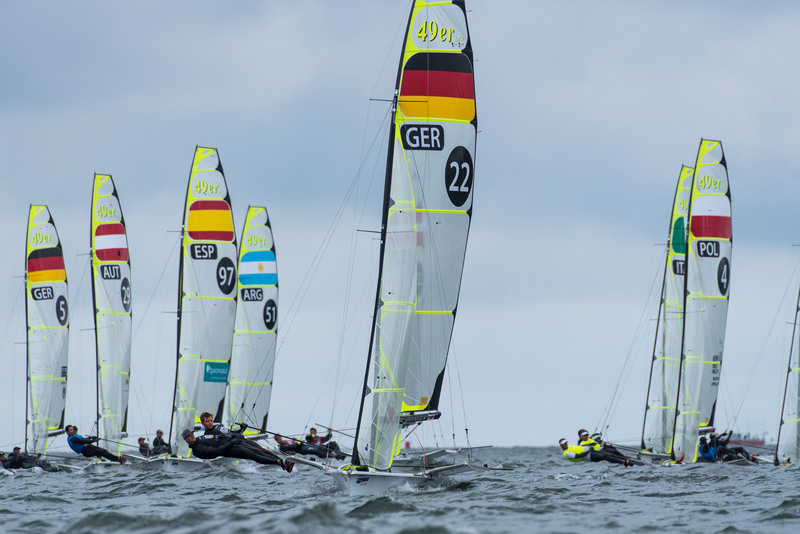 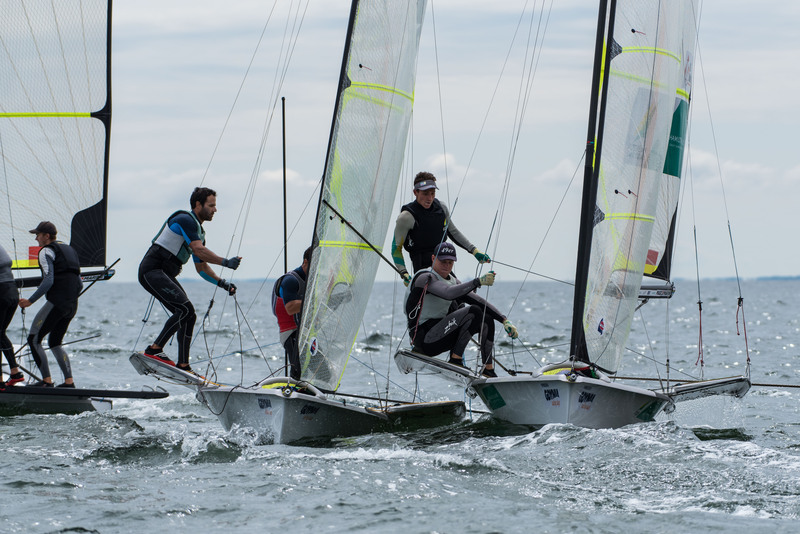 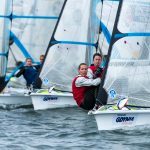 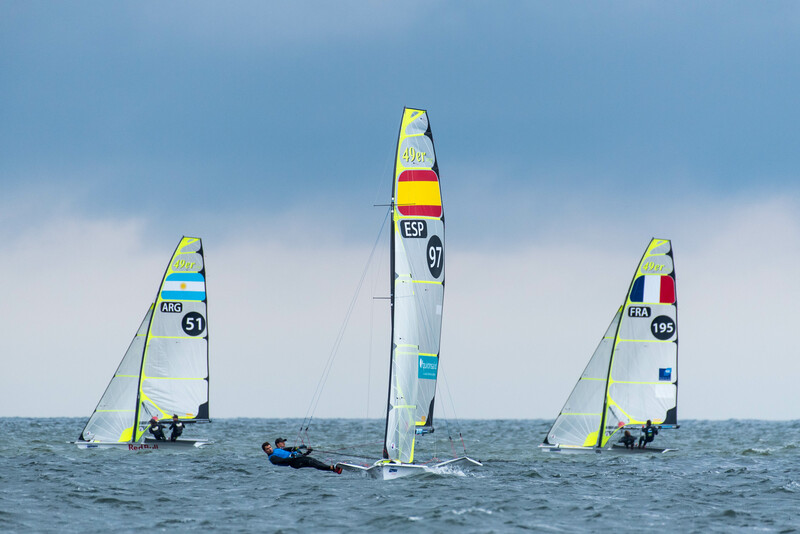 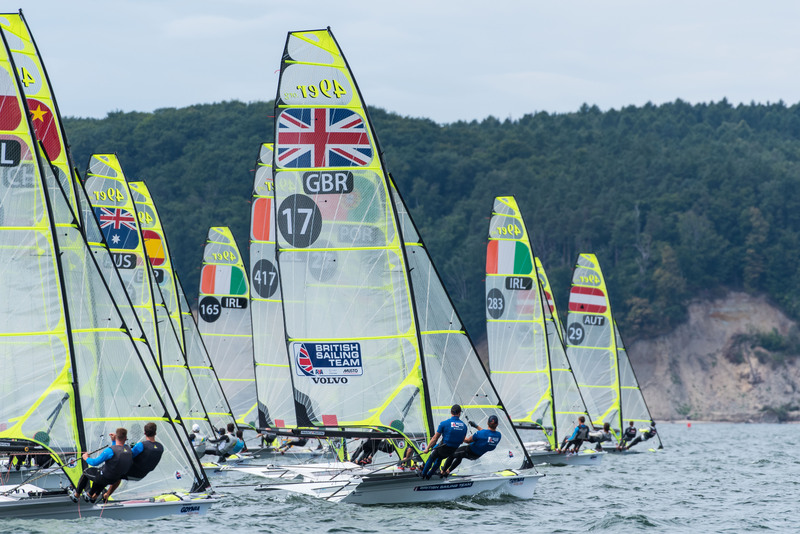 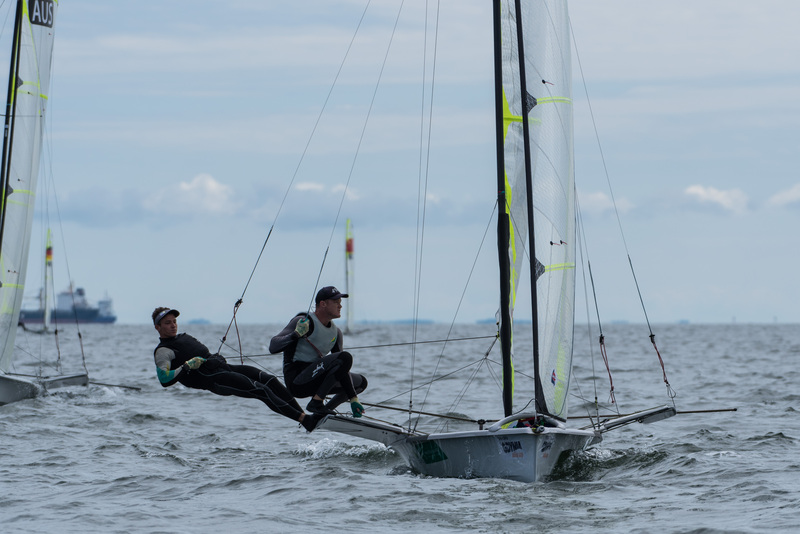 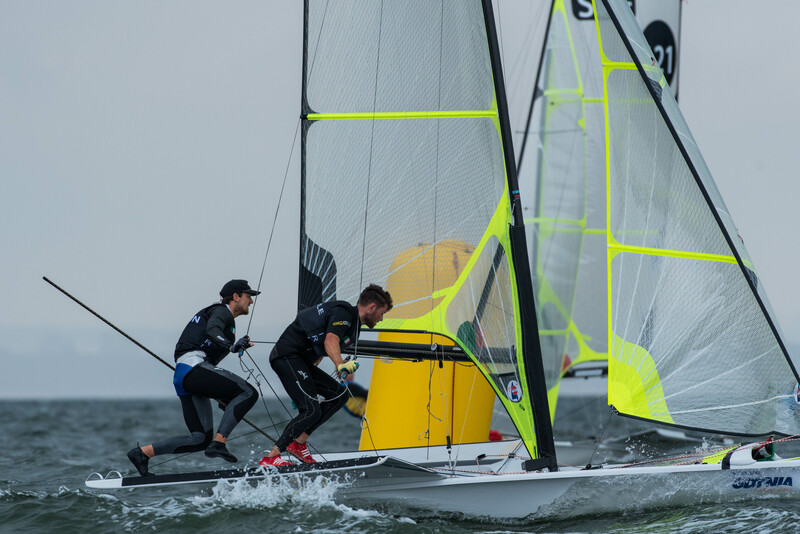 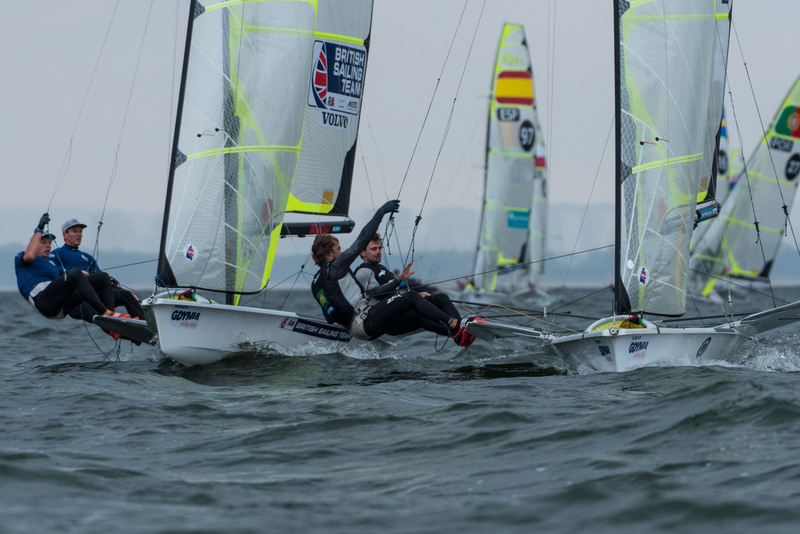 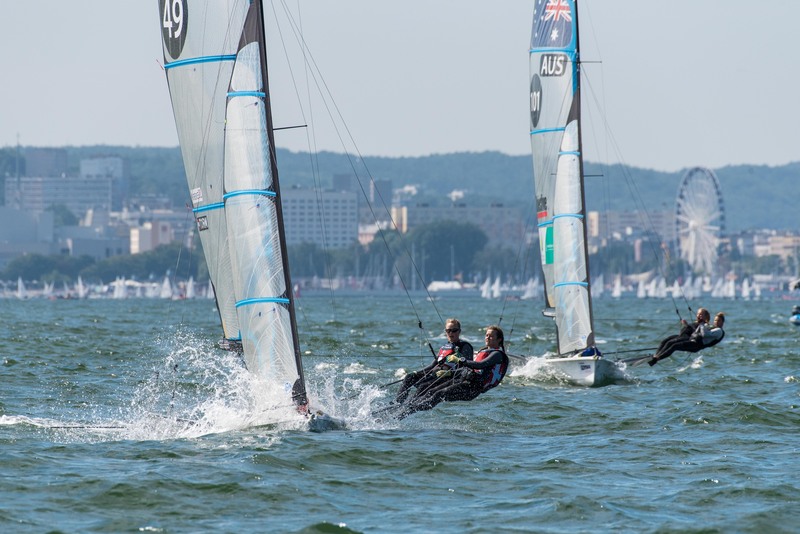 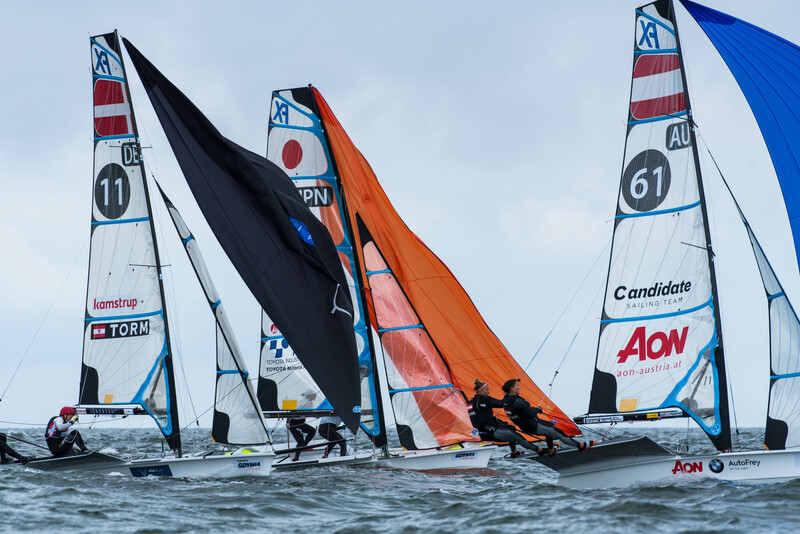 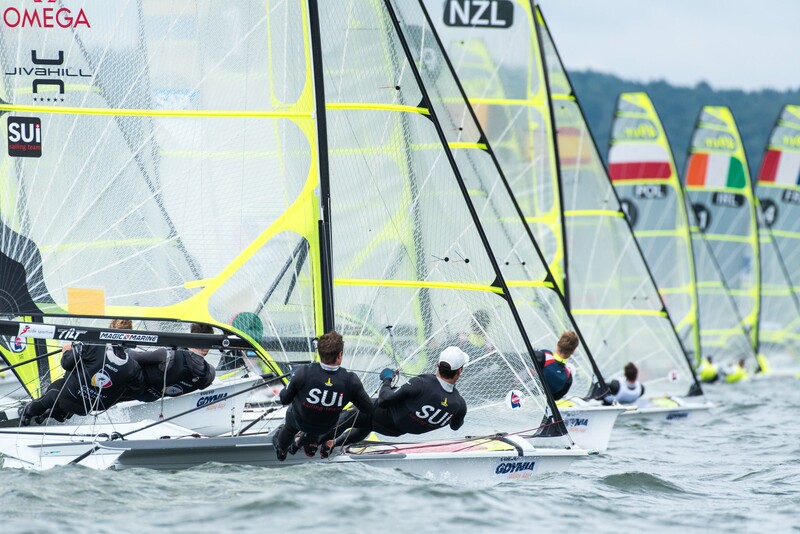 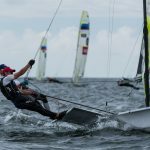 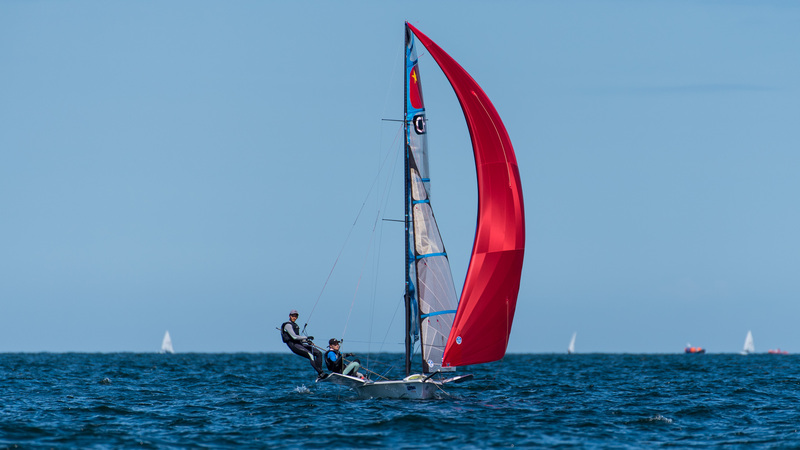 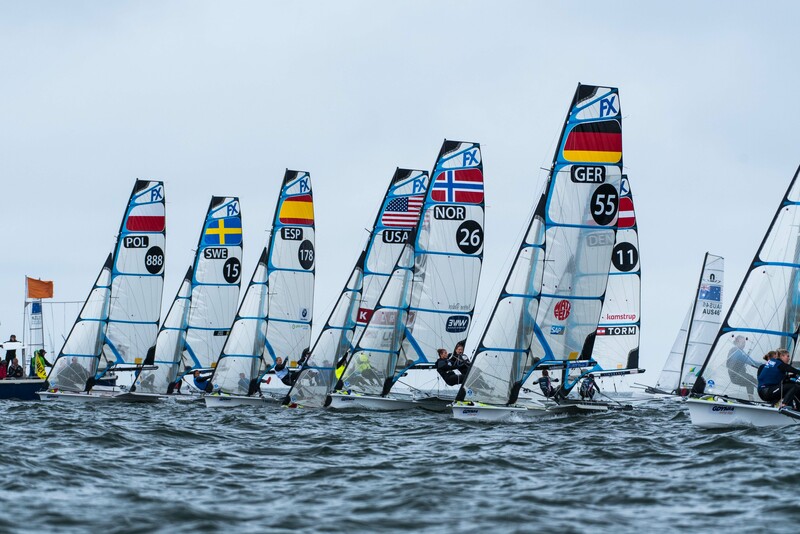 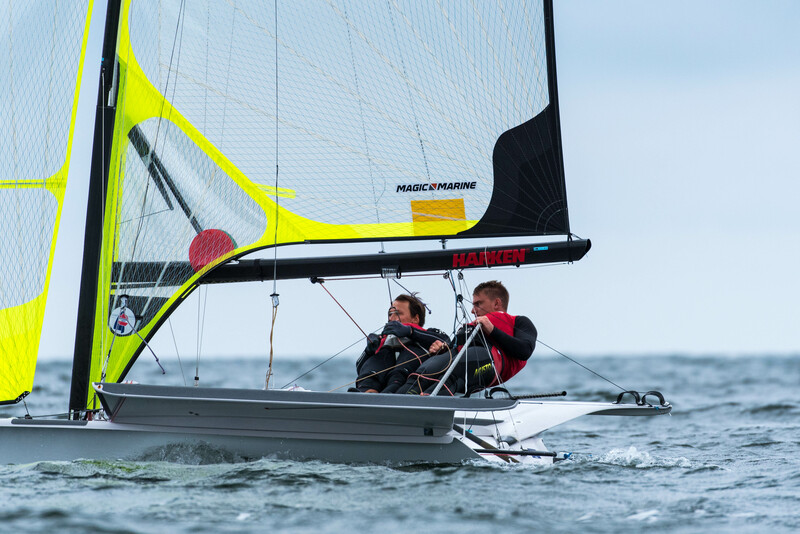 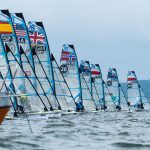 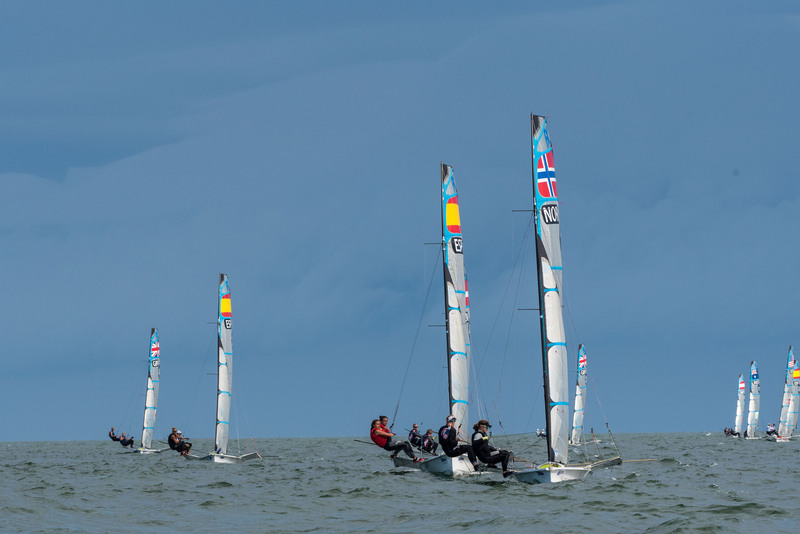 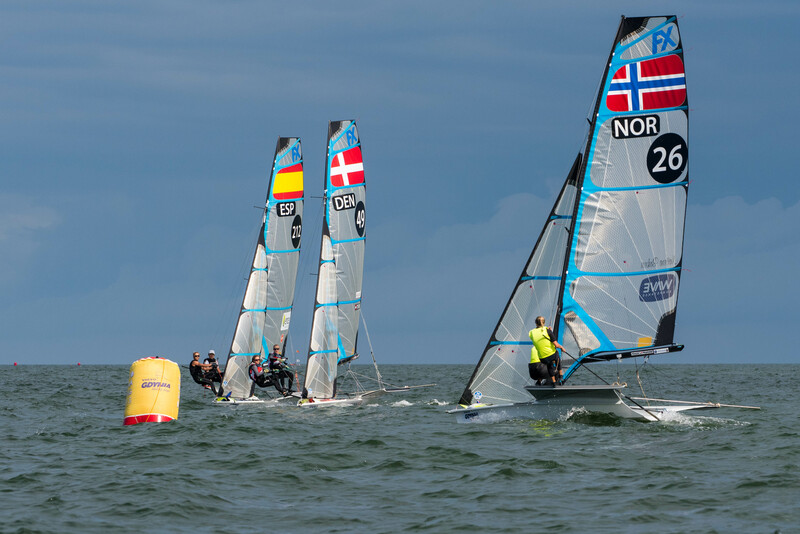 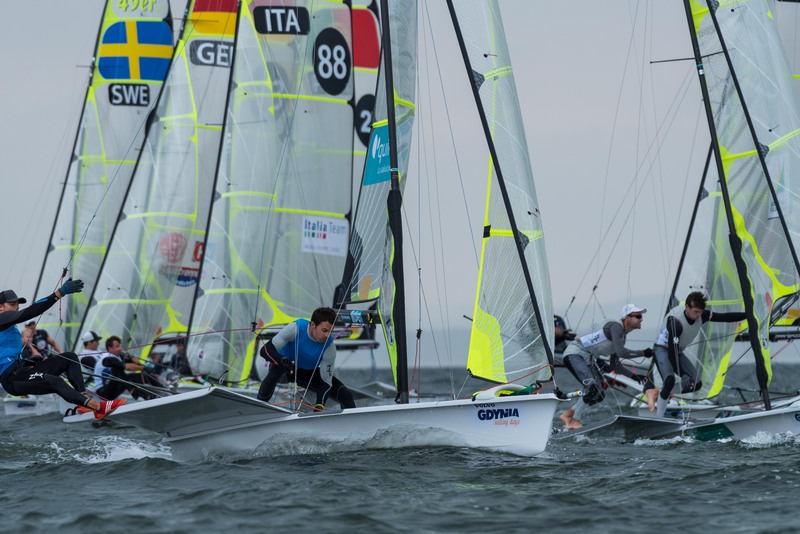 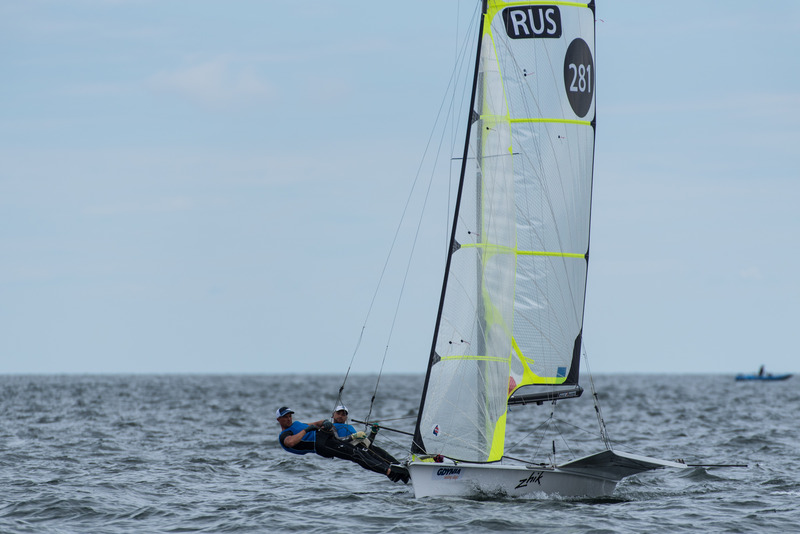 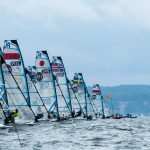 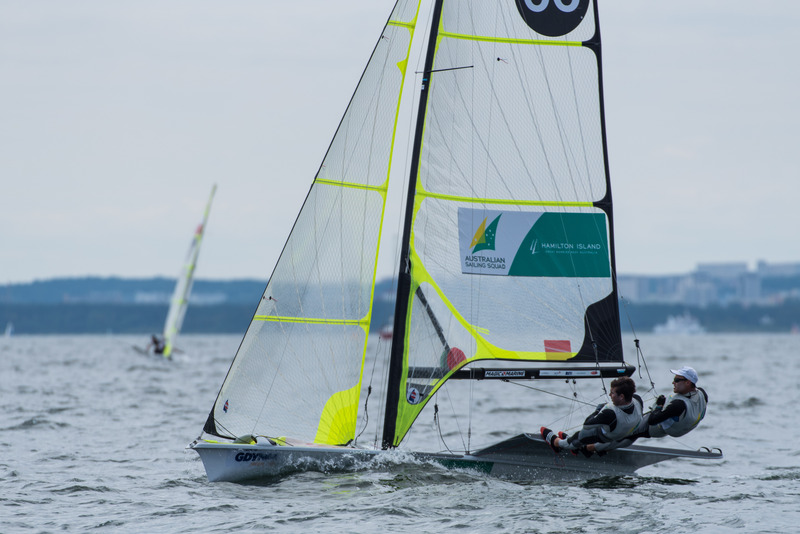 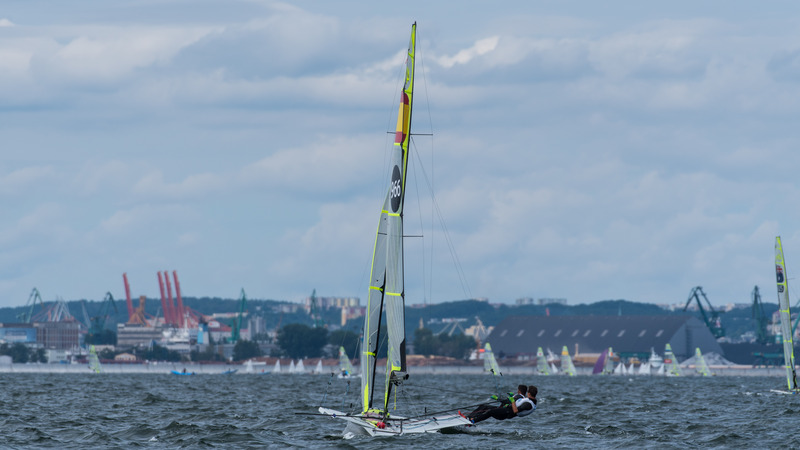 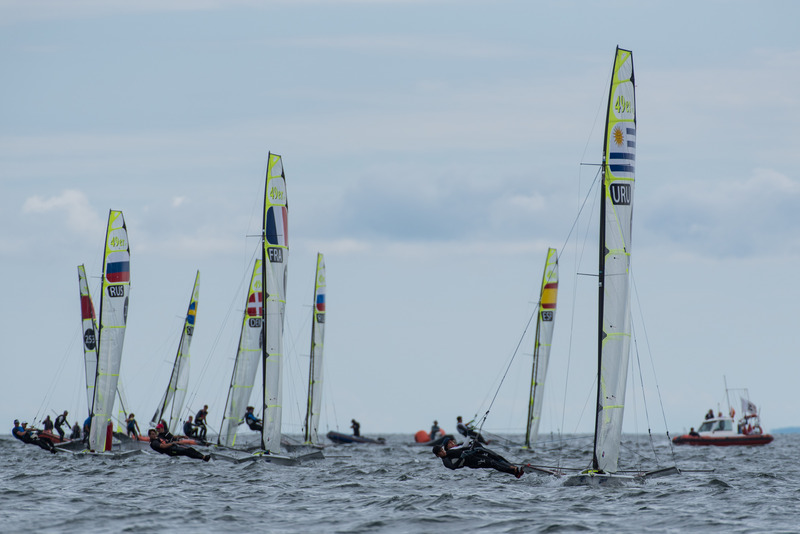 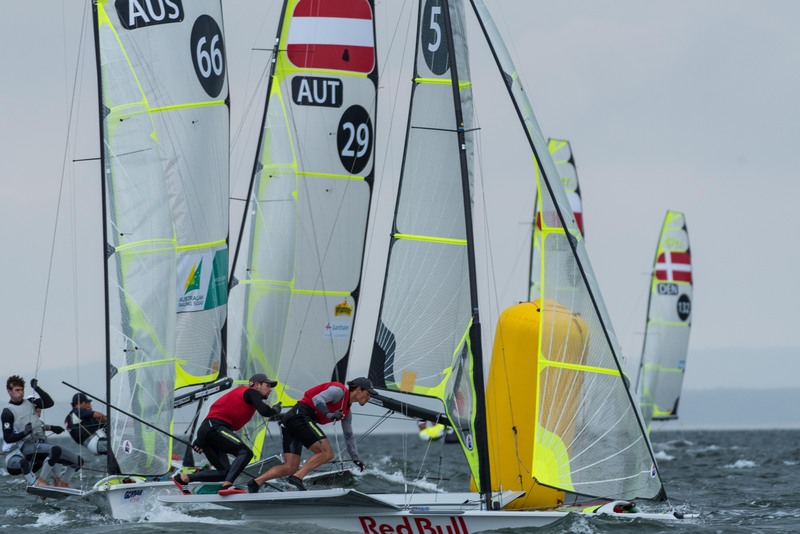 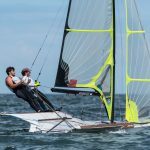 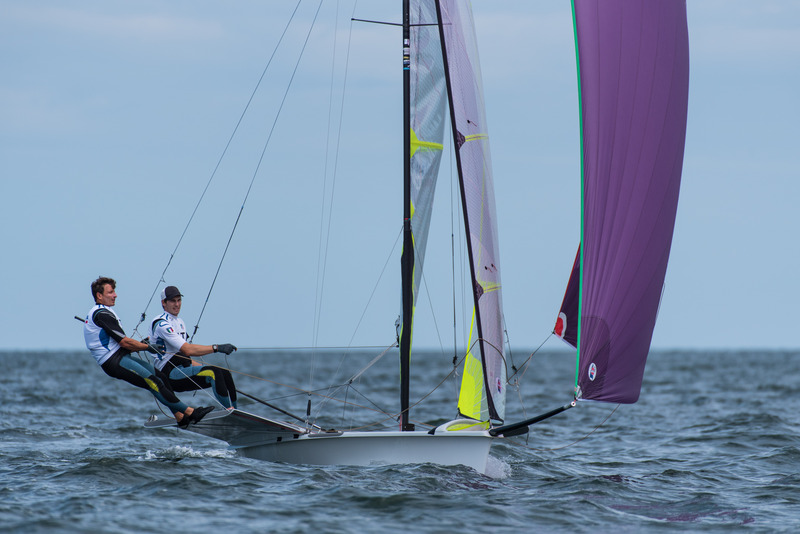 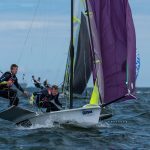 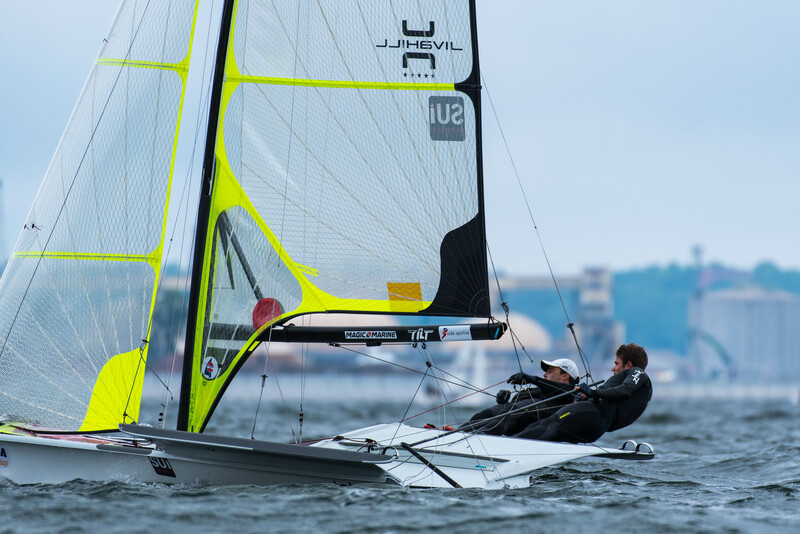 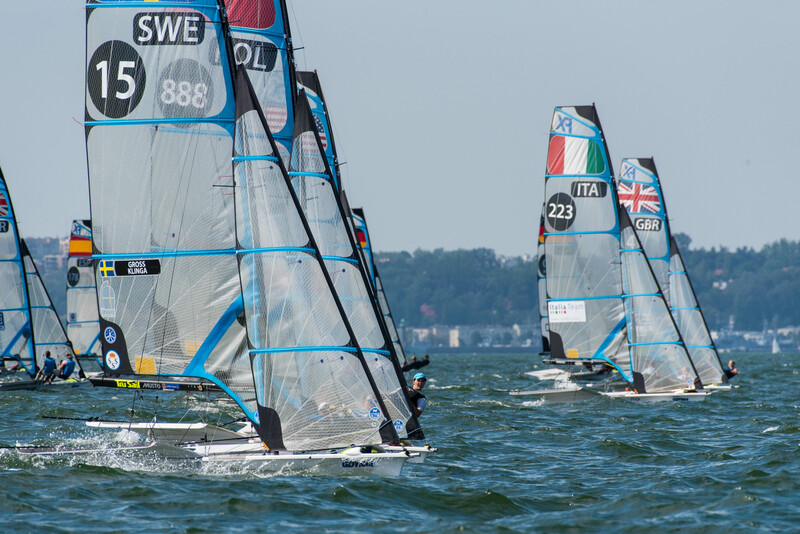 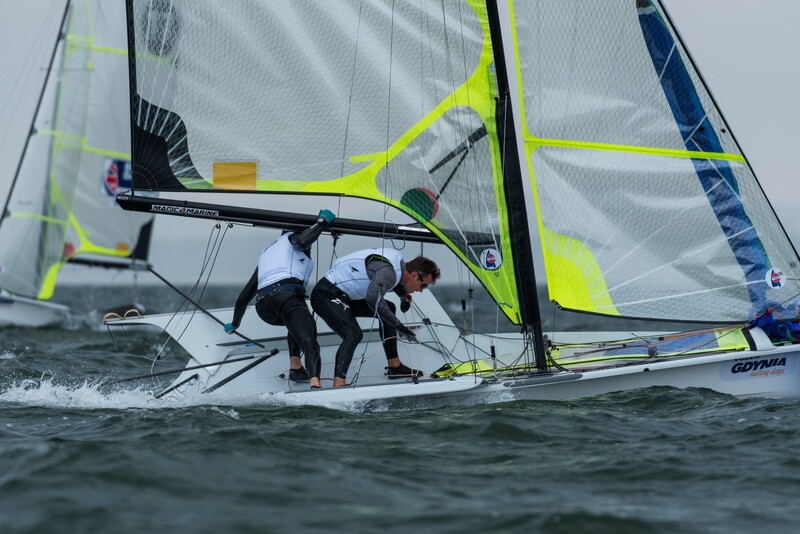 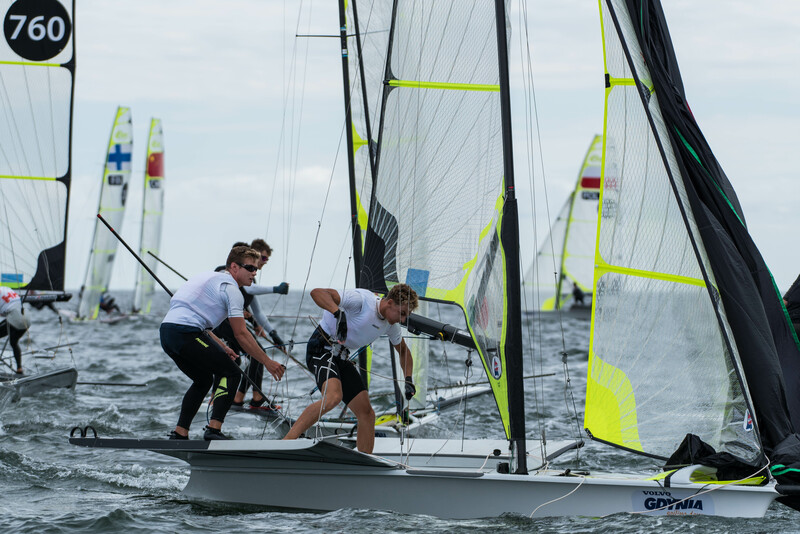 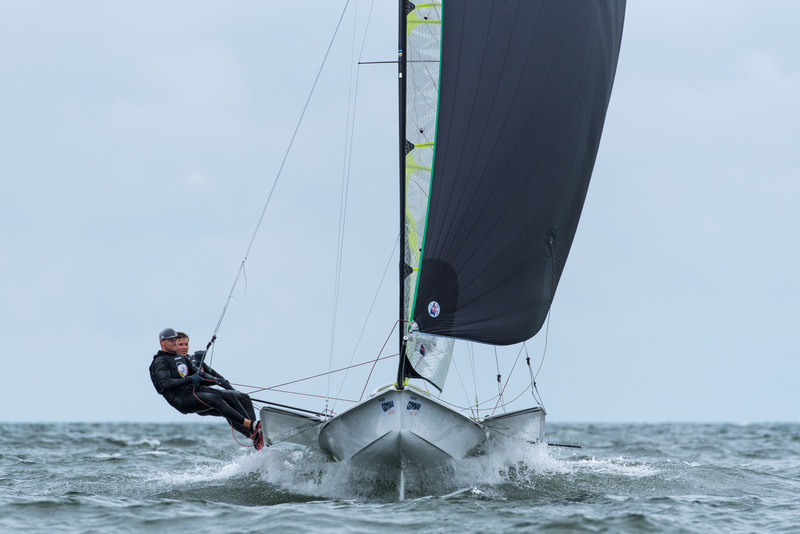 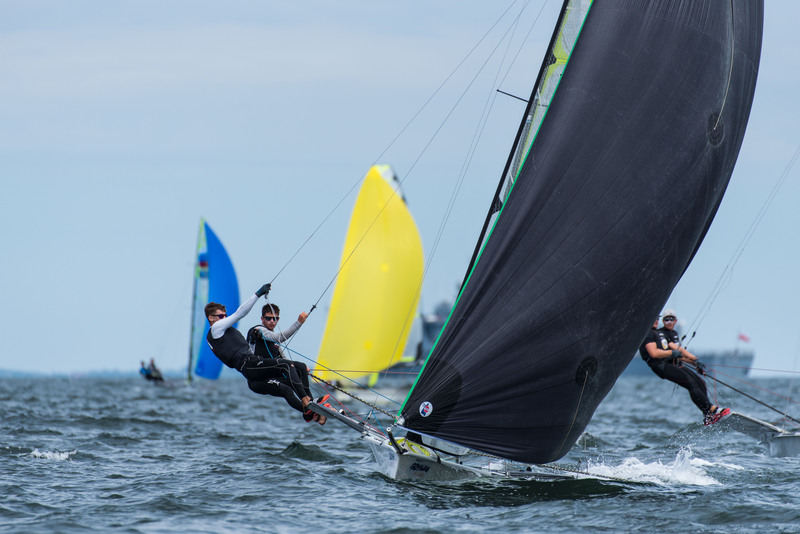 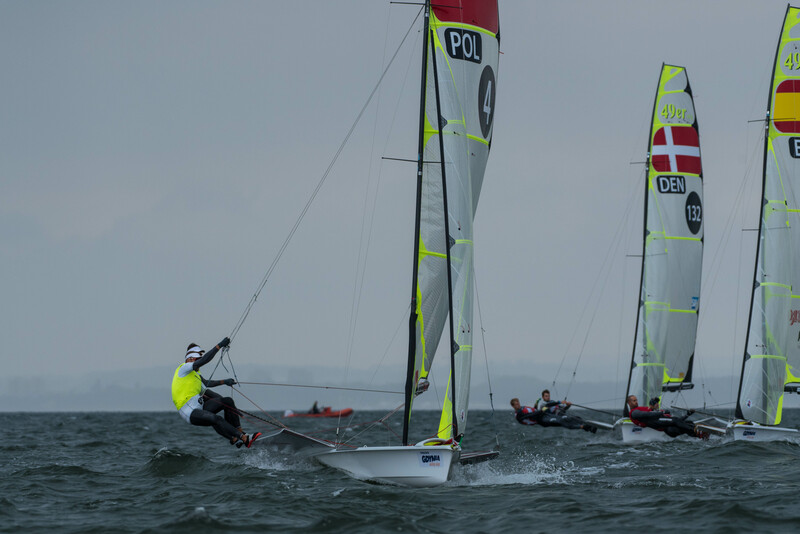 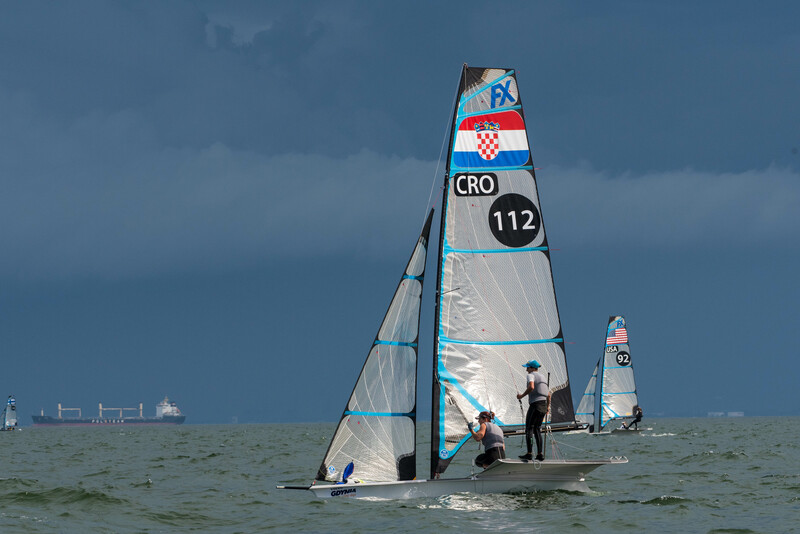 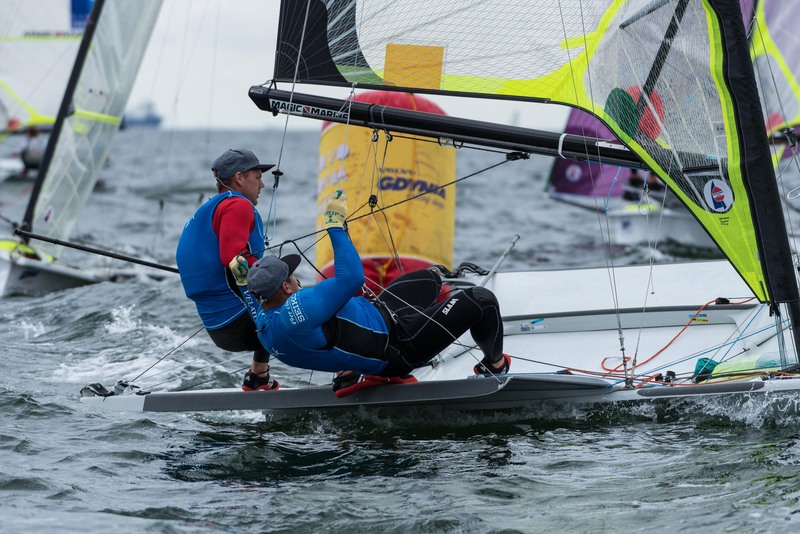 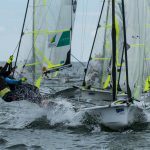 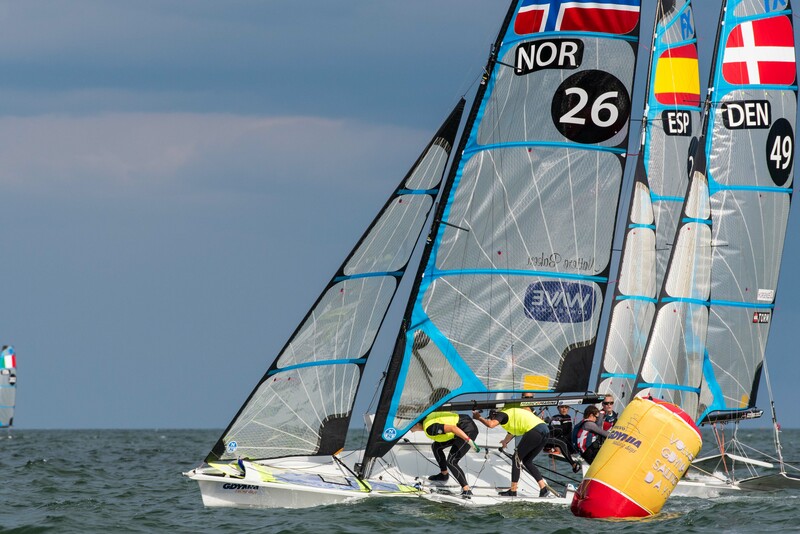 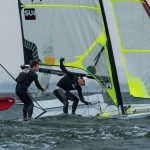 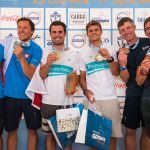 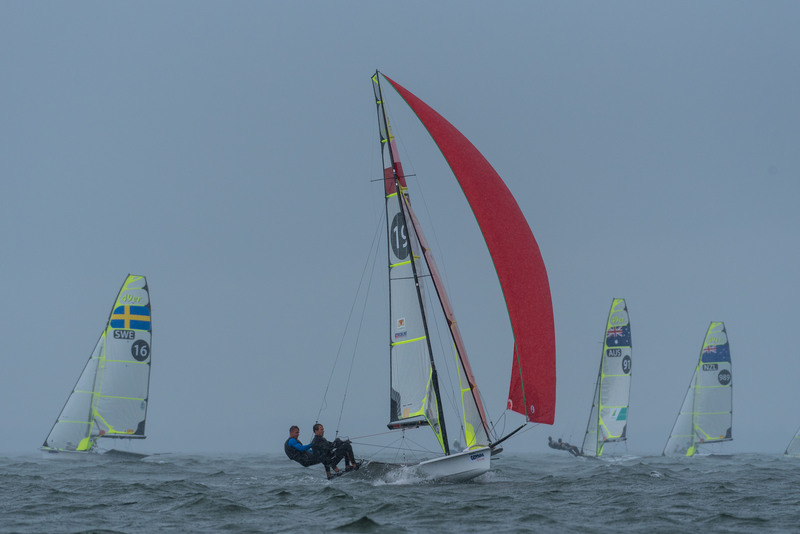 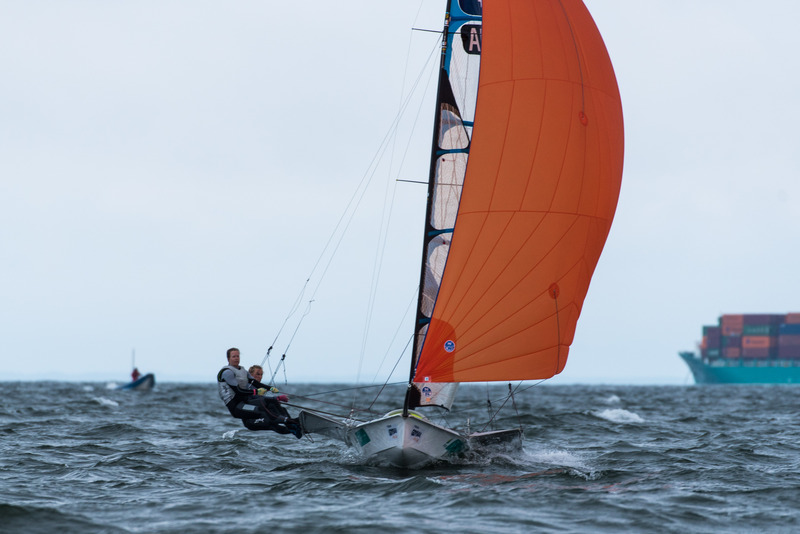 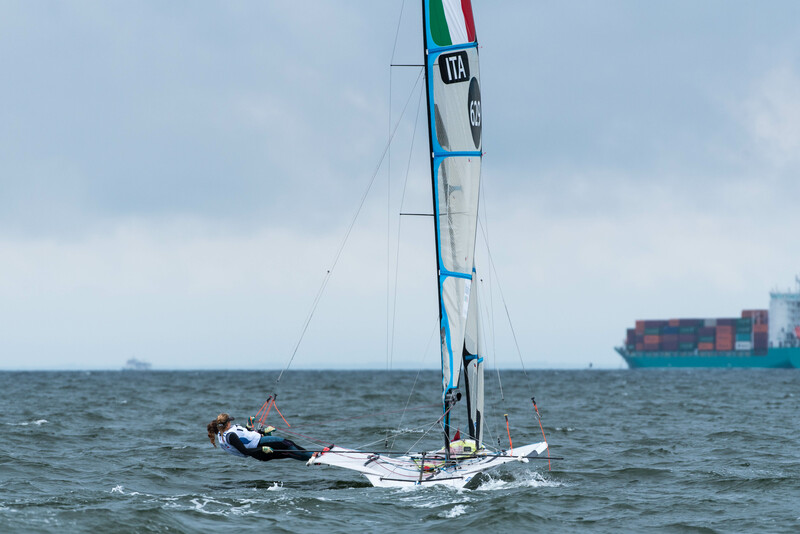 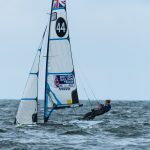 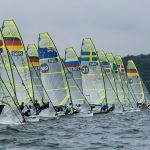 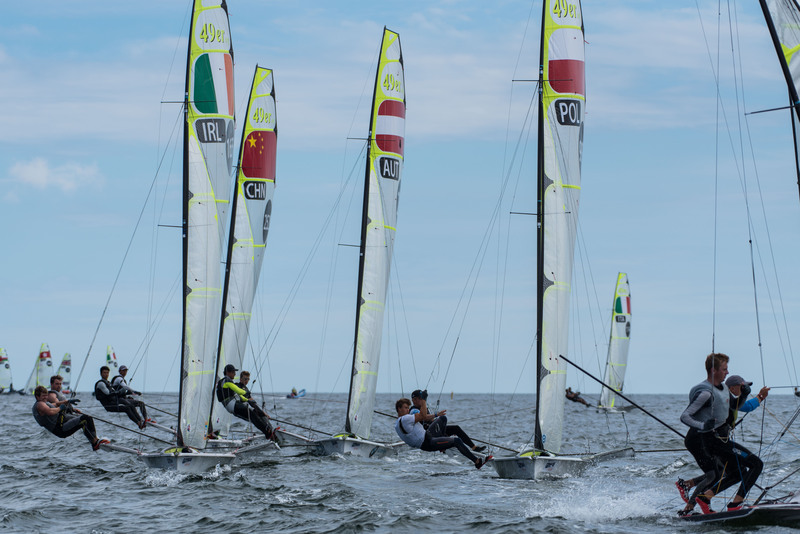 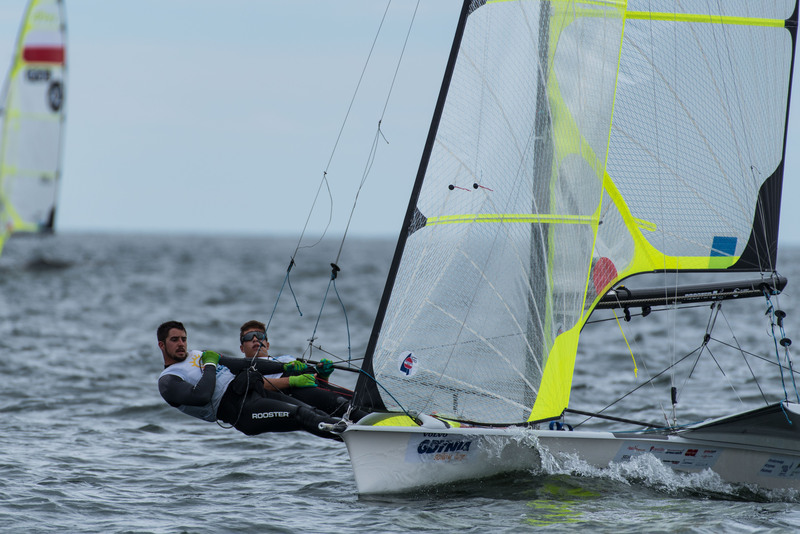 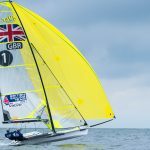 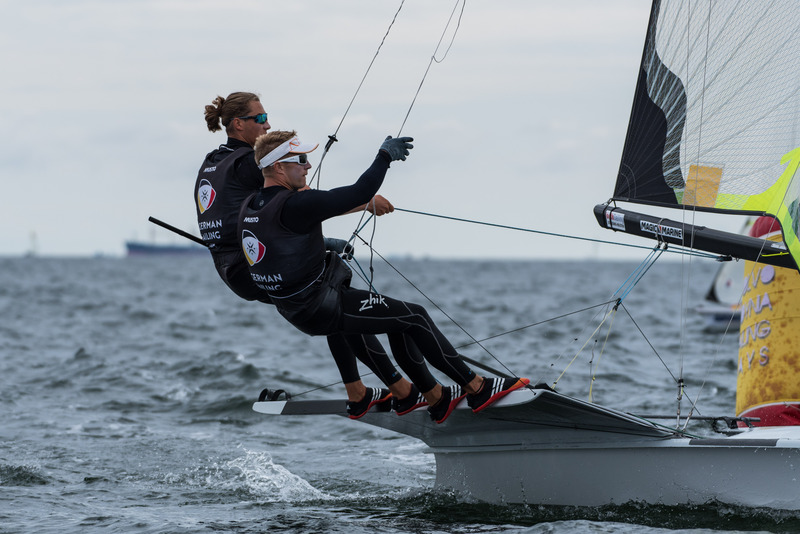 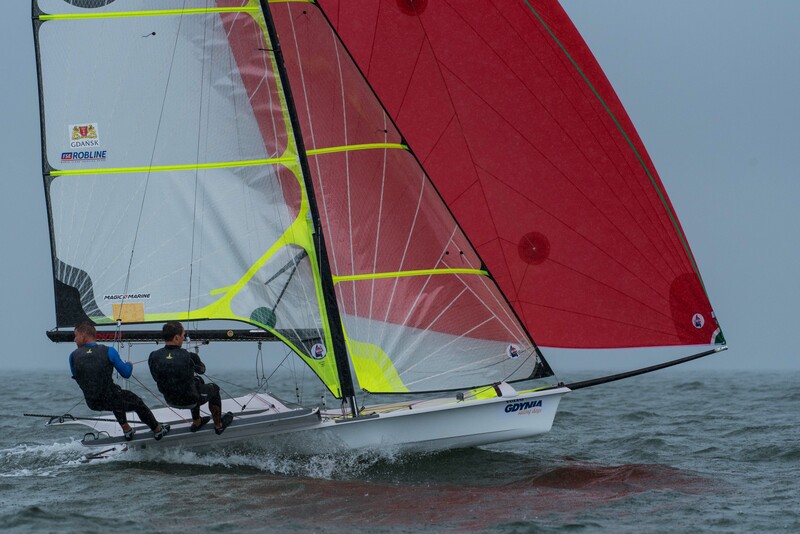 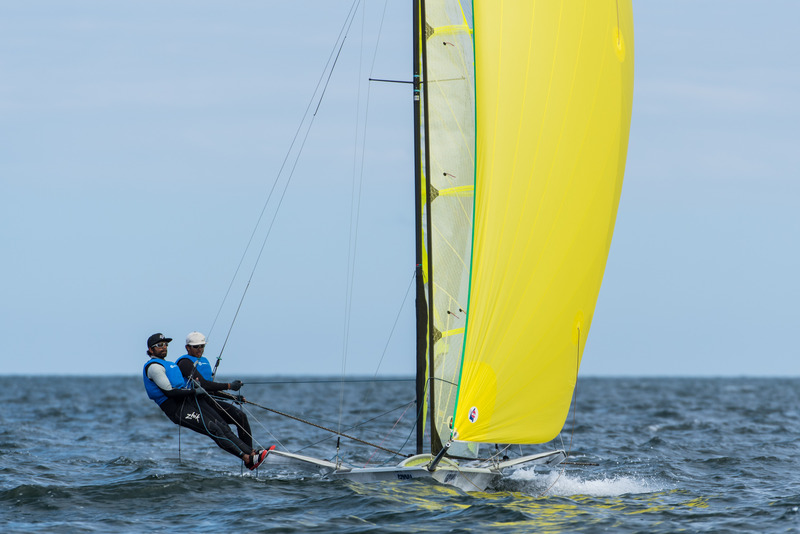 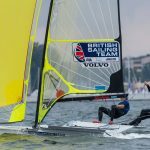 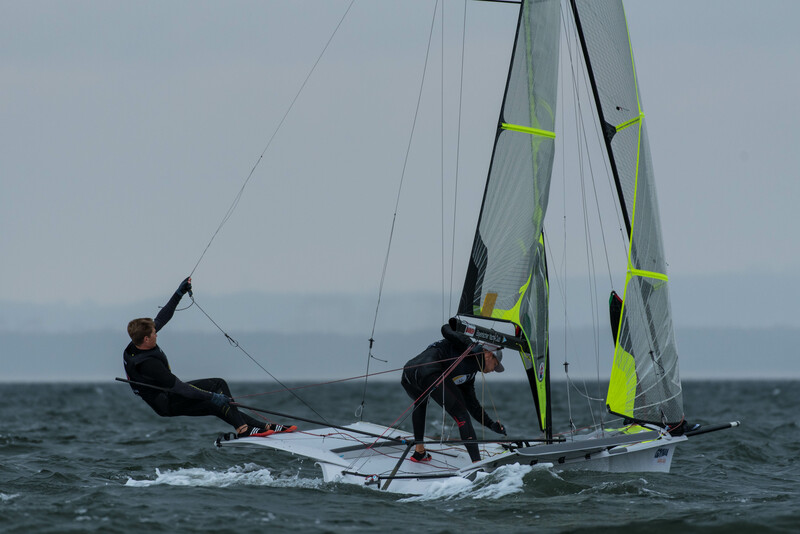 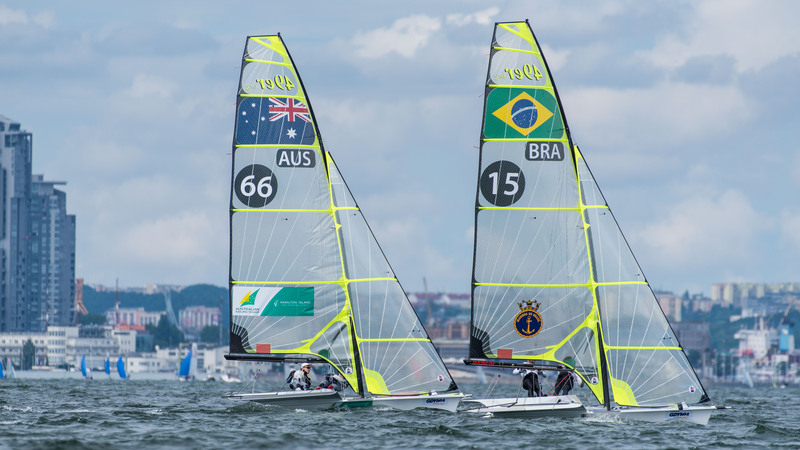 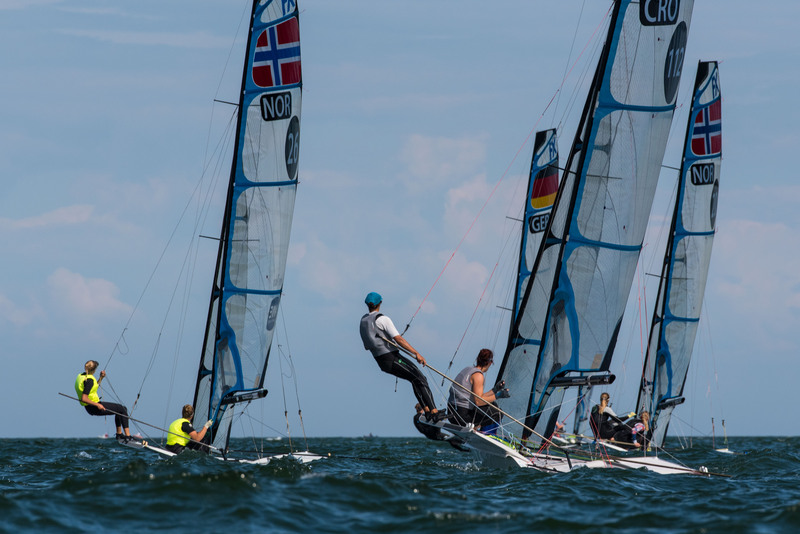 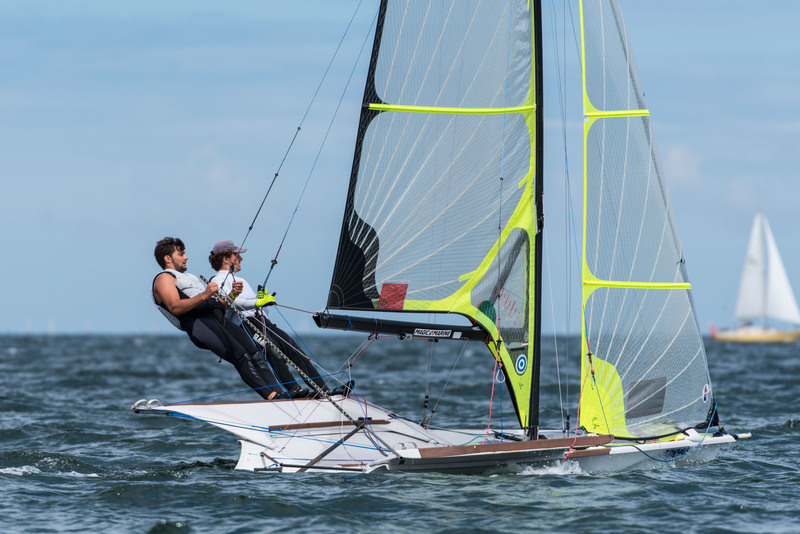 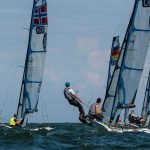 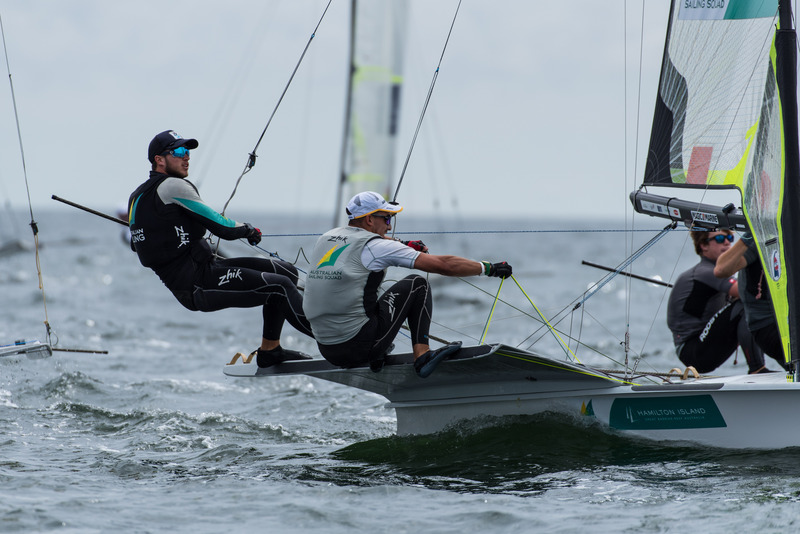 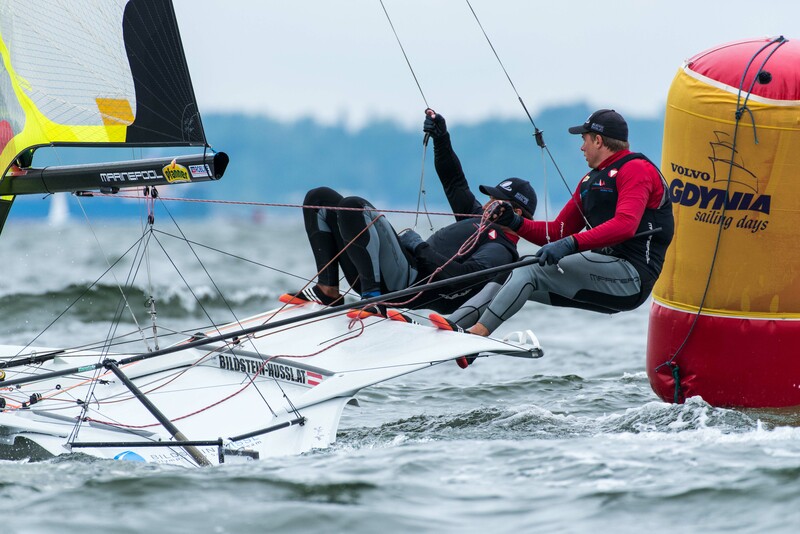 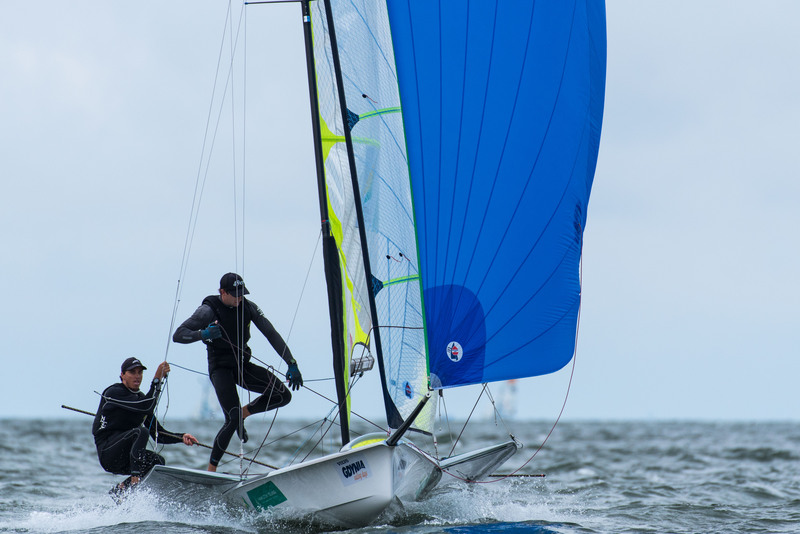 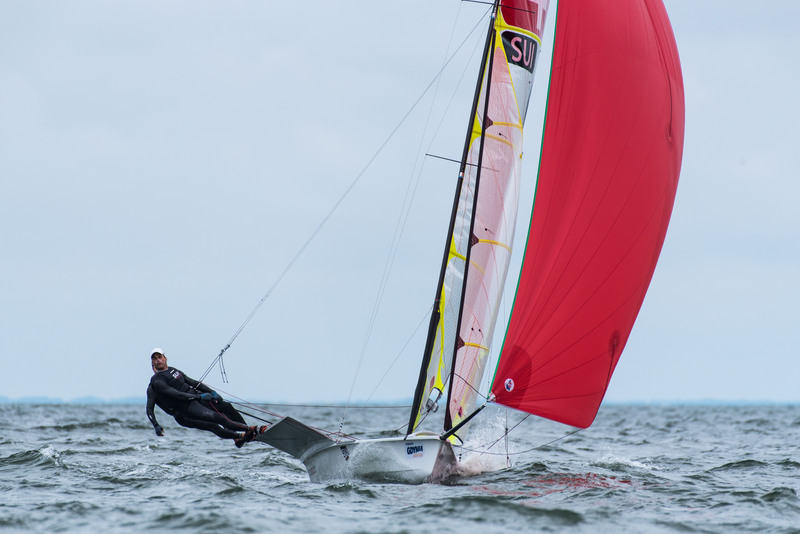 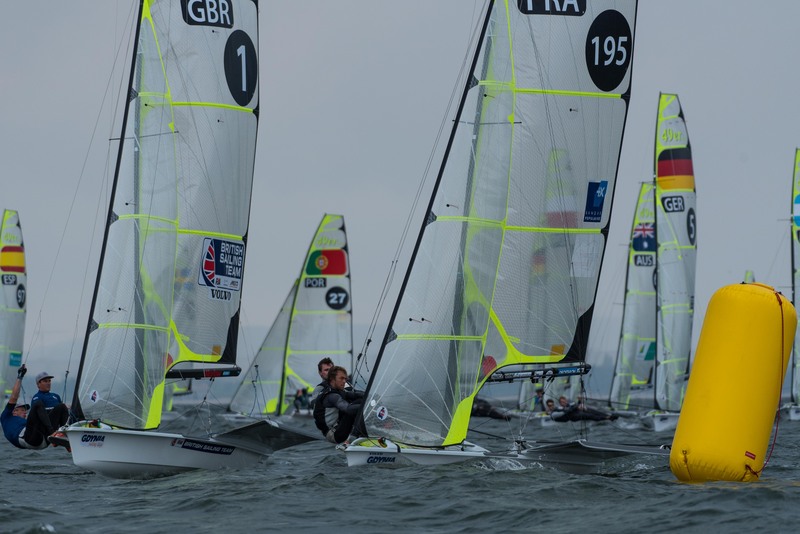 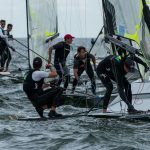 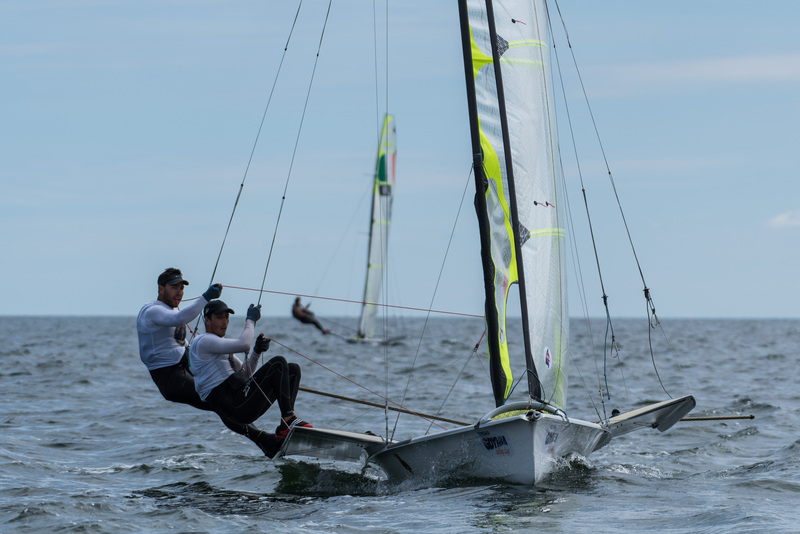 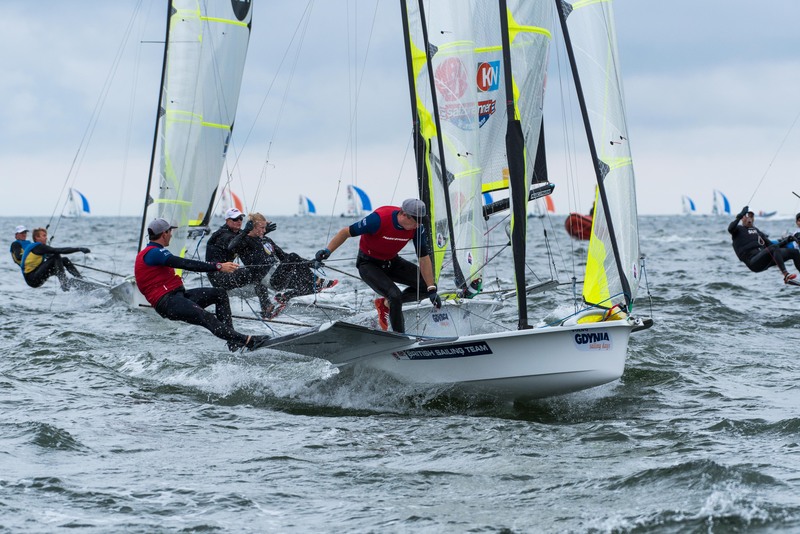 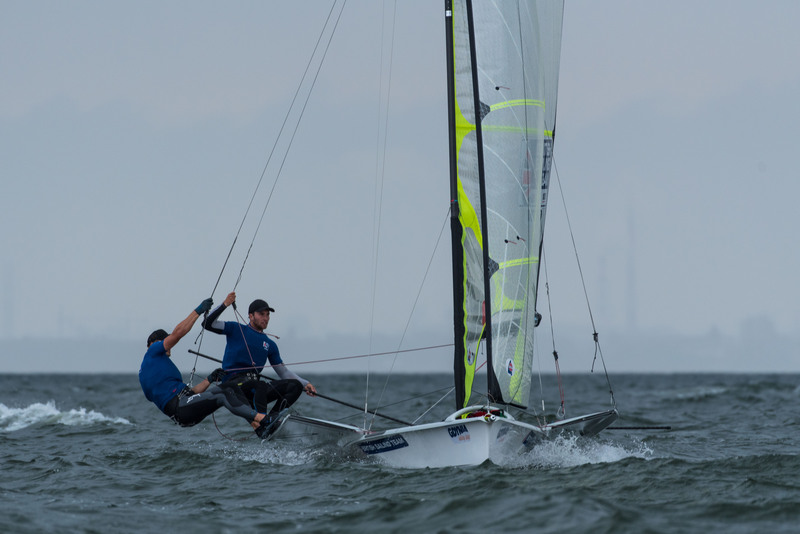 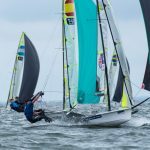 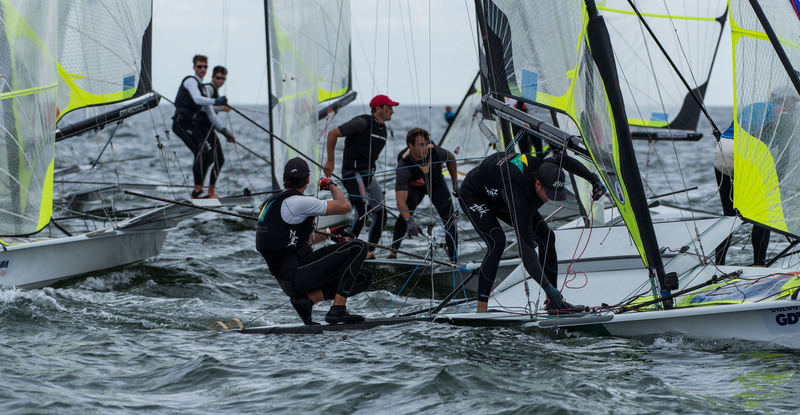 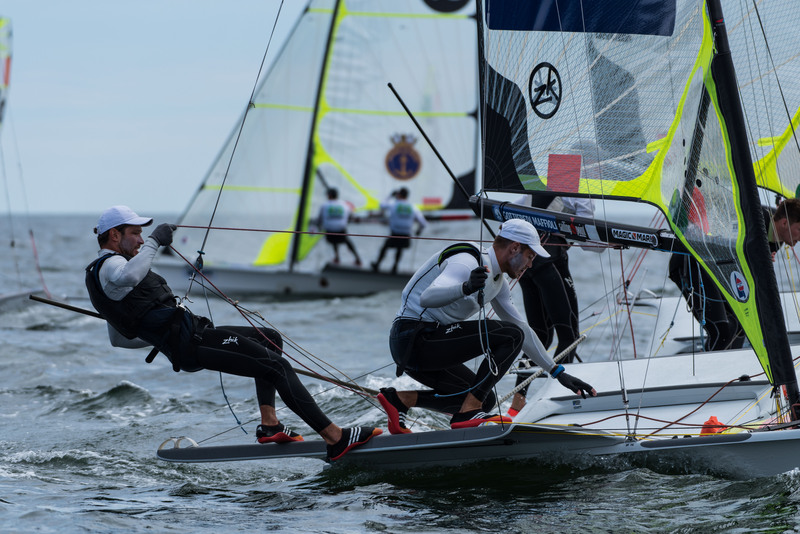 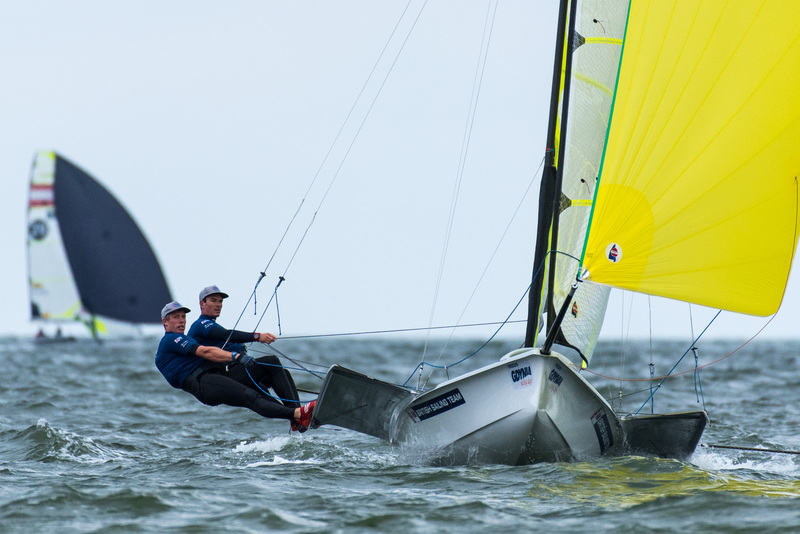 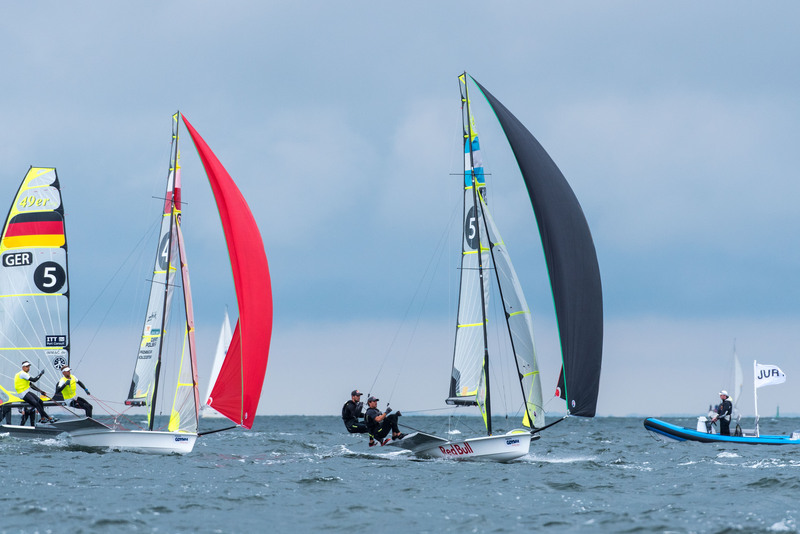 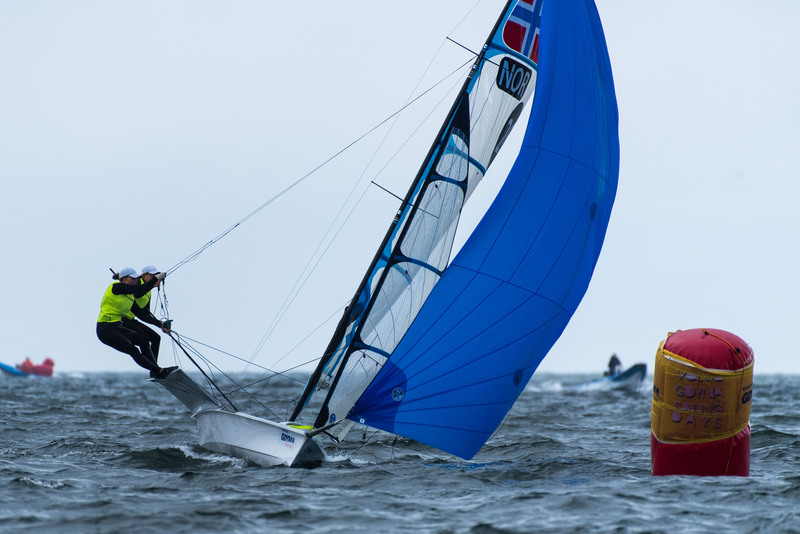 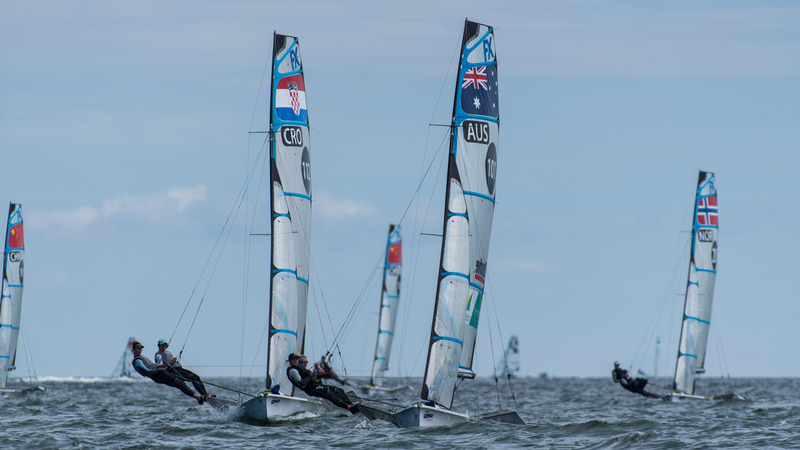 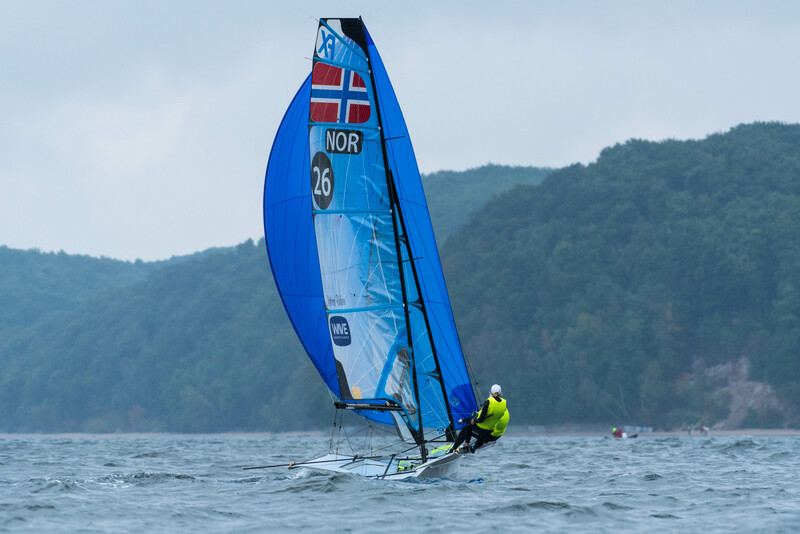 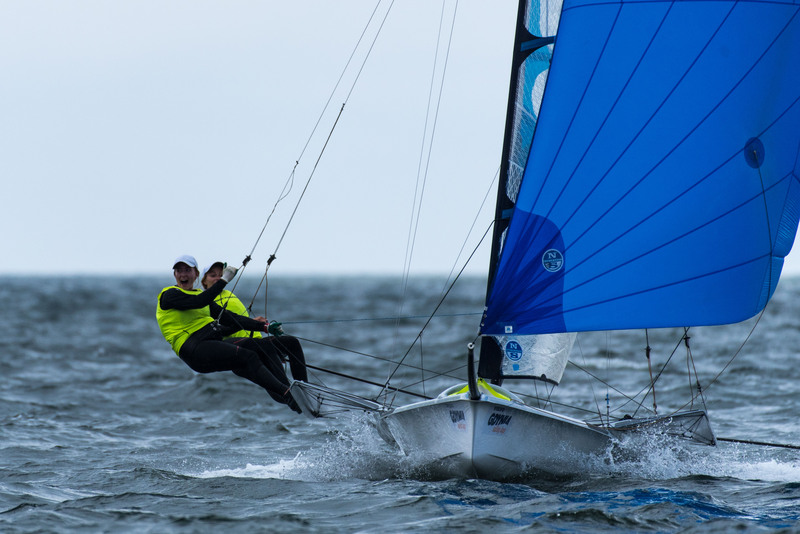 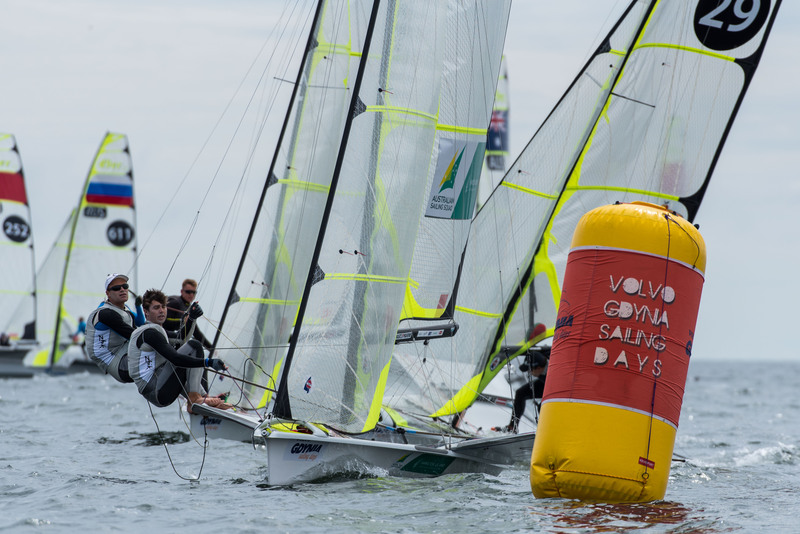 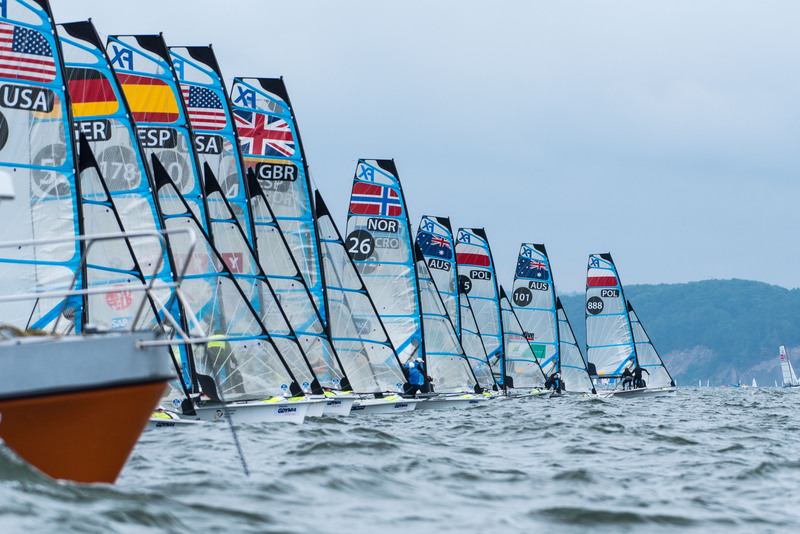 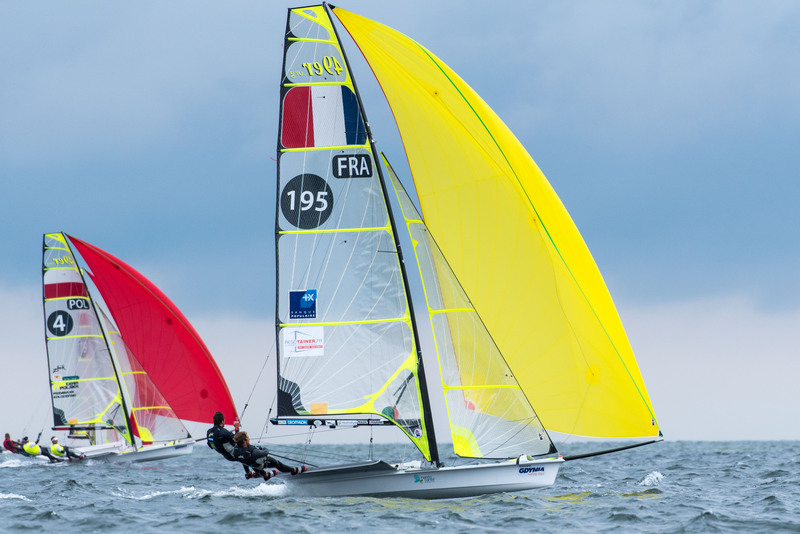 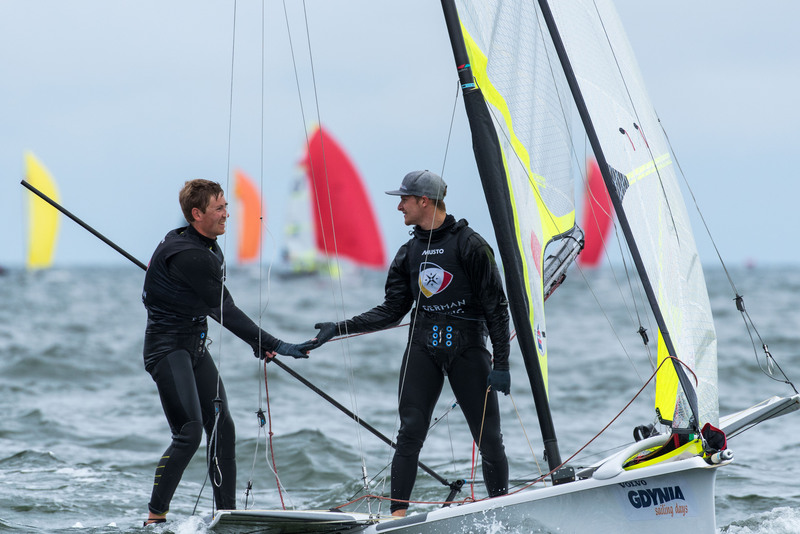 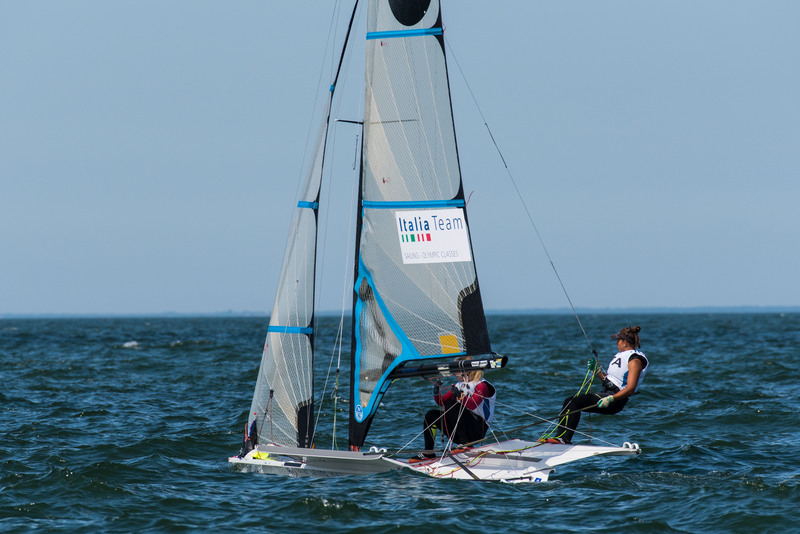 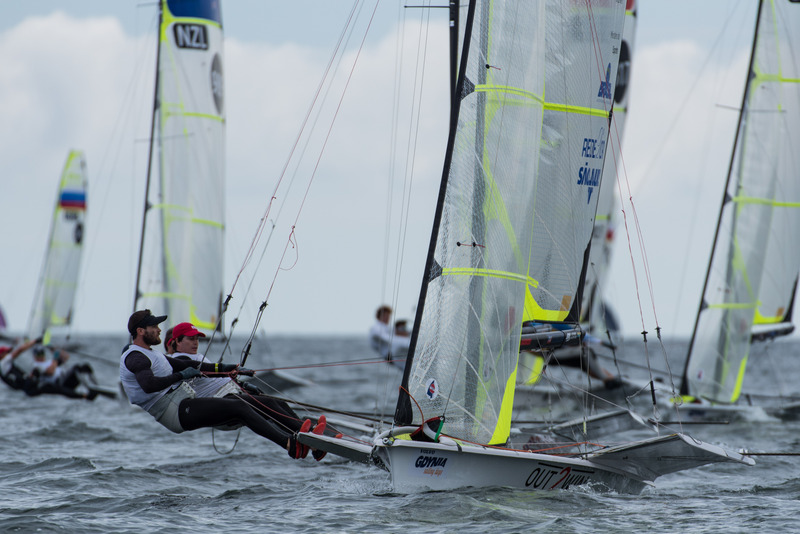 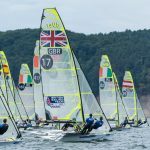 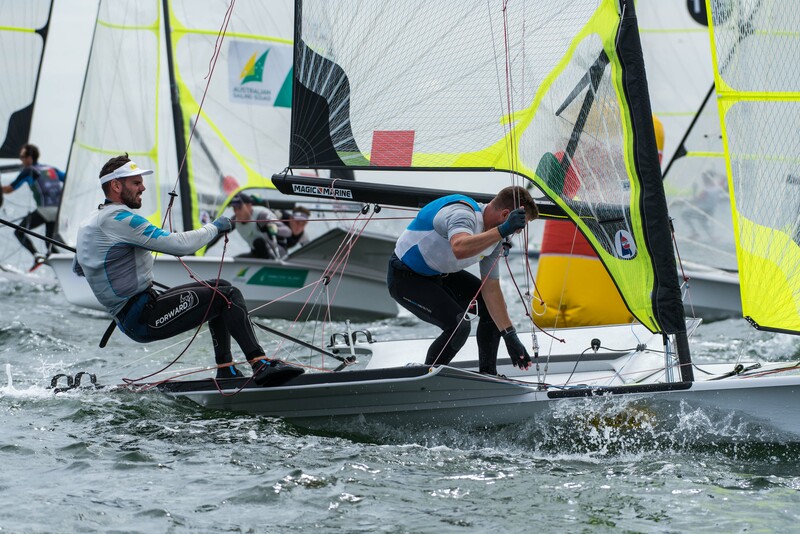 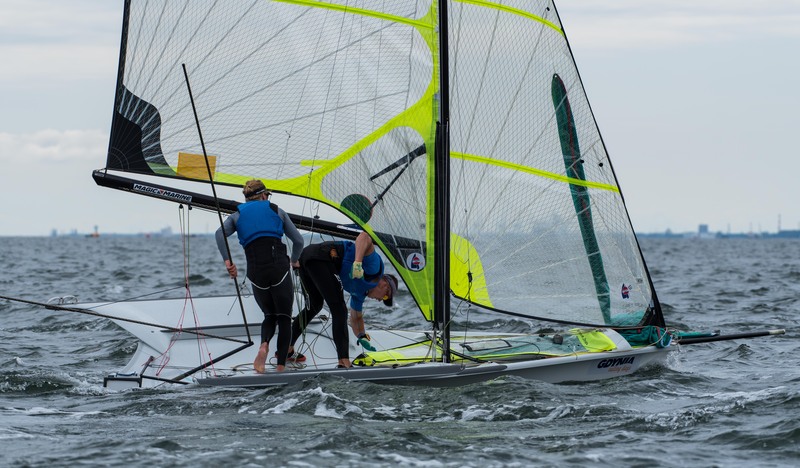 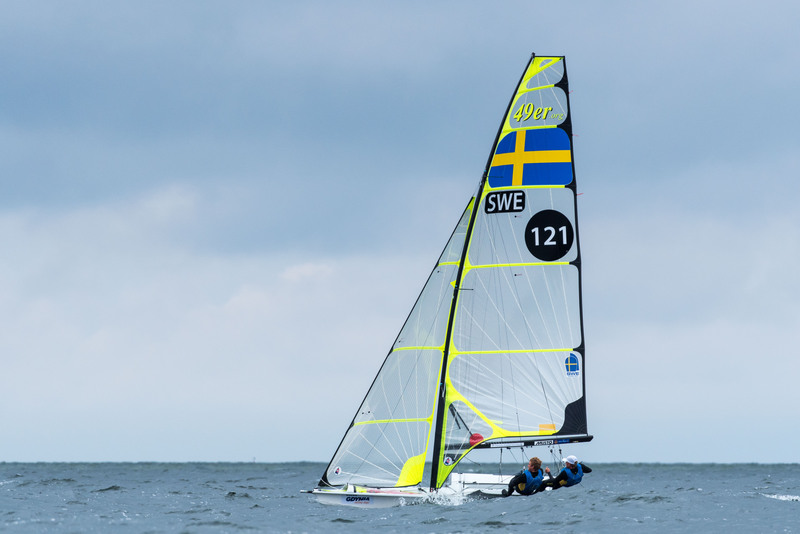 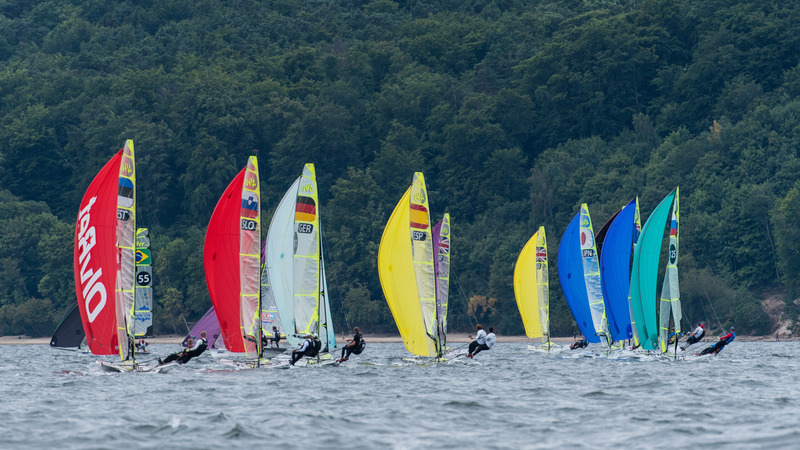 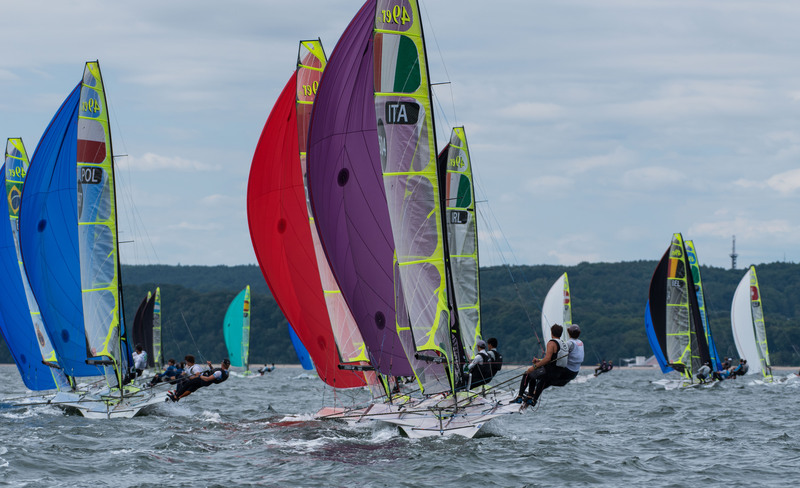 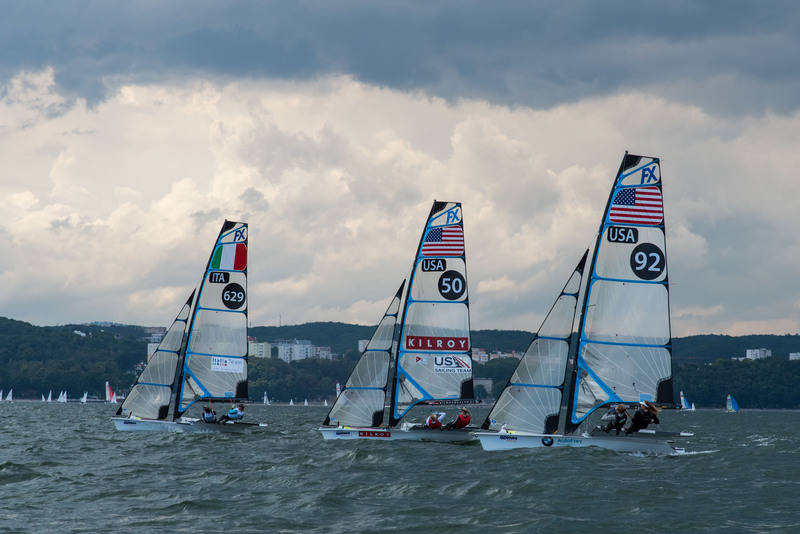 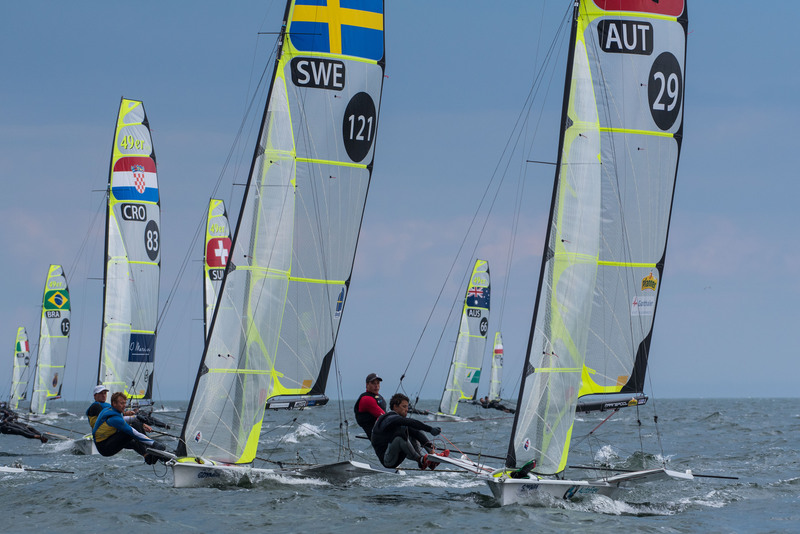 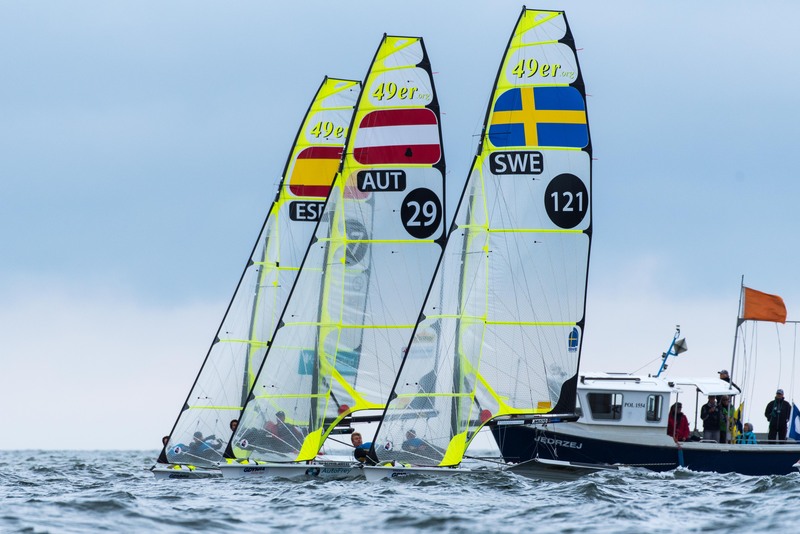 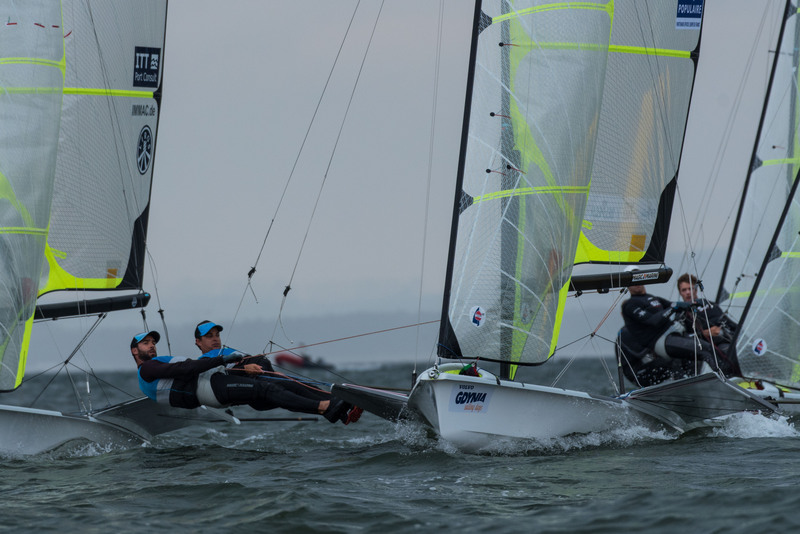 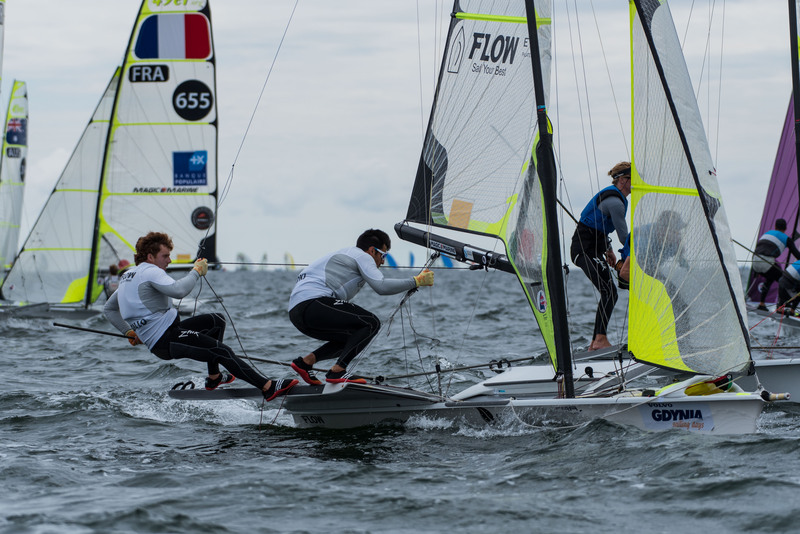 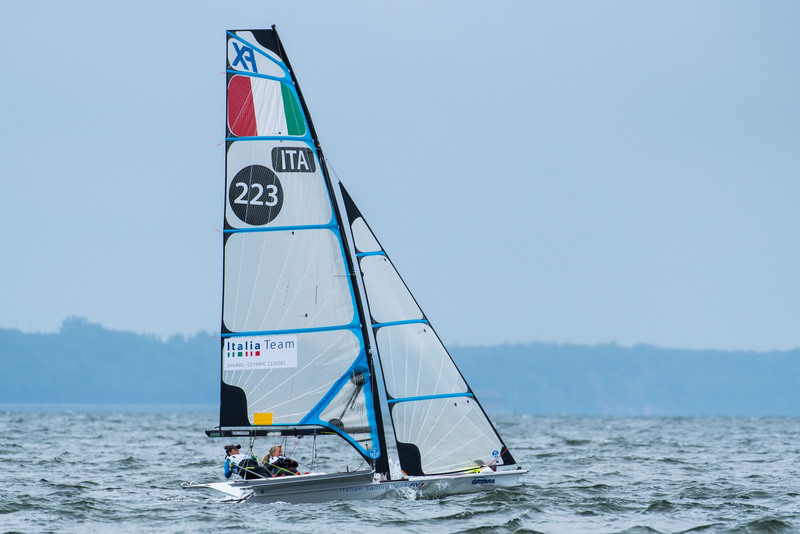 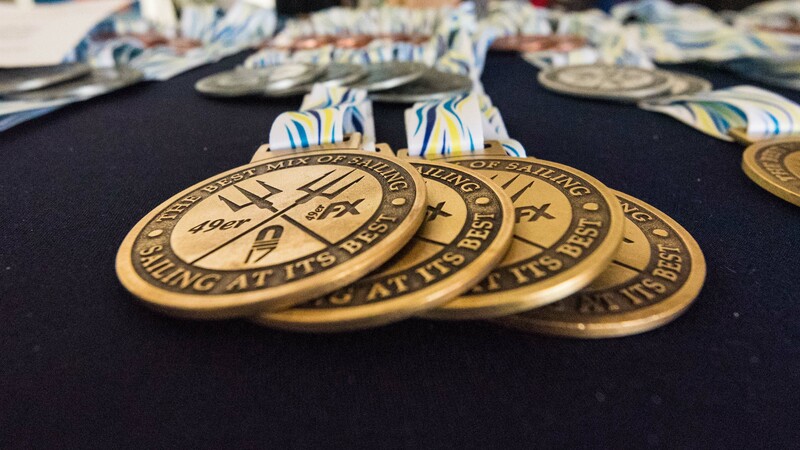 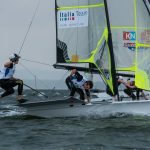 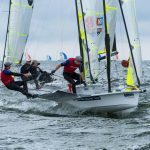 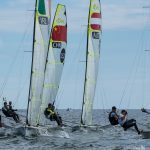 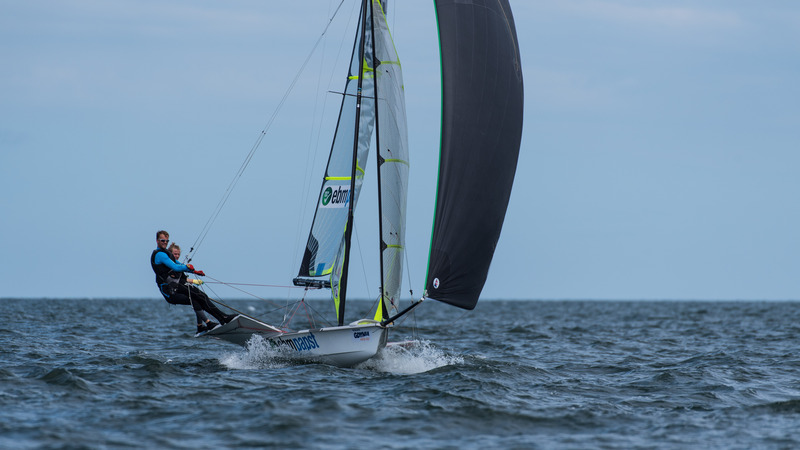 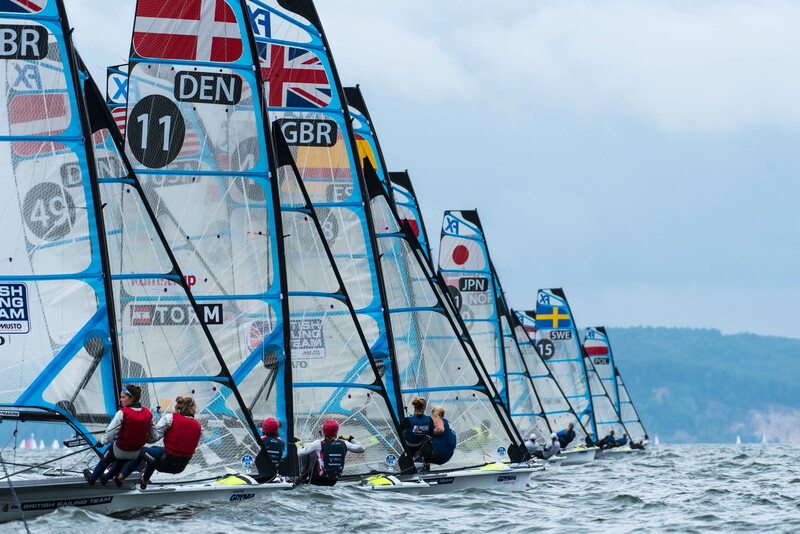 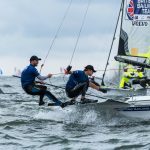 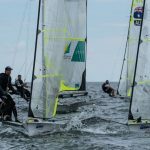 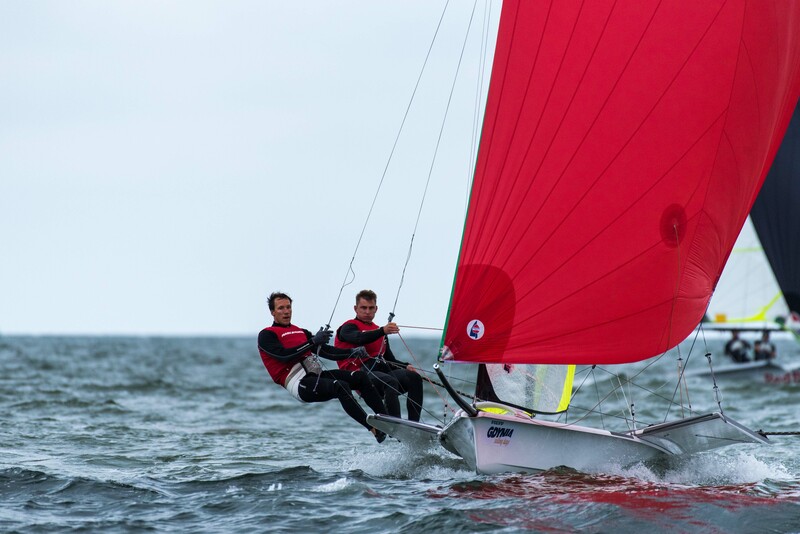 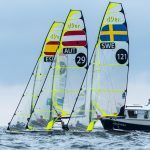 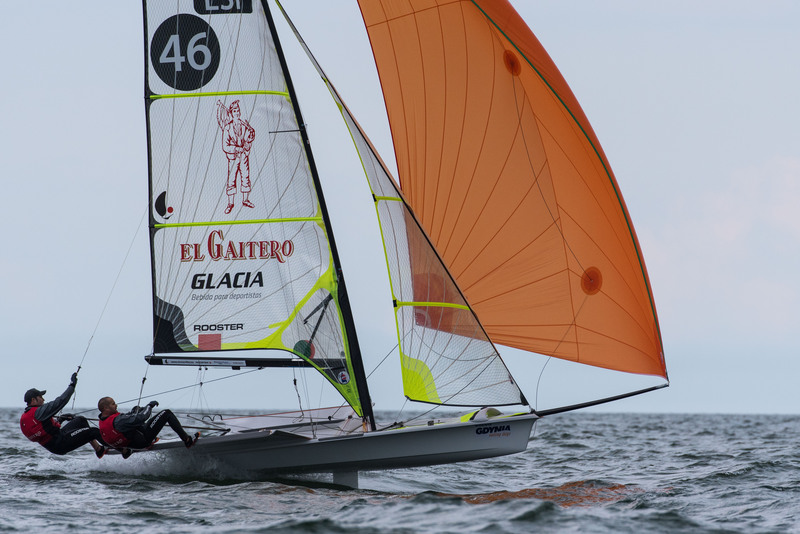 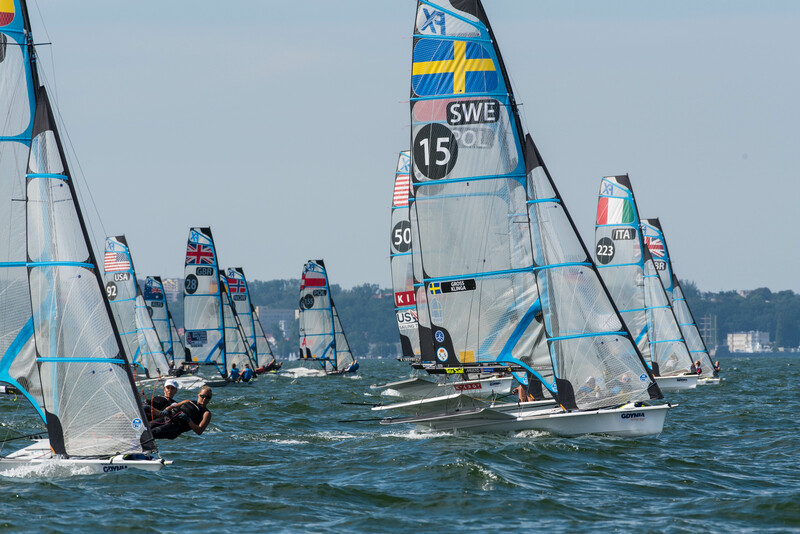 The 49erFX European Championship in 2018 will be a hotly contested affair. 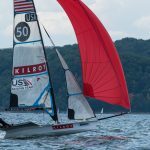 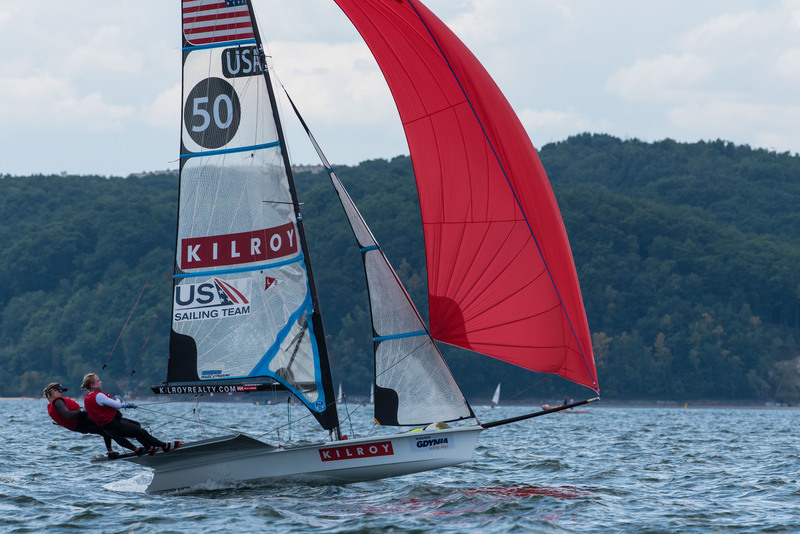 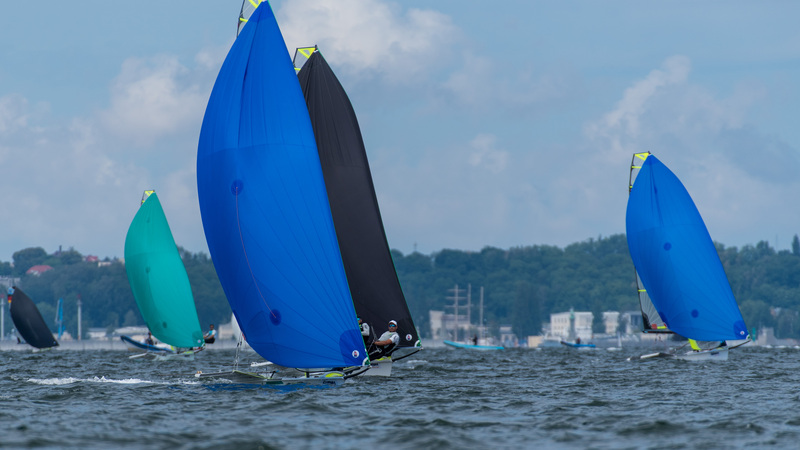 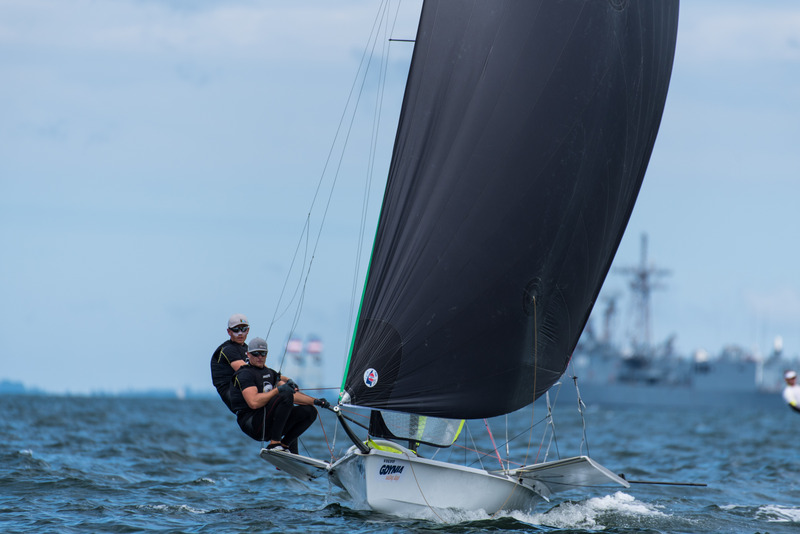 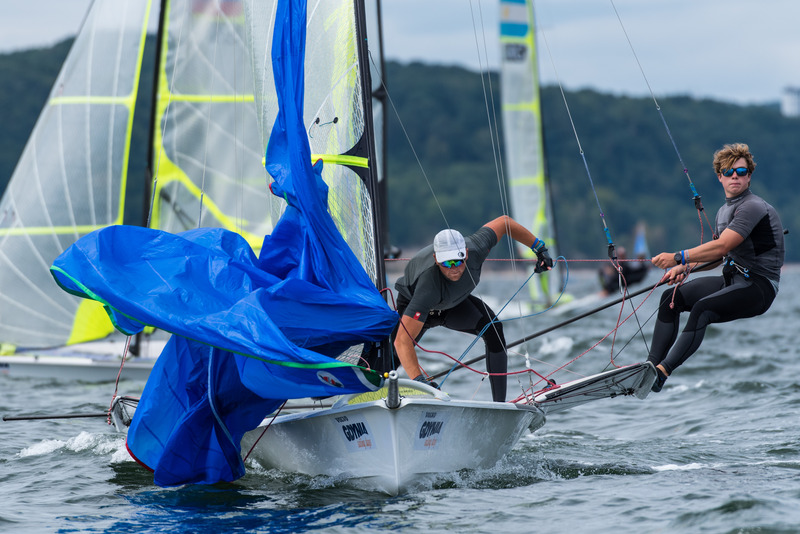 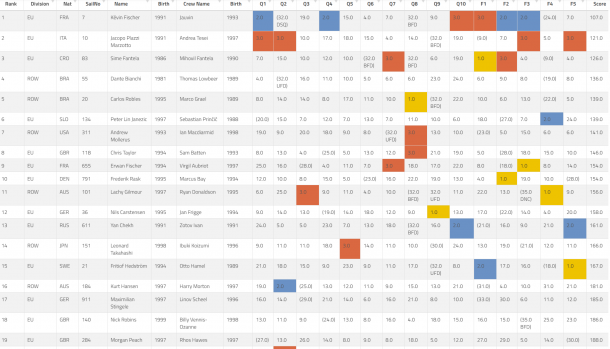 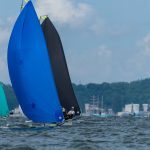 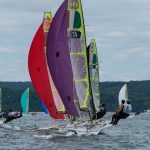 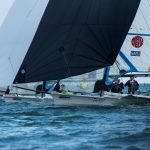 There is a significant fleet of 51 entries yet no clear favorites to win the championship. 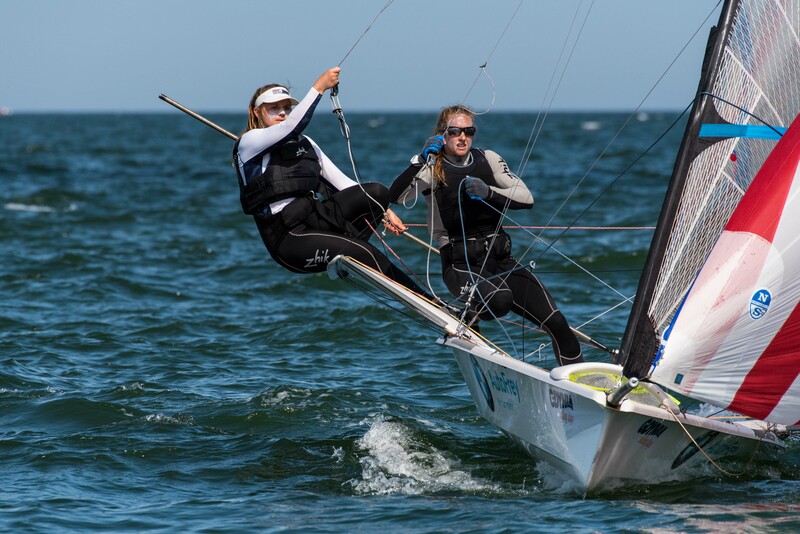 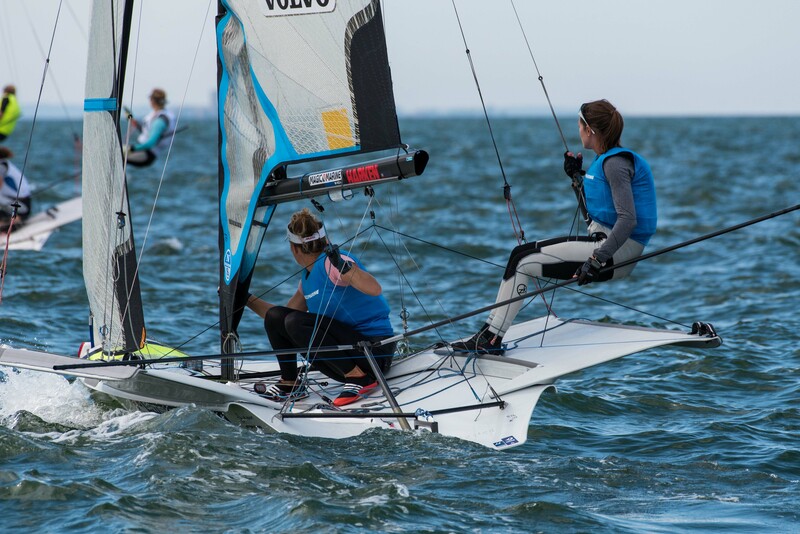 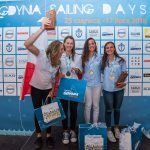 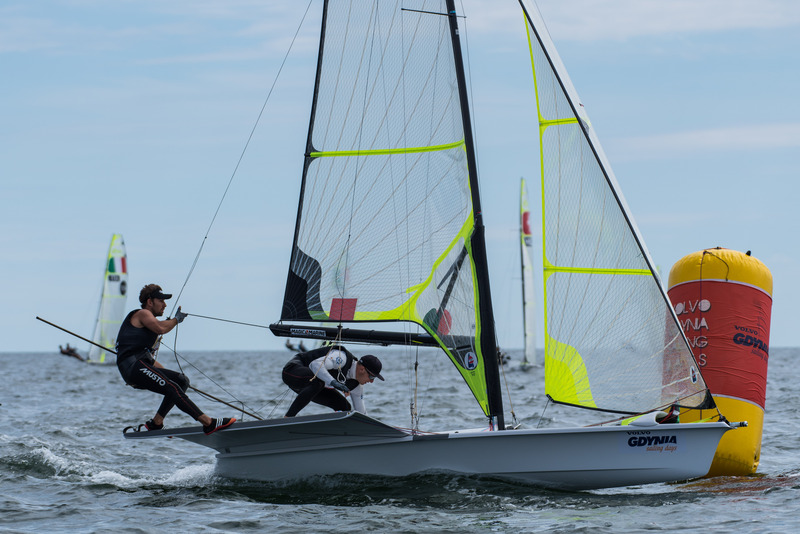 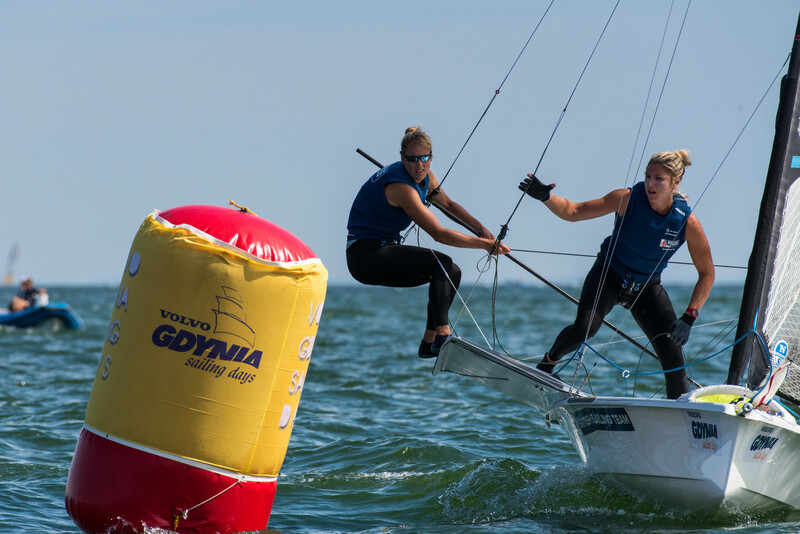 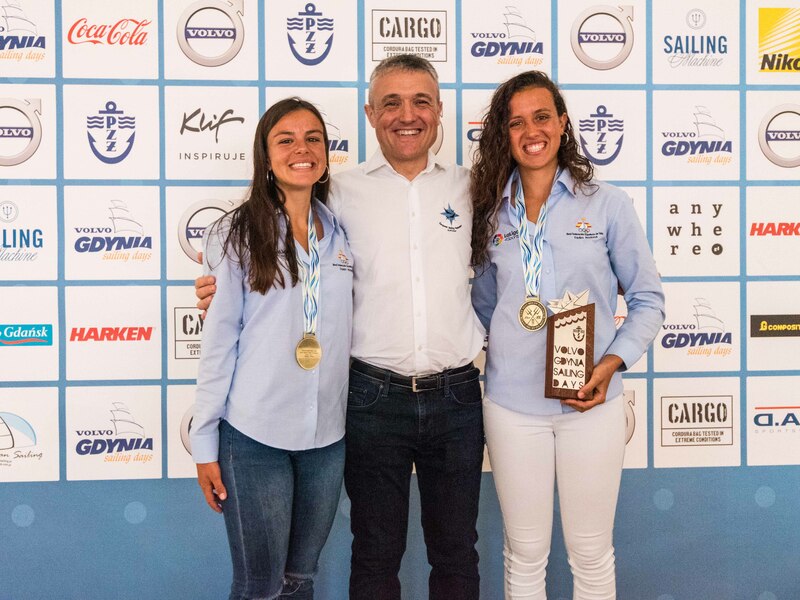 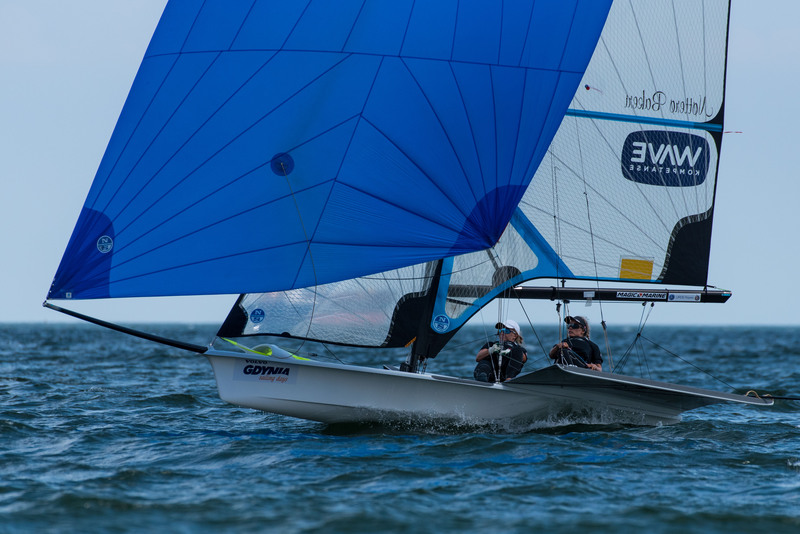 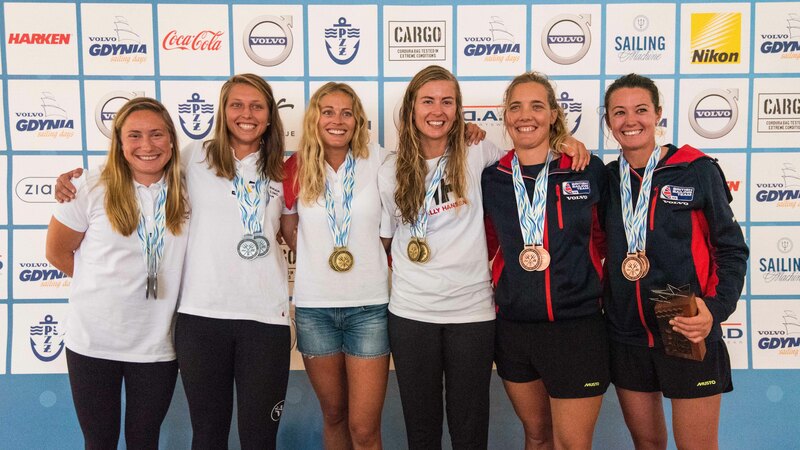 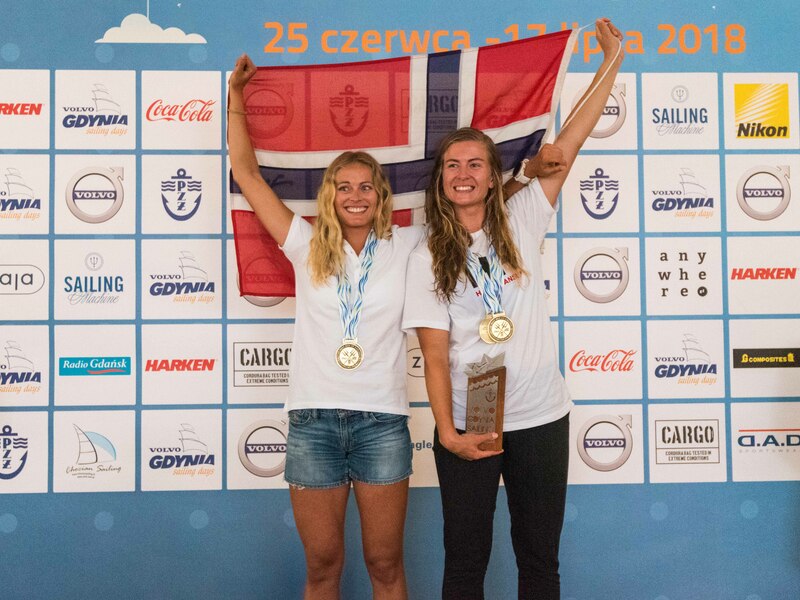 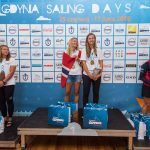 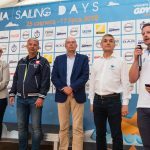 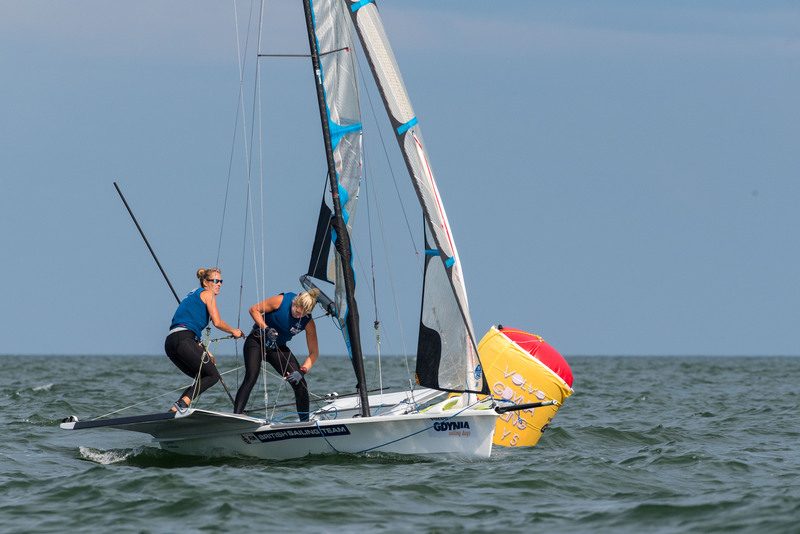 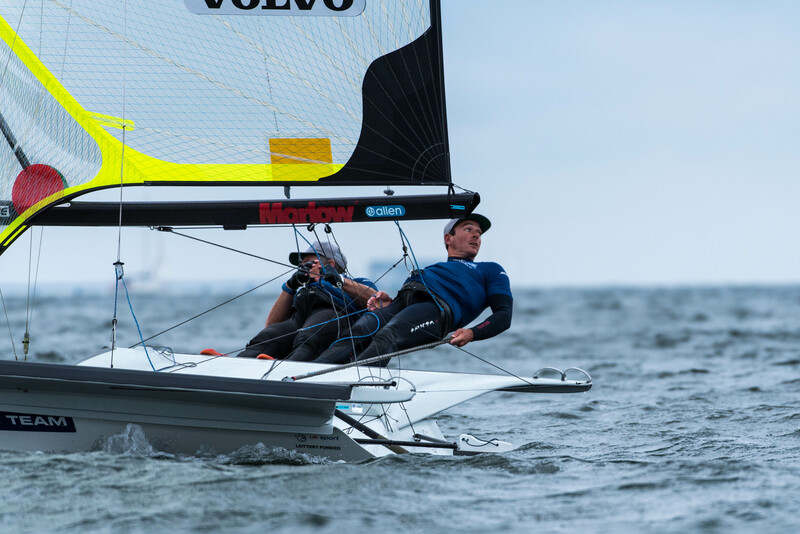 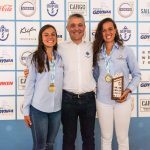 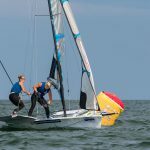 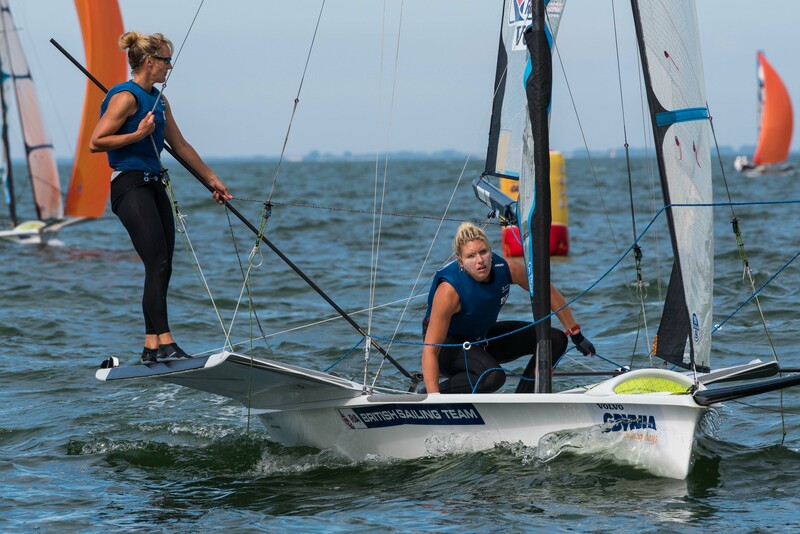 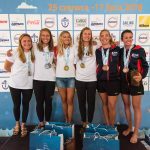 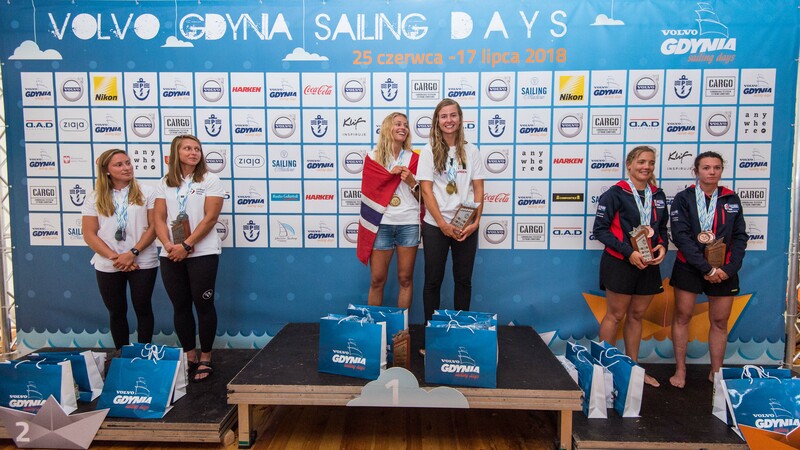 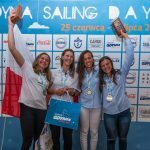 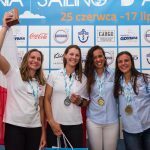 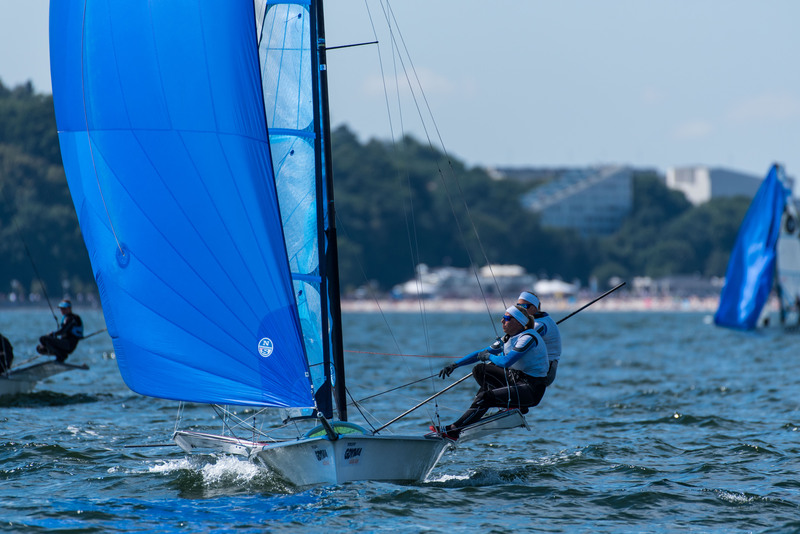 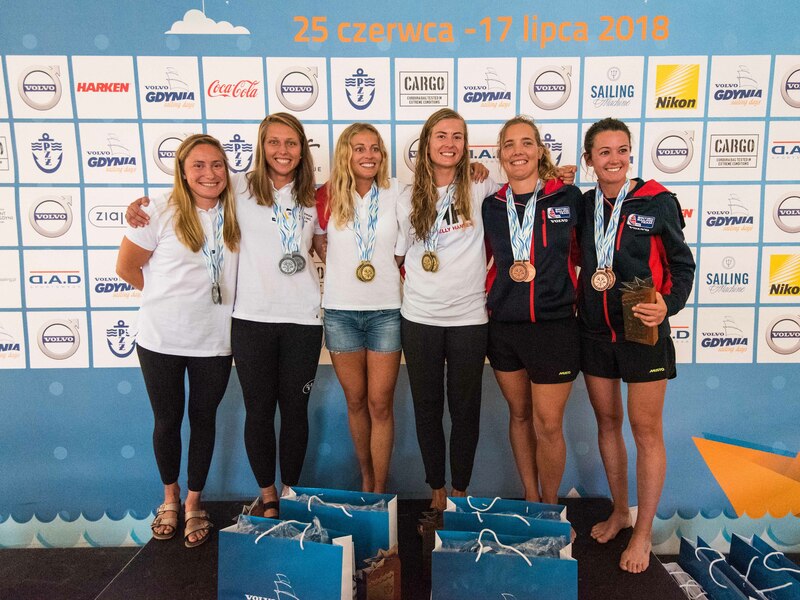 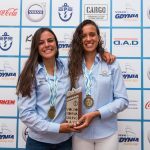 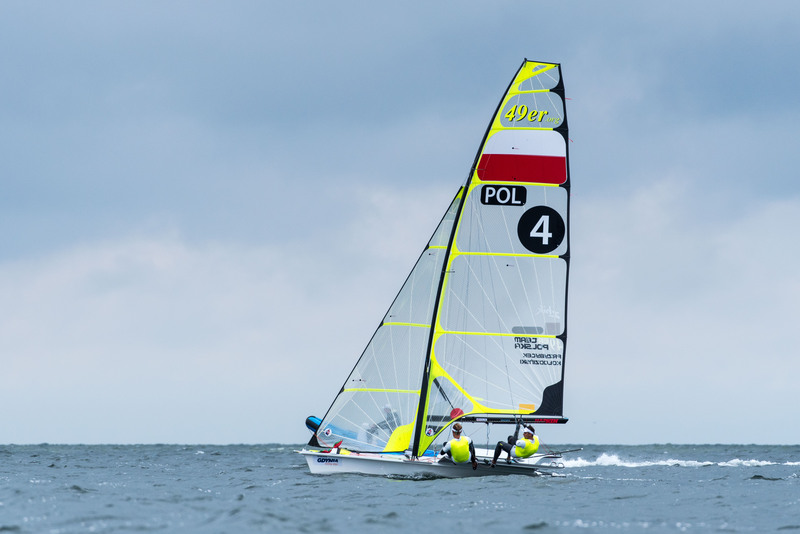 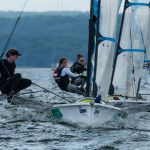 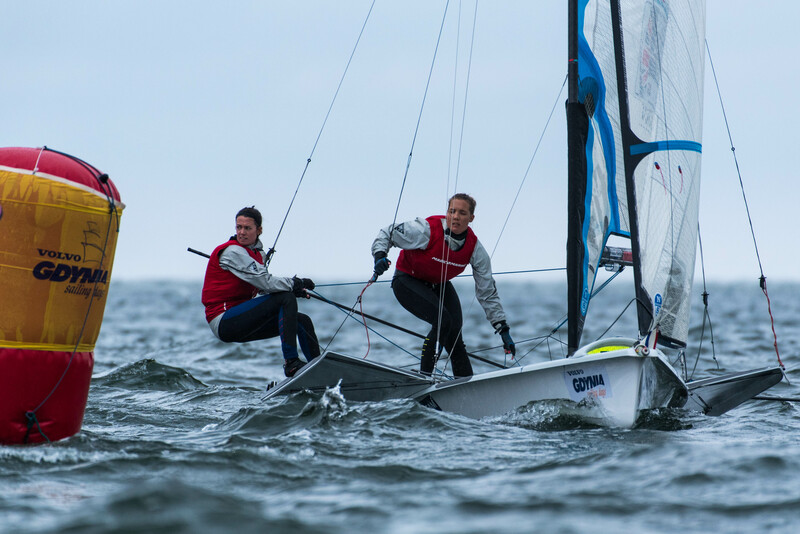 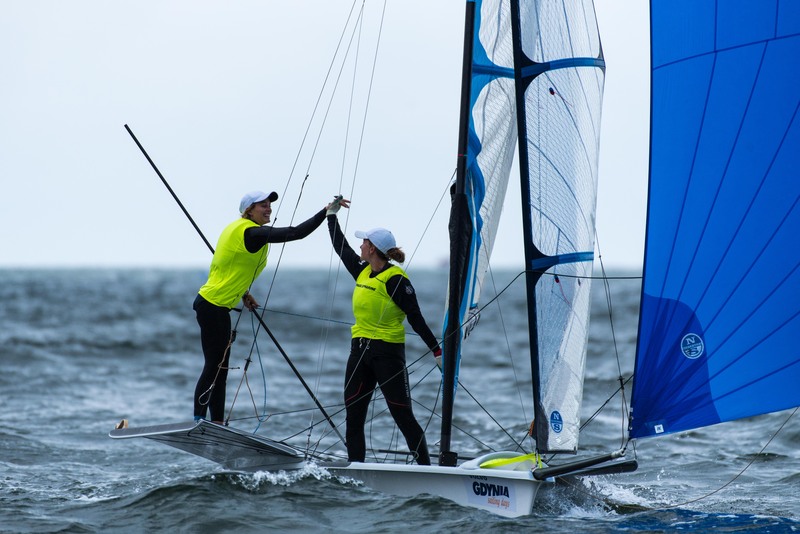 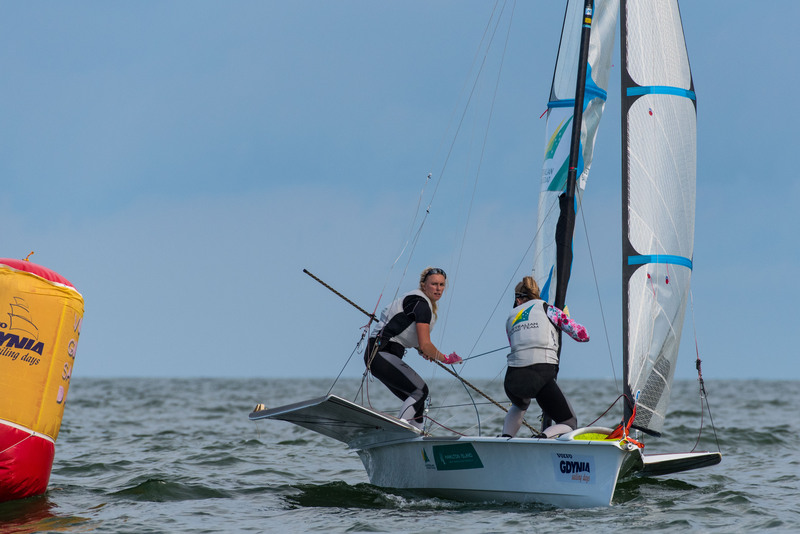 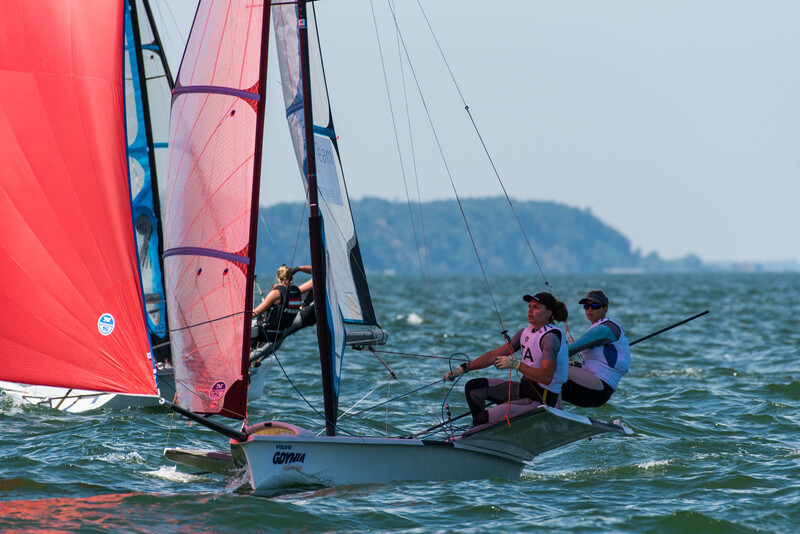 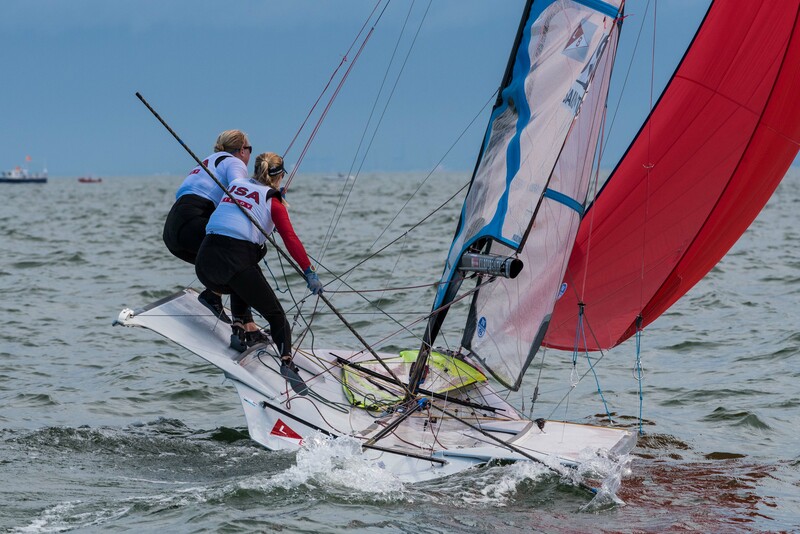 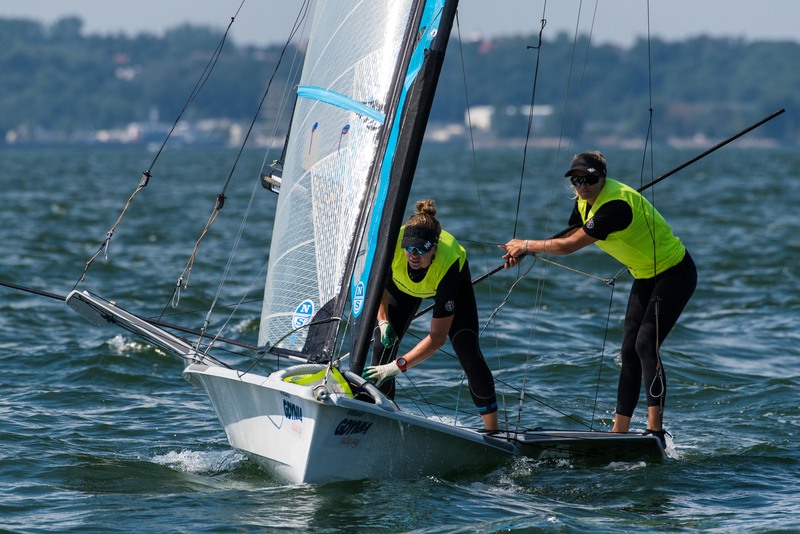 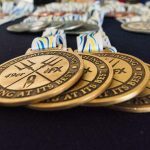 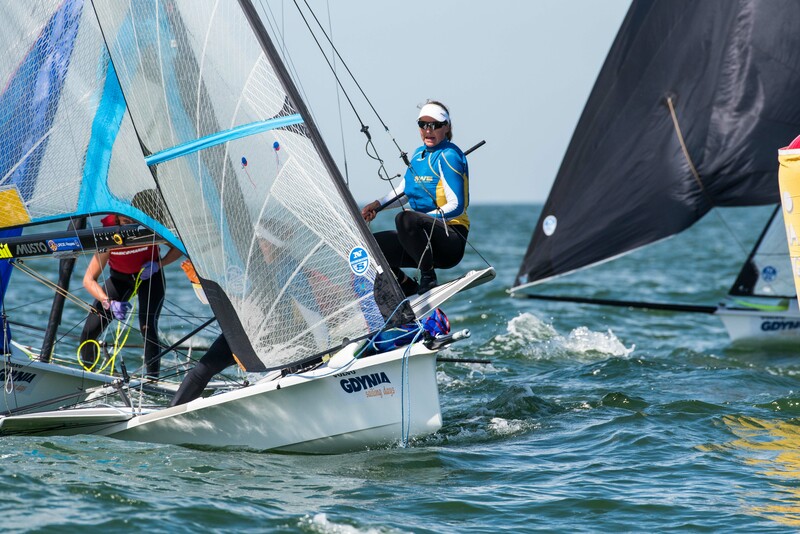 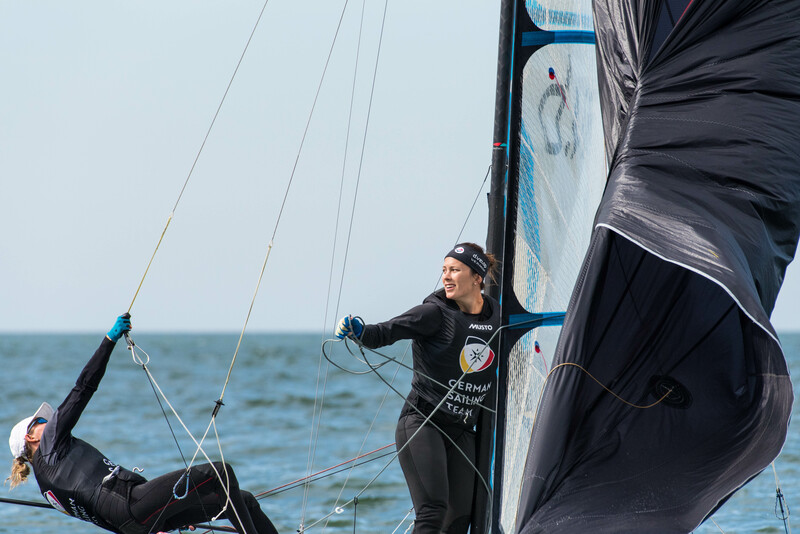 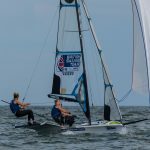 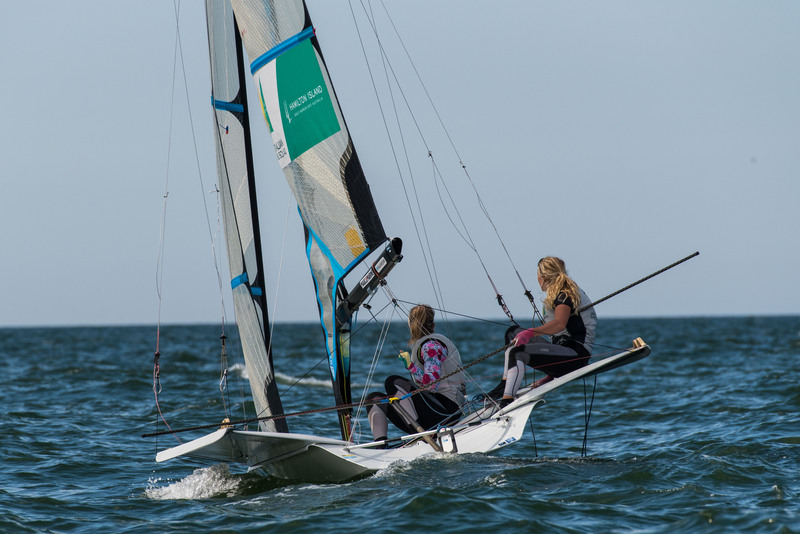 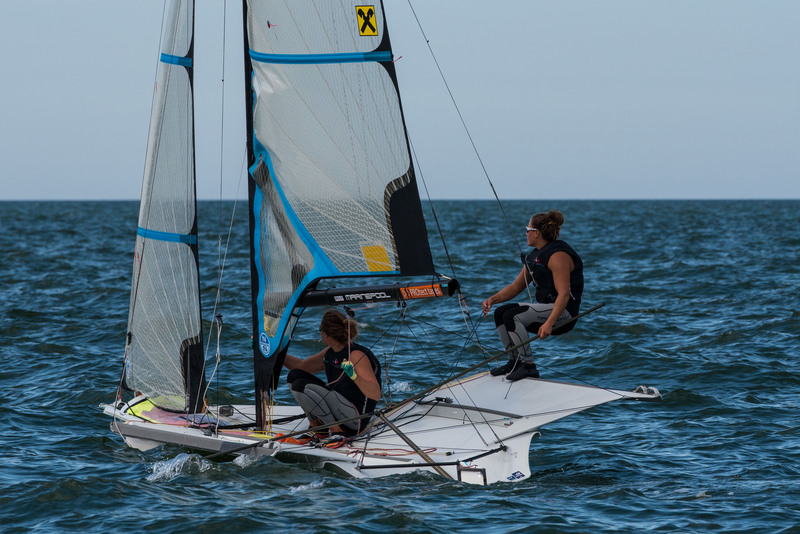 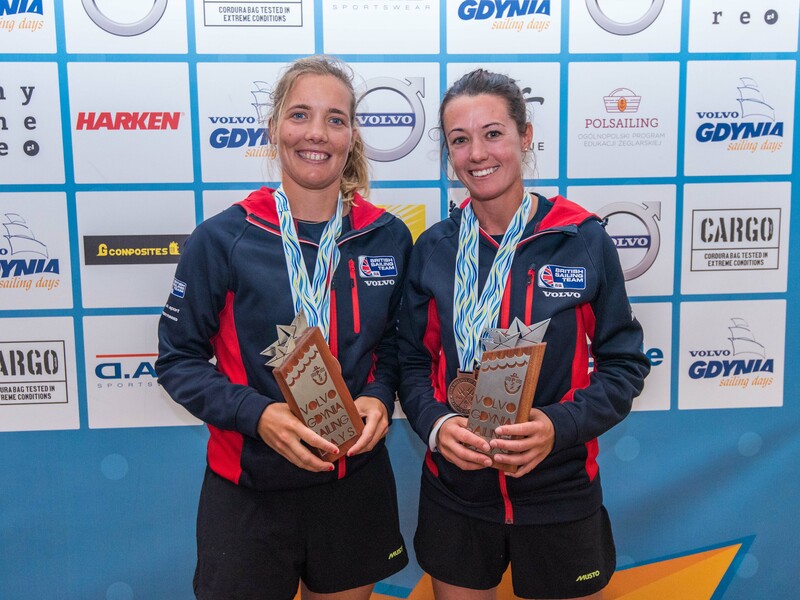 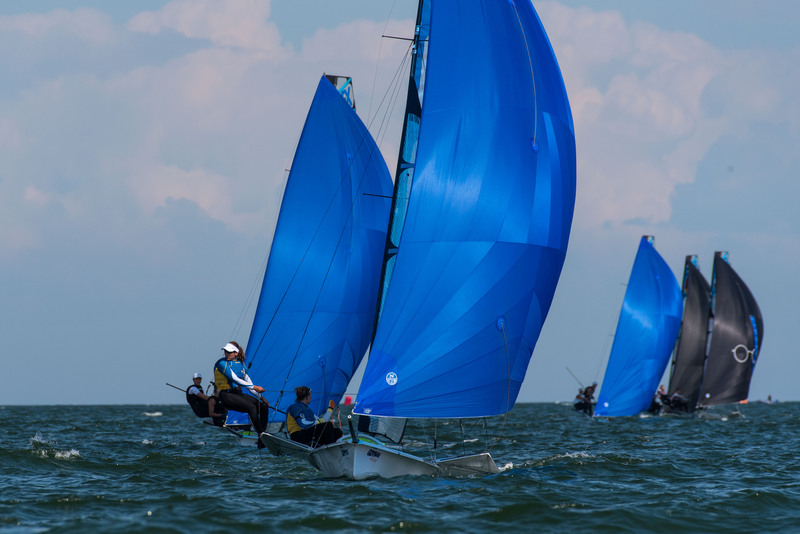 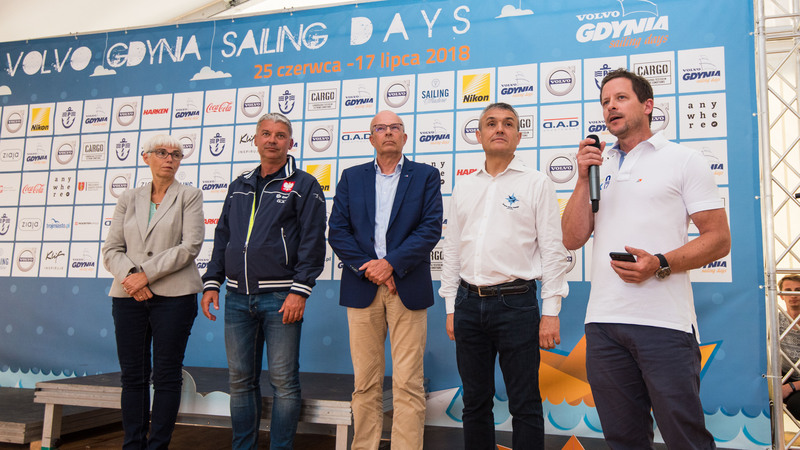 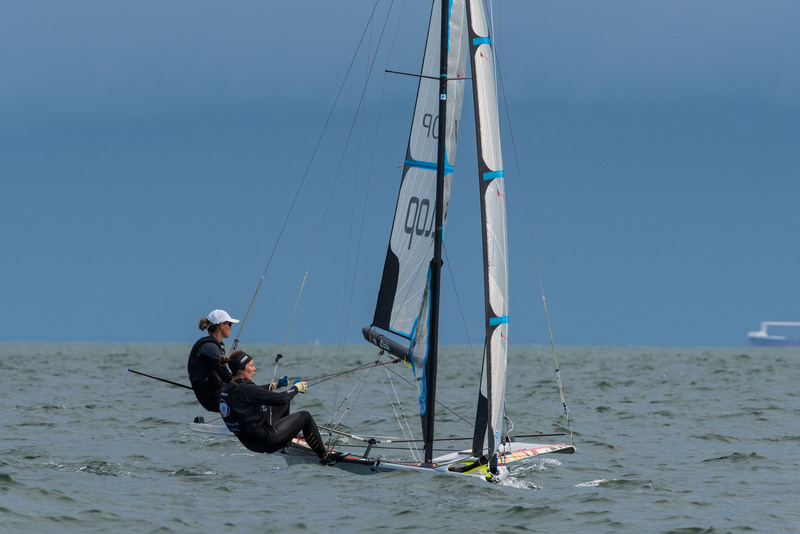 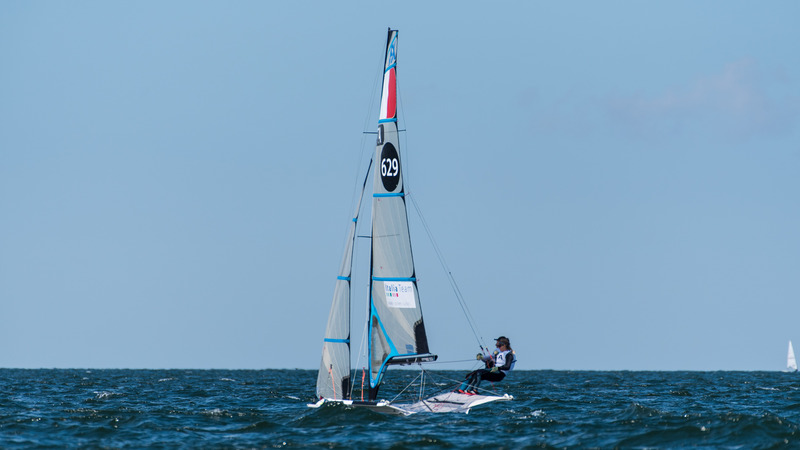 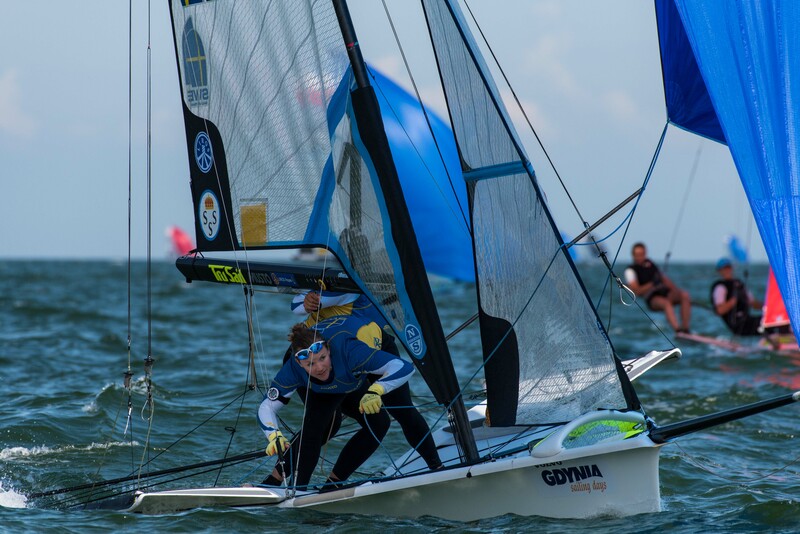 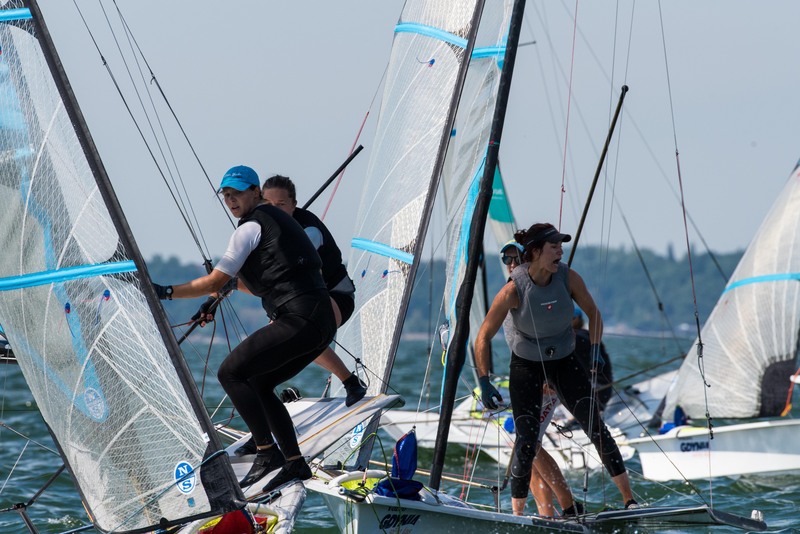 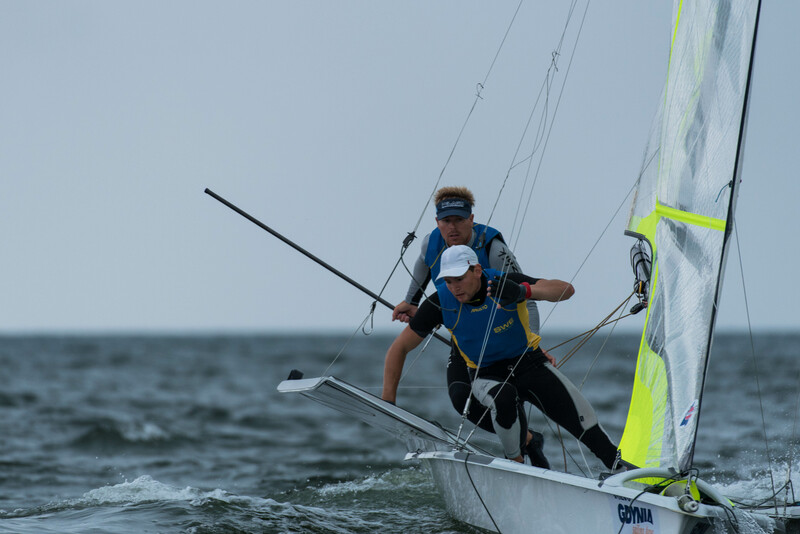 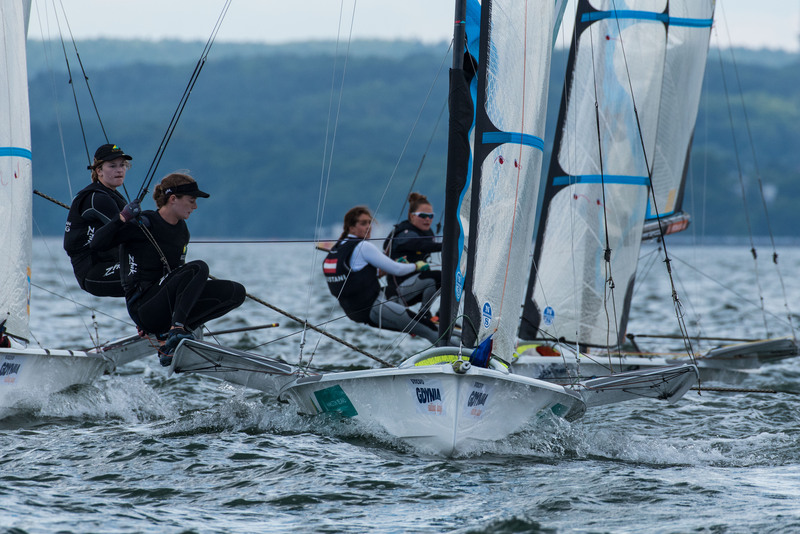 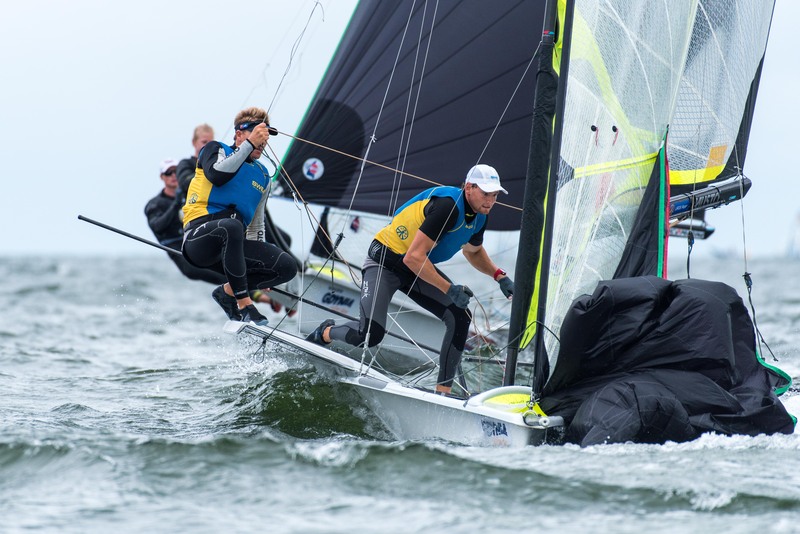 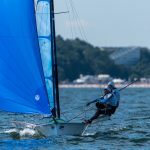 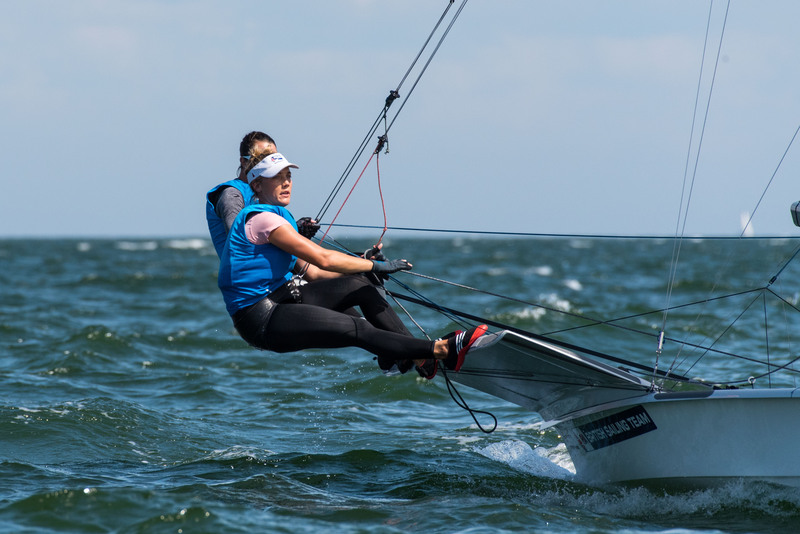 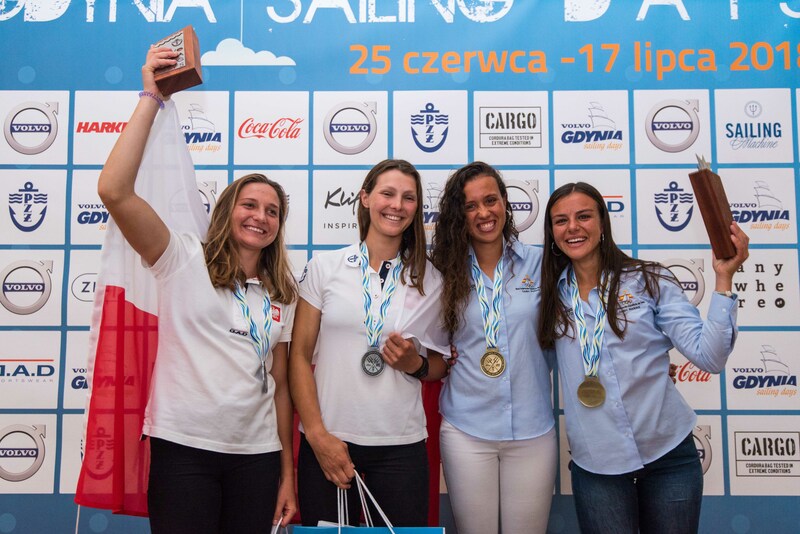 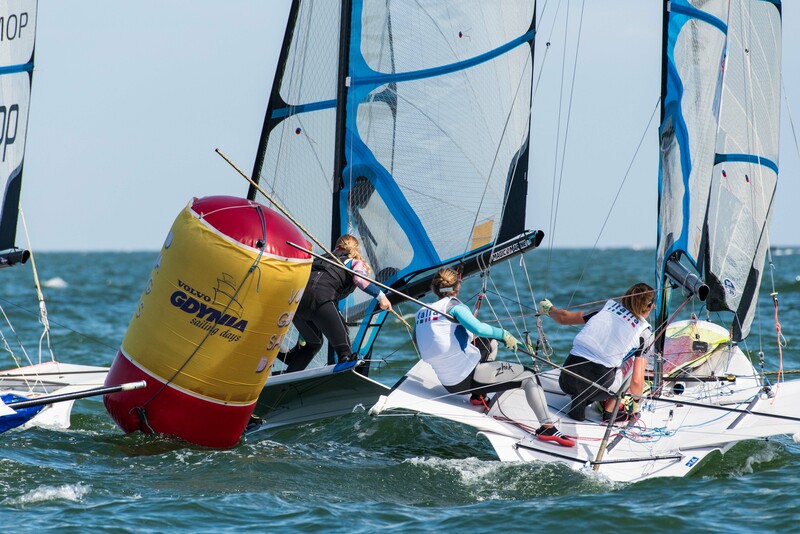 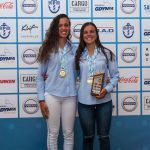 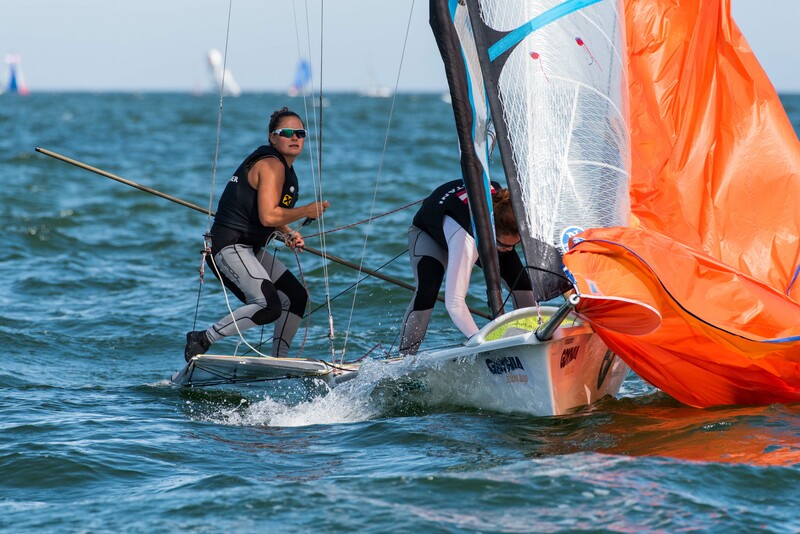 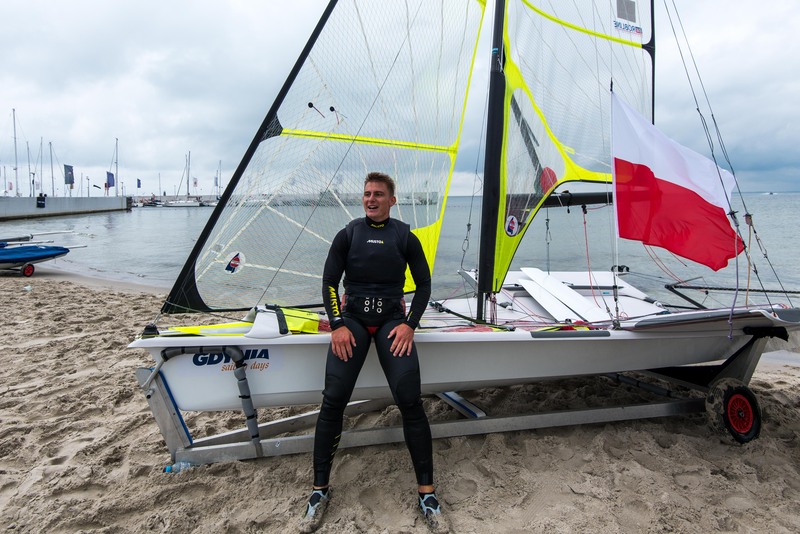 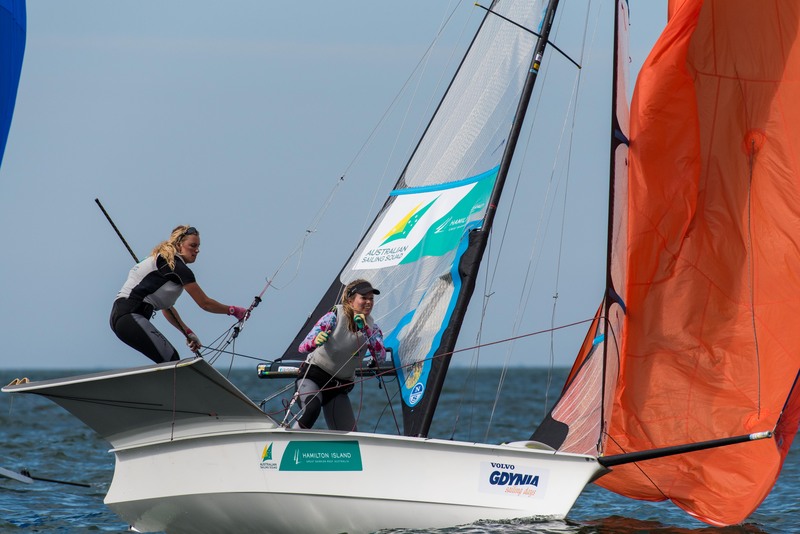 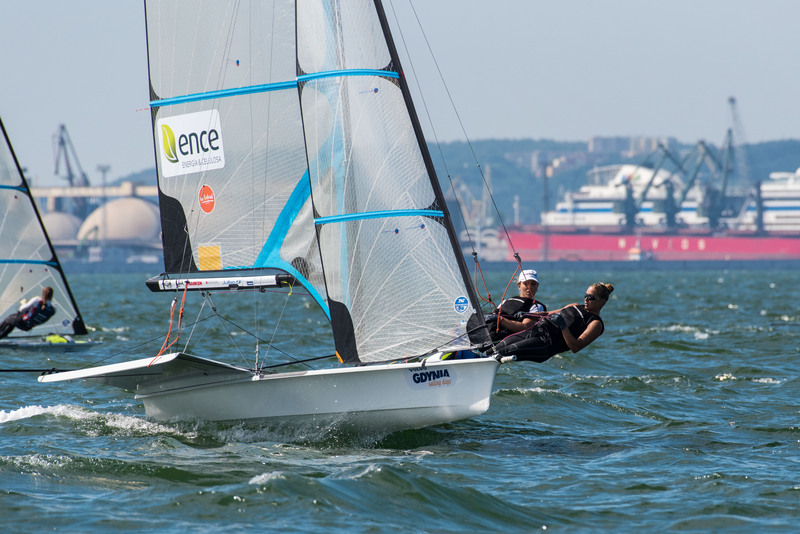 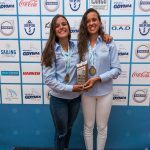 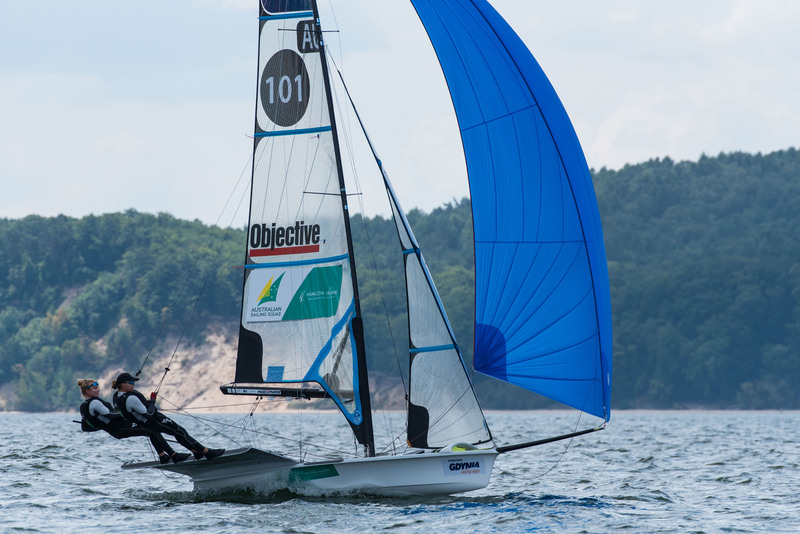 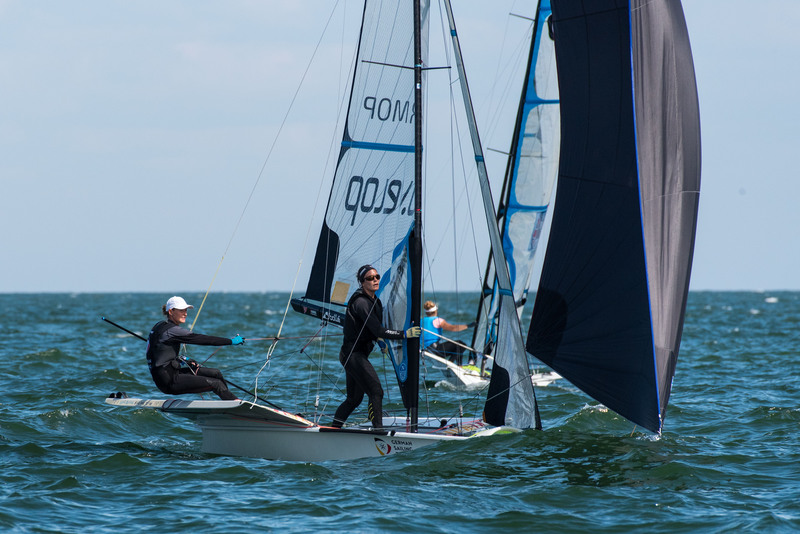 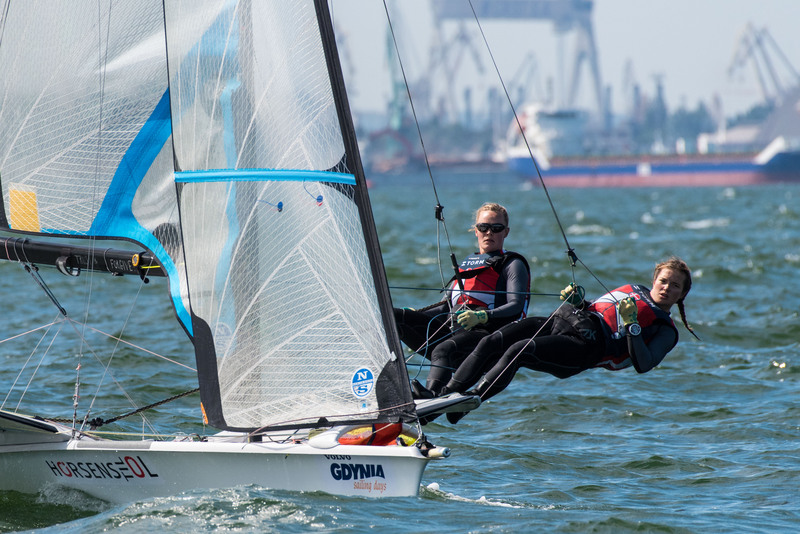 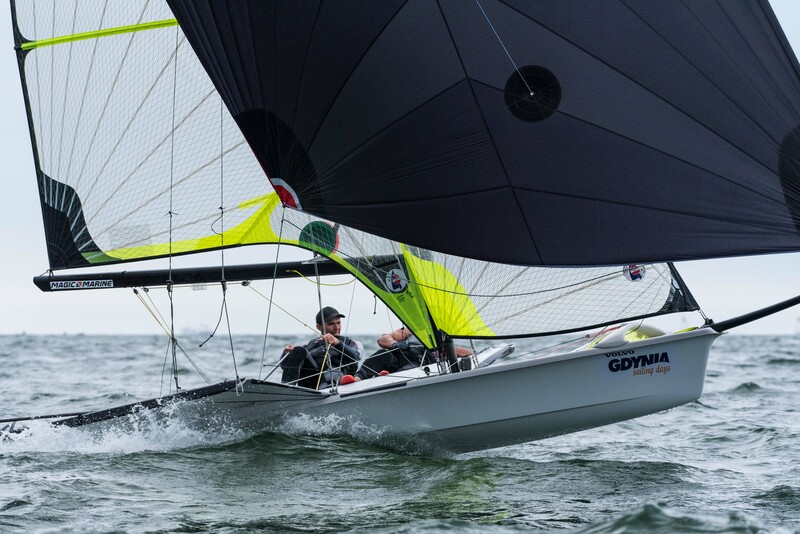 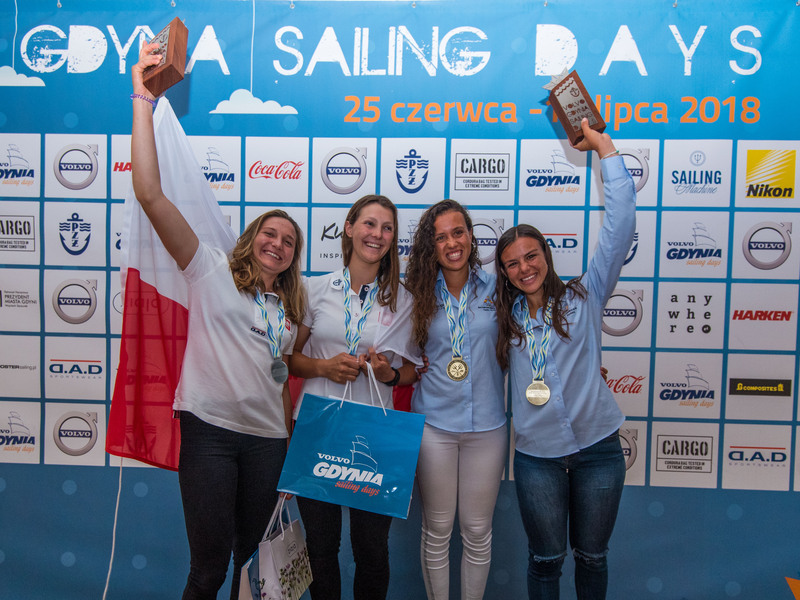 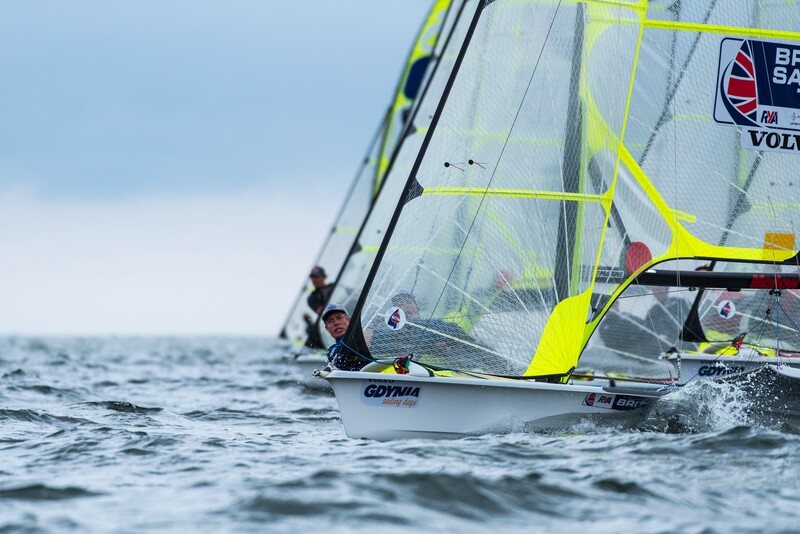 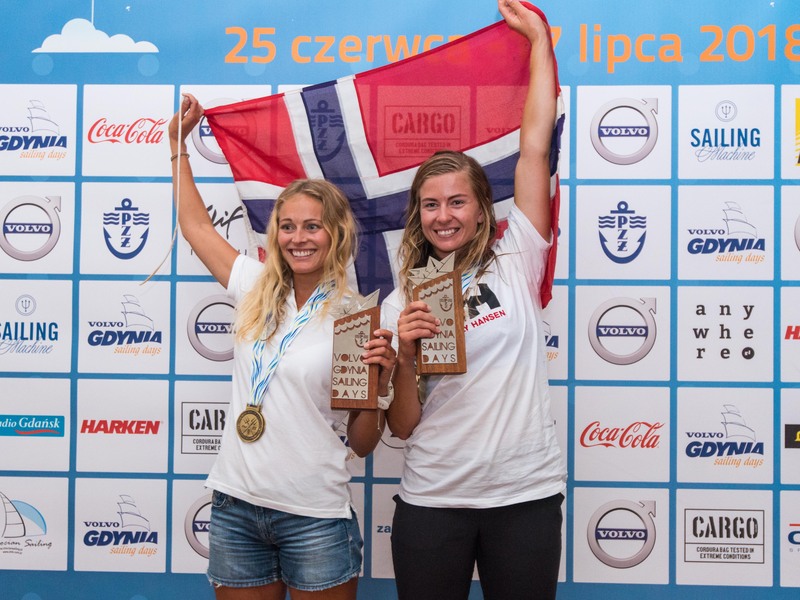 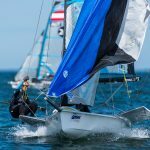 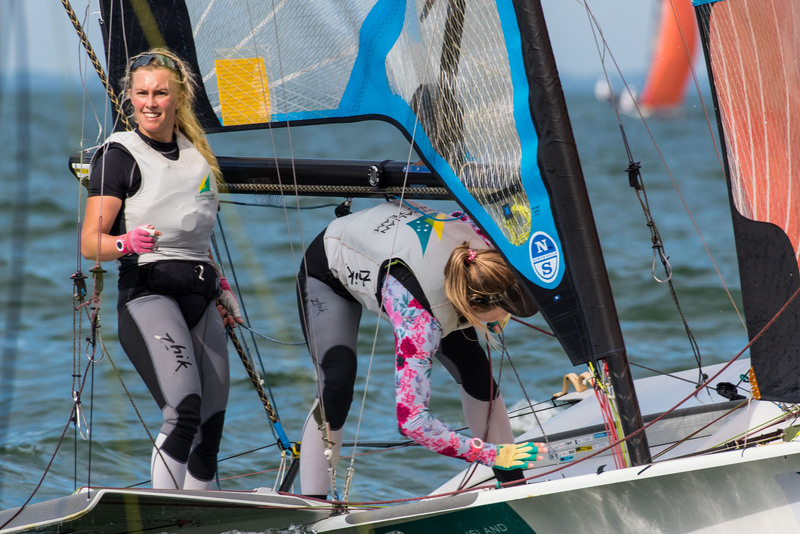 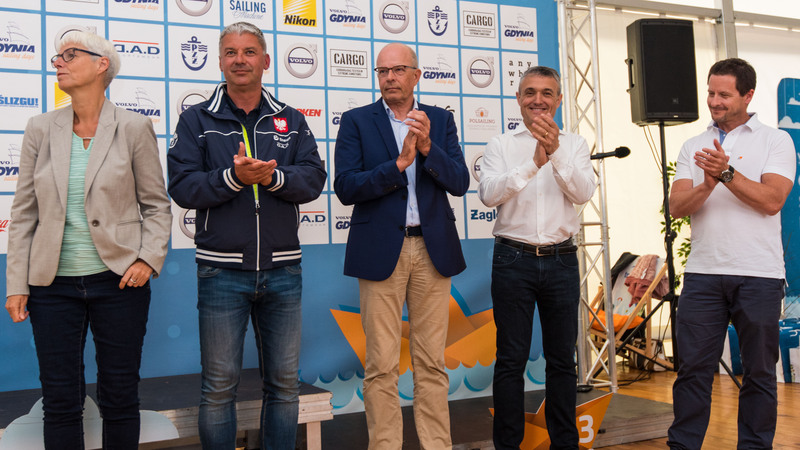 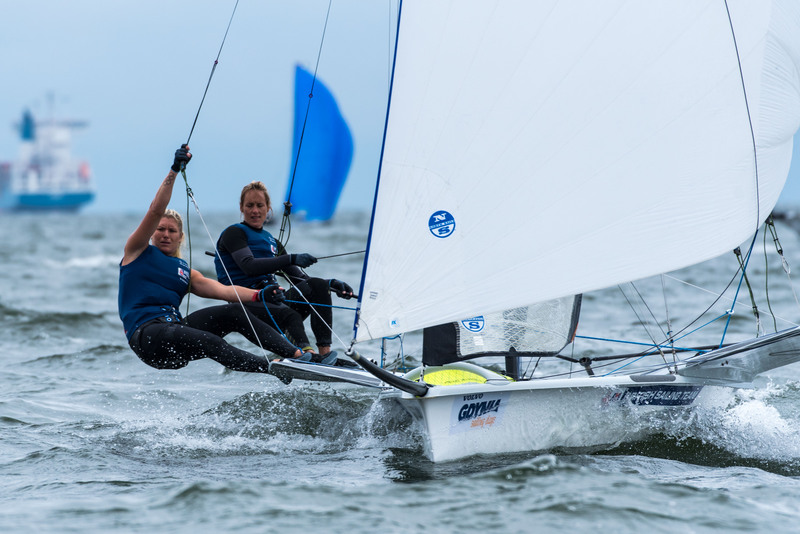 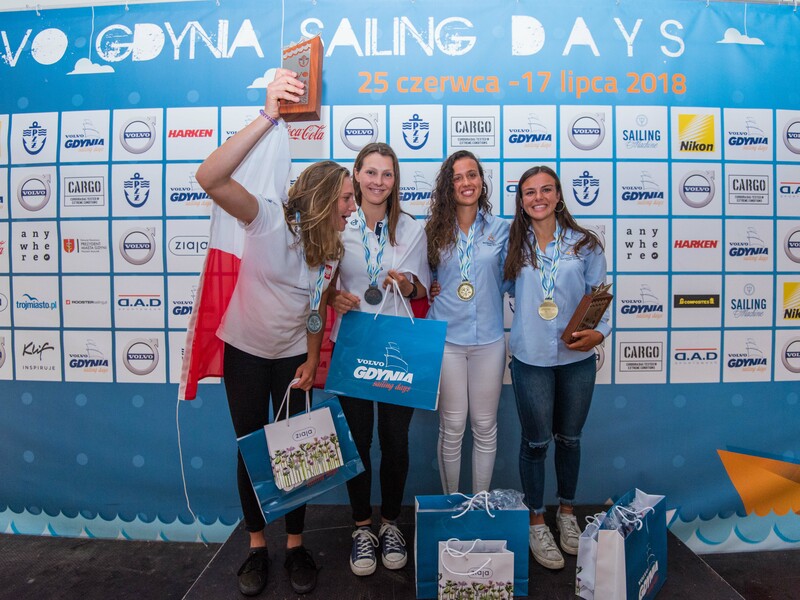 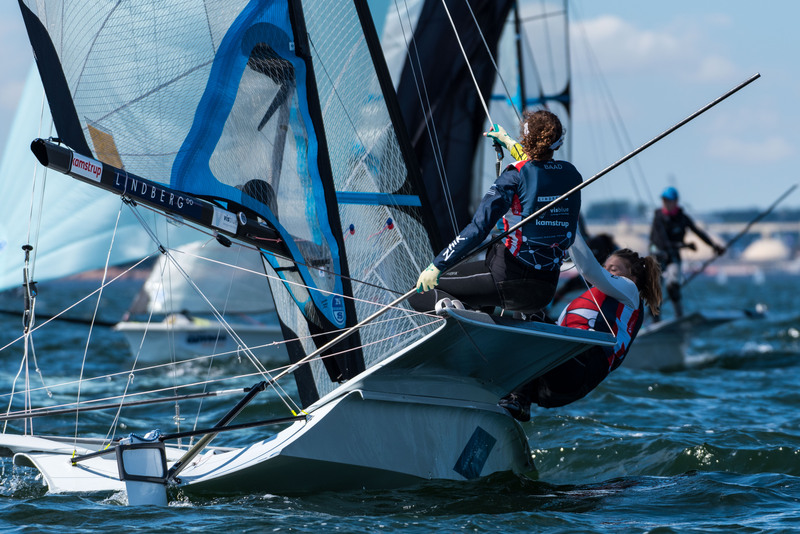 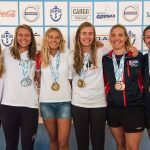 As part of the Volvo Gdynia Sailing days, these women of skiff are set to take off from the stunning beach each day to lay claim to this year’s title. 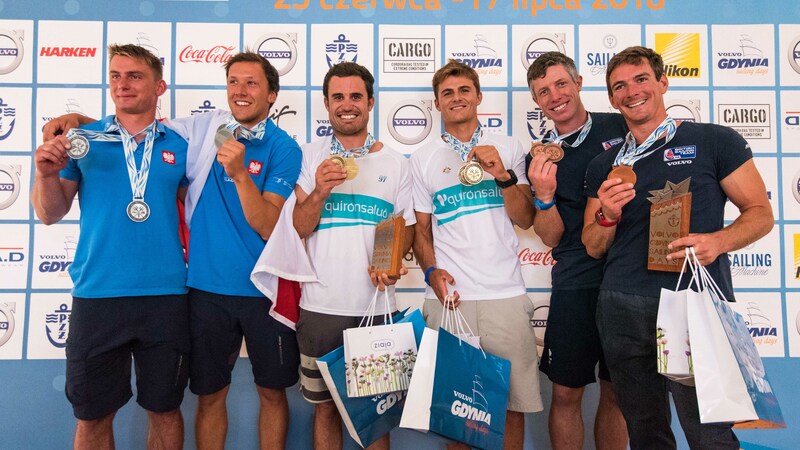 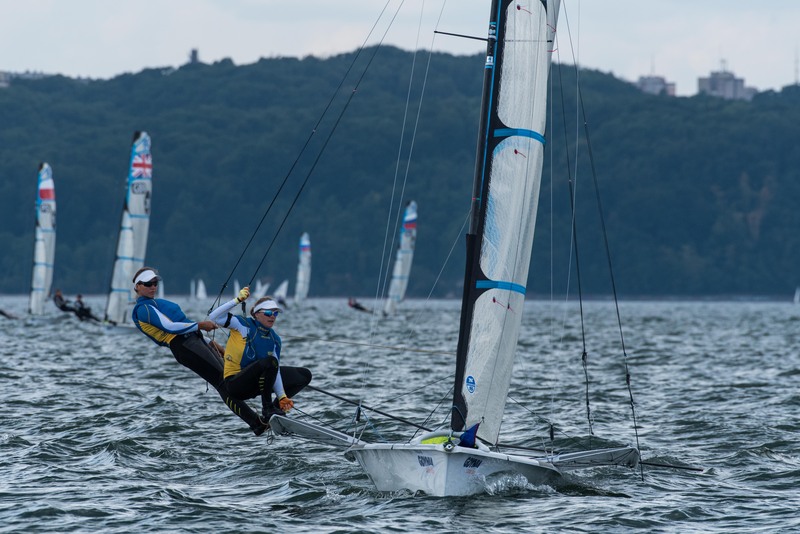 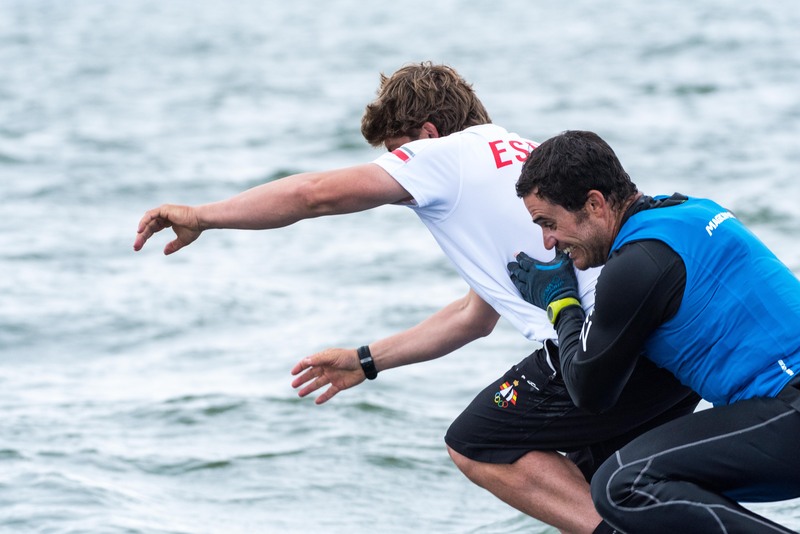 With the first Olympic qualifier one month away, many notable teams decided to skip the regatta, but there are two previous European title holders entered. 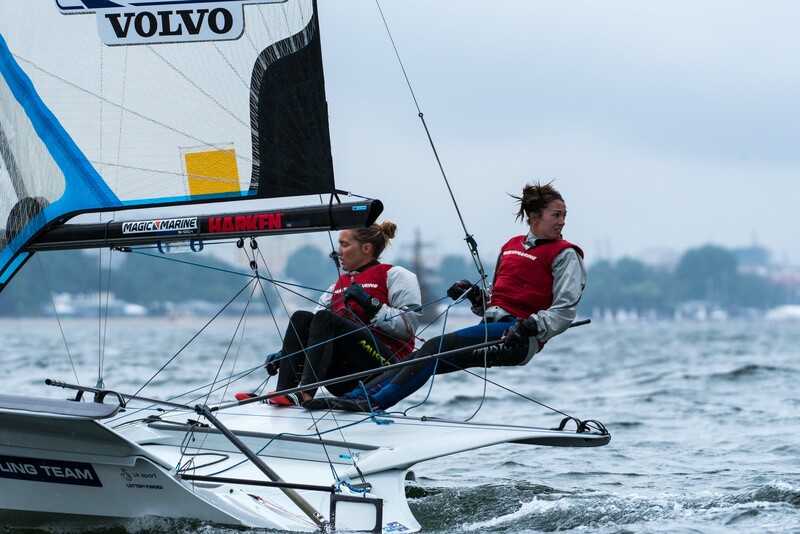 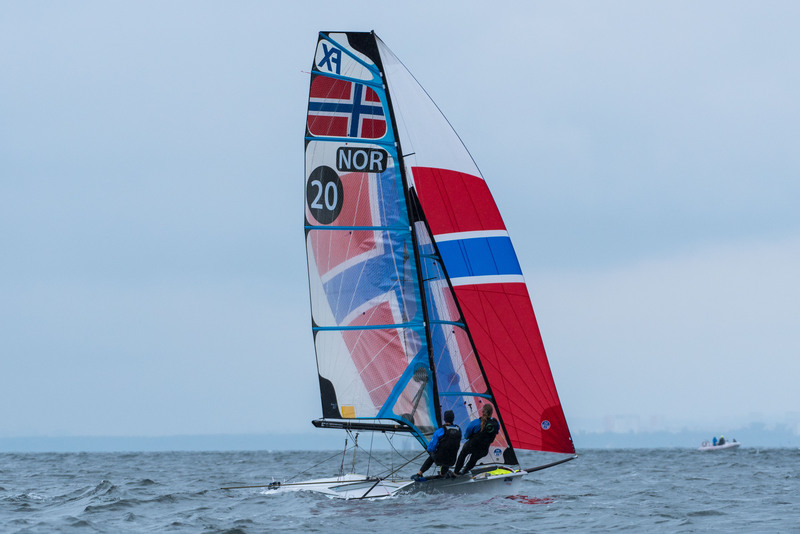 Two time European Champions Ida Nielsen and Marie Olsen (DEN) are back together and have been racing all season. 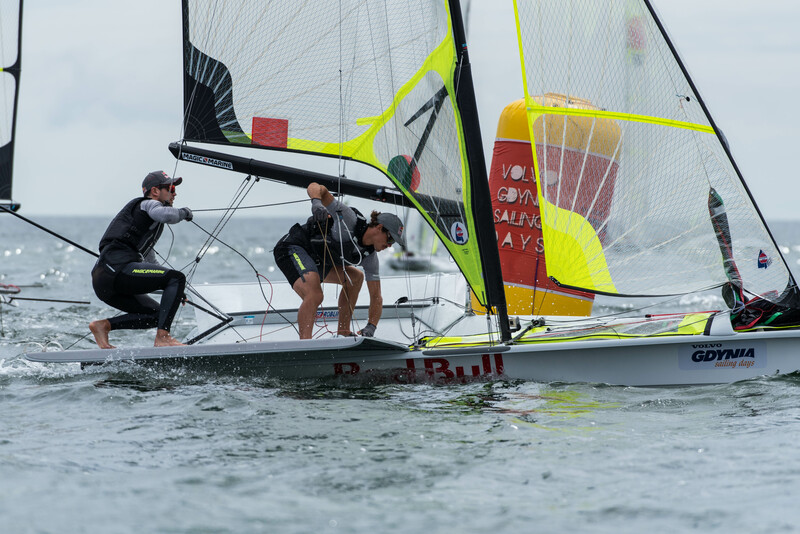 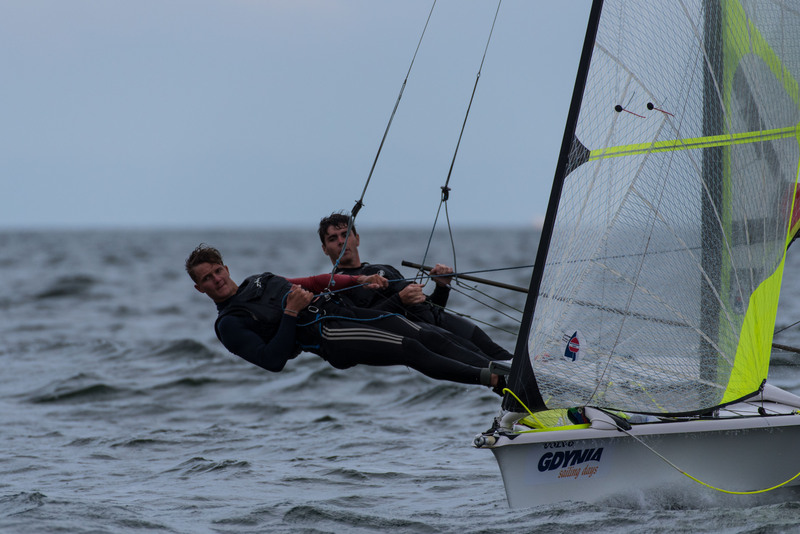 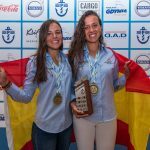 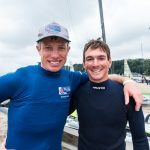 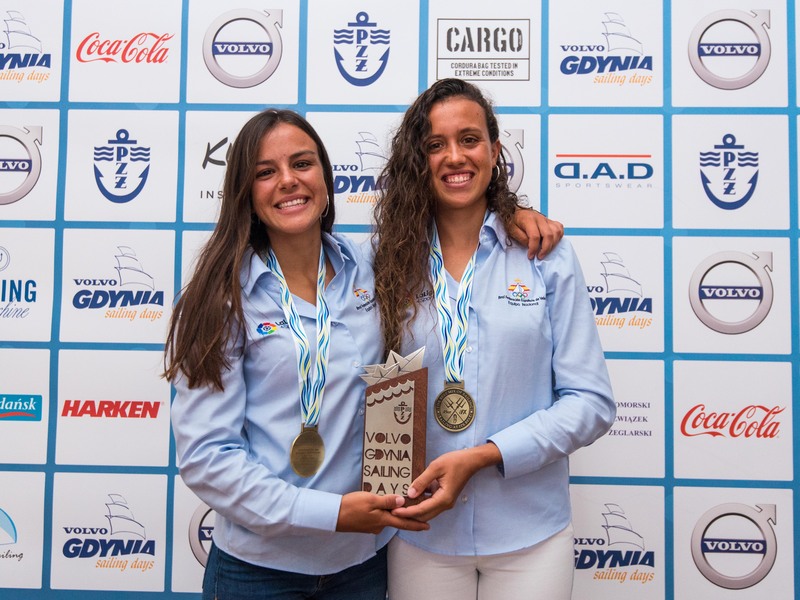 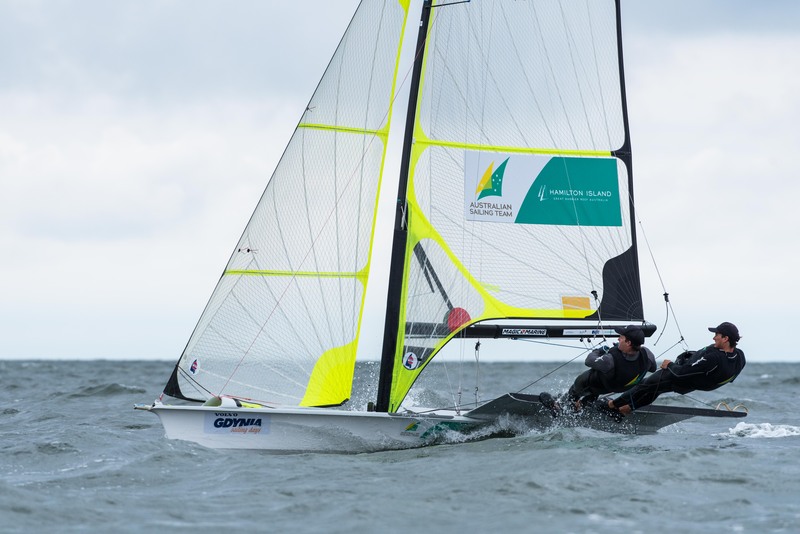 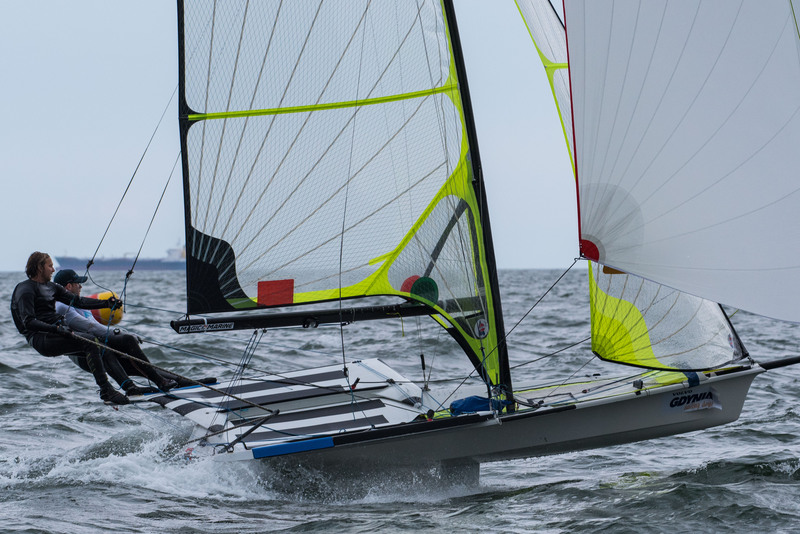 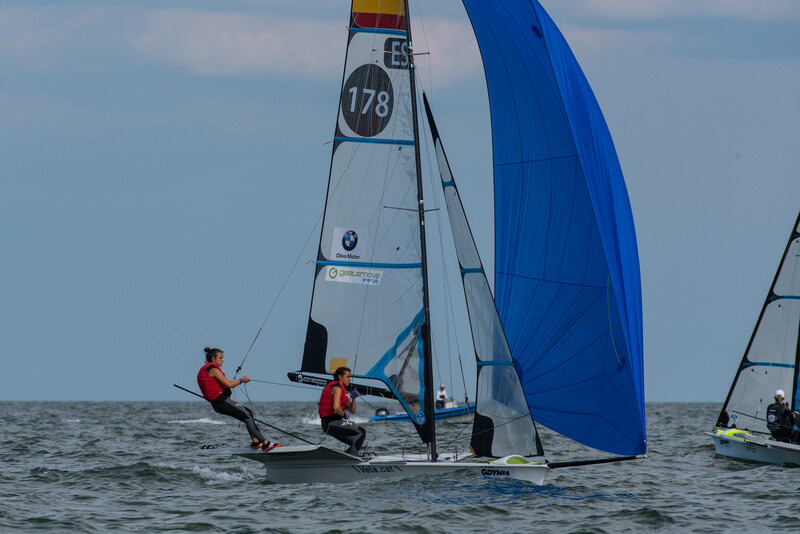 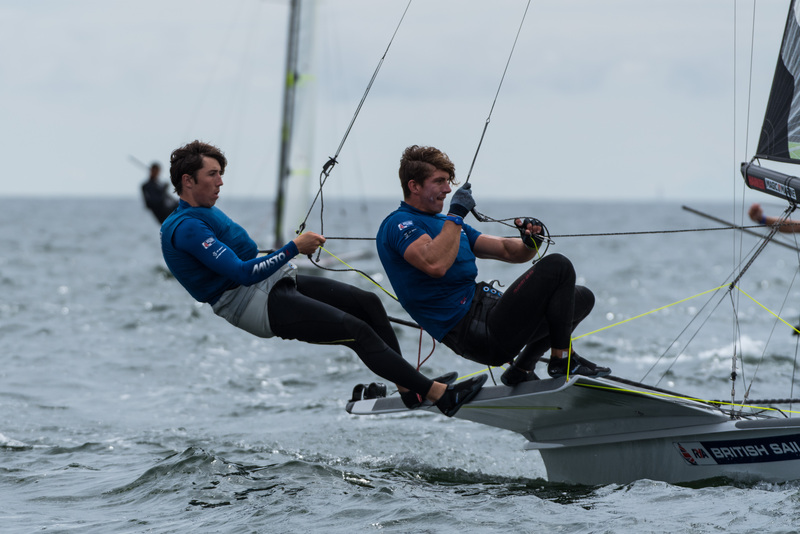 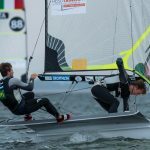 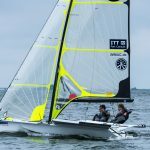 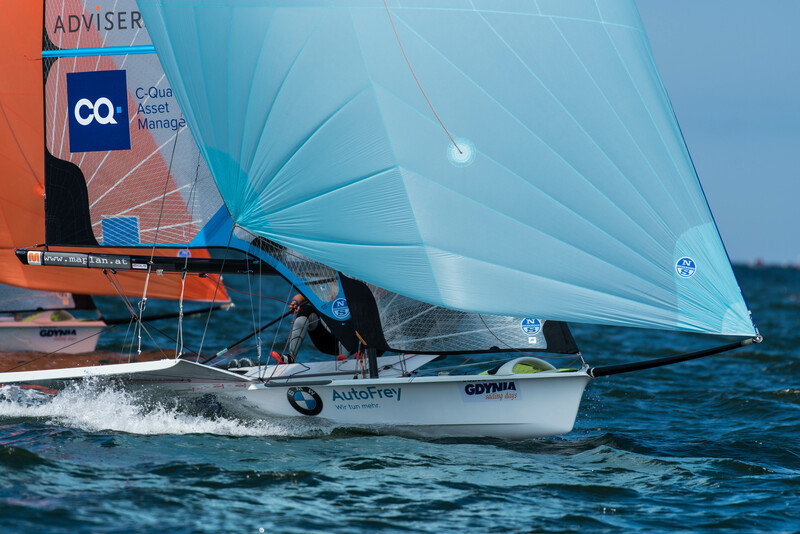 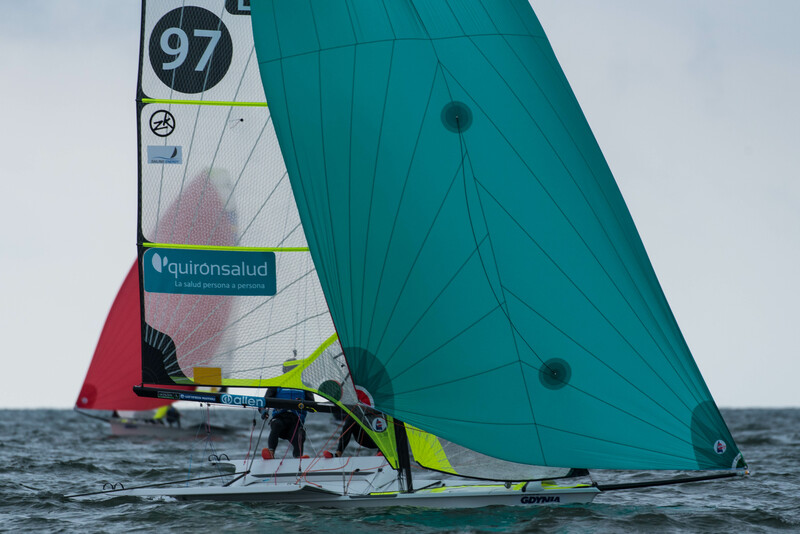 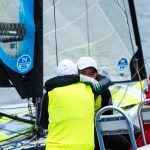 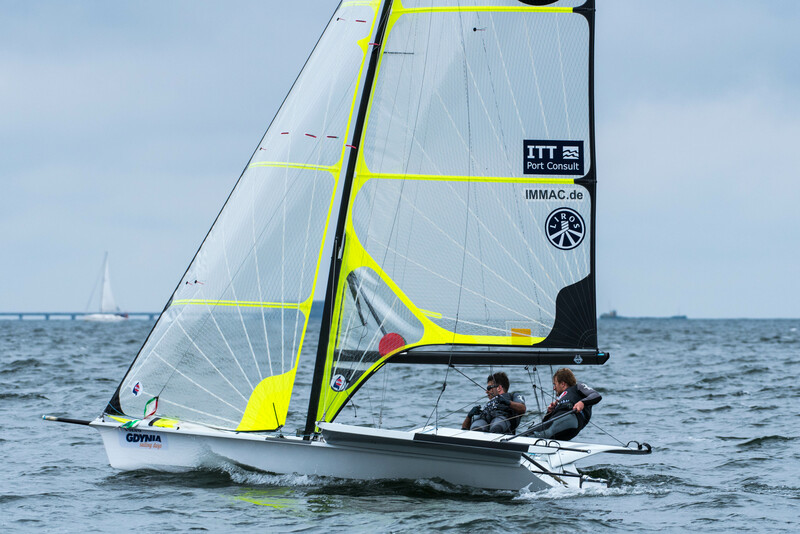 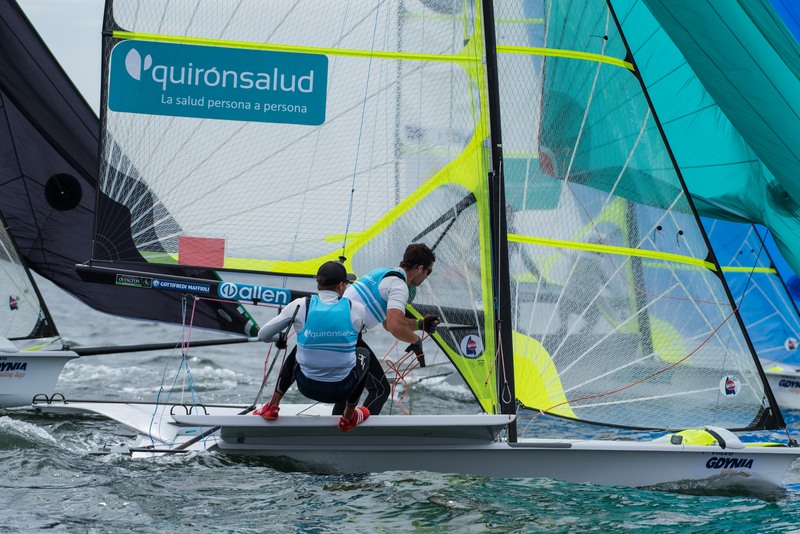 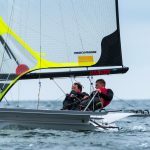 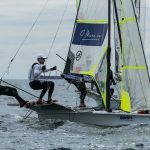 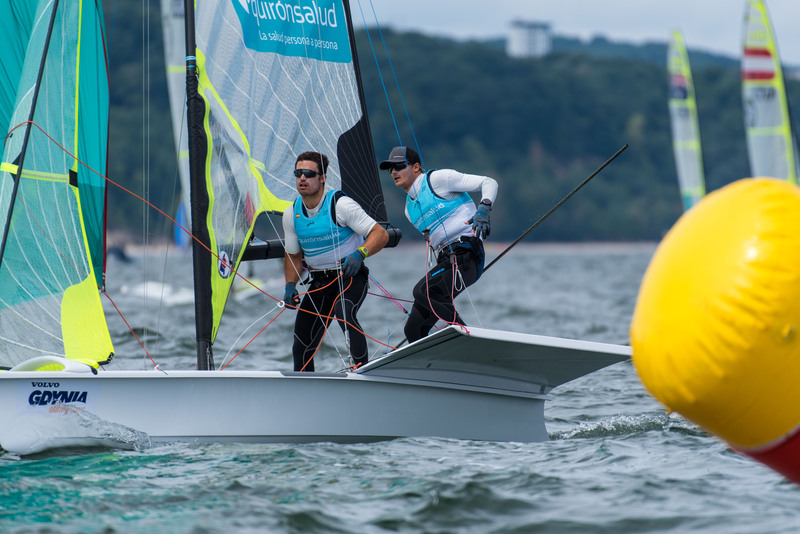 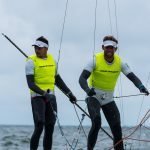 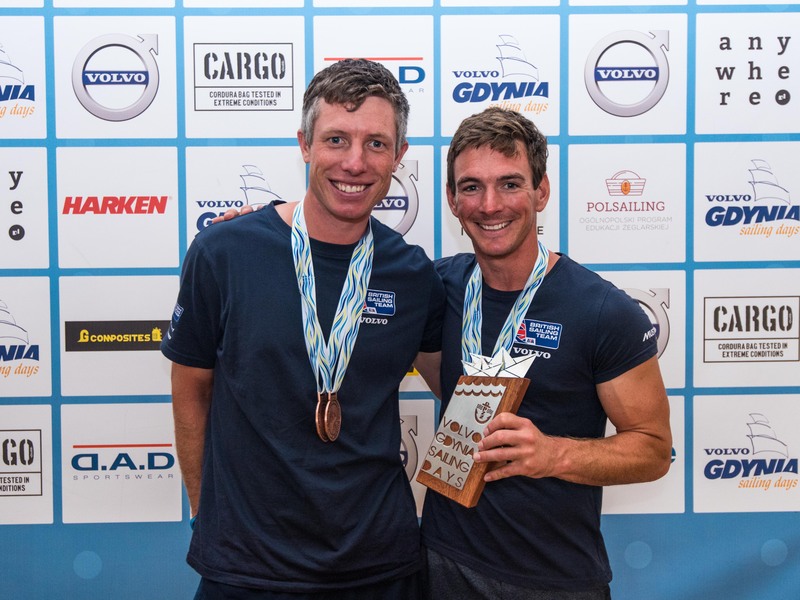 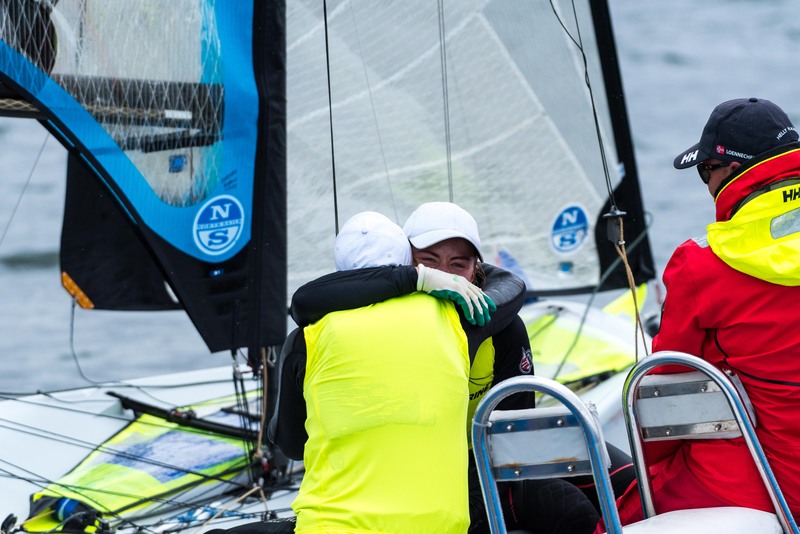 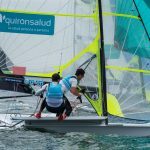 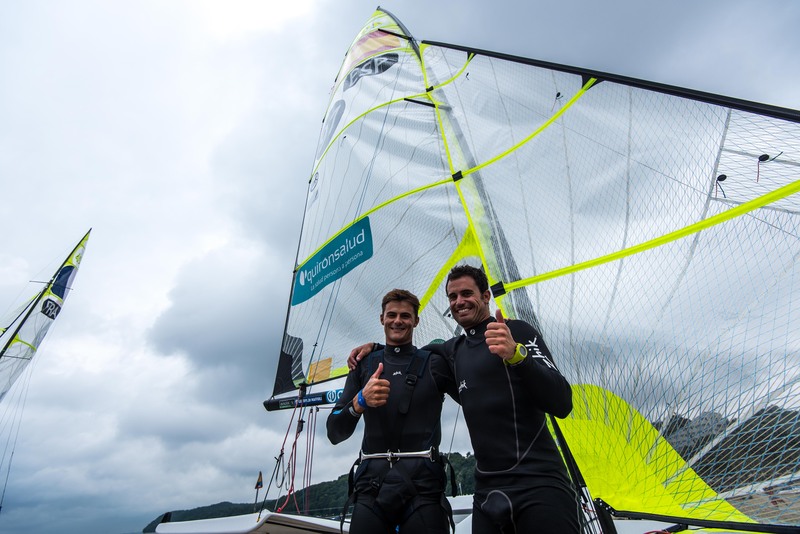 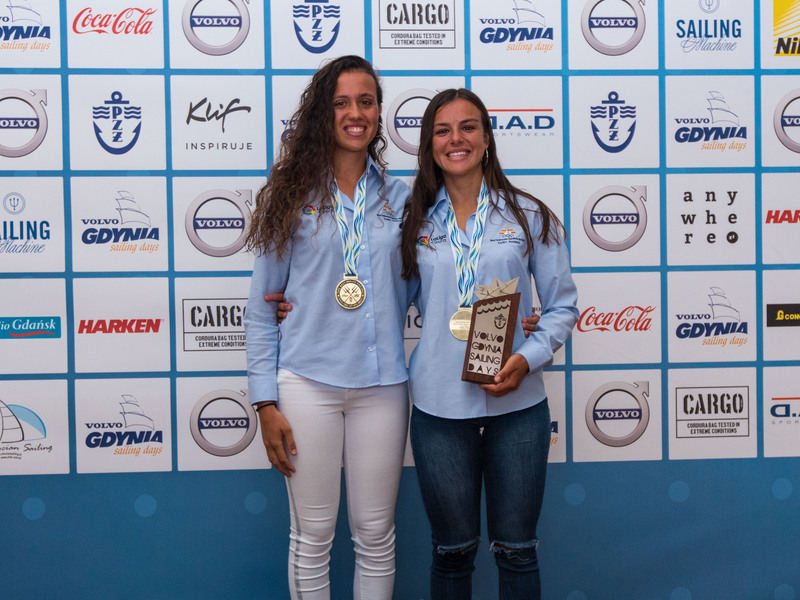 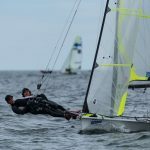 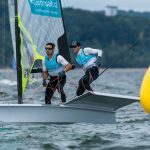 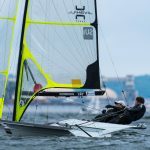 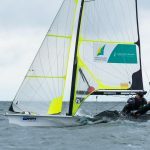 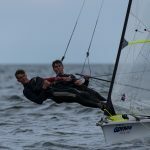 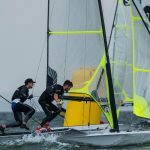 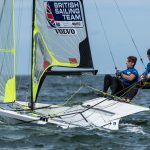 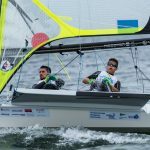 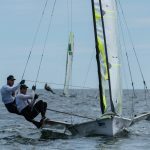 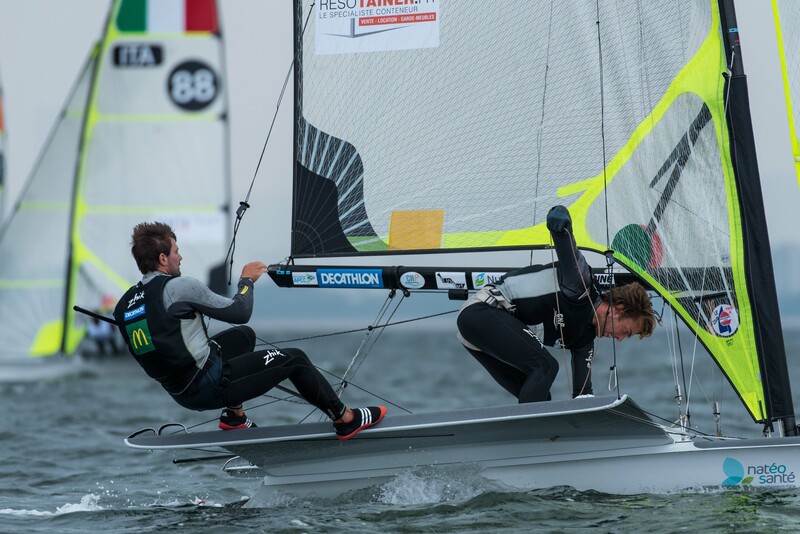 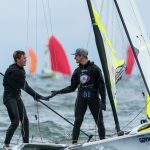 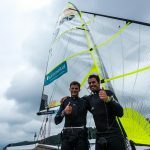 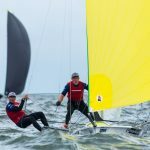 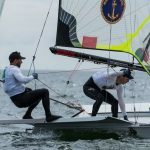 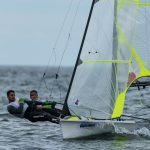 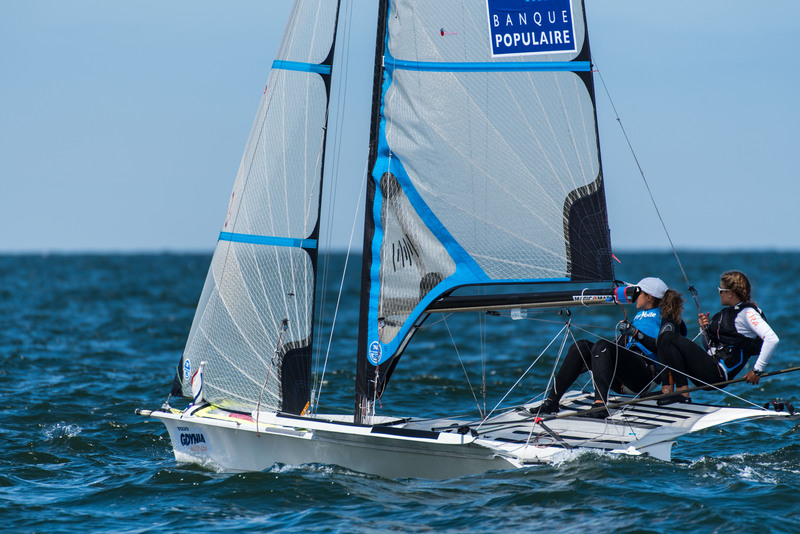 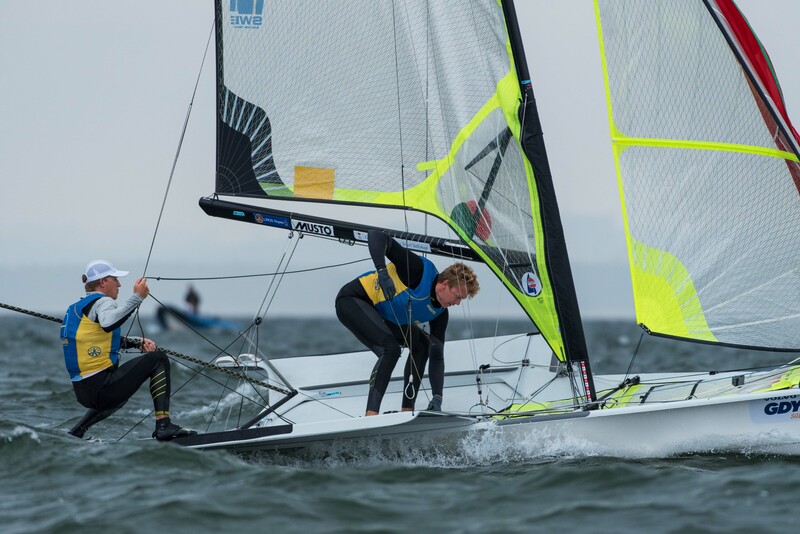 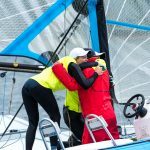 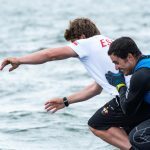 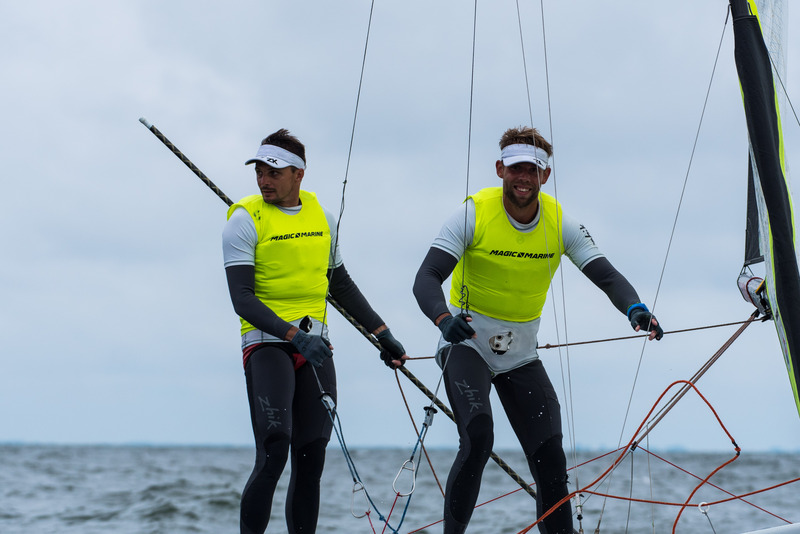 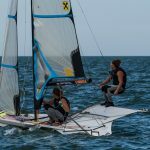 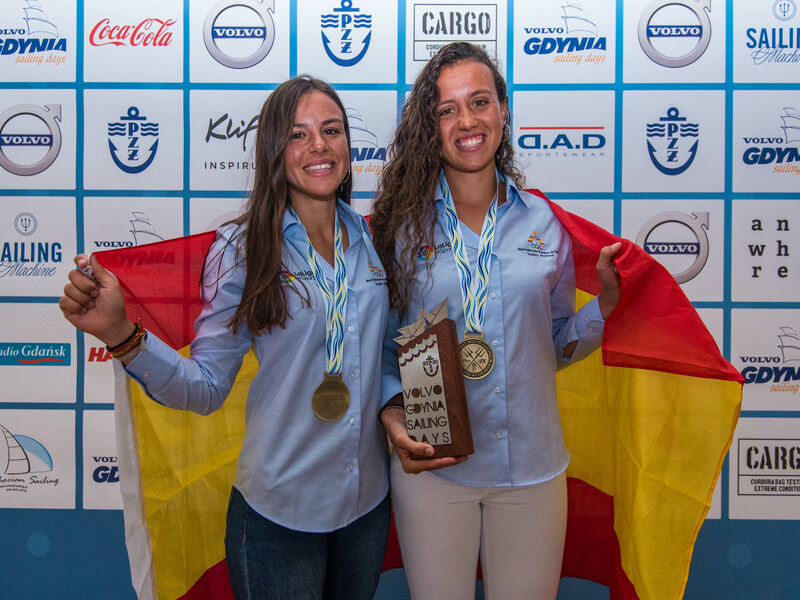 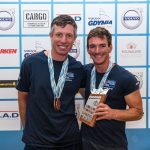 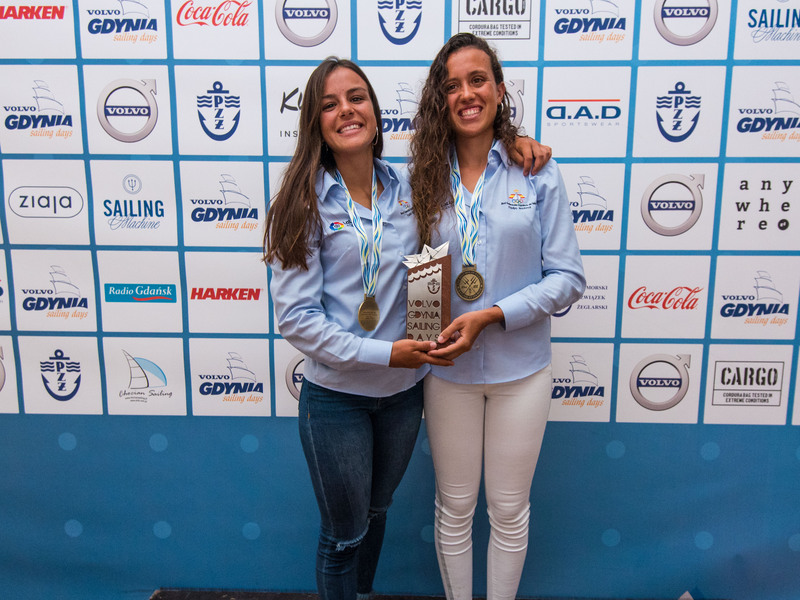 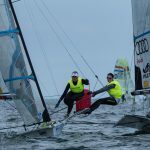 The duo took a year off from racing after missing Rio qualification, but have been back this season doing the circuit with top 5 finishes at Palma and Hyeres. 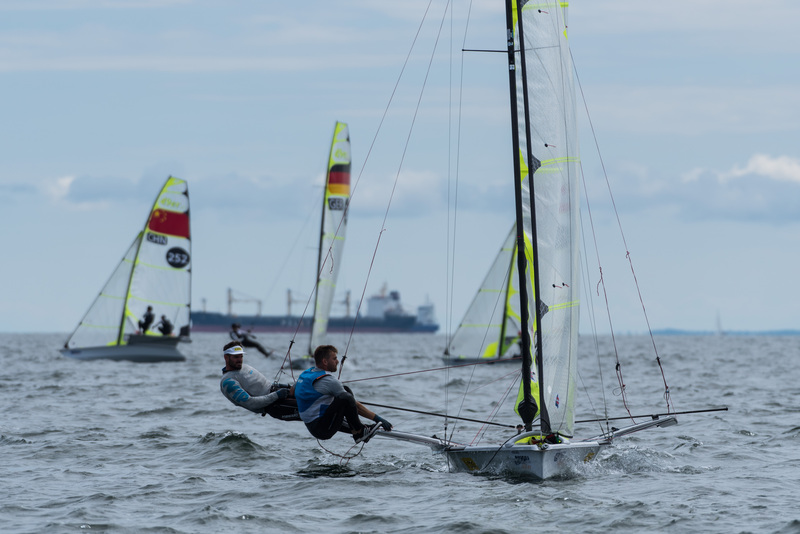 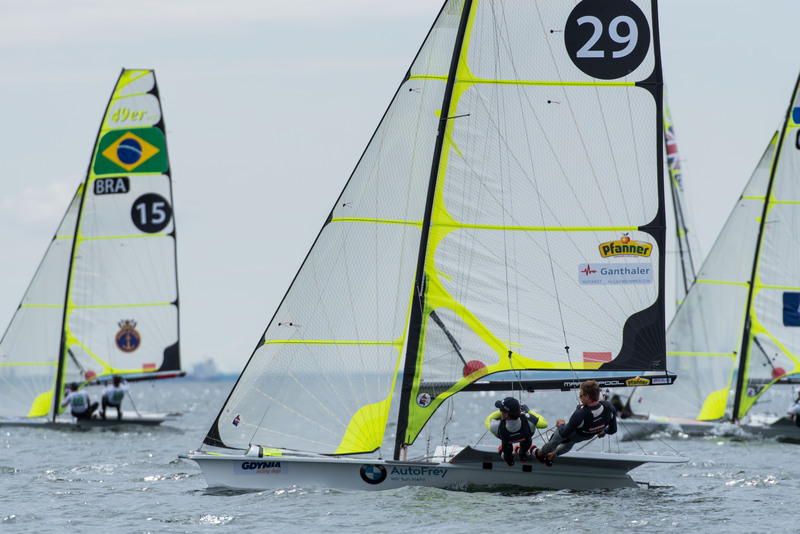 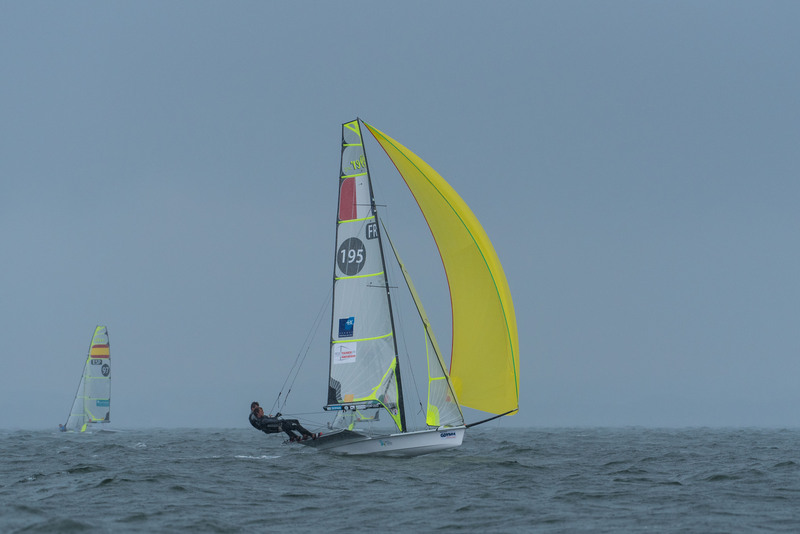 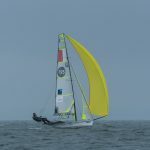 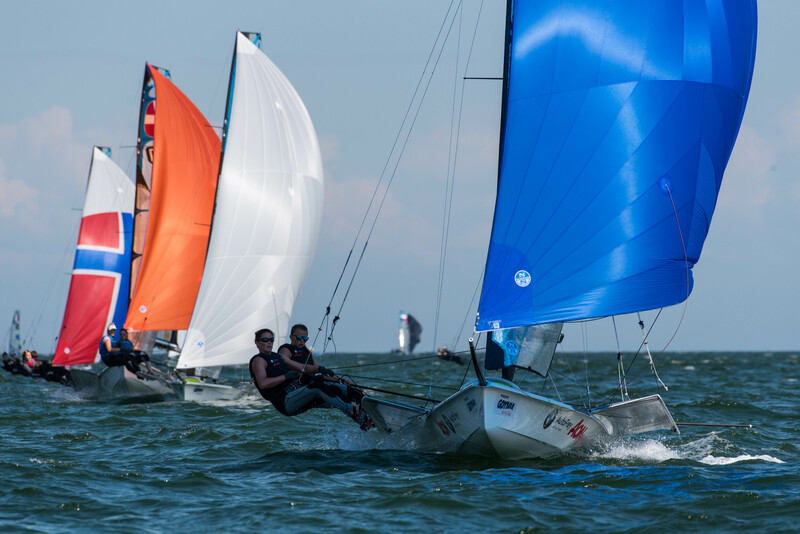 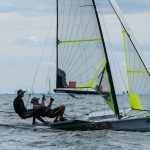 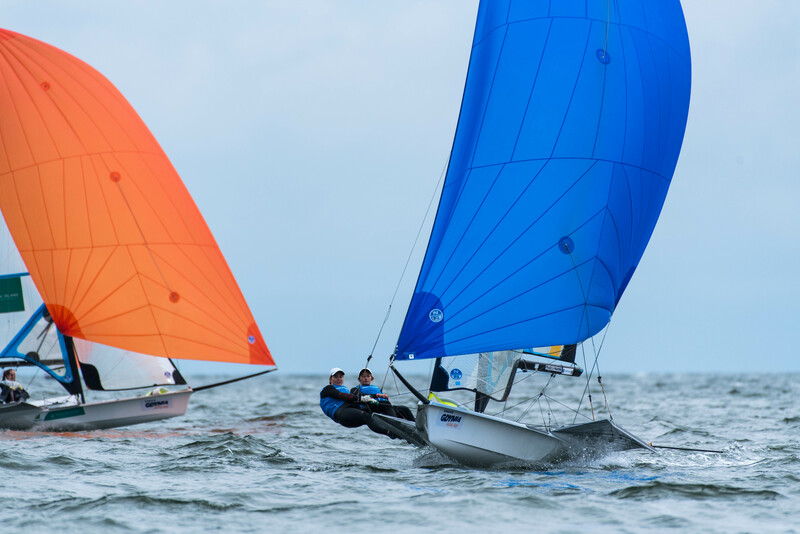 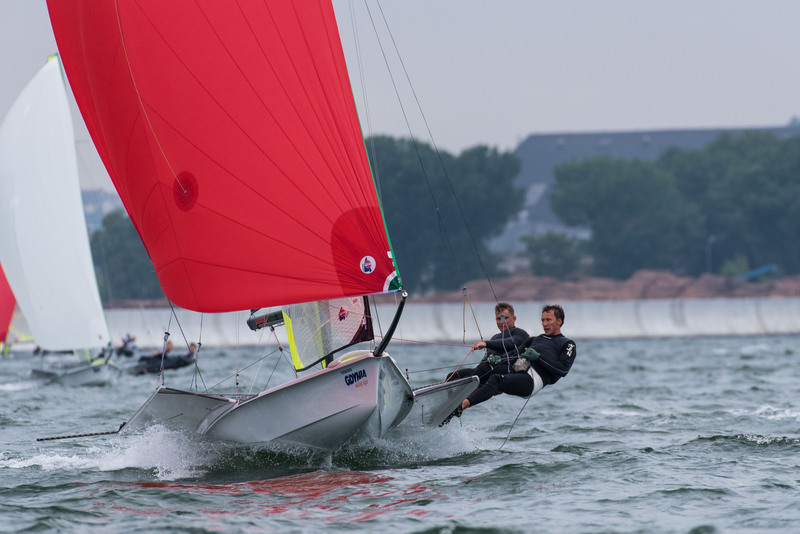 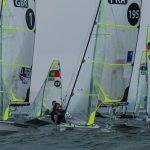 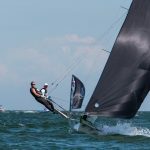 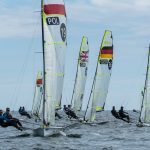 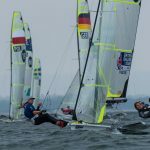 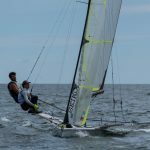 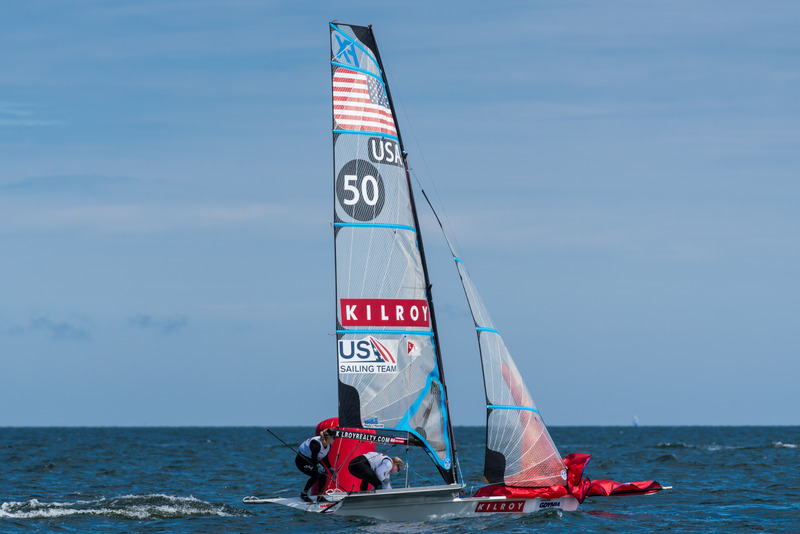 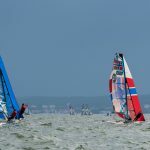 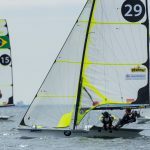 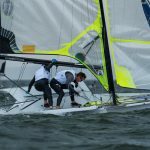 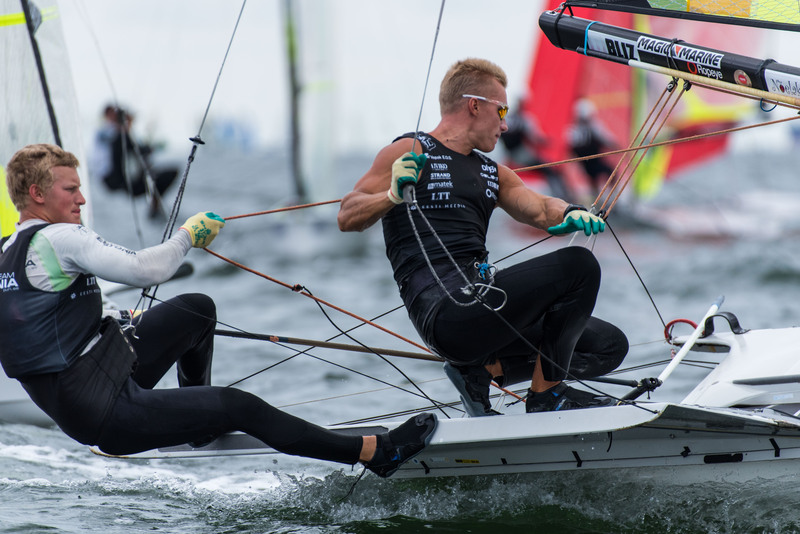 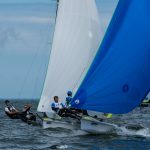 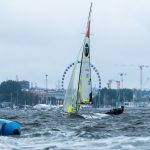 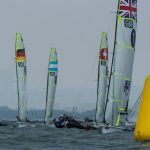 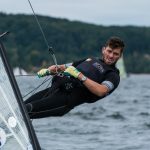 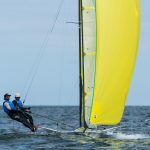 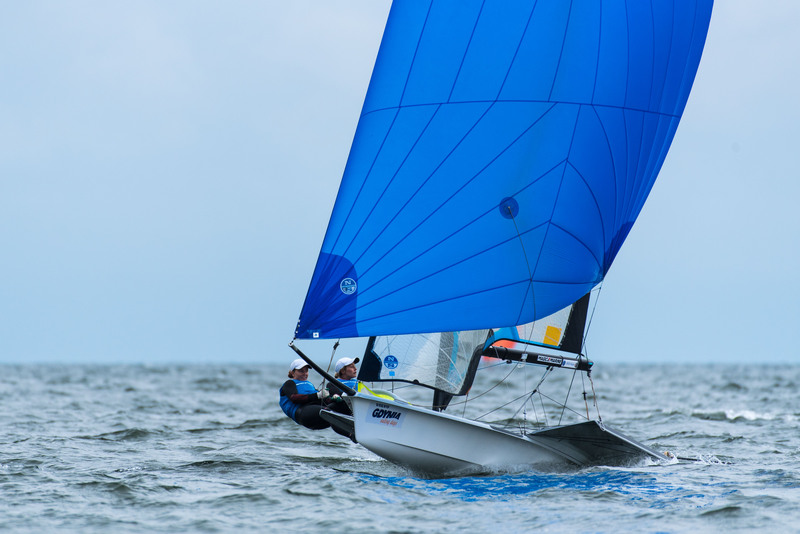 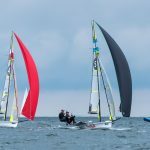 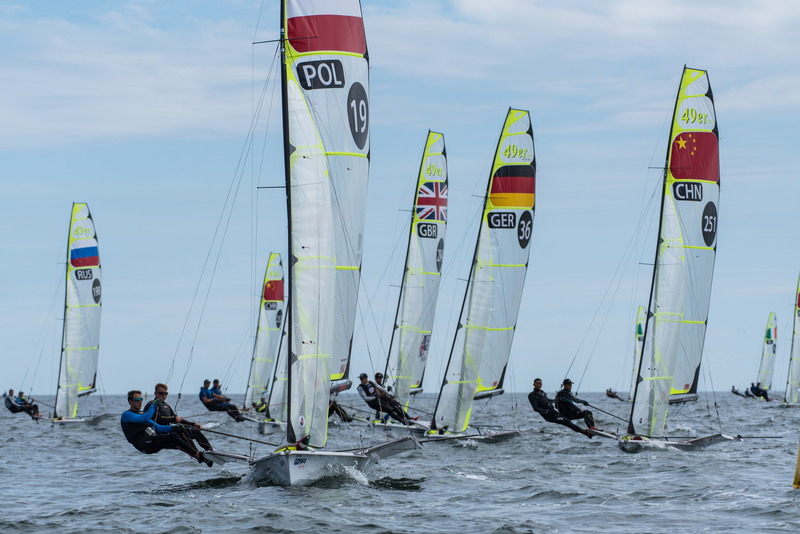 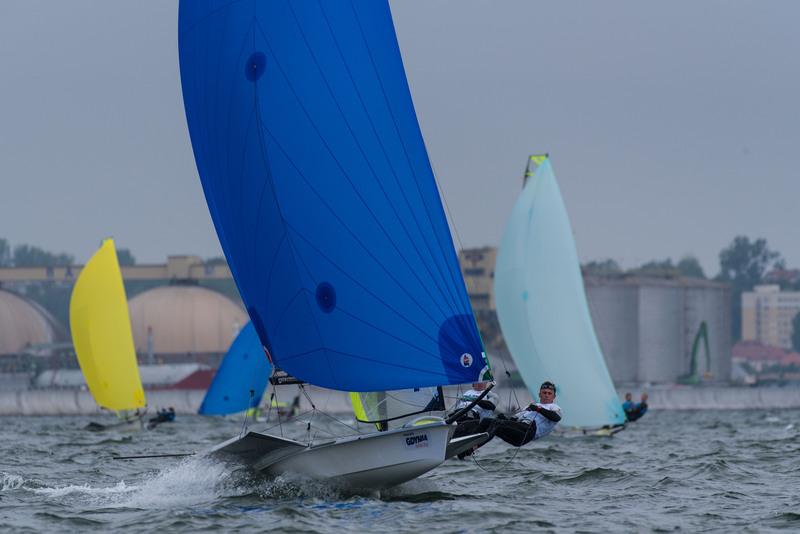 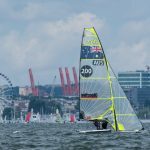 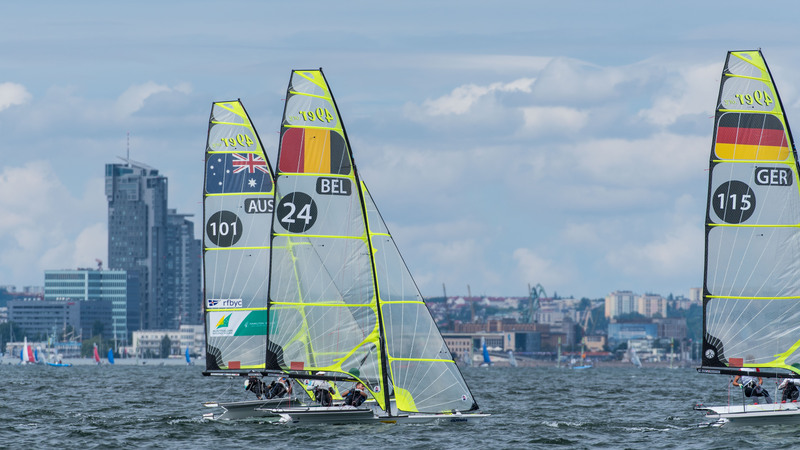 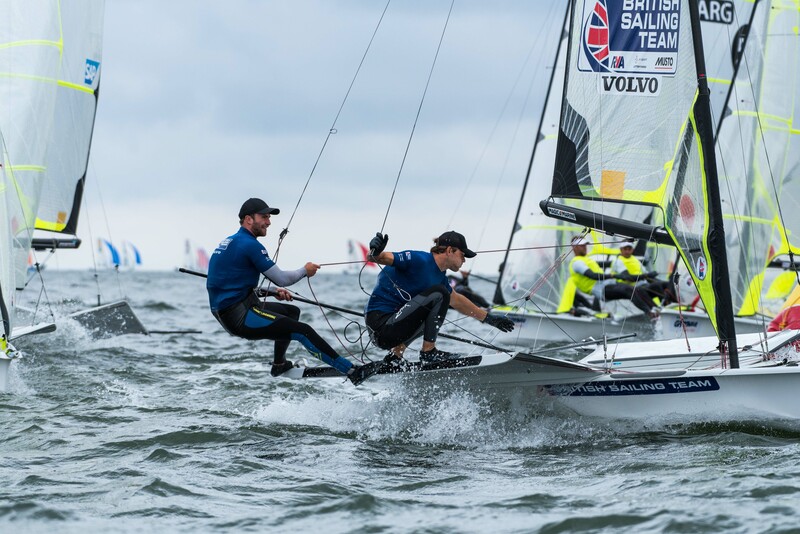 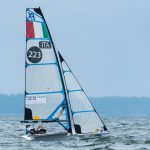 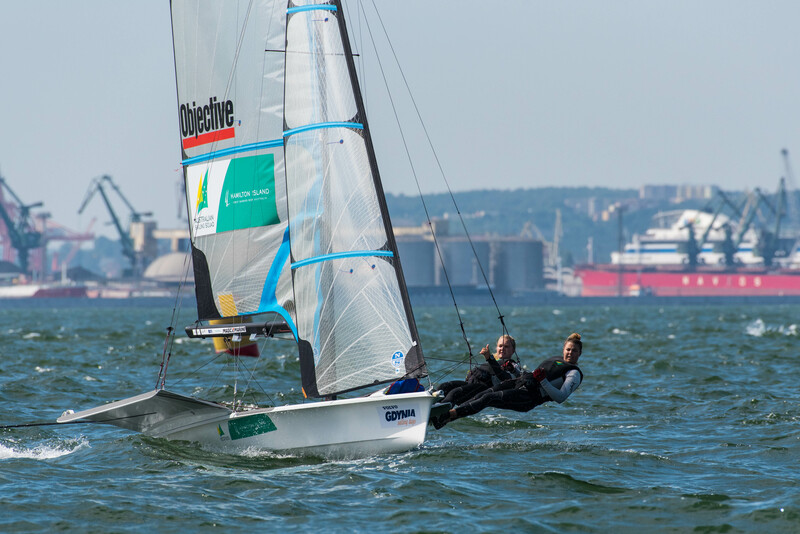 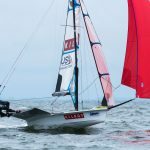 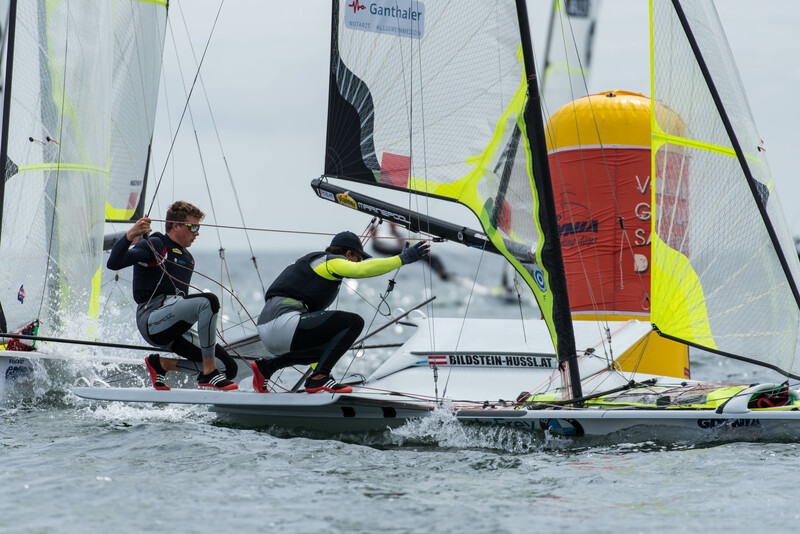 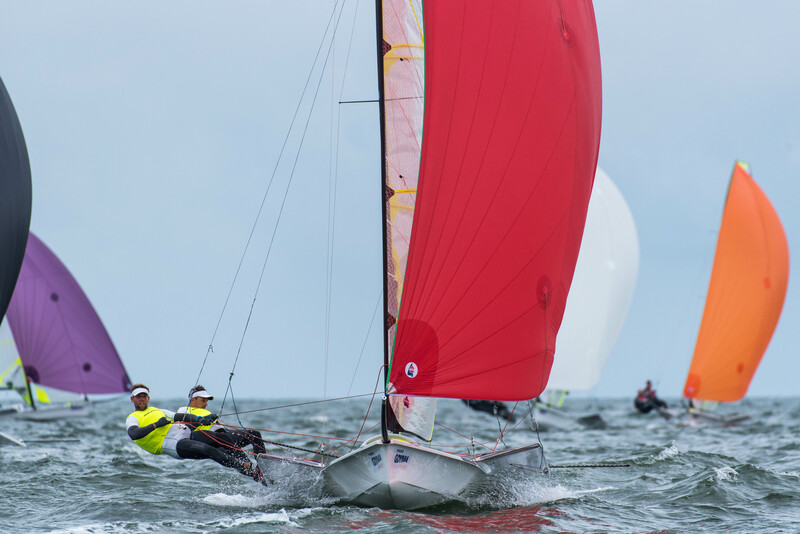 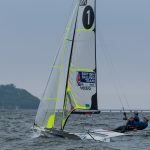 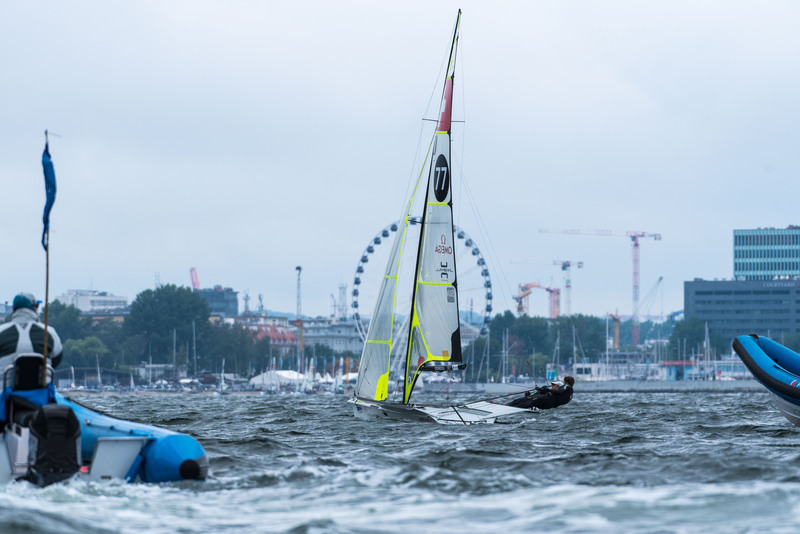 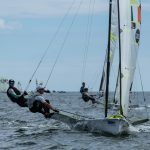 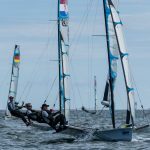 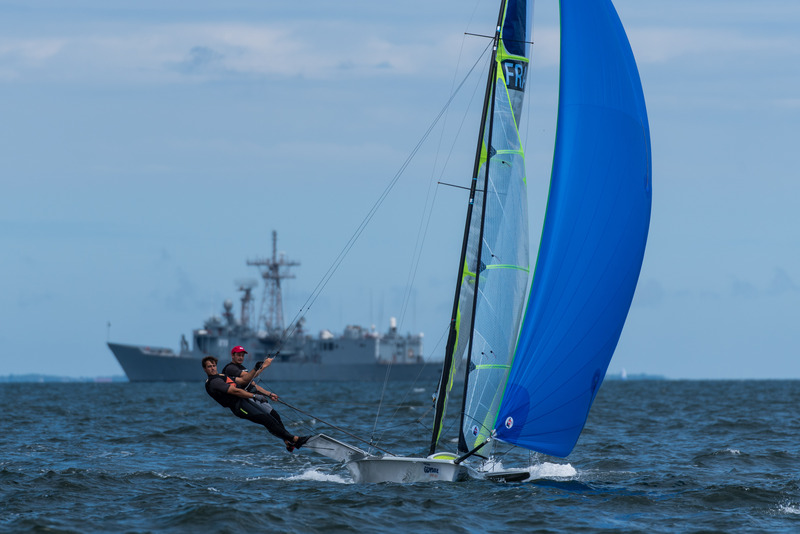 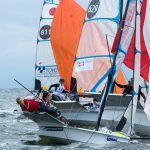 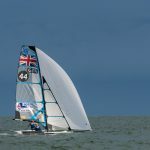 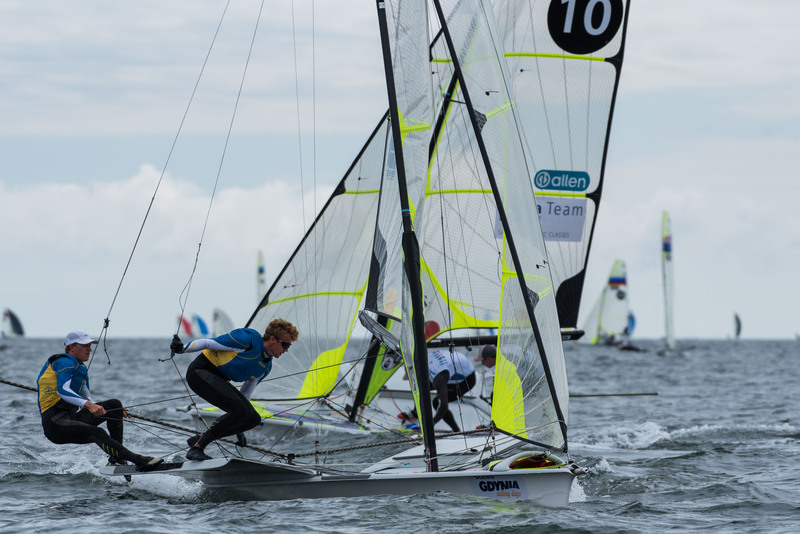 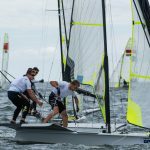 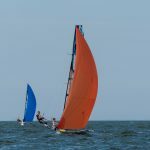 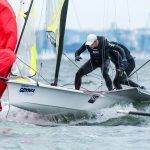 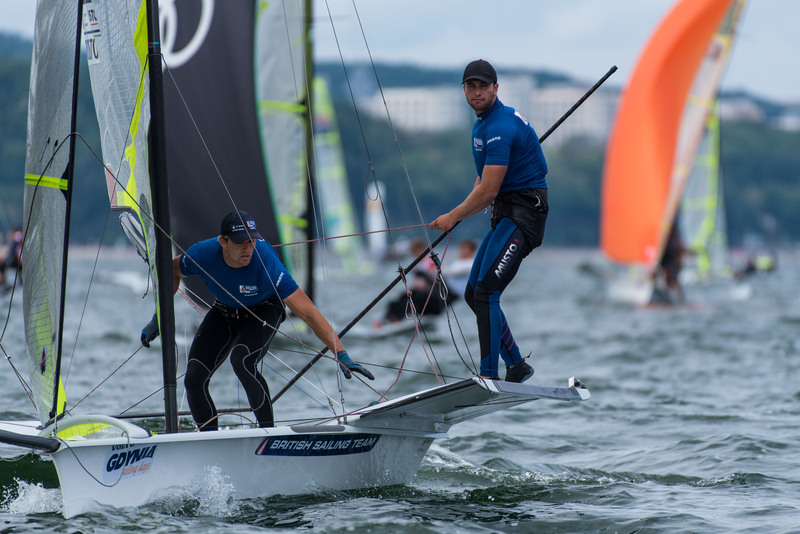 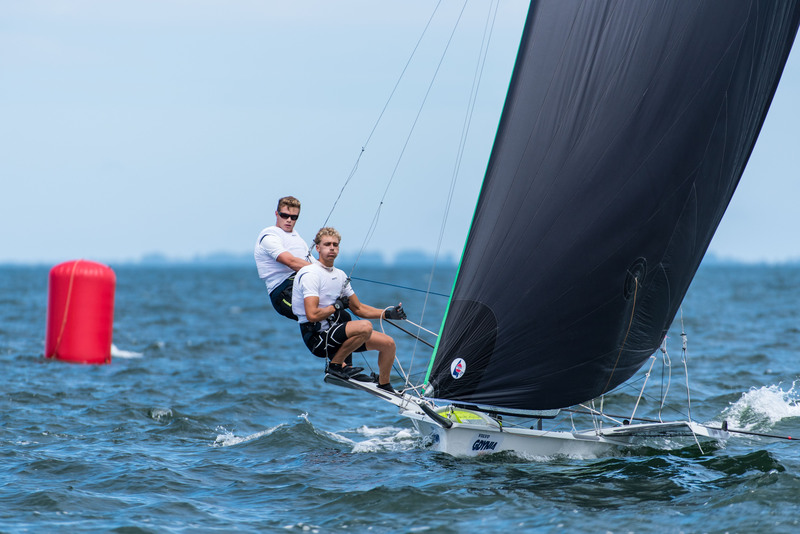 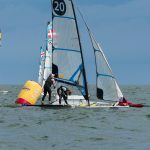 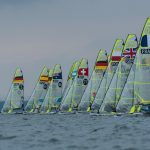 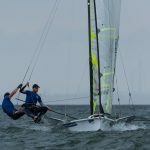 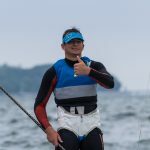 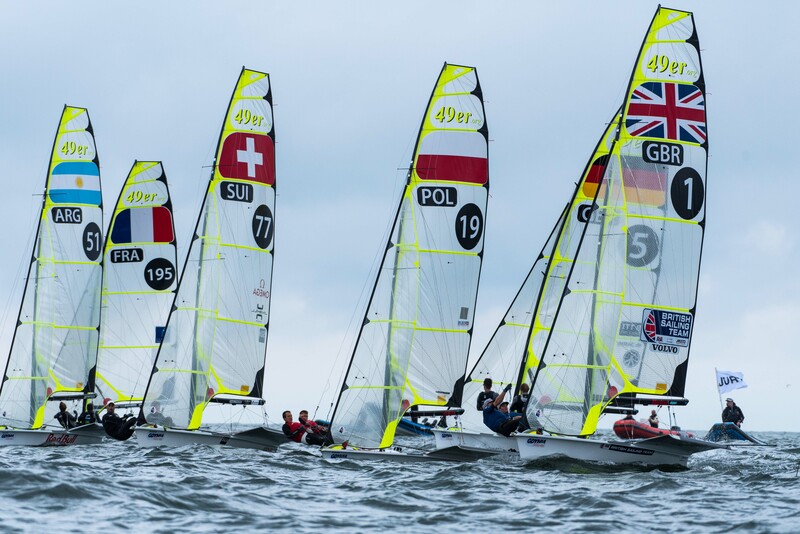 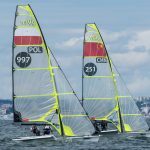 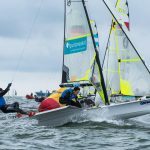 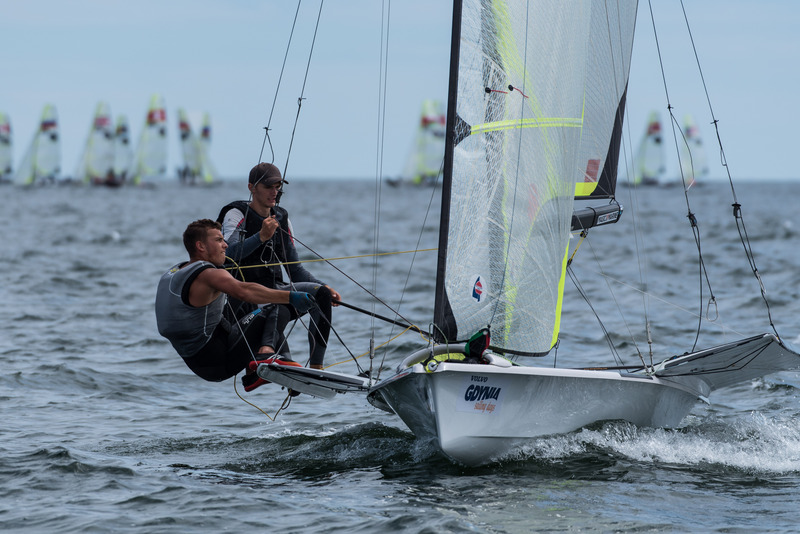 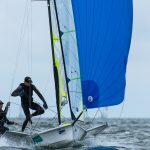 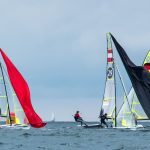 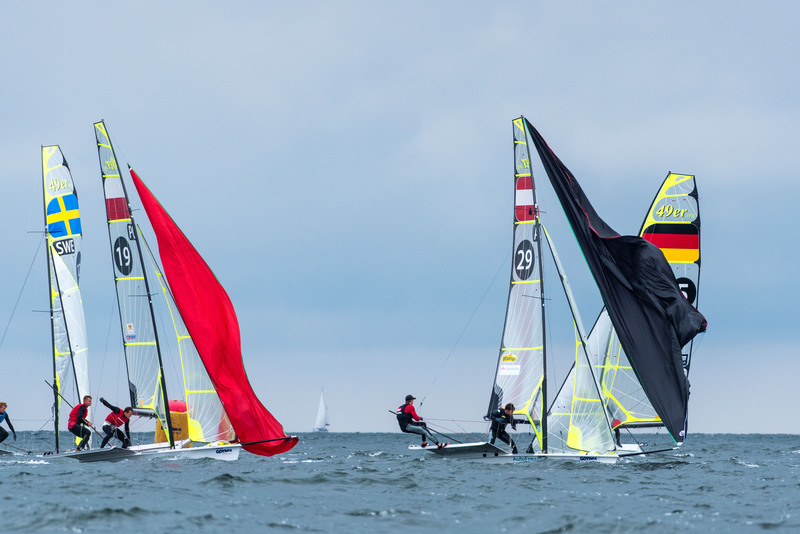 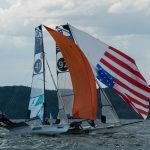 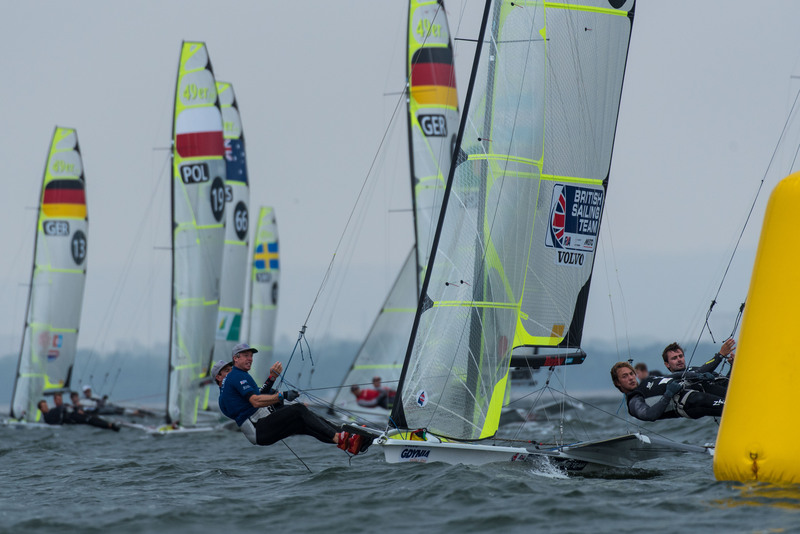 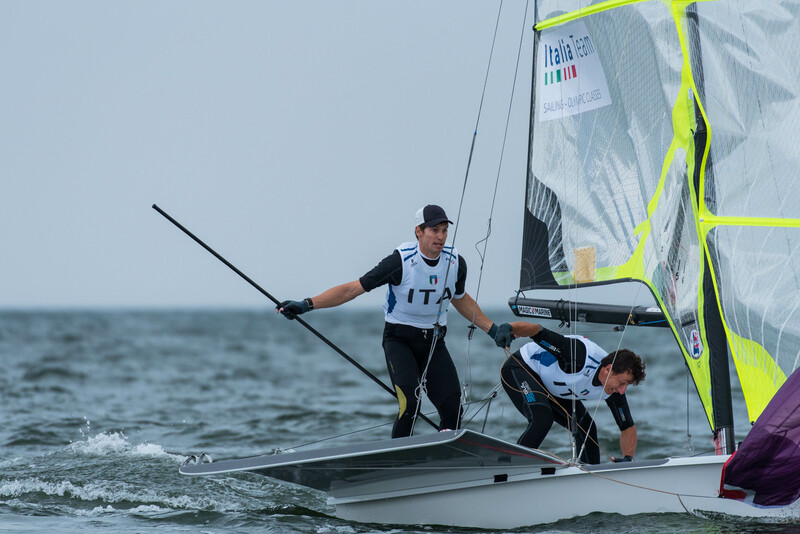 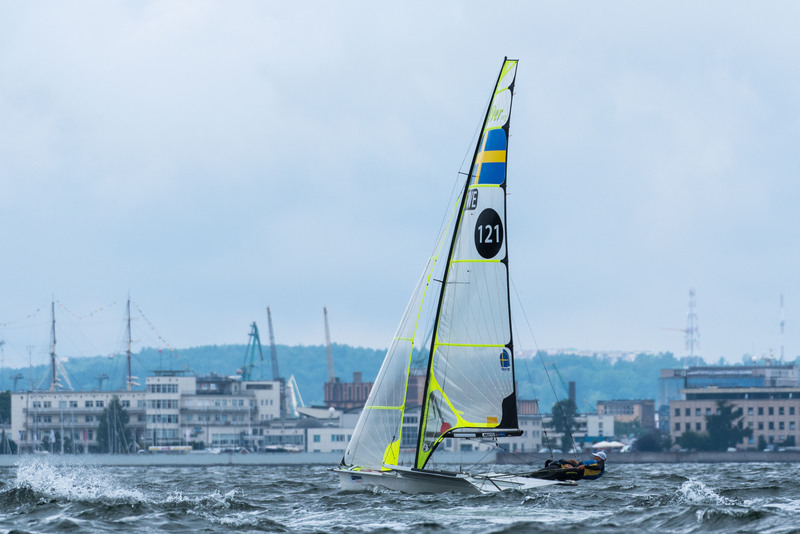 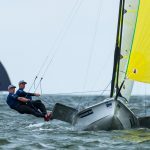 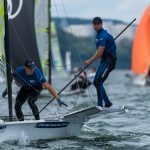 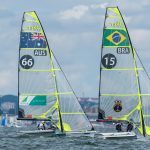 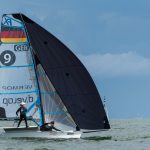 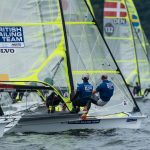 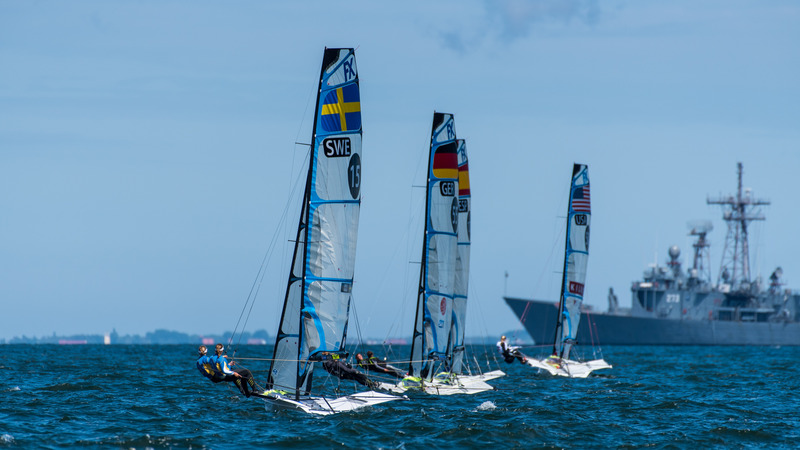 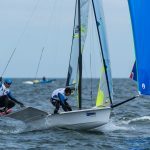 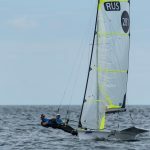 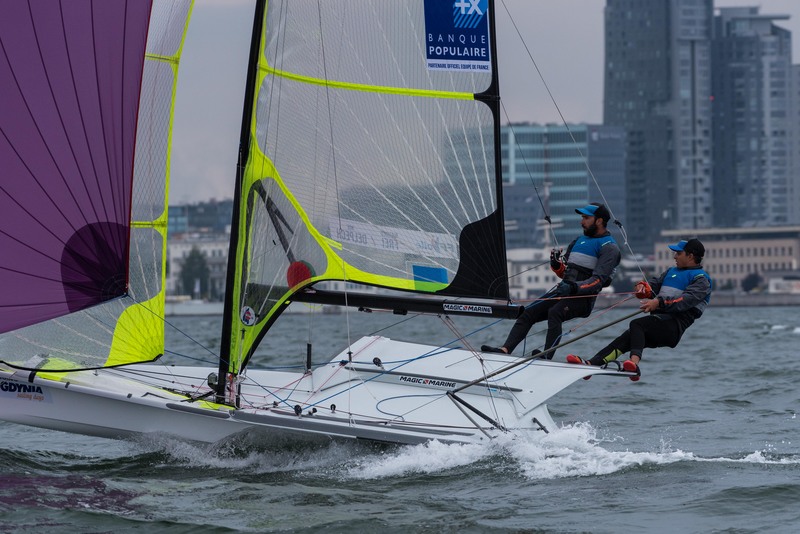 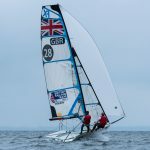 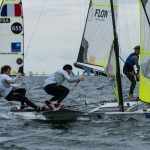 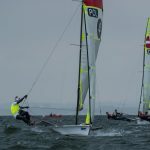 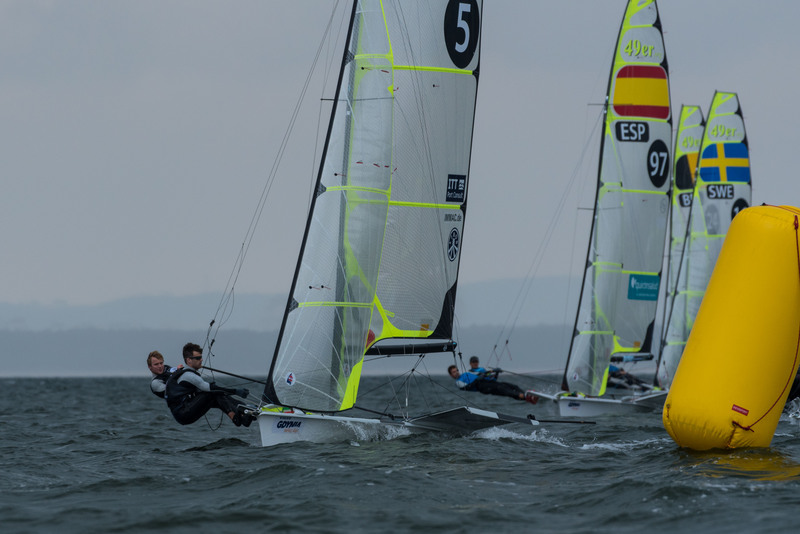 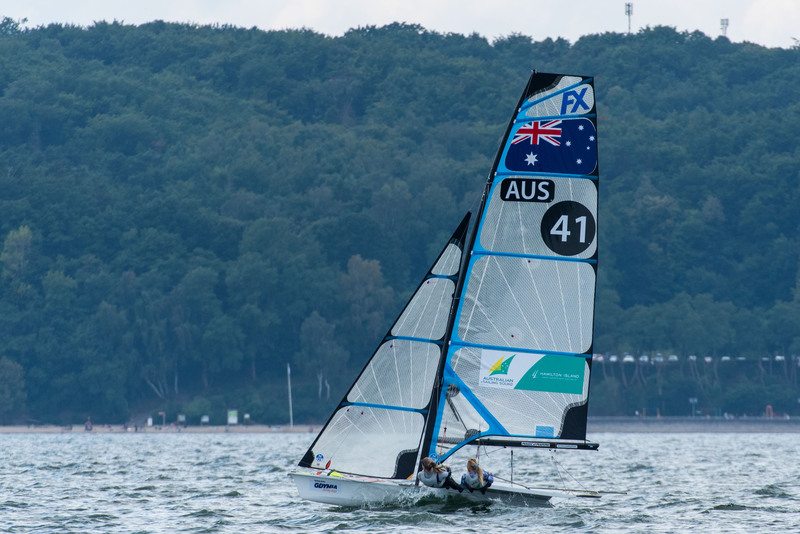 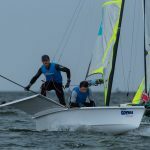 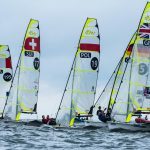 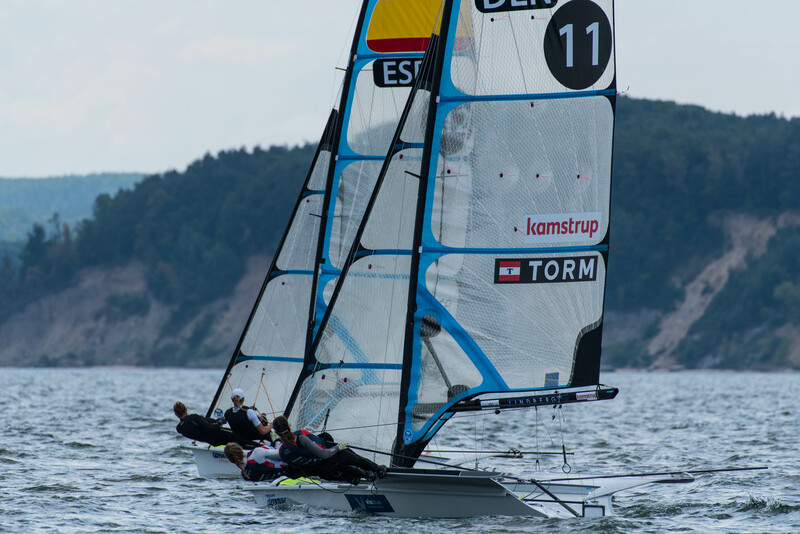 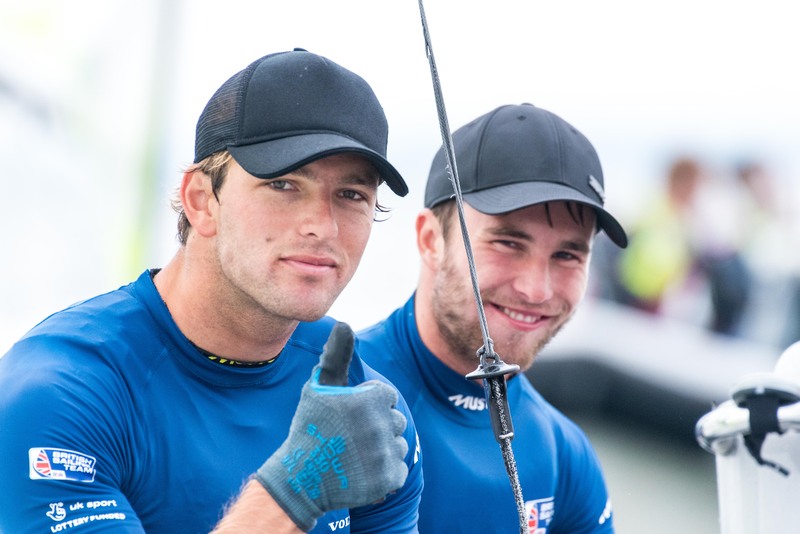 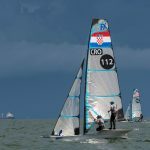 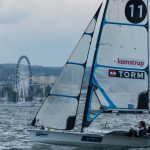 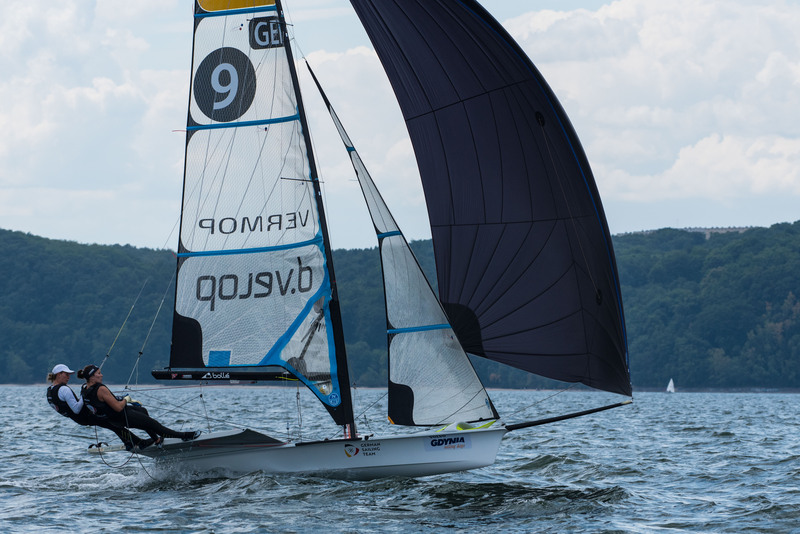 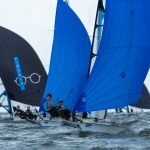 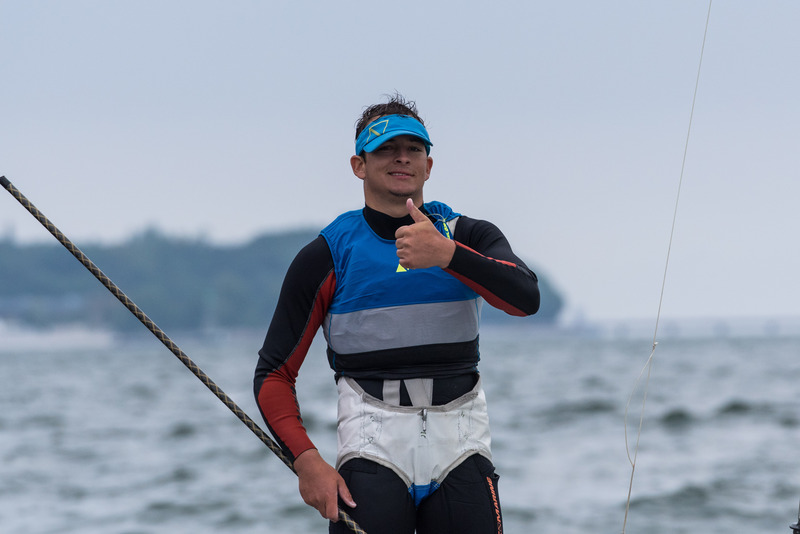 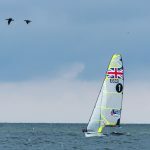 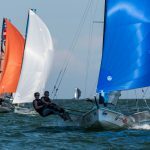 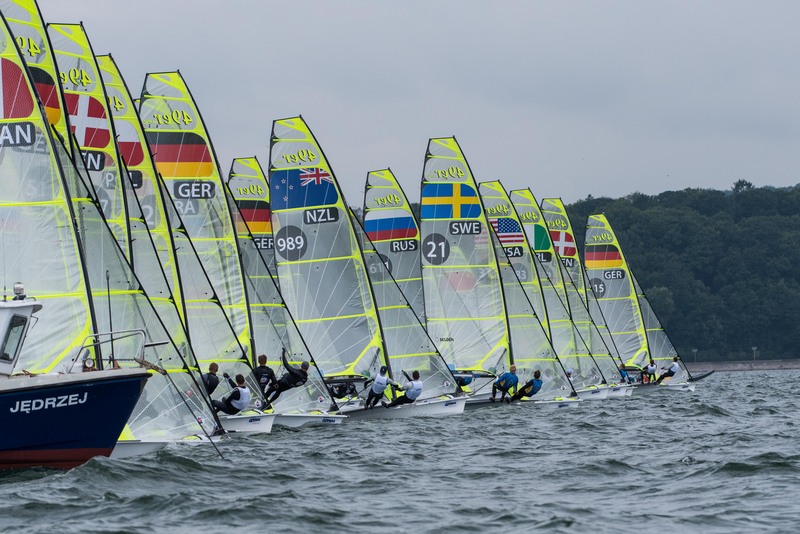 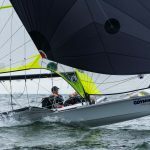 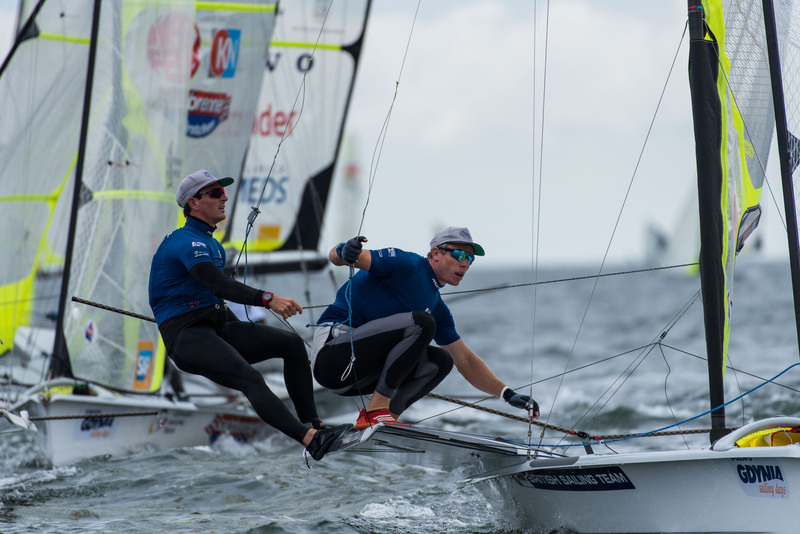 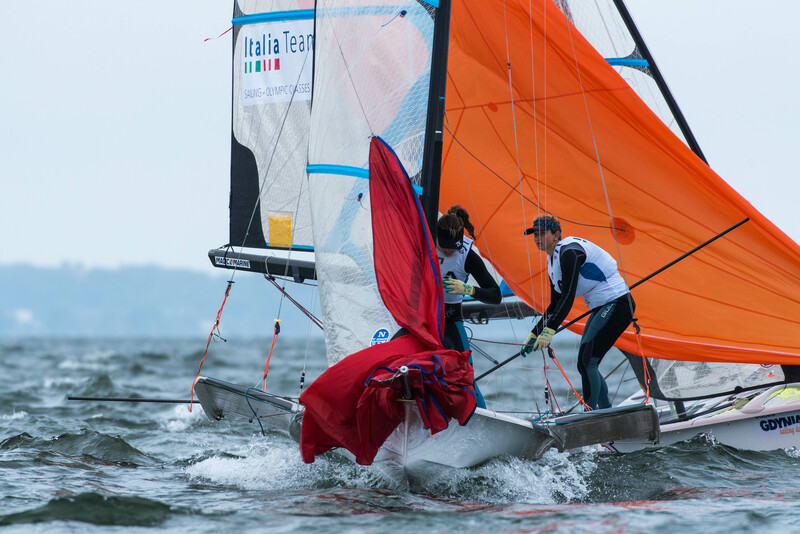 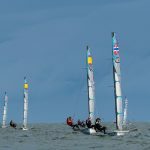 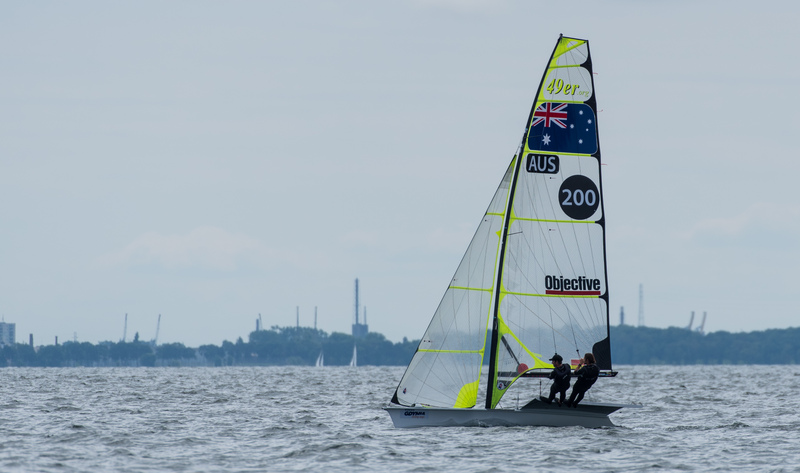 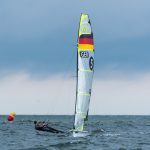 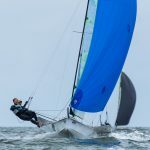 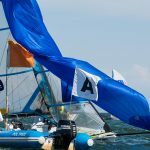 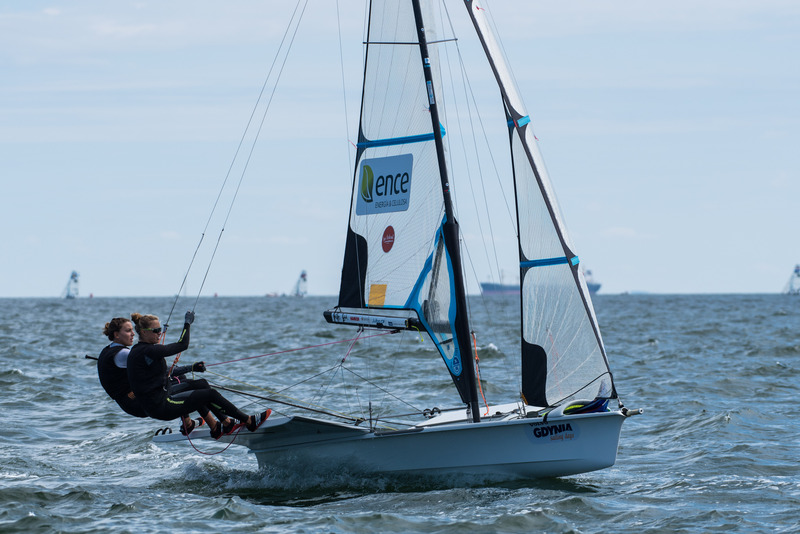 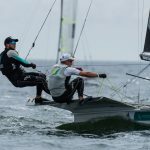 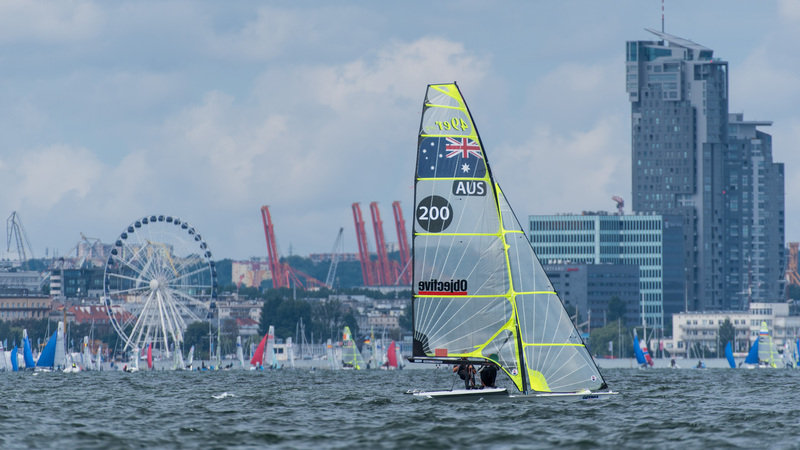 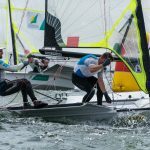 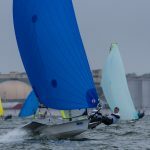 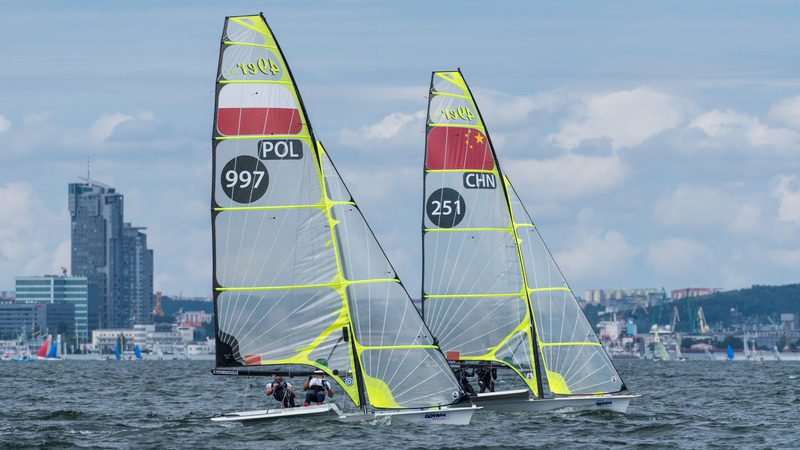 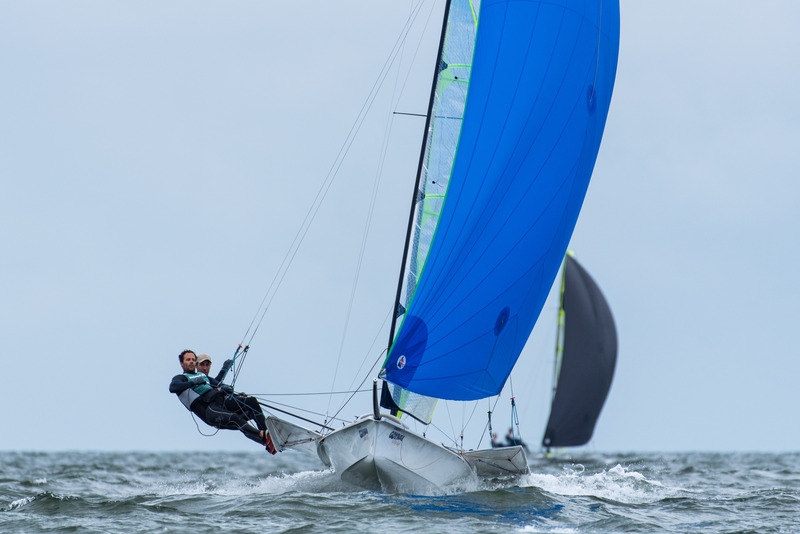 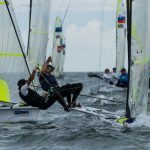 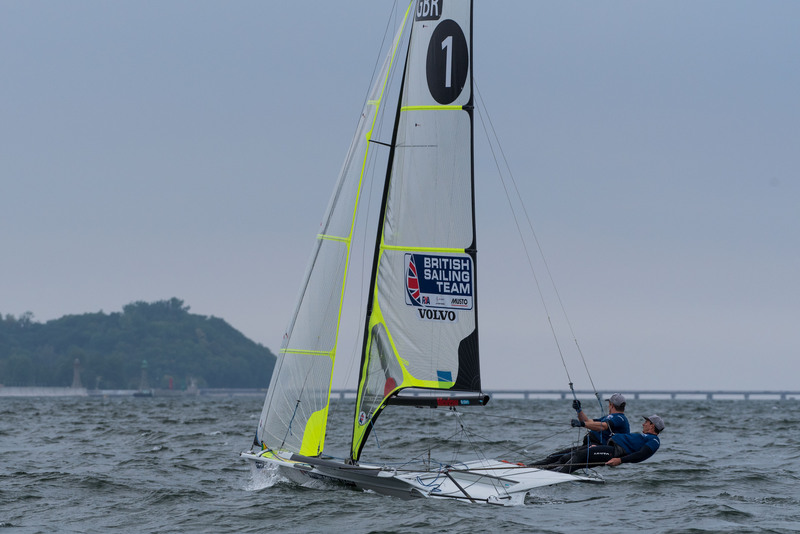 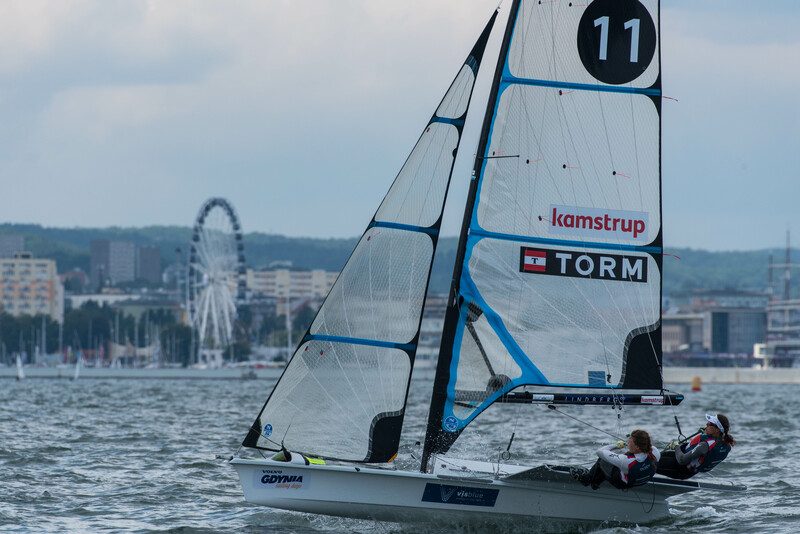 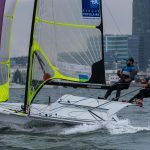 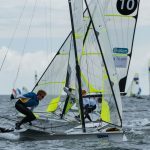 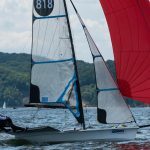 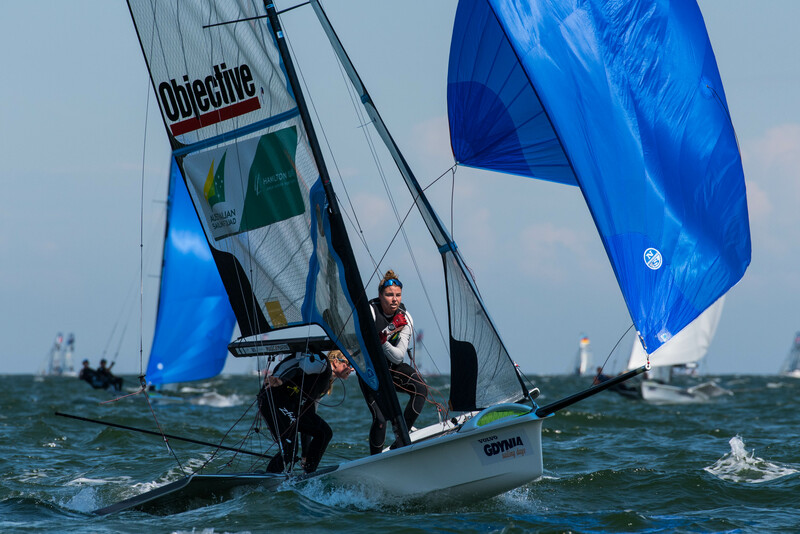 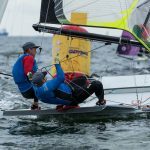 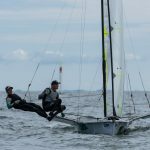 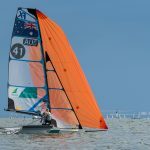 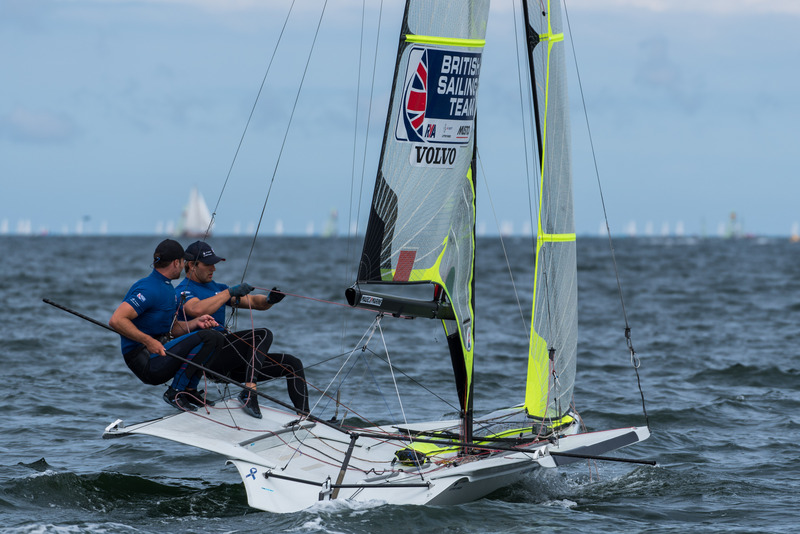 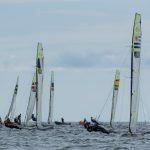 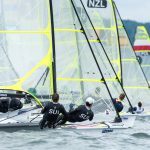 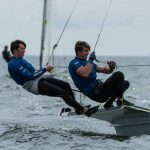 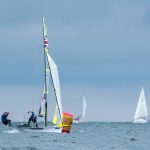 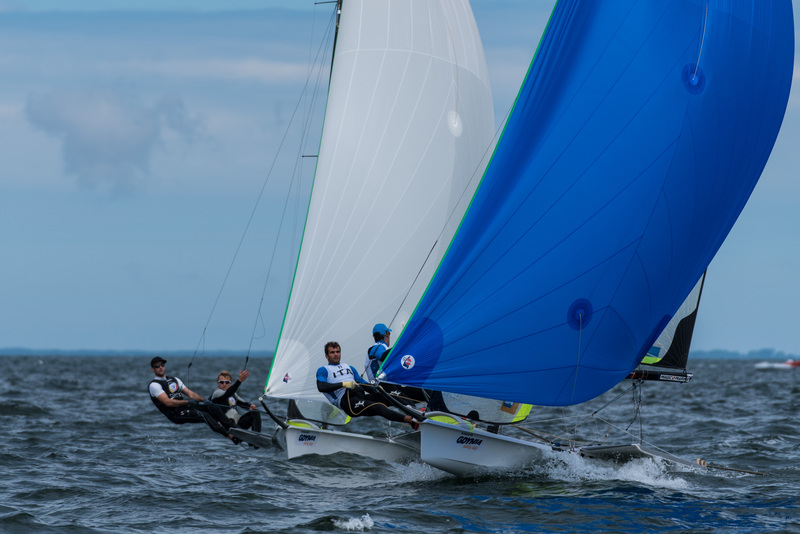 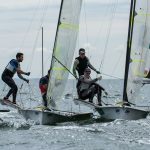 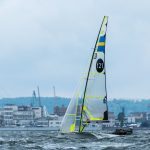 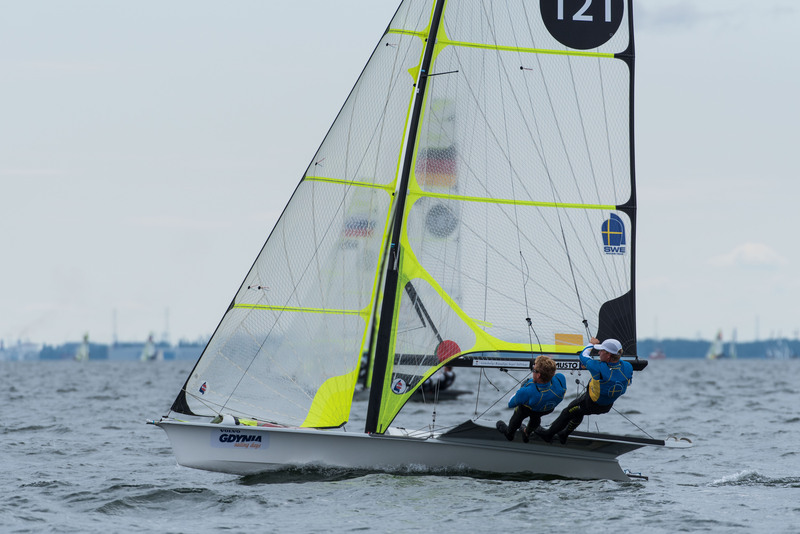 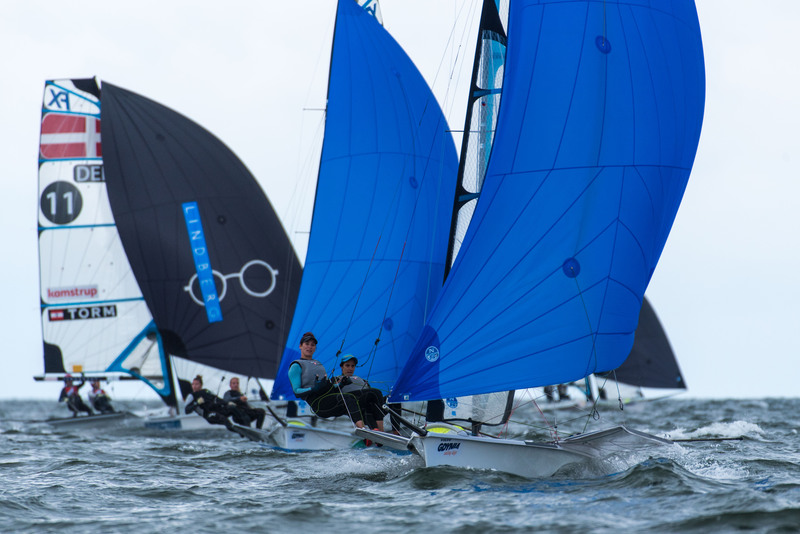 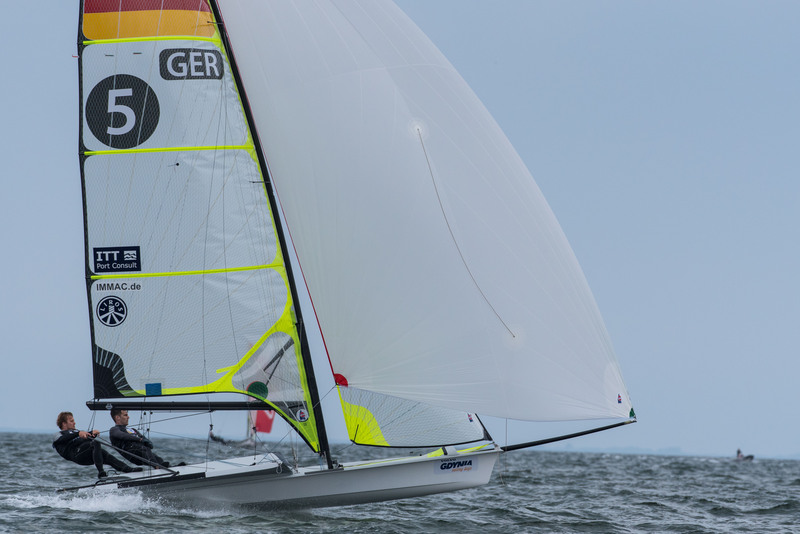 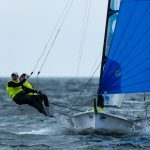 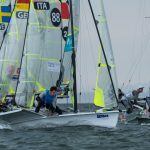 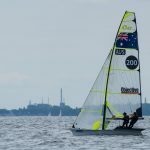 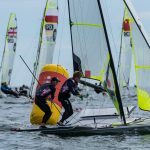 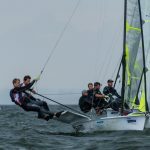 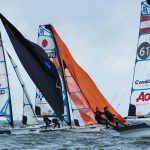 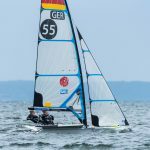 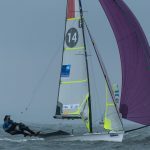 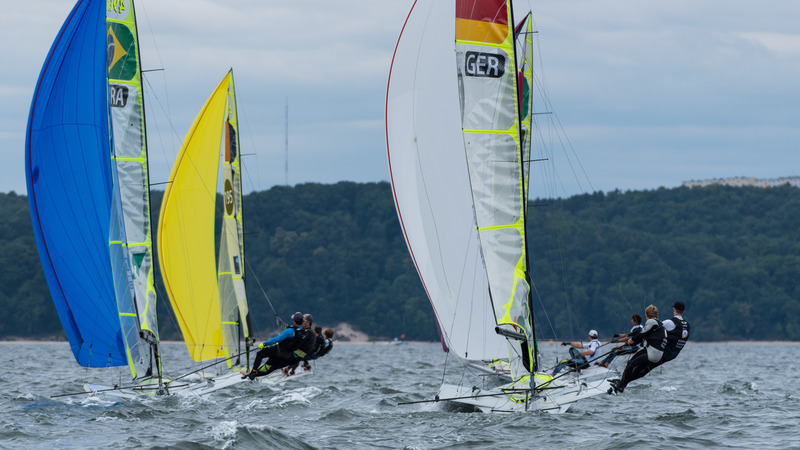 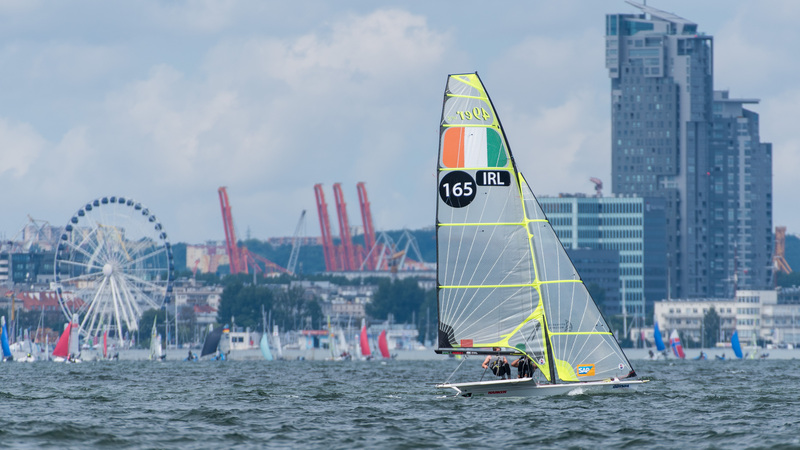 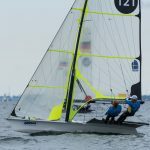 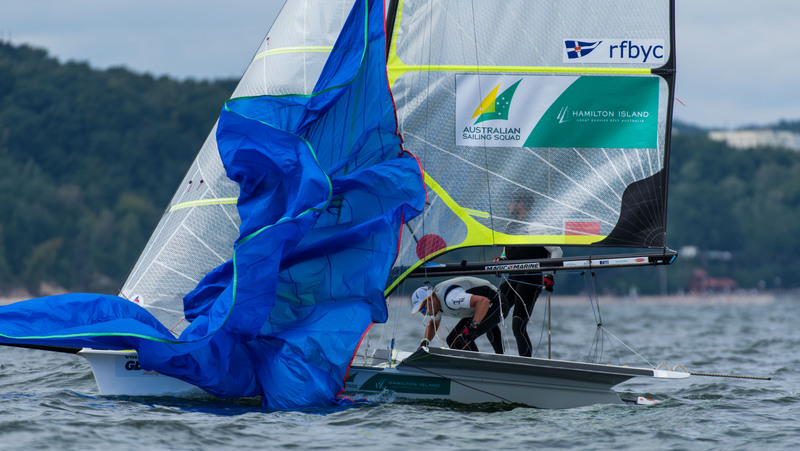 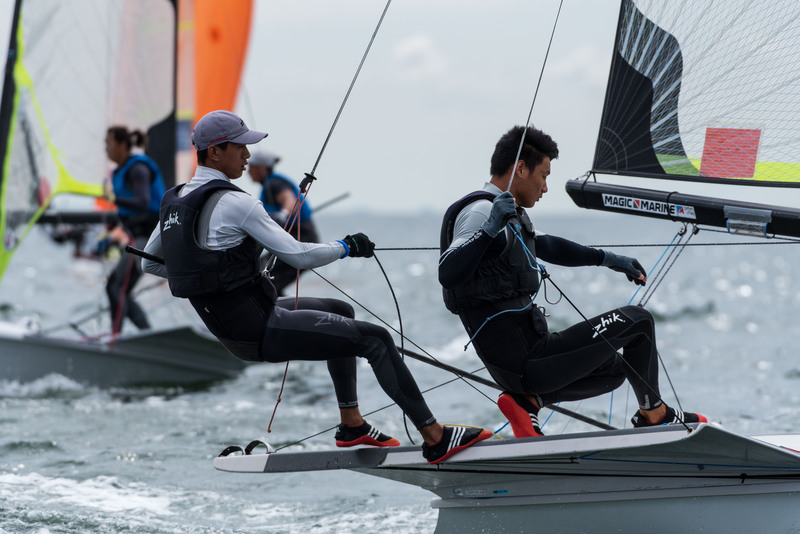 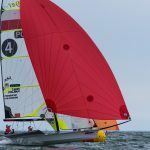 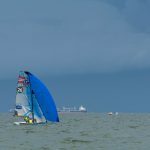 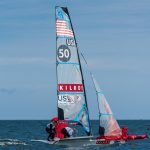 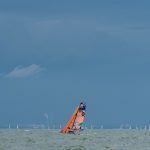 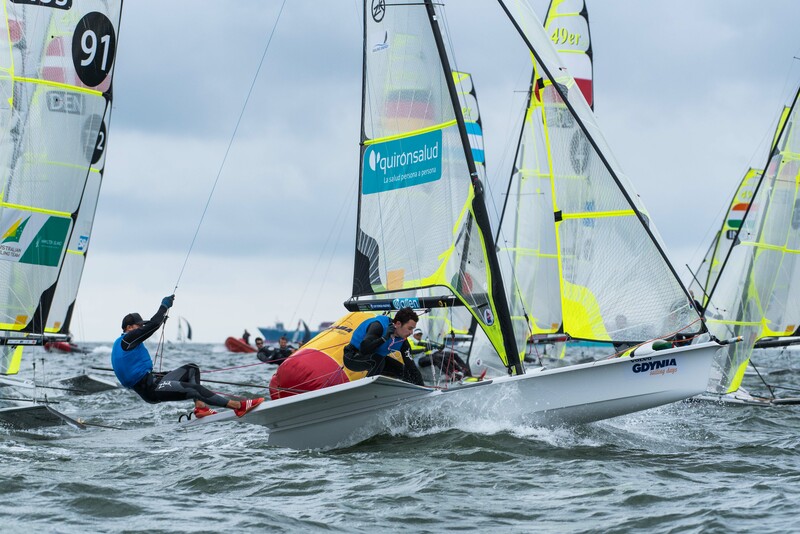 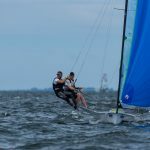 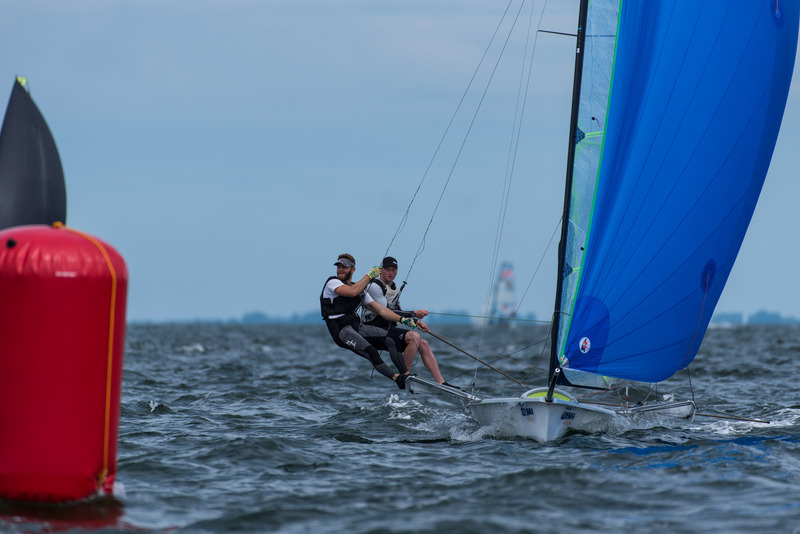 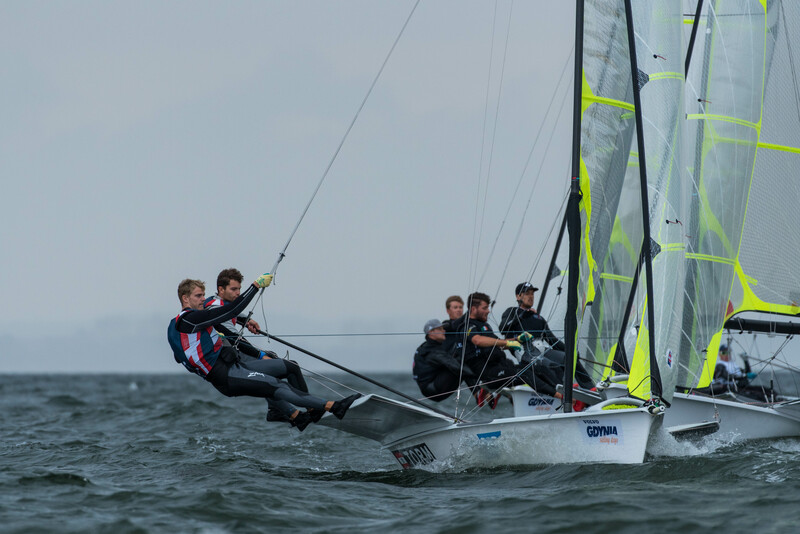 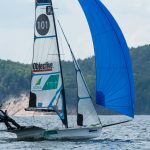 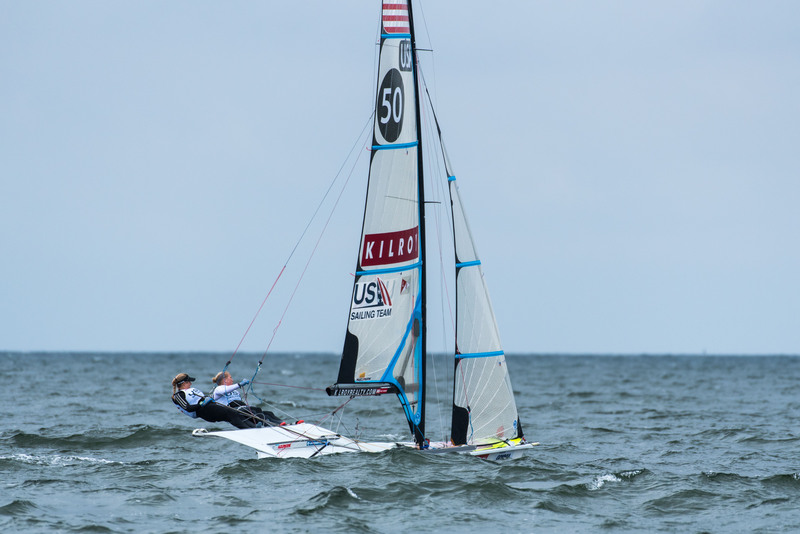 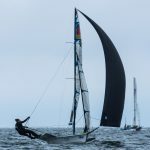 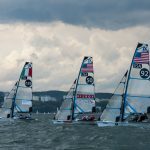 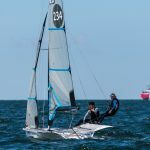 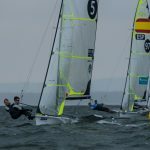 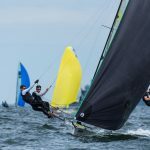 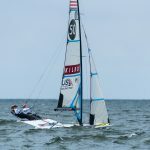 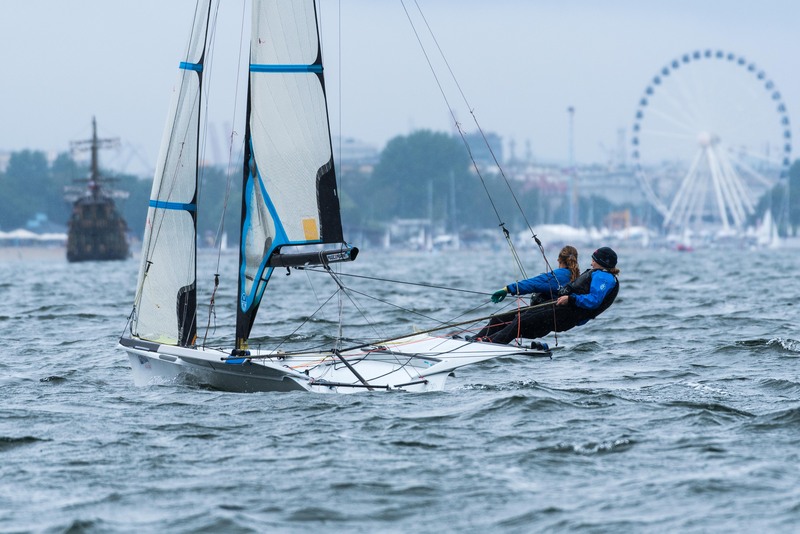 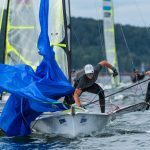 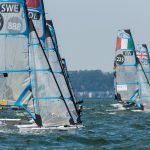 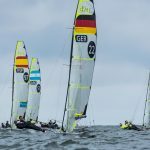 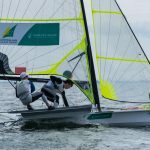 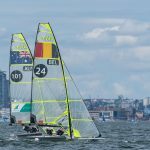 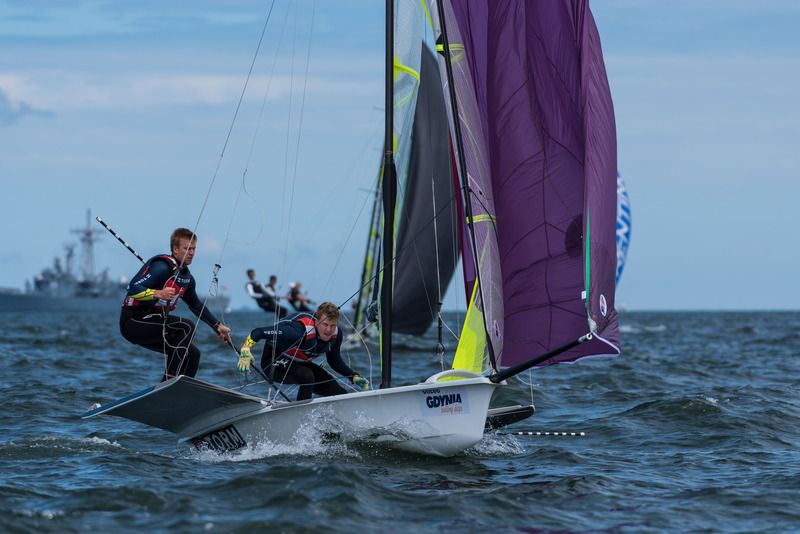 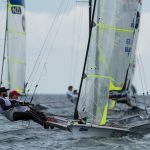 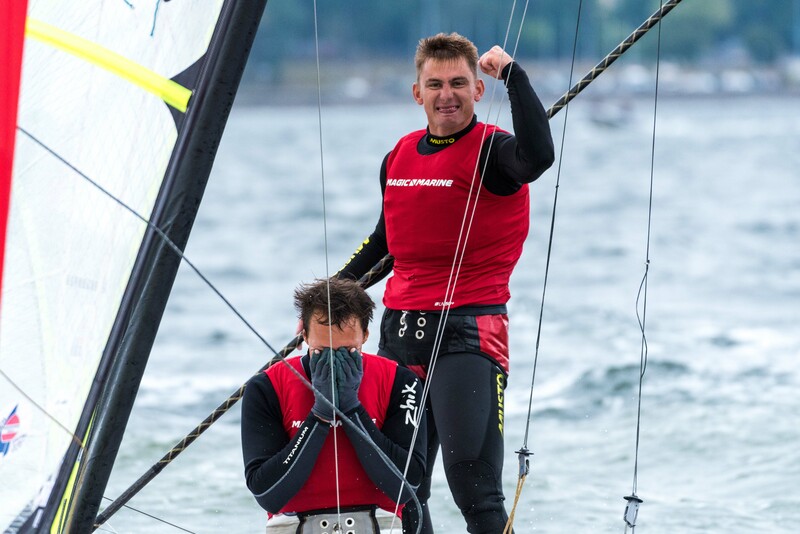 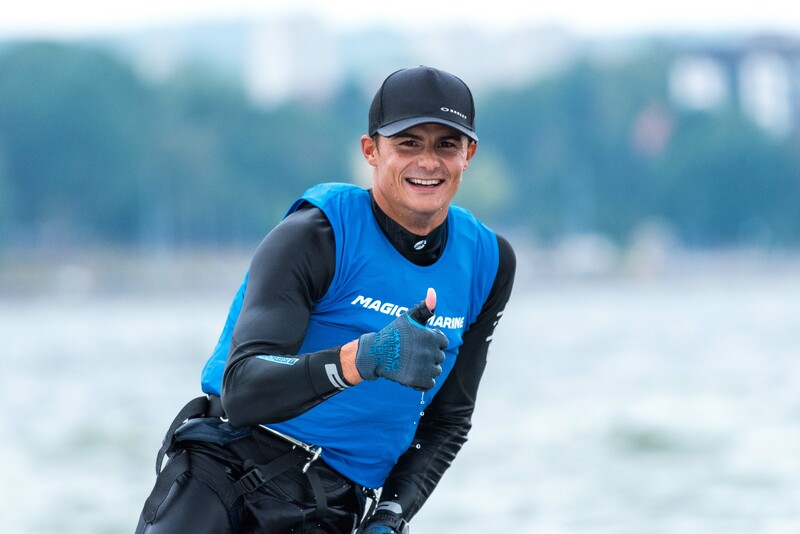 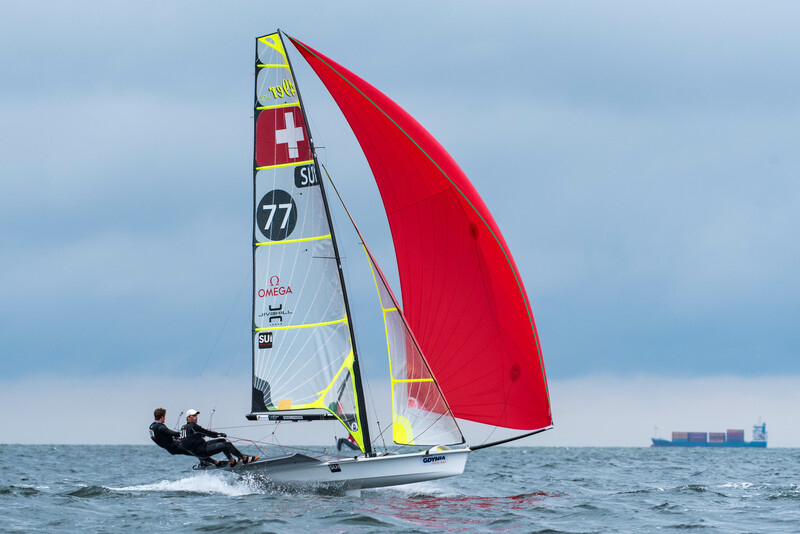 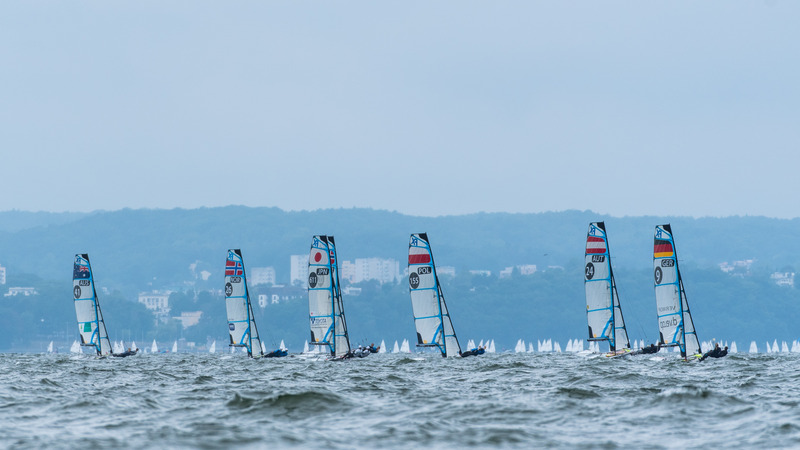 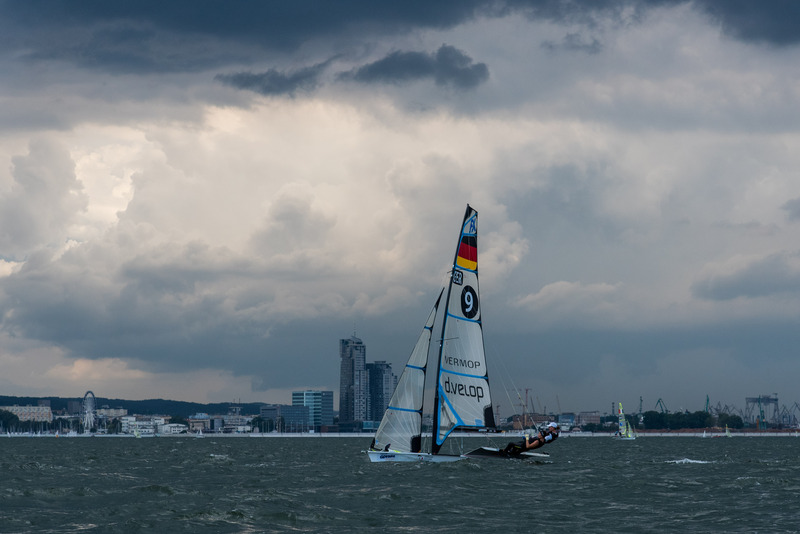 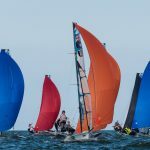 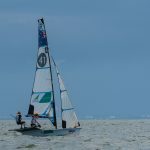 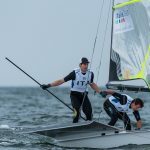 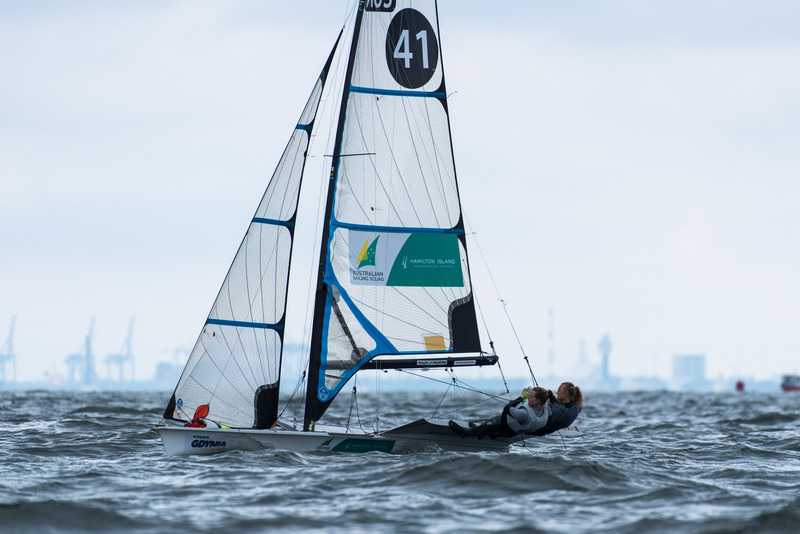 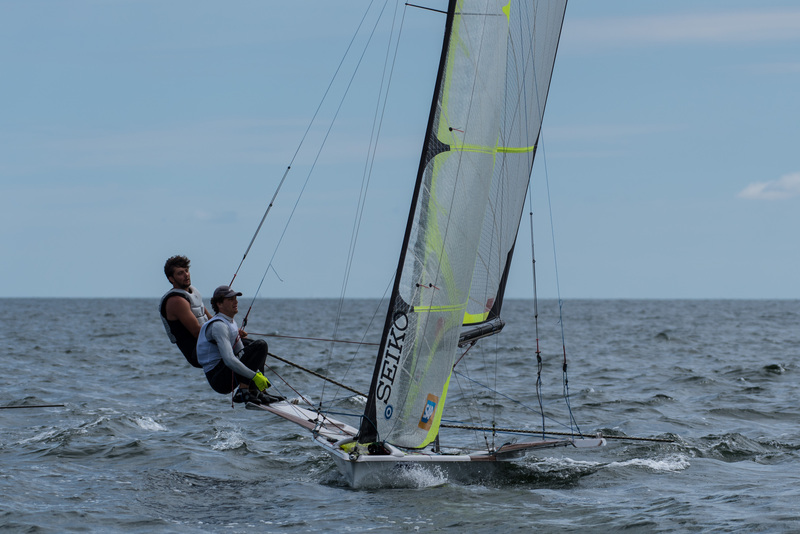 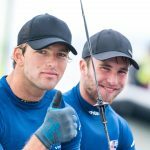 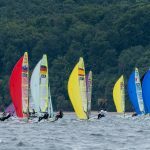 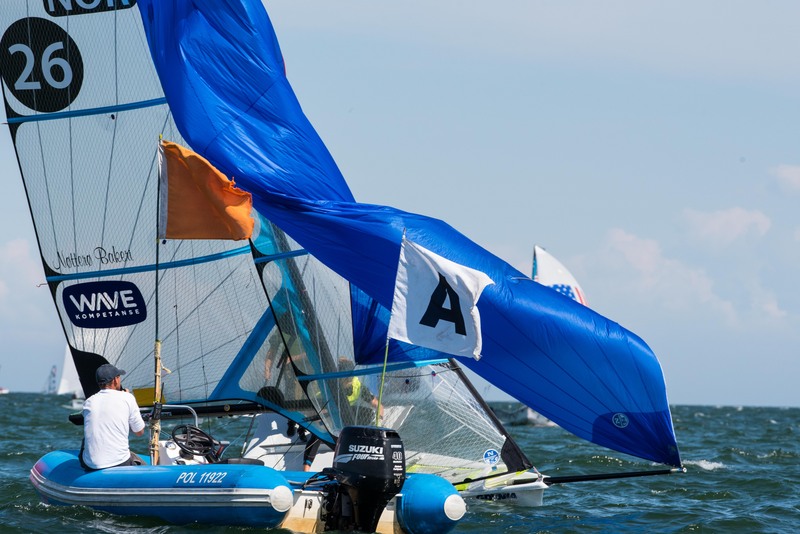 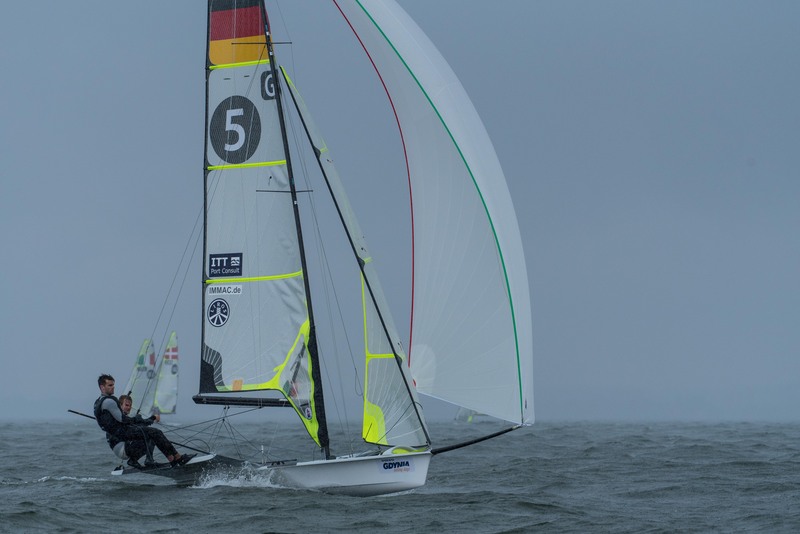 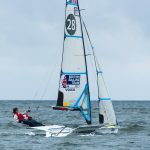 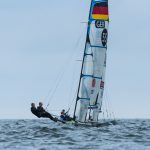 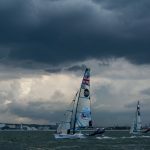 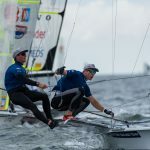 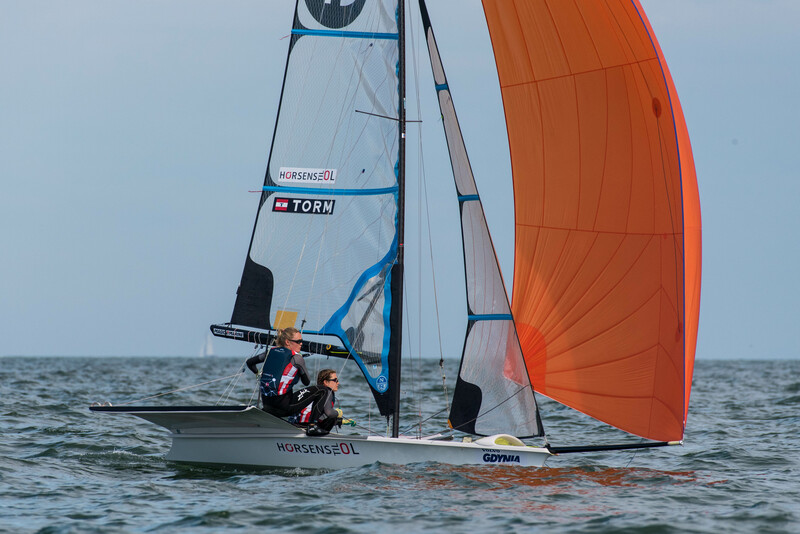 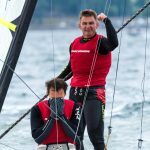 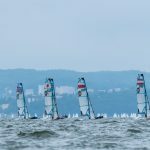 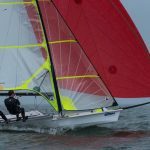 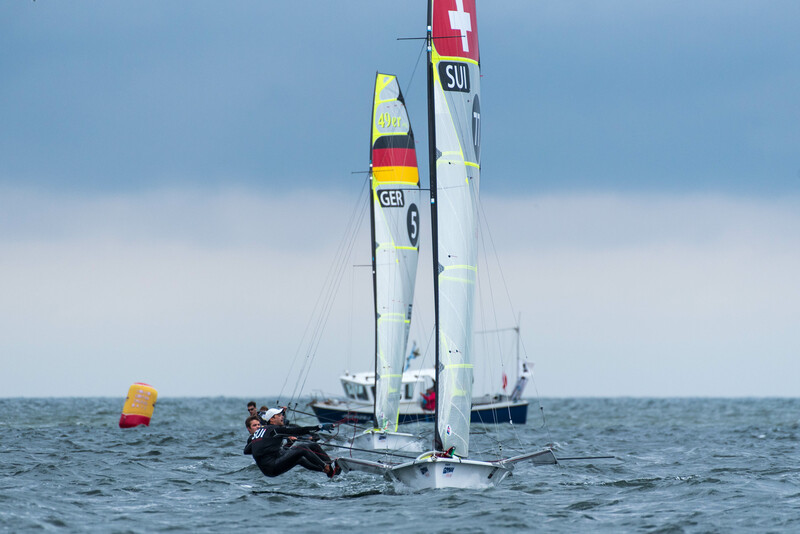 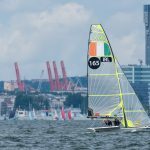 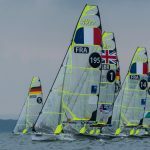 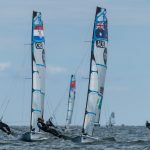 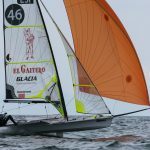 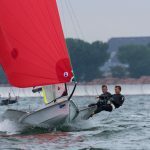 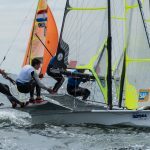 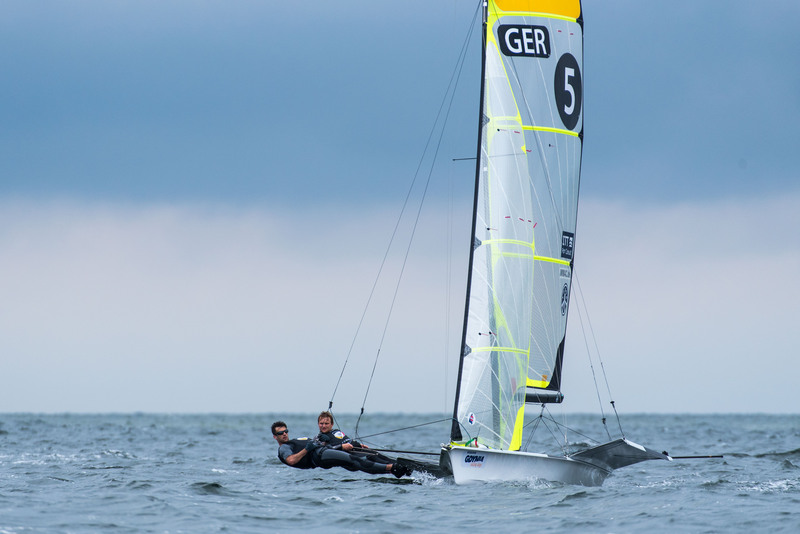 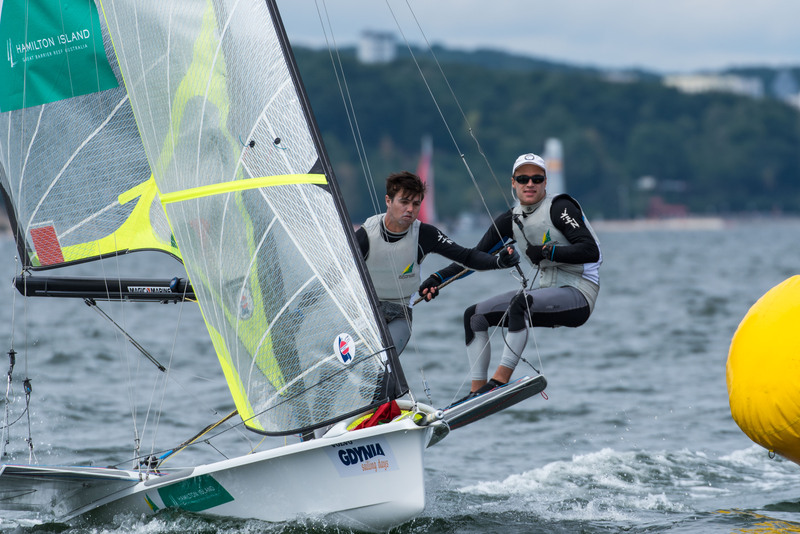 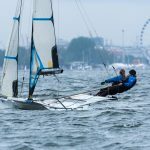 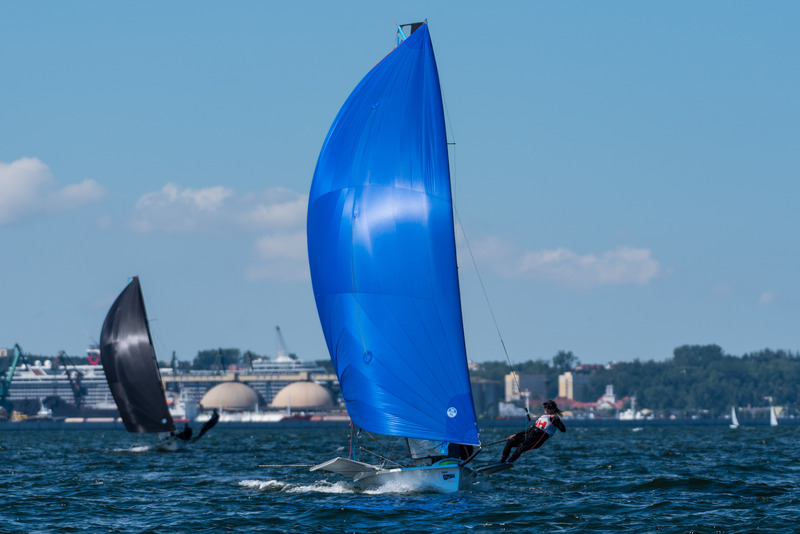 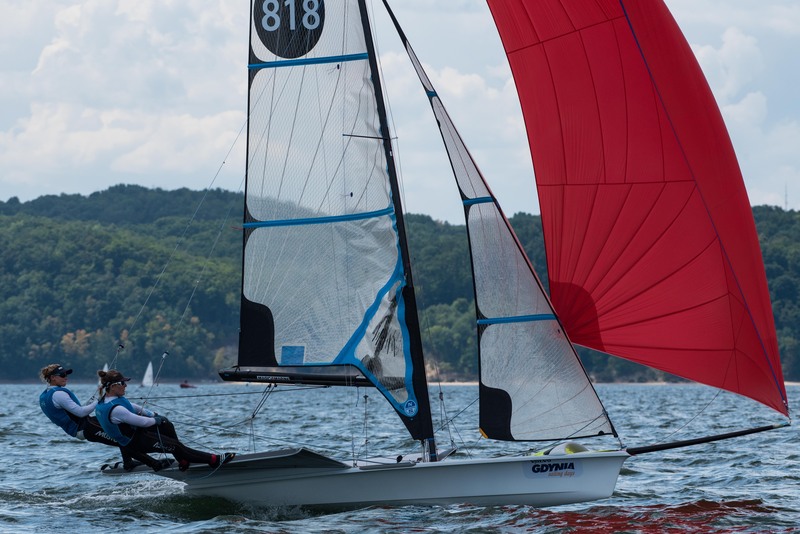 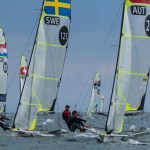 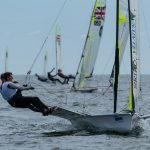 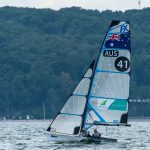 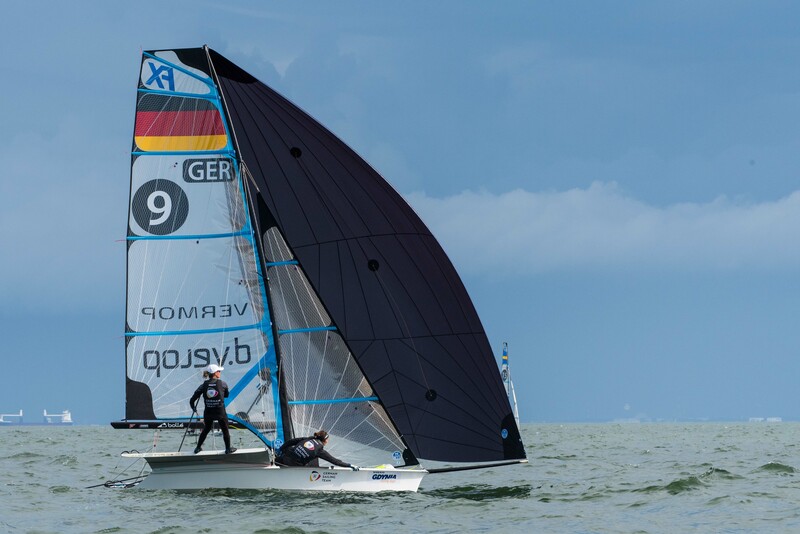 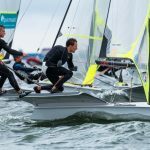 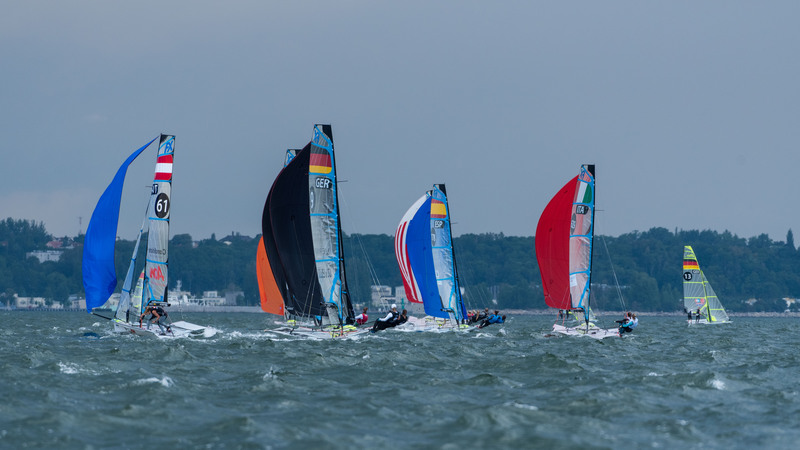 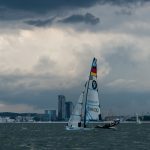 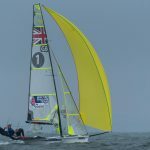 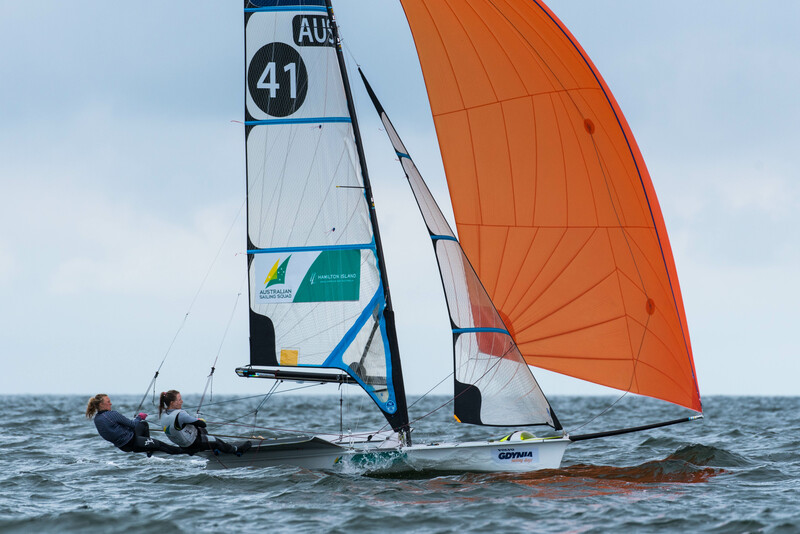 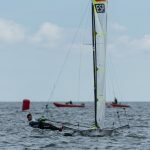 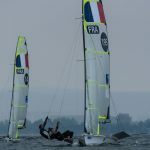 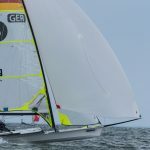 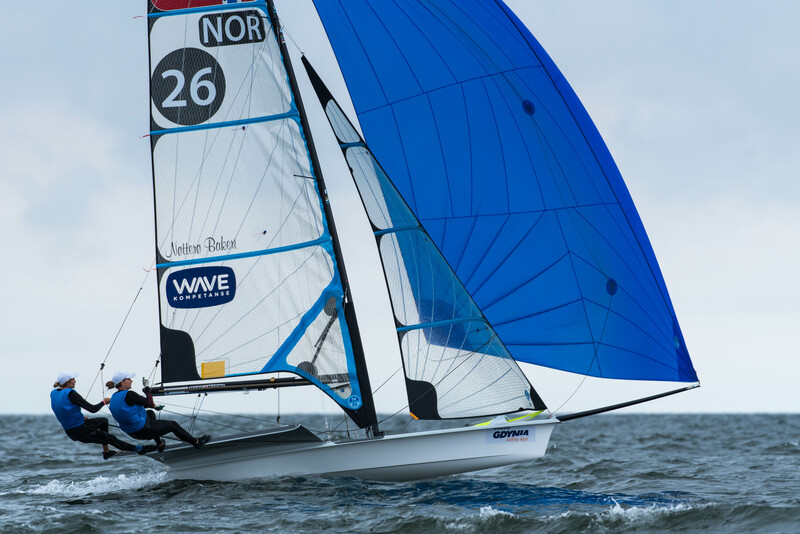 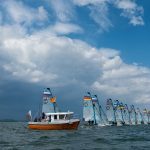 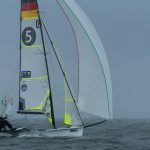 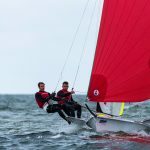 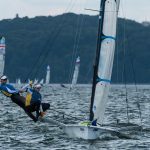 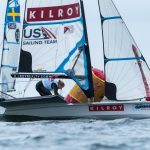 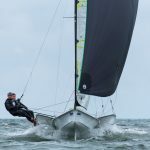 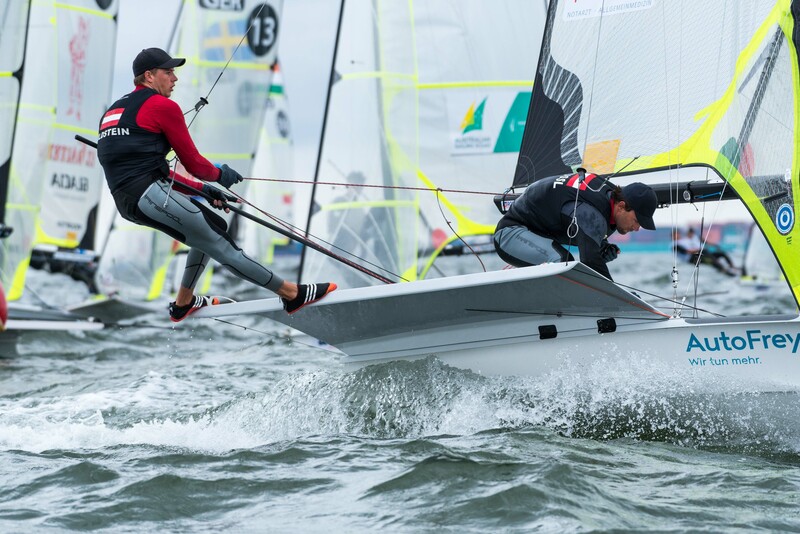 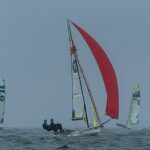 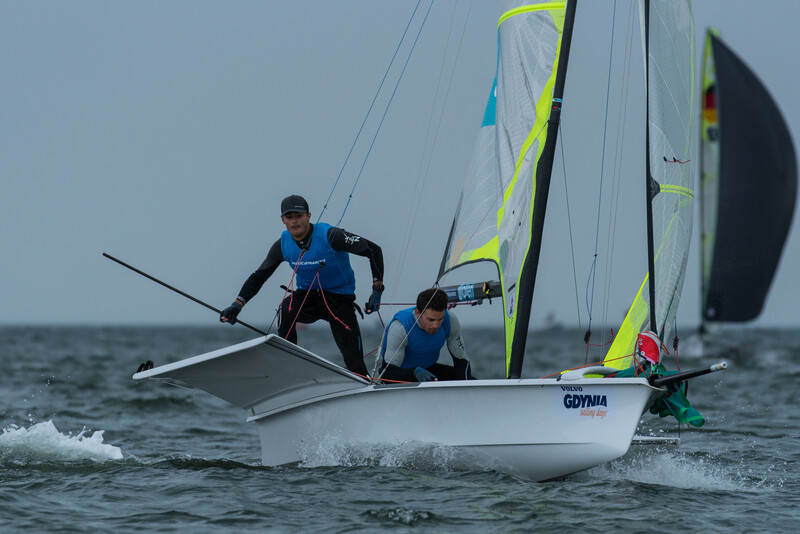 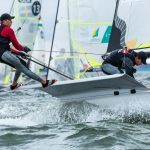 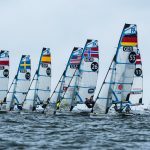 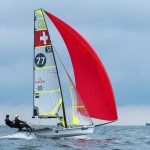 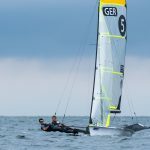 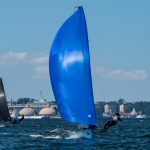 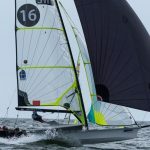 Kieler Woche was not so kind to them with a host of letter scores sending them out of the top ten, but they are sure to be in the mix this week. 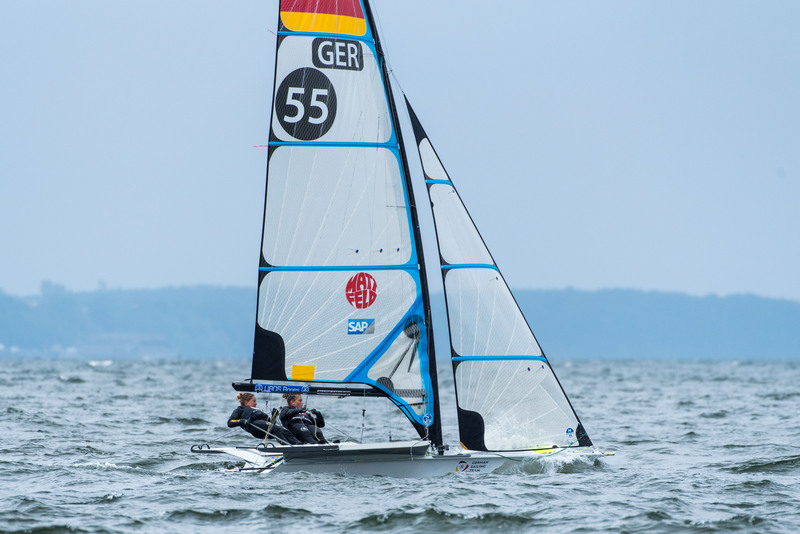 Also contending are last years European Champions, Tina Lutz and Susan Beucke of Germany. 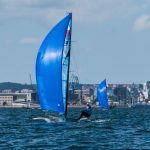 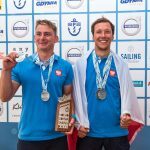 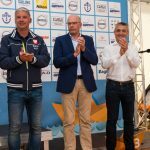 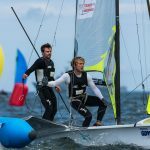 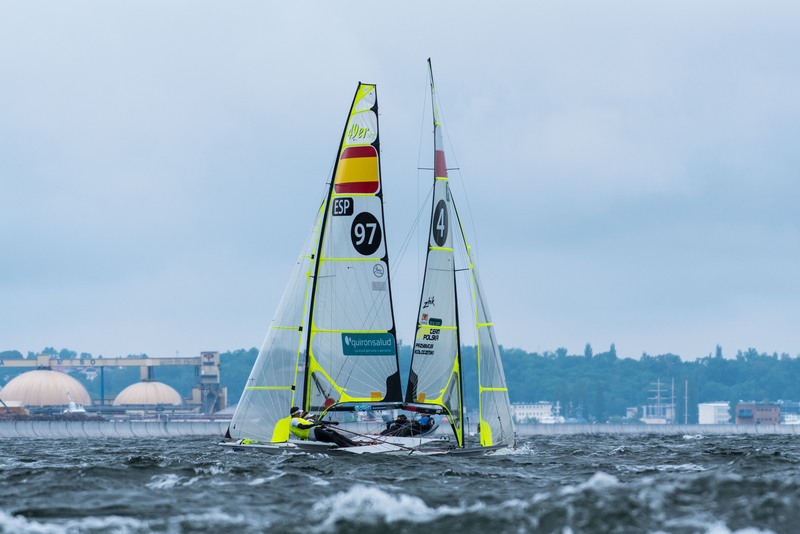 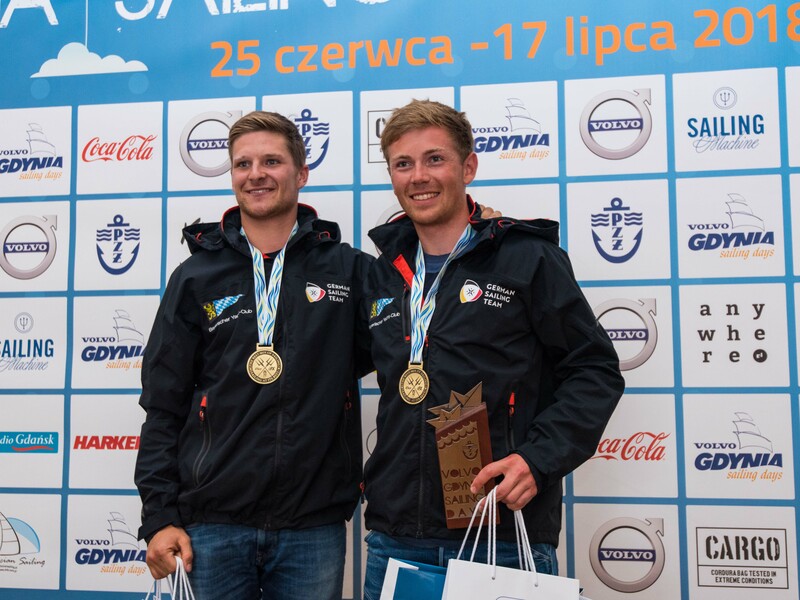 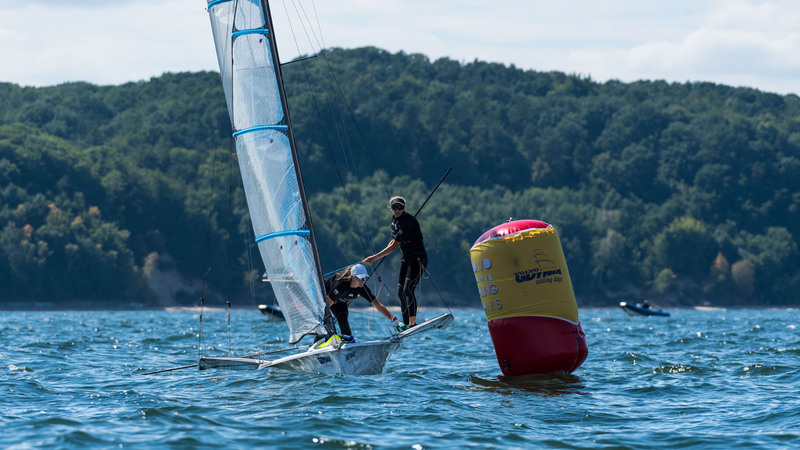 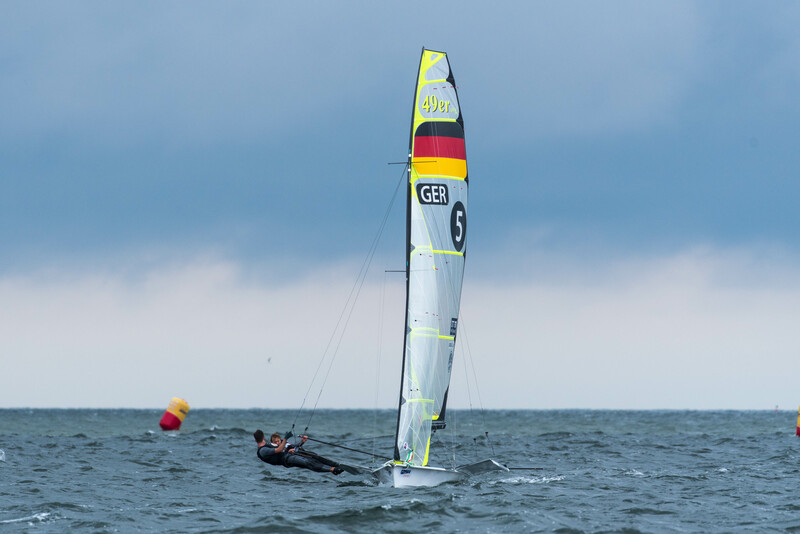 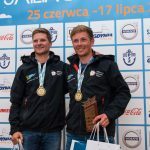 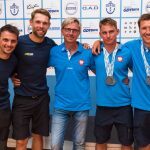 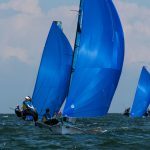 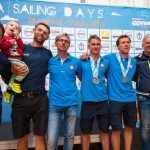 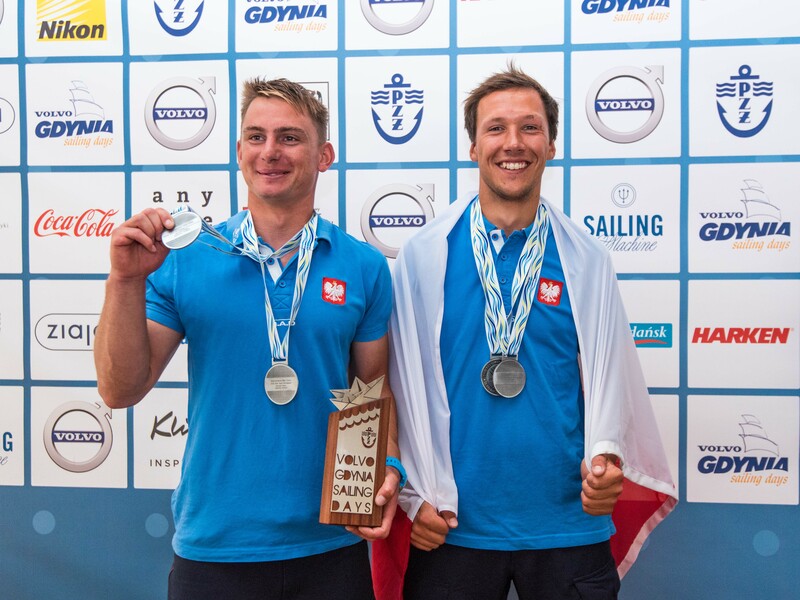 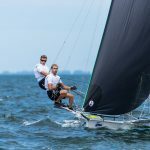 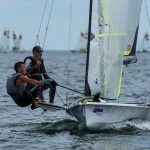 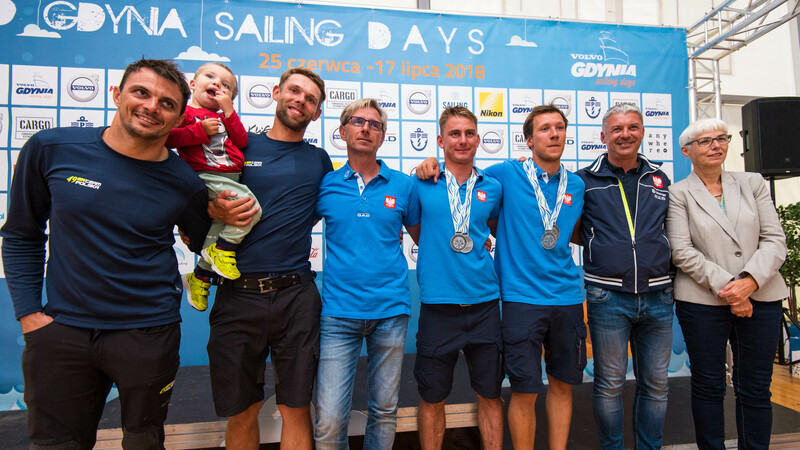 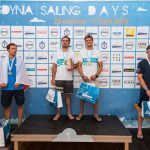 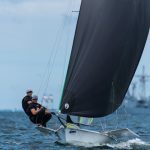 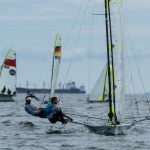 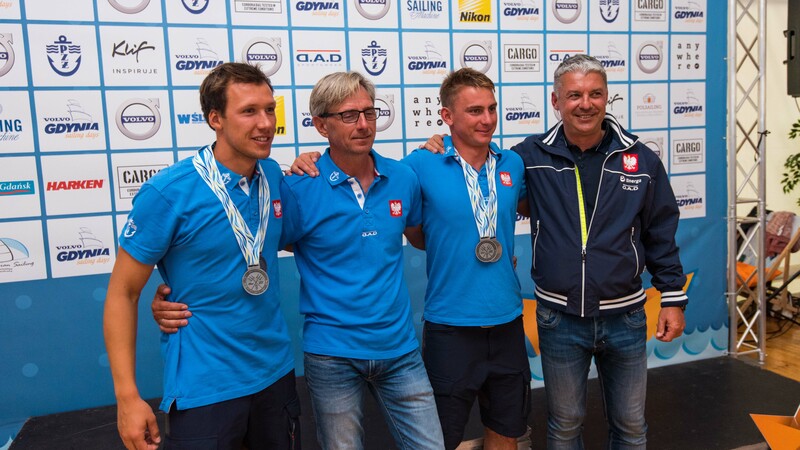 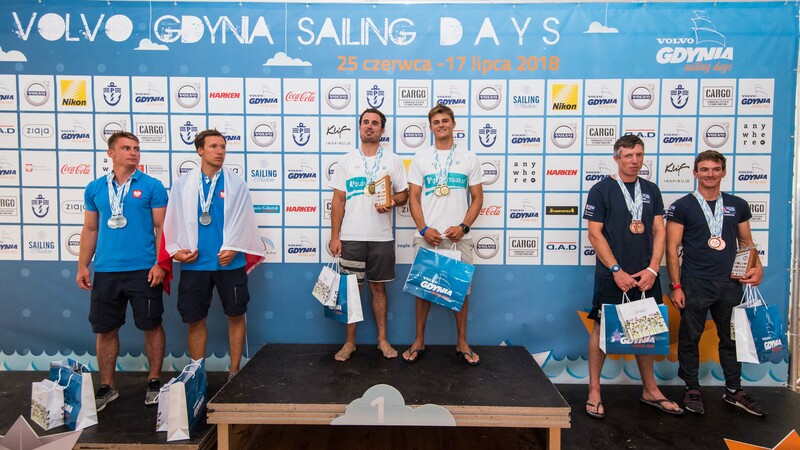 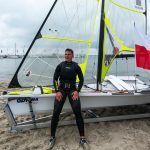 On home water last week in Kieler Woche they finished in second place, and with Gdynia just a few hundred kilometers down the coast they may find favor in similar waters to home. 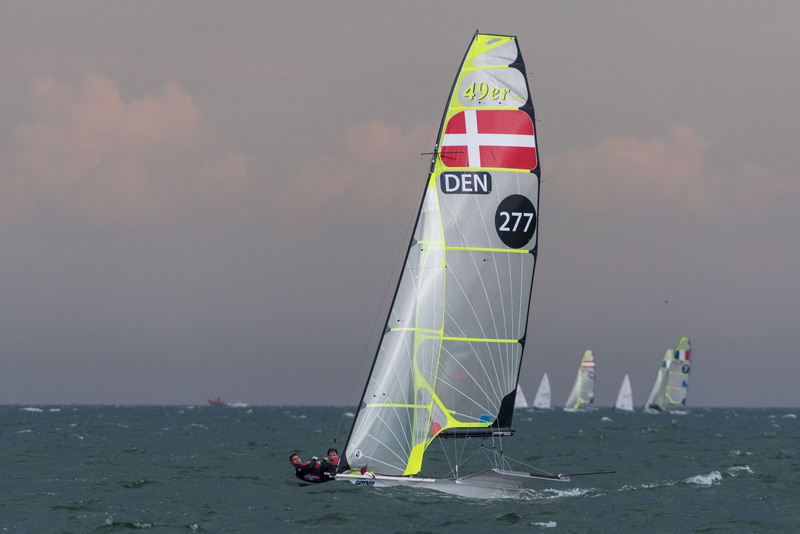 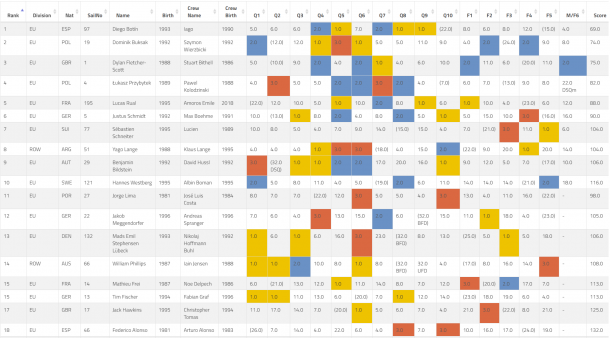 Both the Danish and Germans also have teammate/rivals in contention for the Championship. 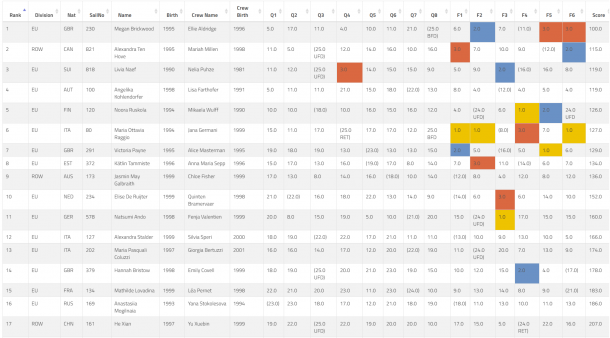 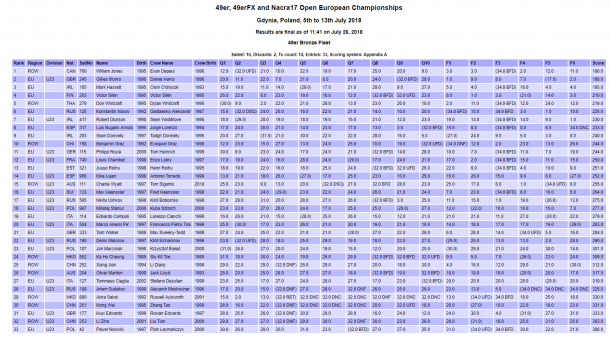 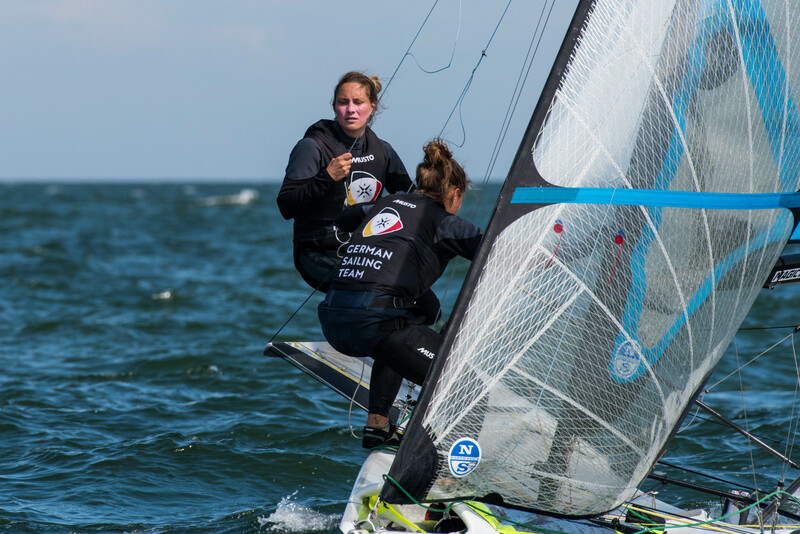 Anne-Julie Schutt with Iben Niesby (DEN) and Vicky Jurczok with Anika Llorenz (GER) are each critical pieces in how their countrywomen earned previous European titles, and would like nothing better than to take a major title for themselves. 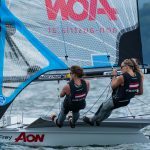 Each have had major successes in the recent past, with Schutt taking second place at the 2016 Worlds, and Vicky/Anika taking a number of World Cup titles in 2017. 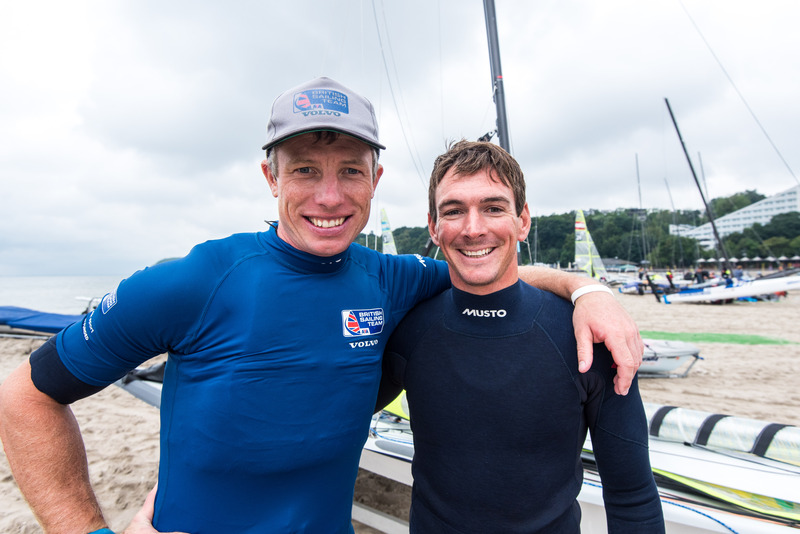 Neither have won a regatta yet this year, so this could be their chance. 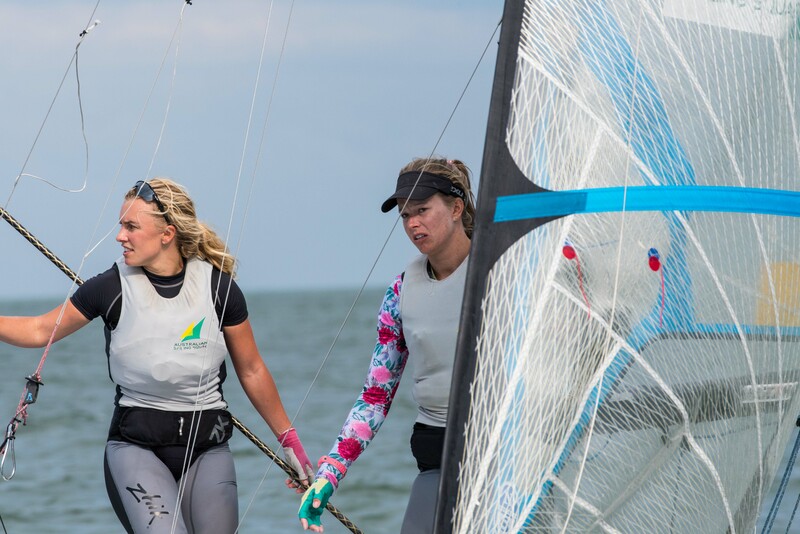 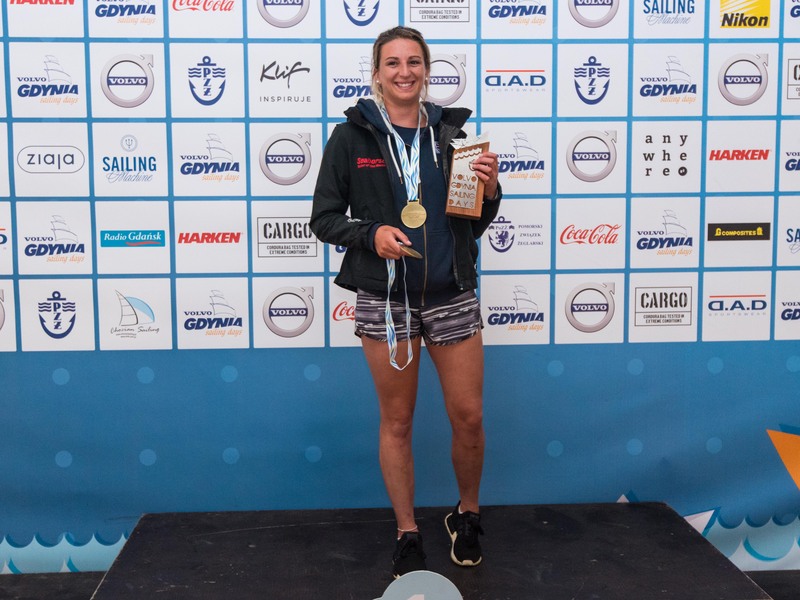 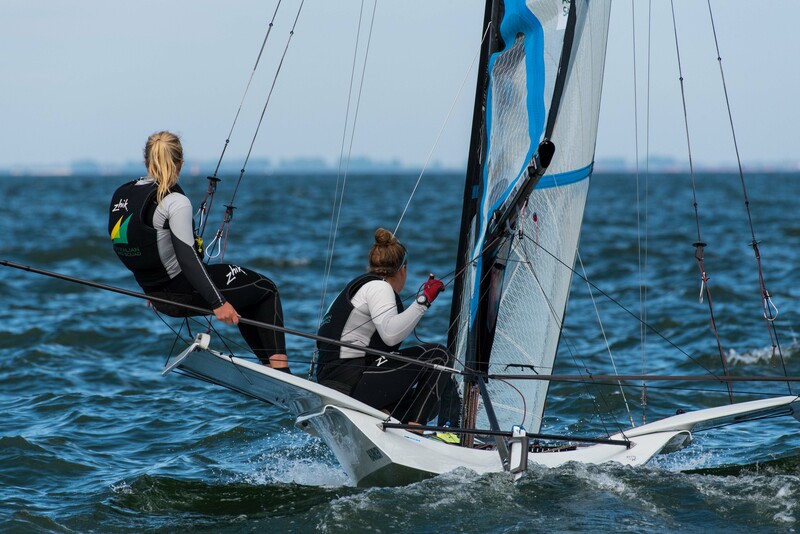 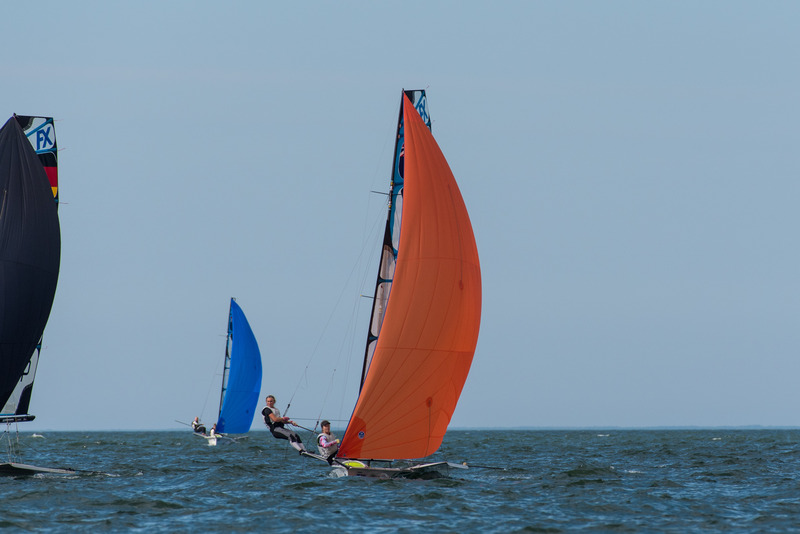 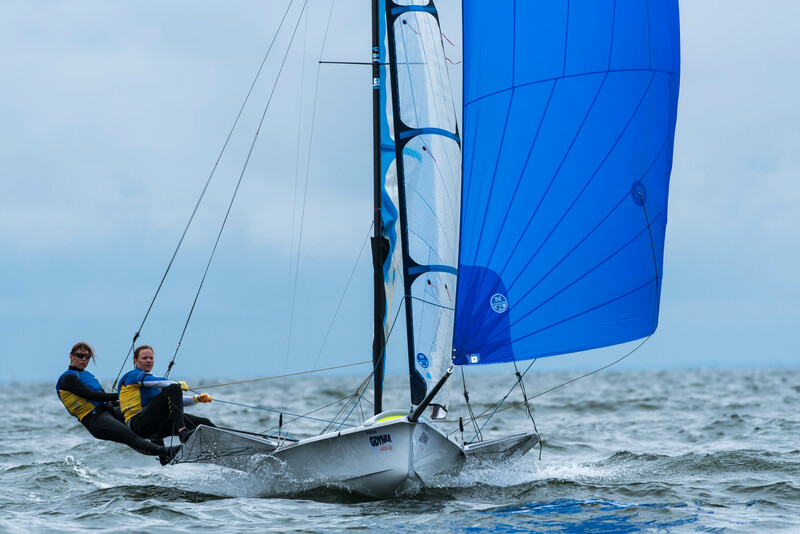 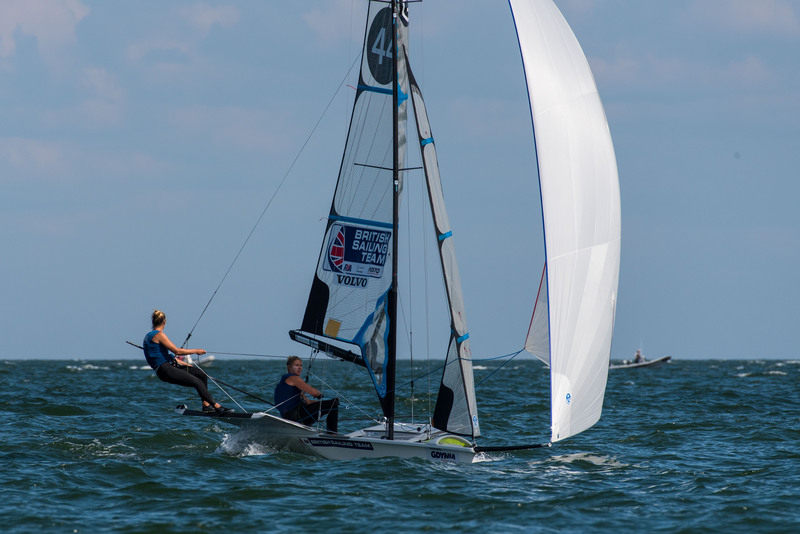 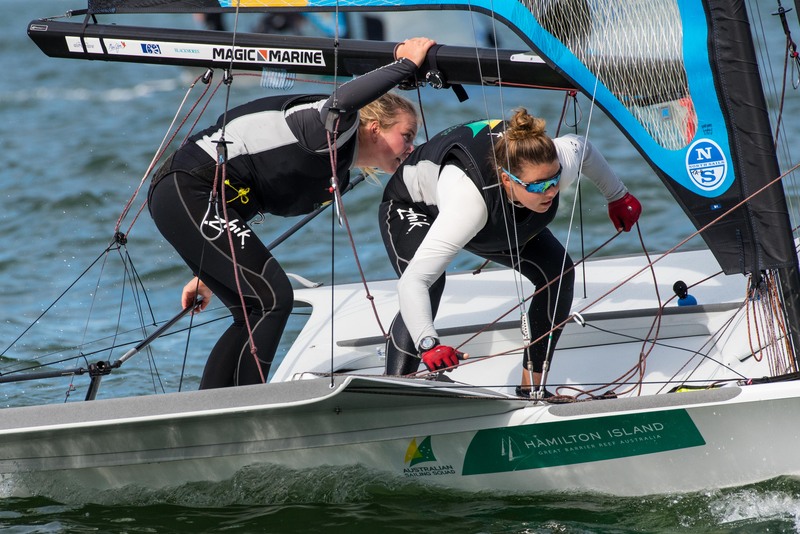 A team that has won in 2018 is Charlotte Dobson with Saskia Tidey (GBR) who won the 2018 Medemblik Regatta. 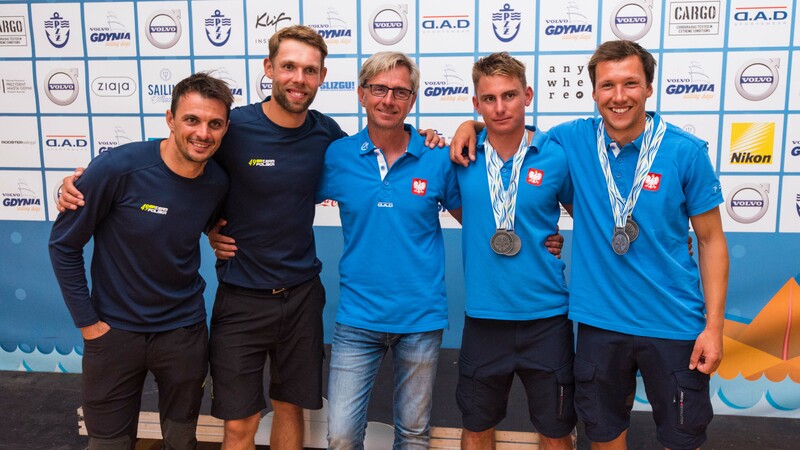 They were also runners up in 2017 Europeans but have had an up and down season so far, with as many finishes out of the top 10 as in it. 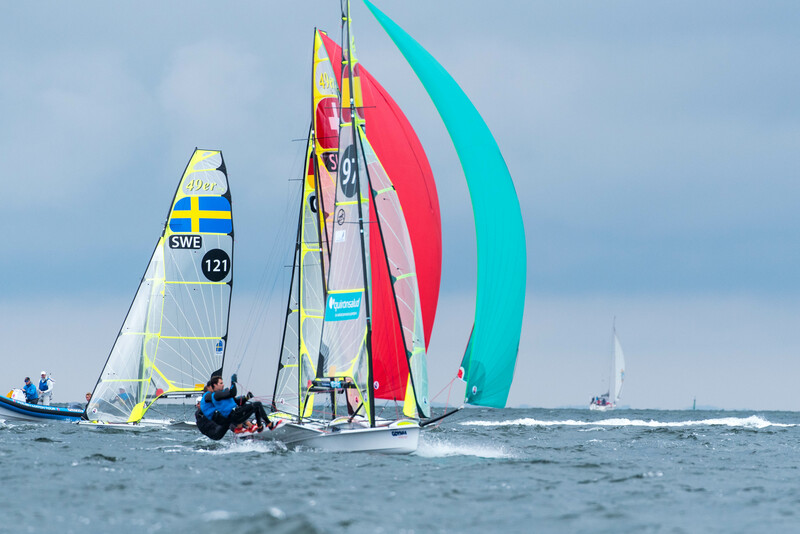 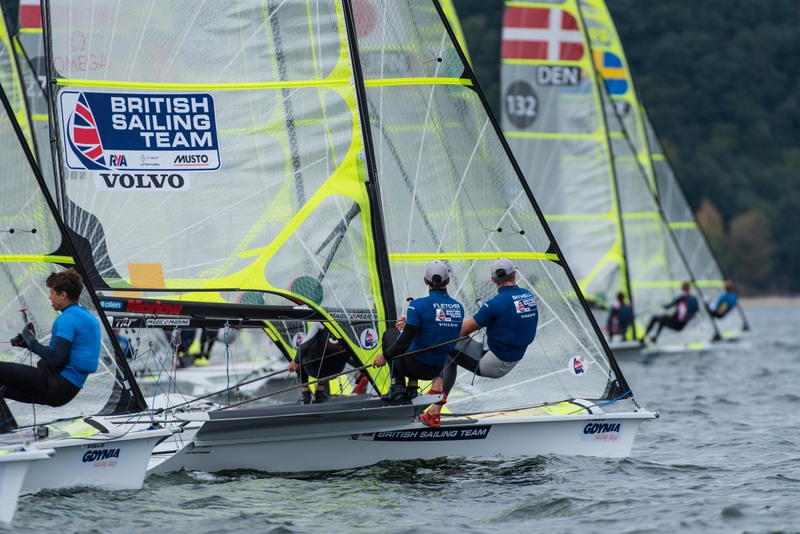 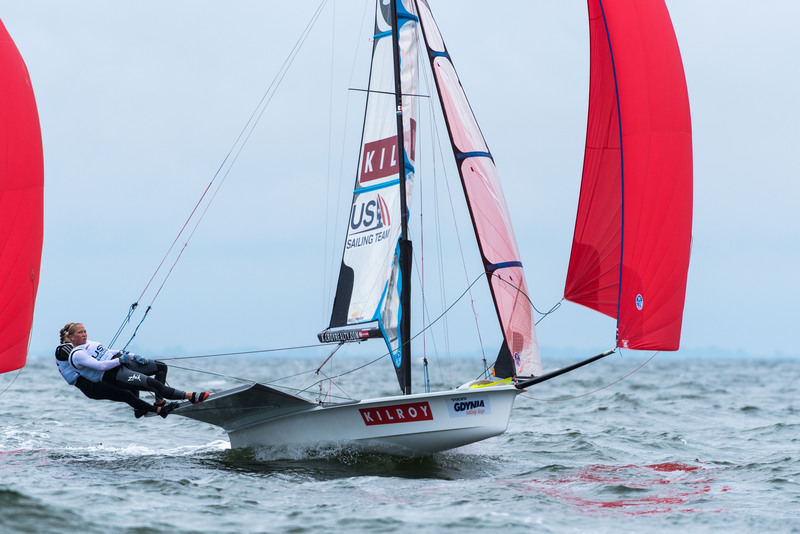 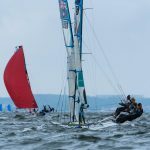 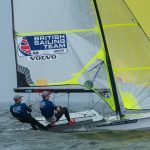 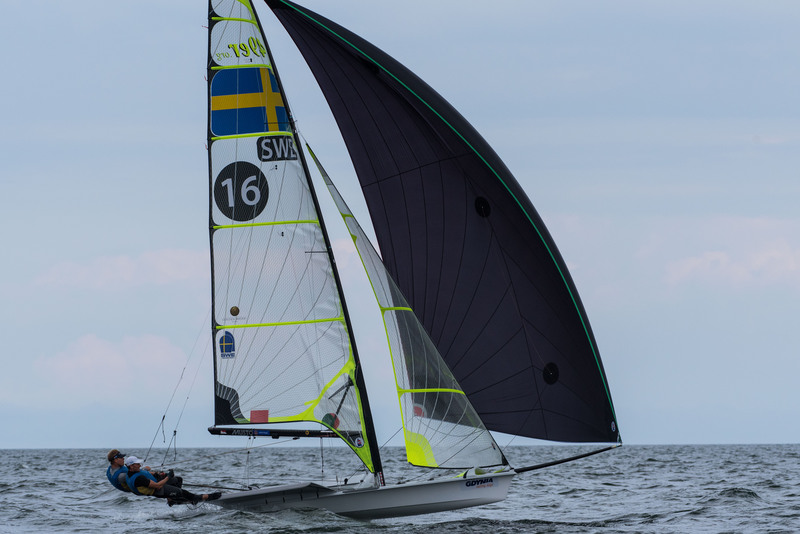 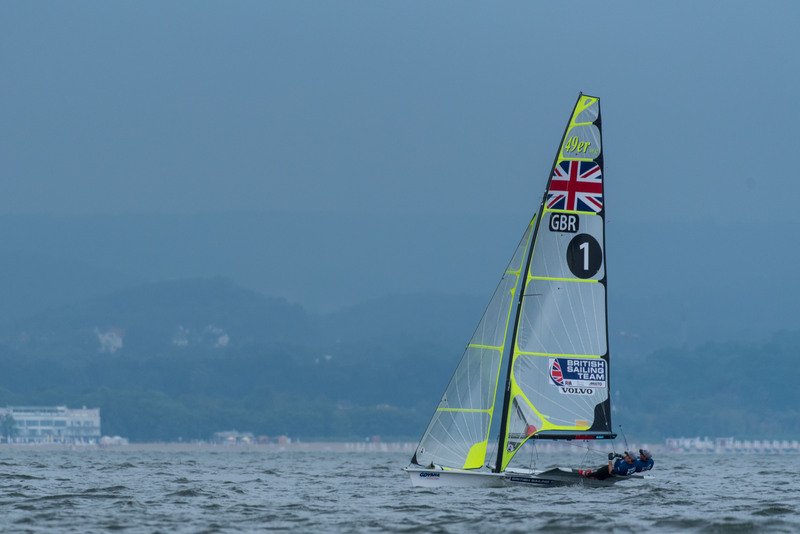 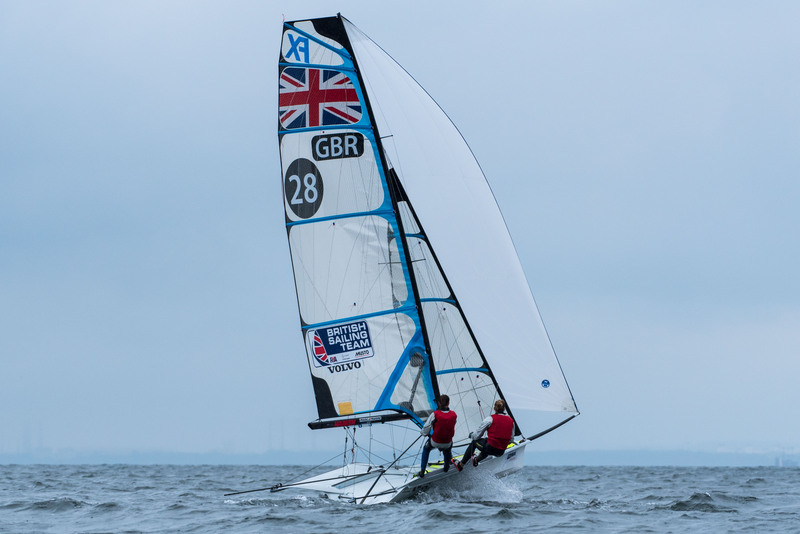 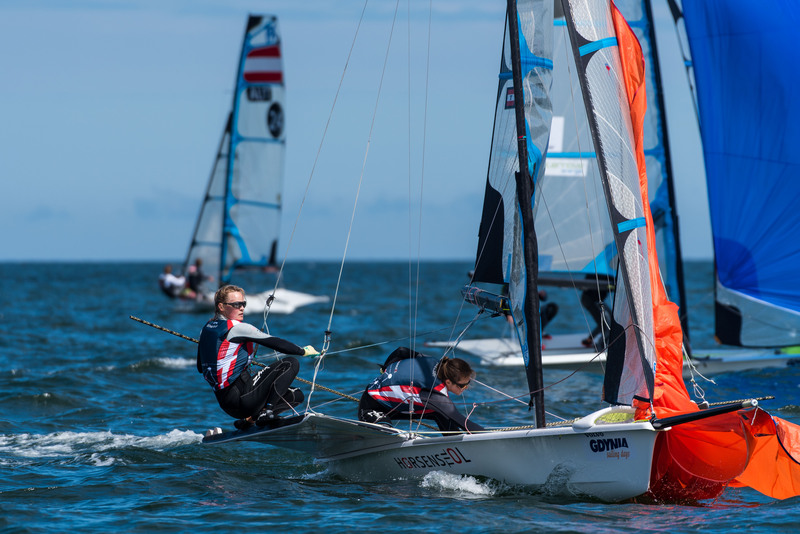 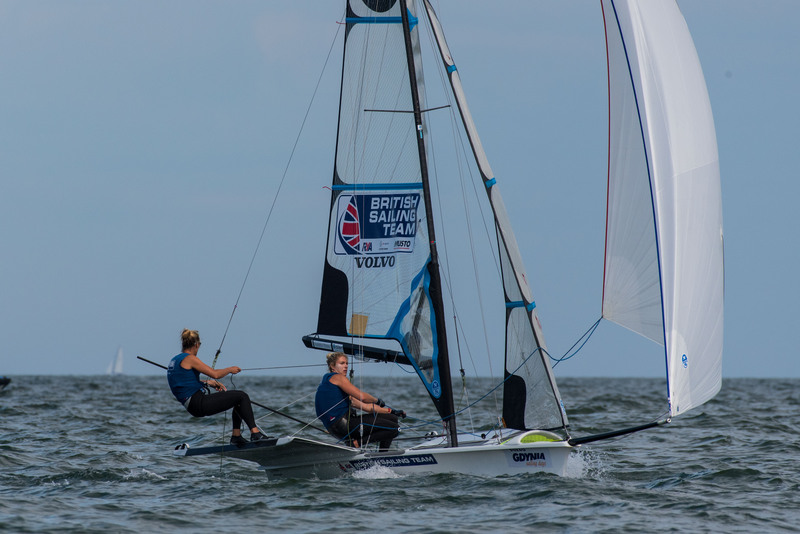 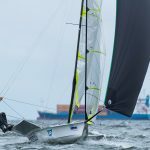 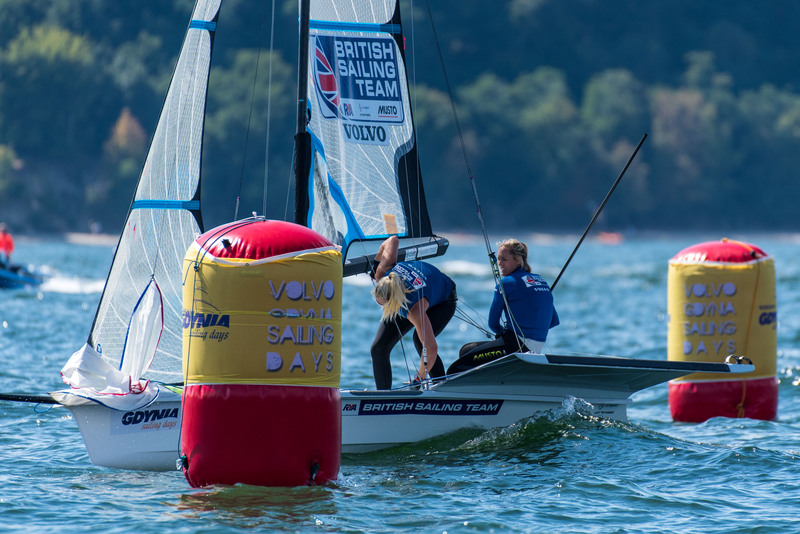 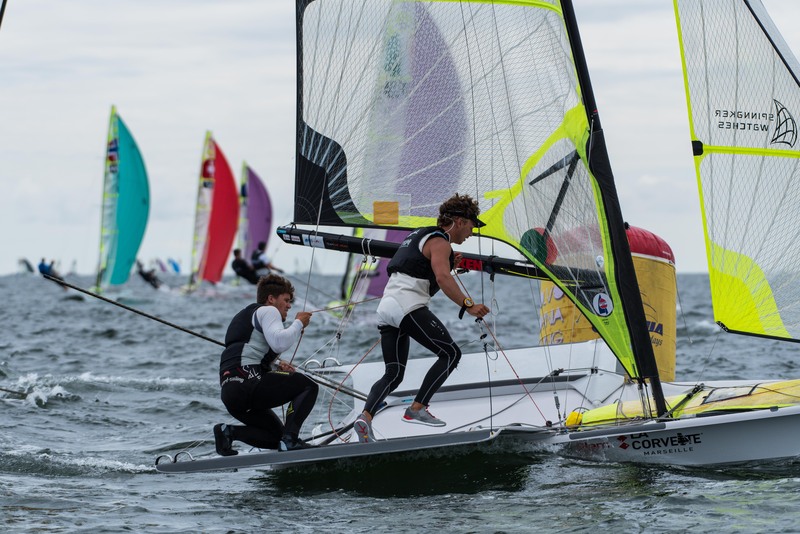 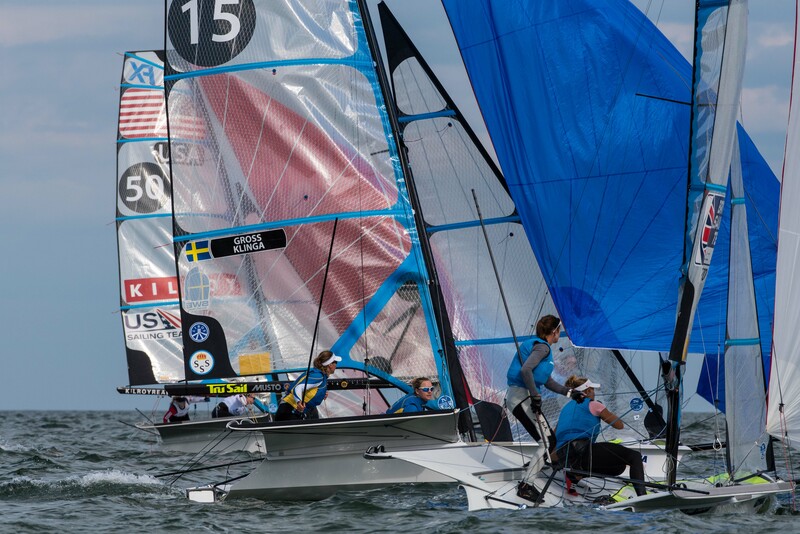 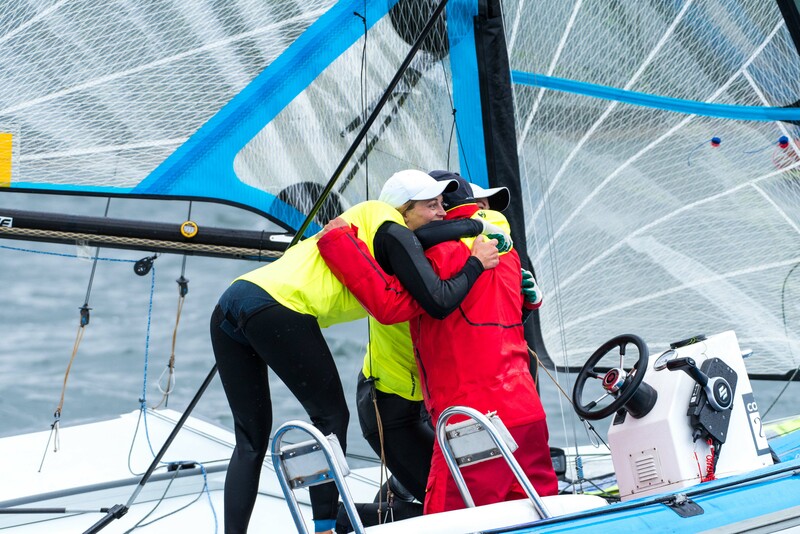 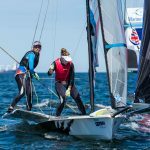 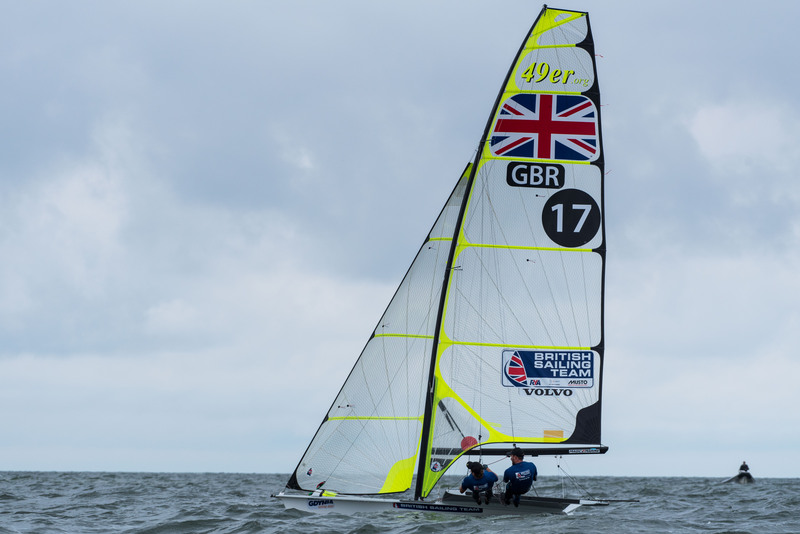 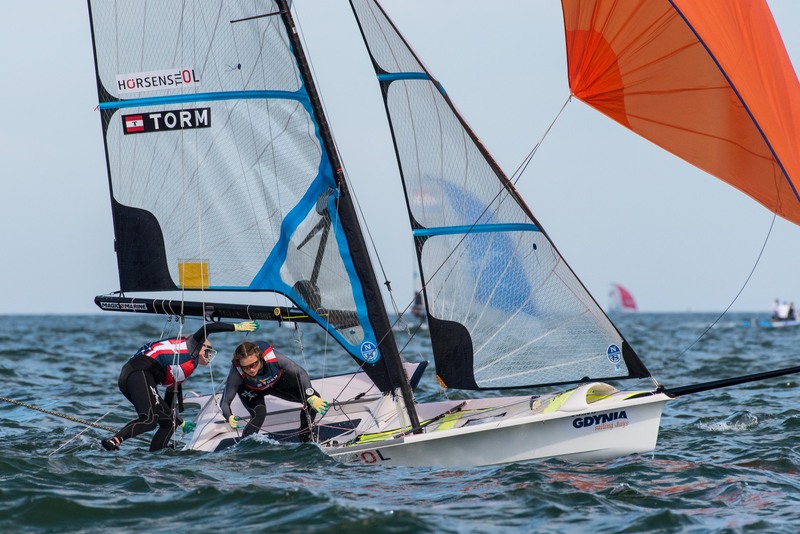 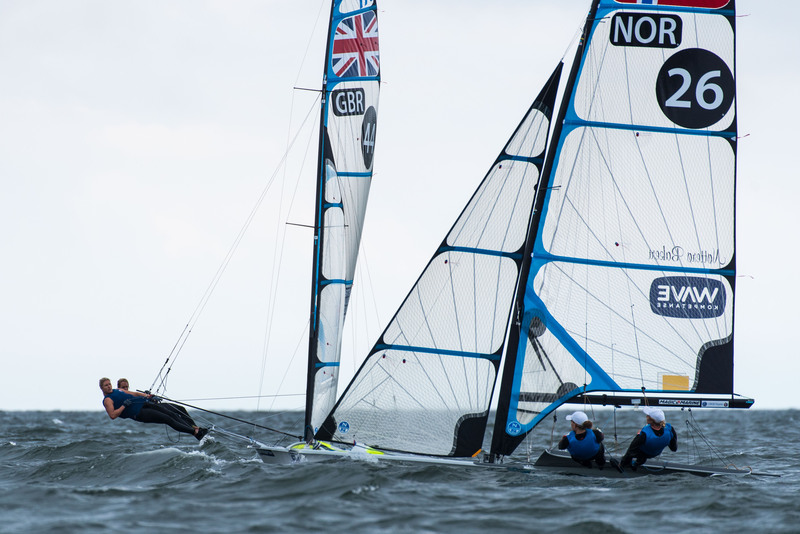 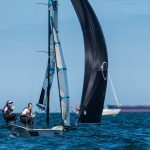 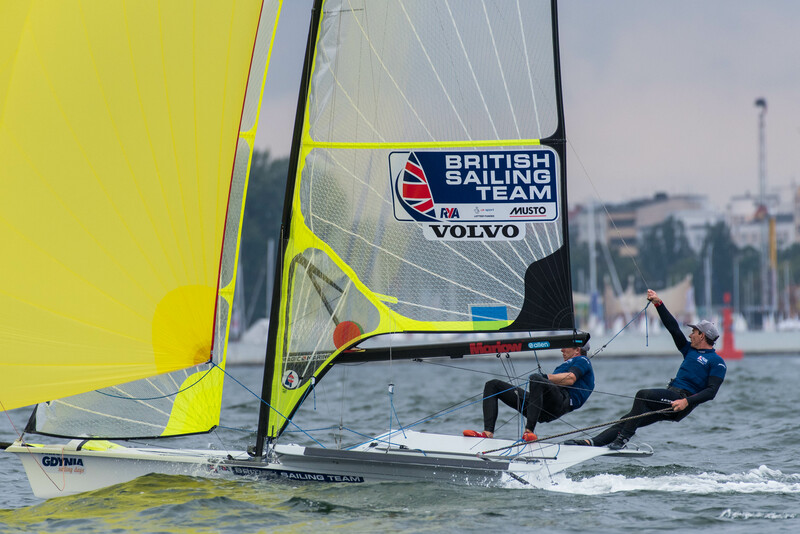 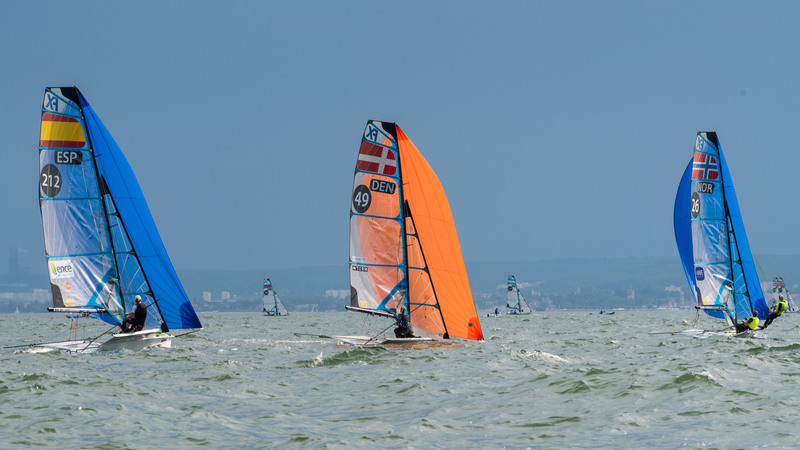 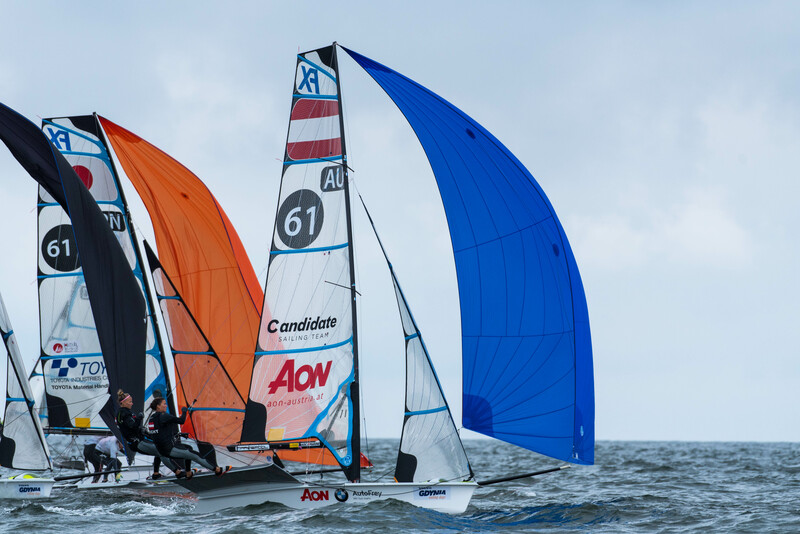 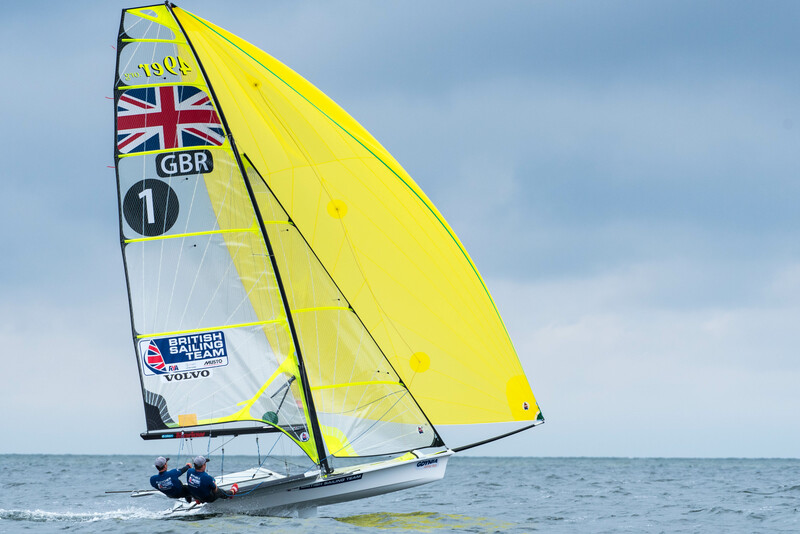 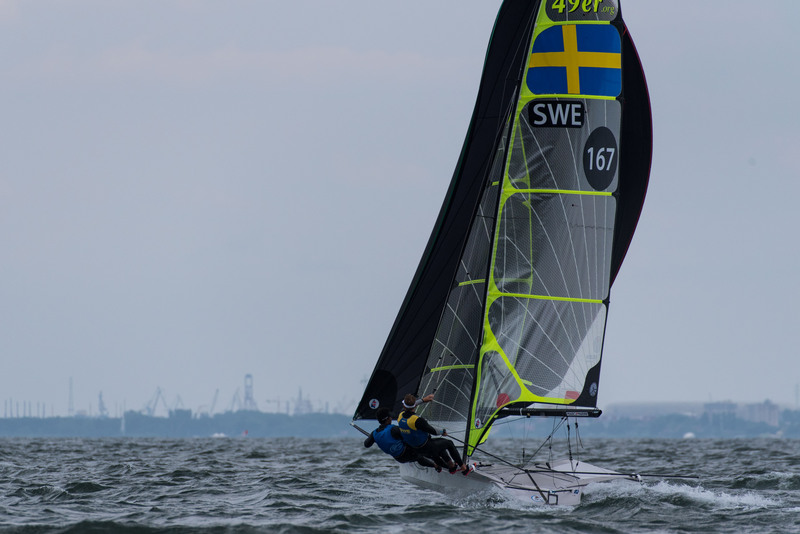 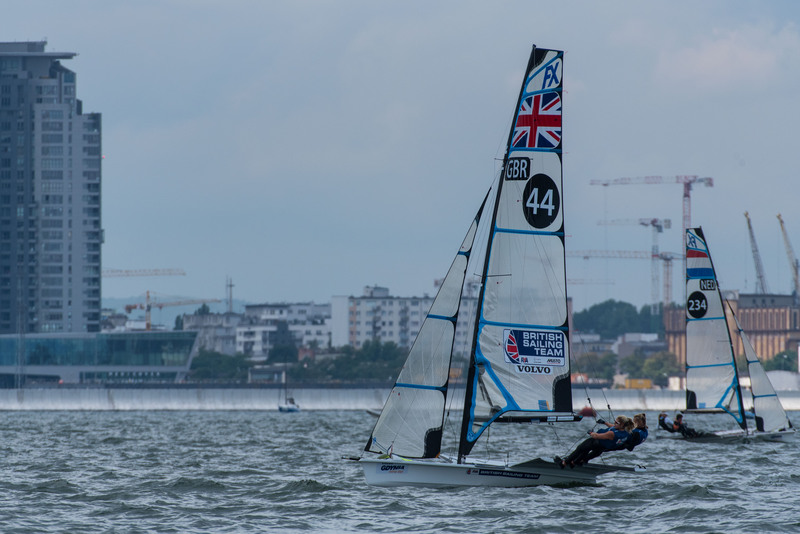 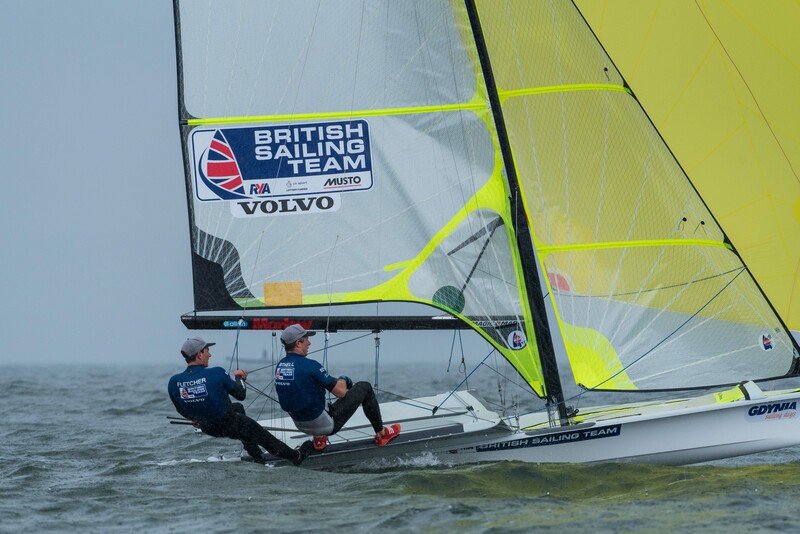 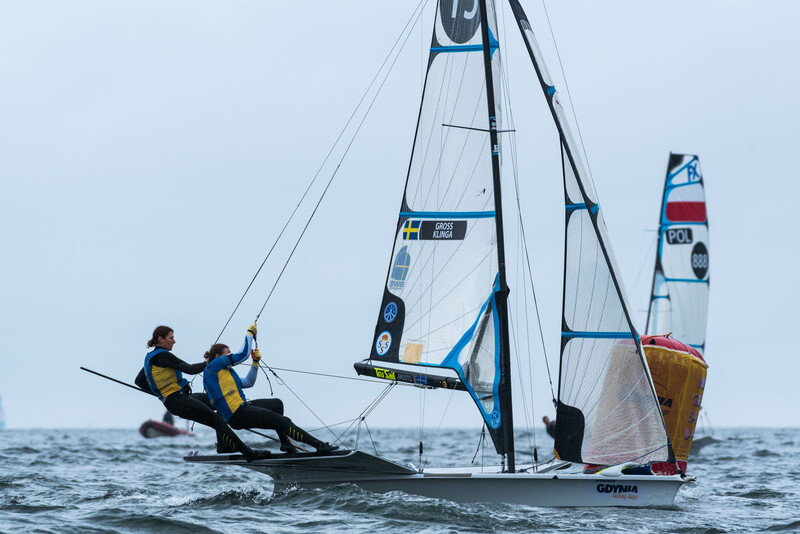 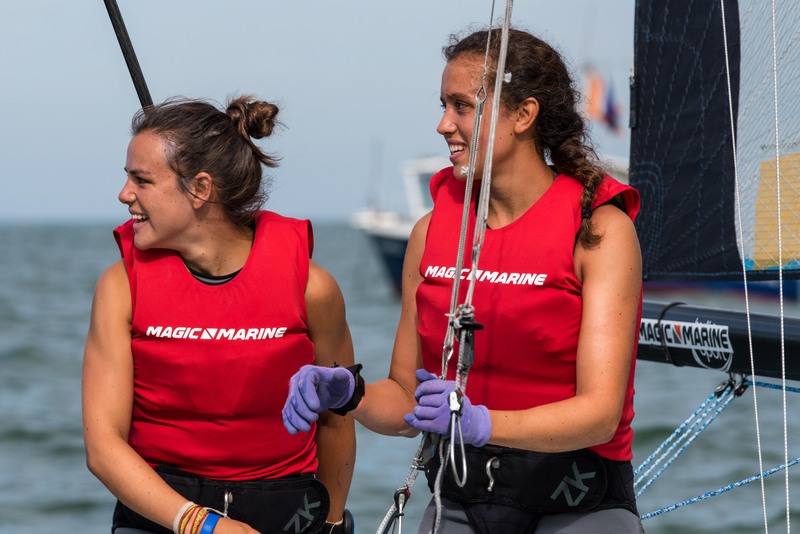 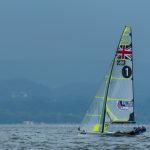 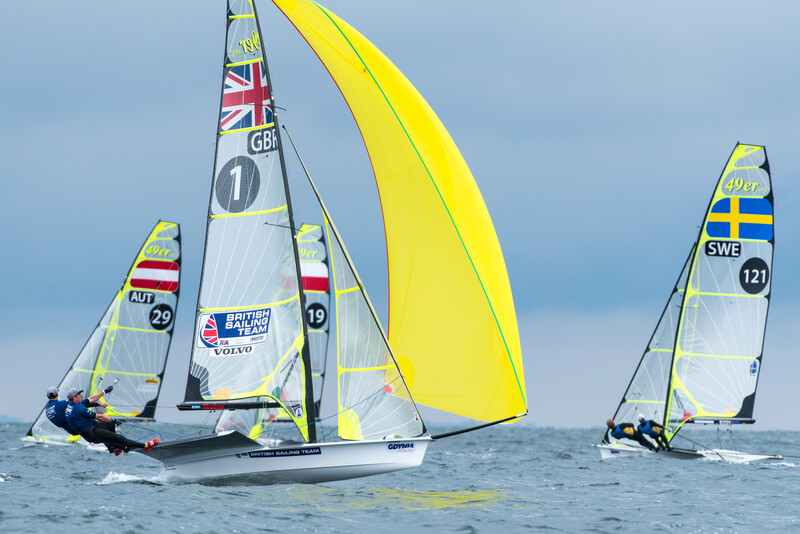 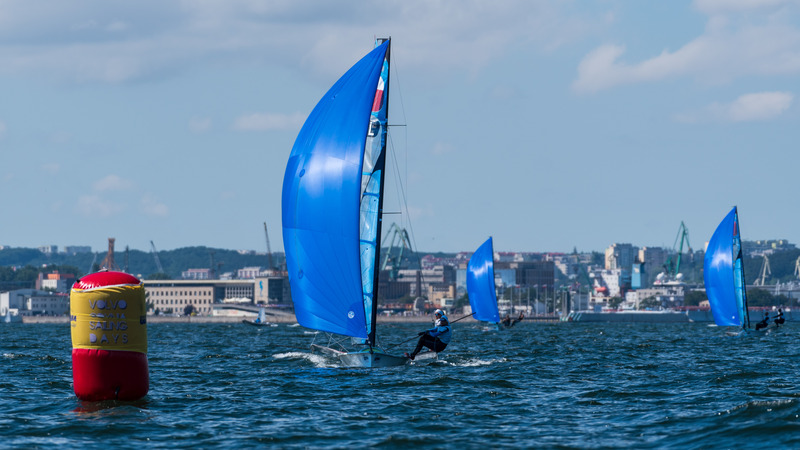 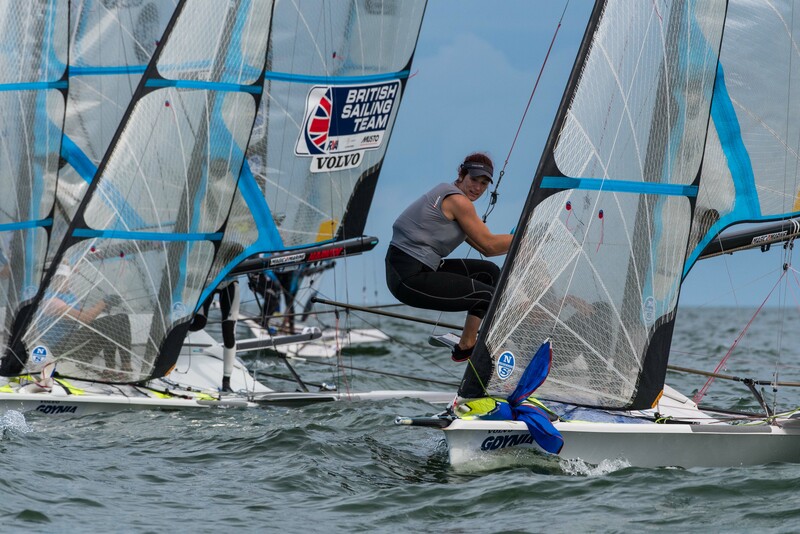 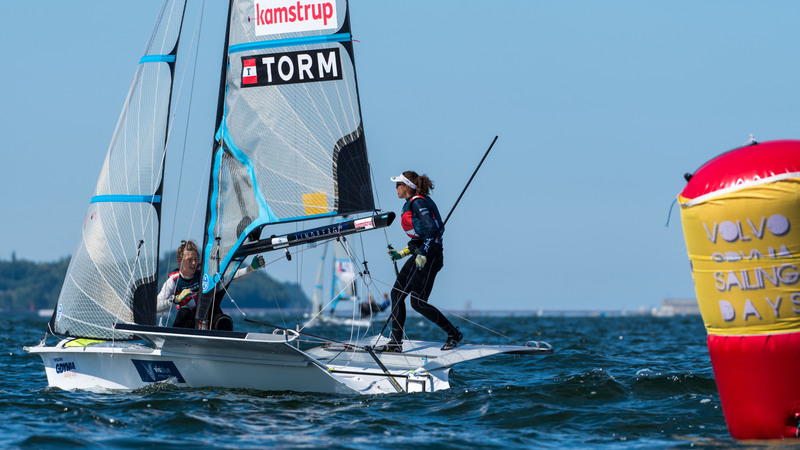 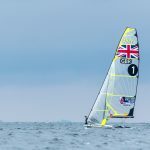 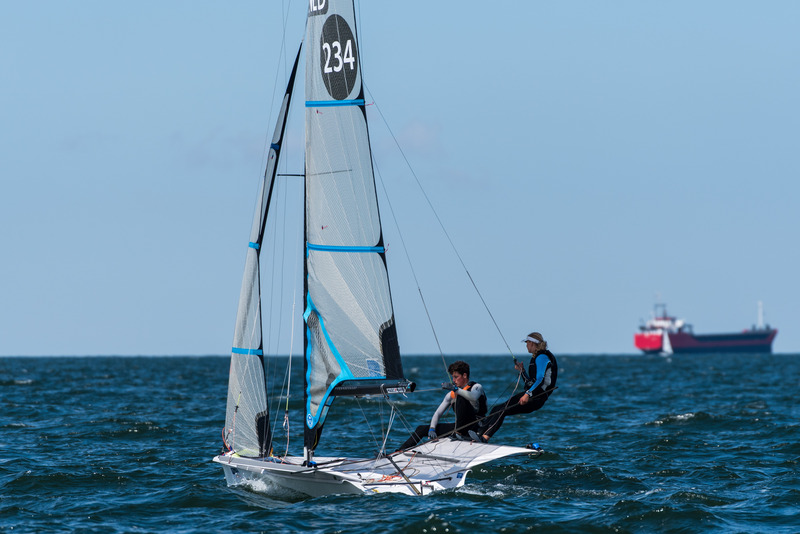 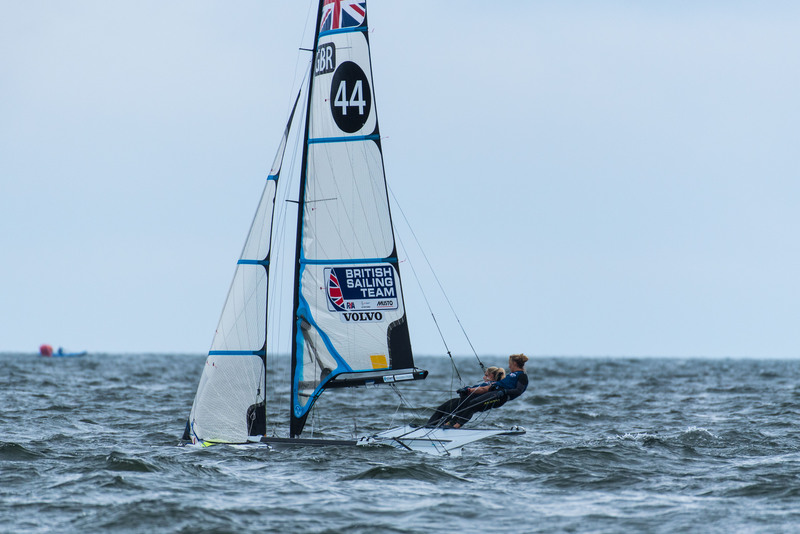 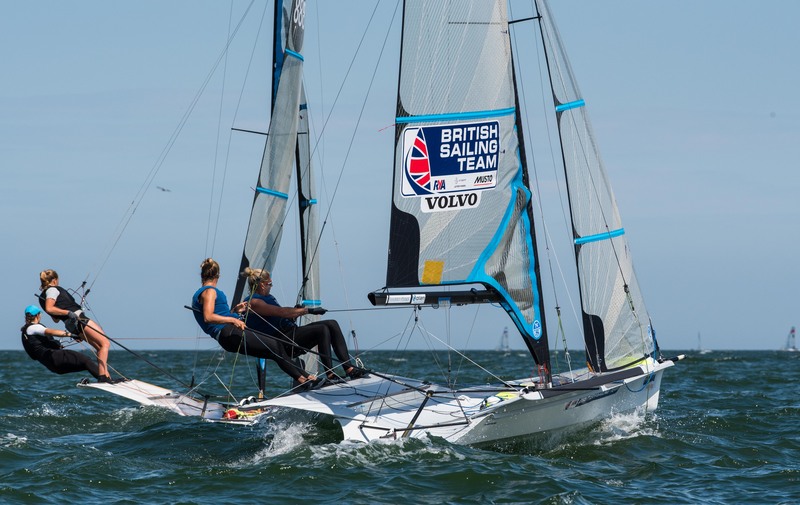 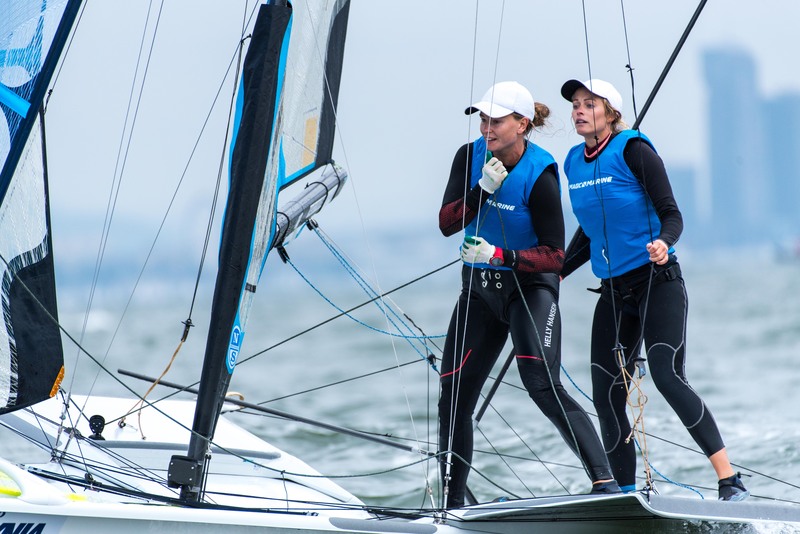 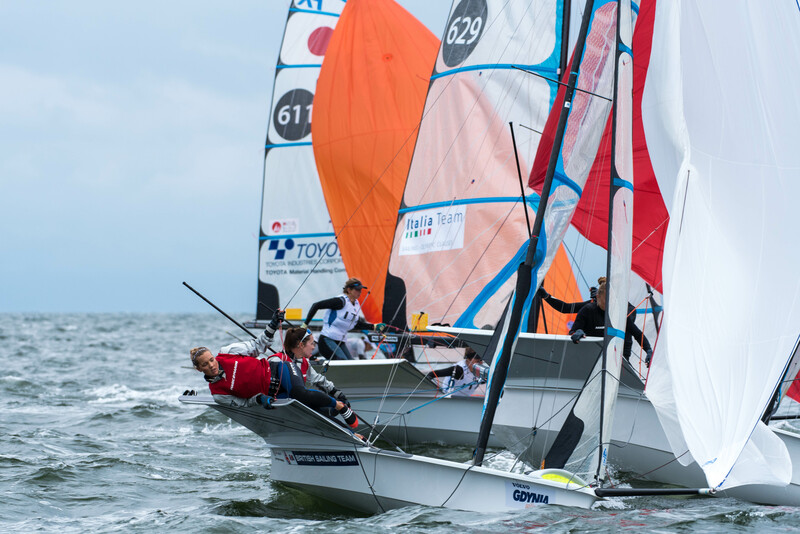 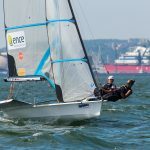 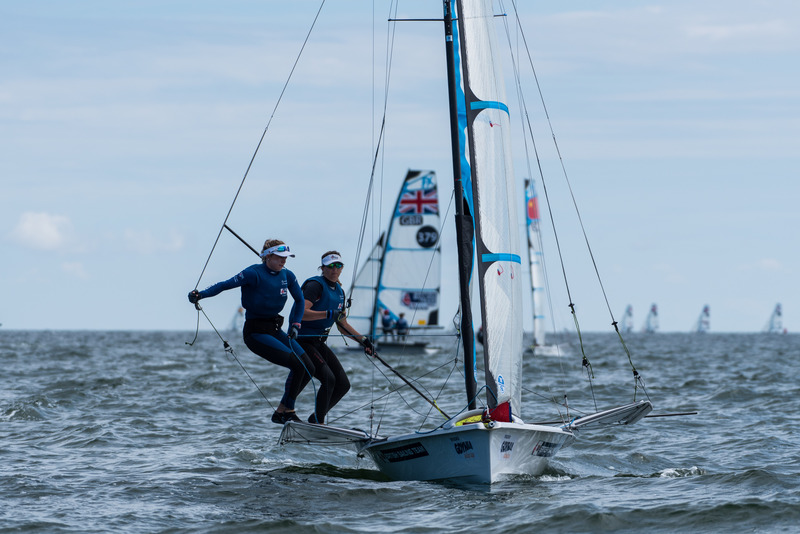 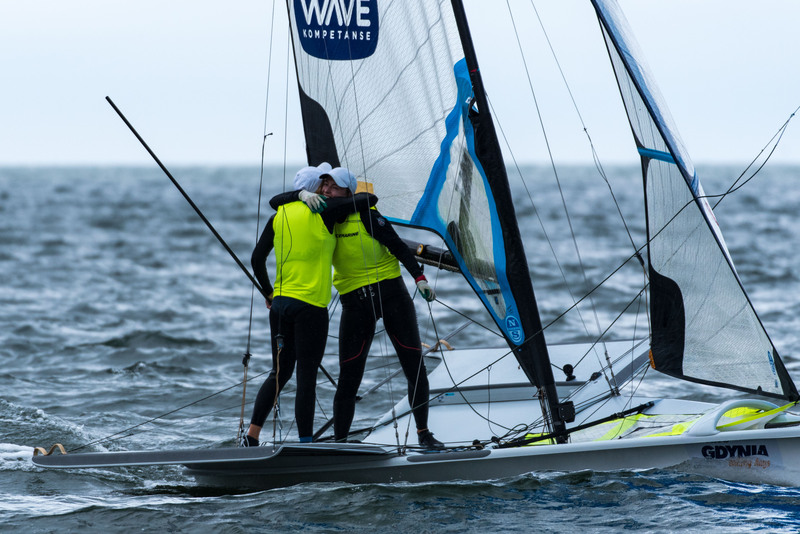 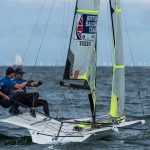 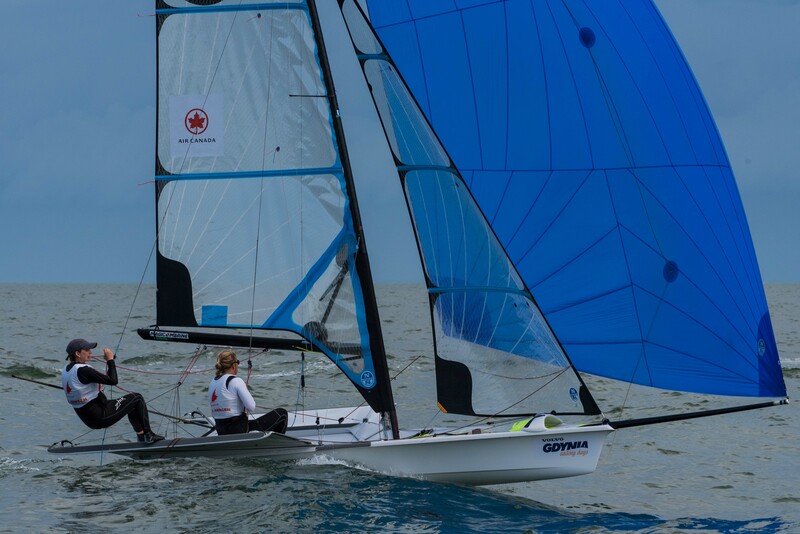 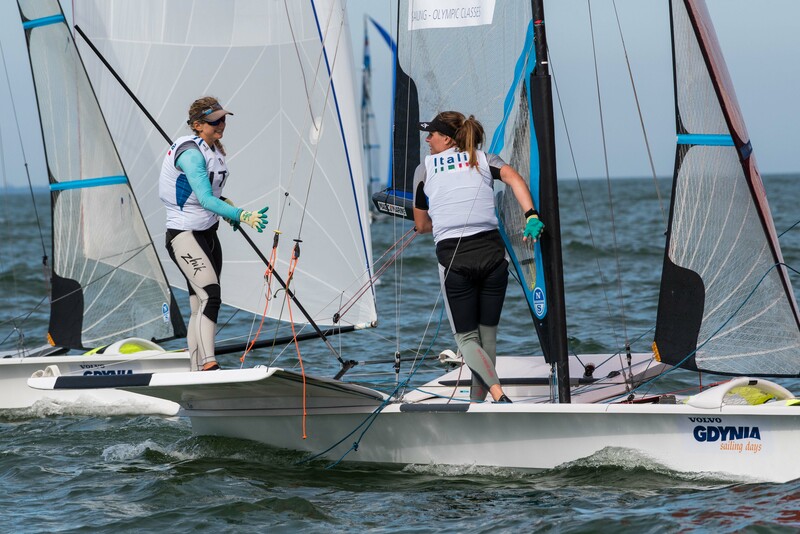 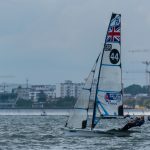 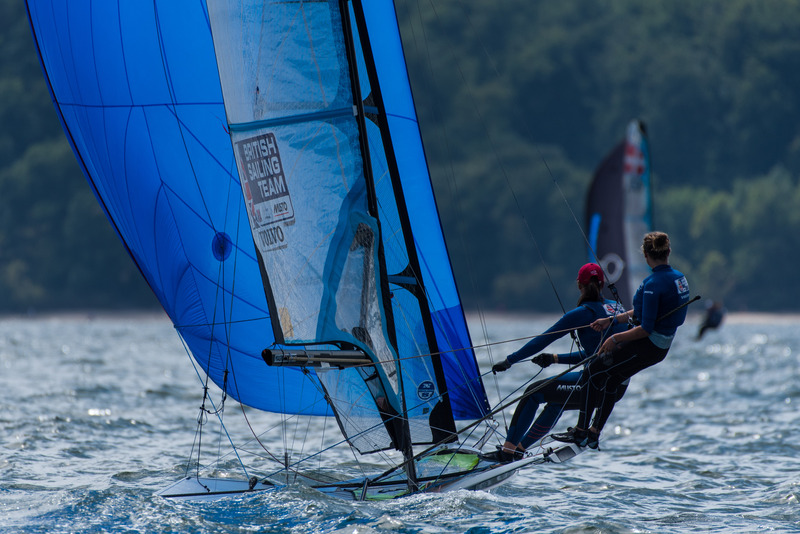 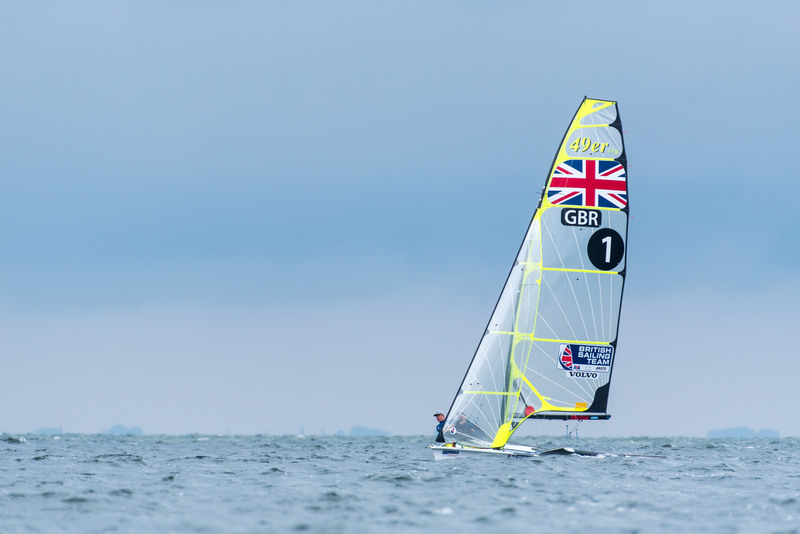 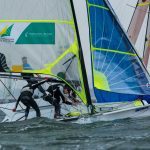 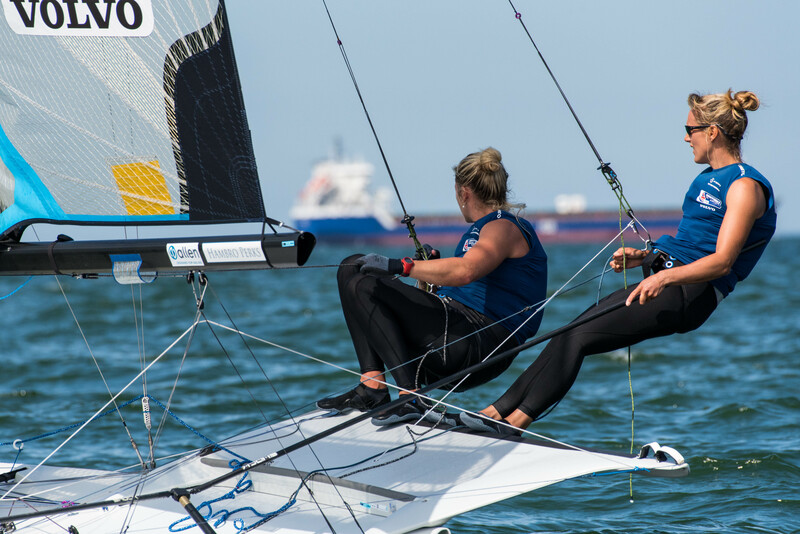 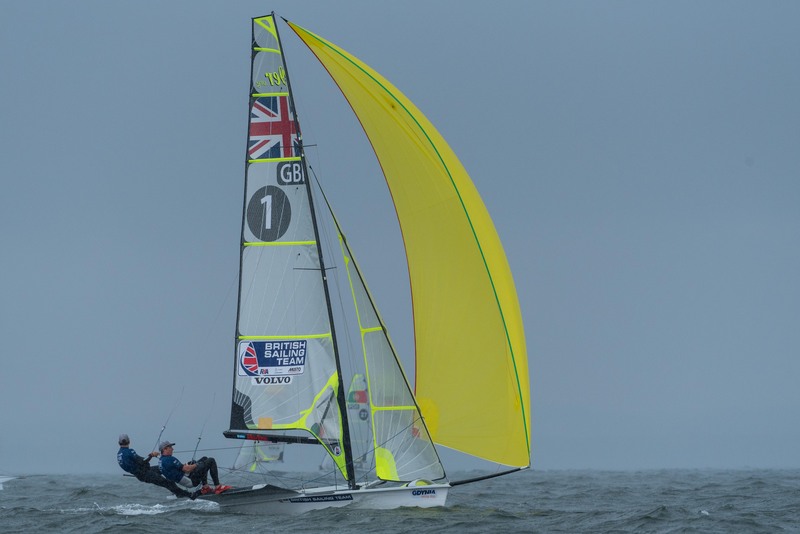 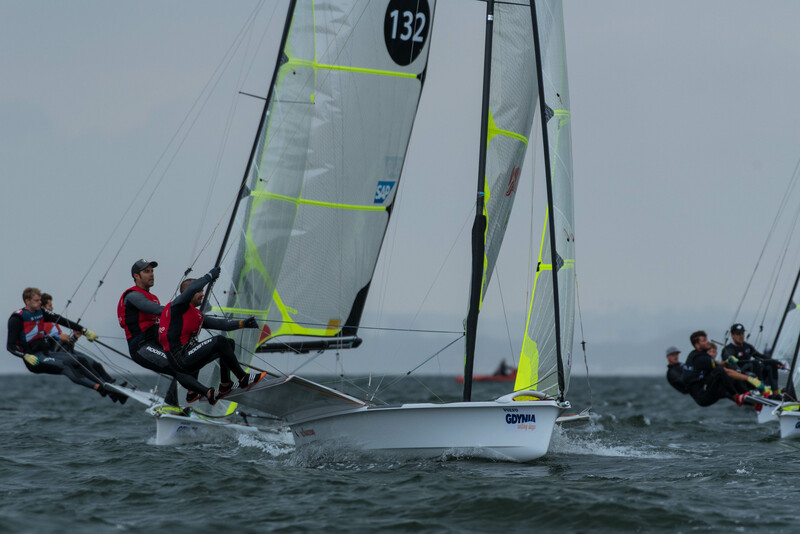 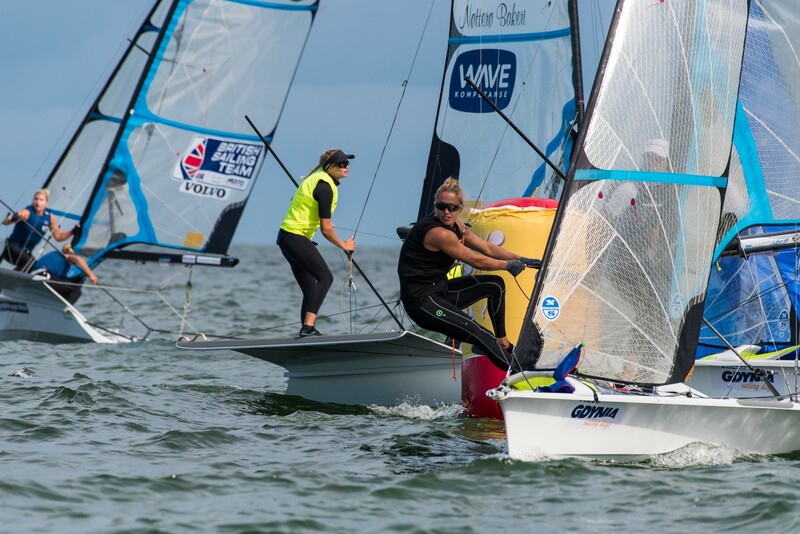 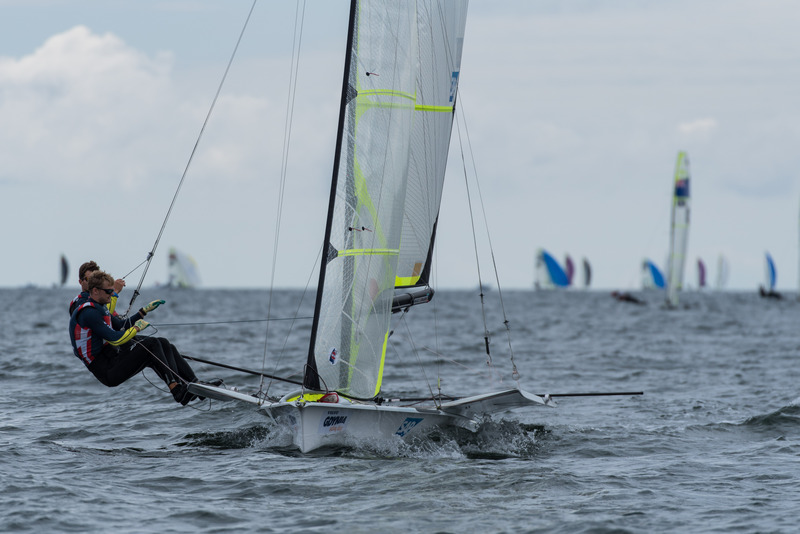 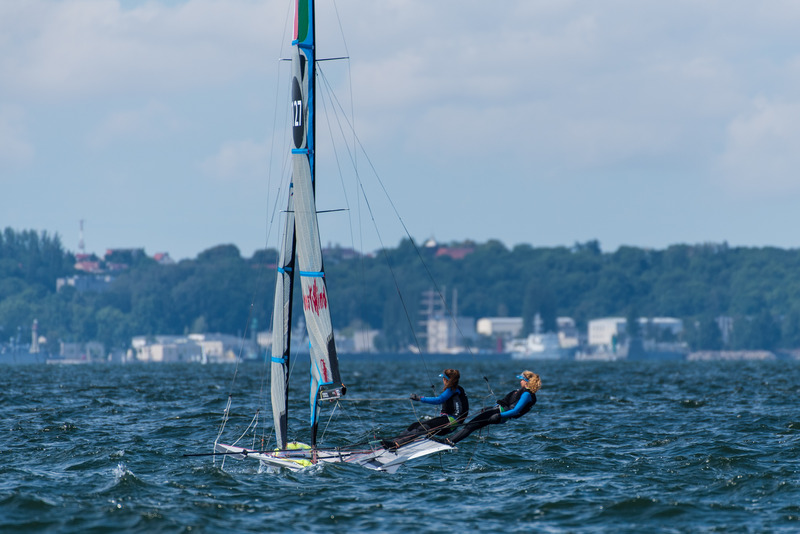 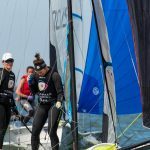 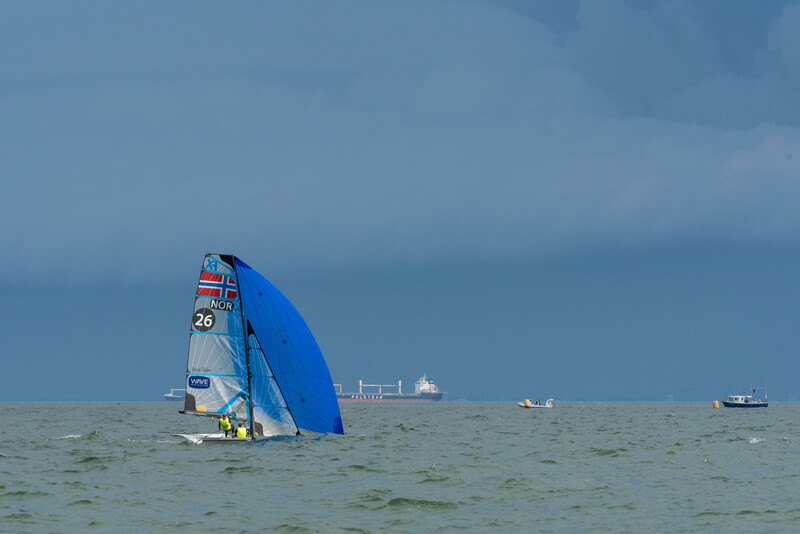 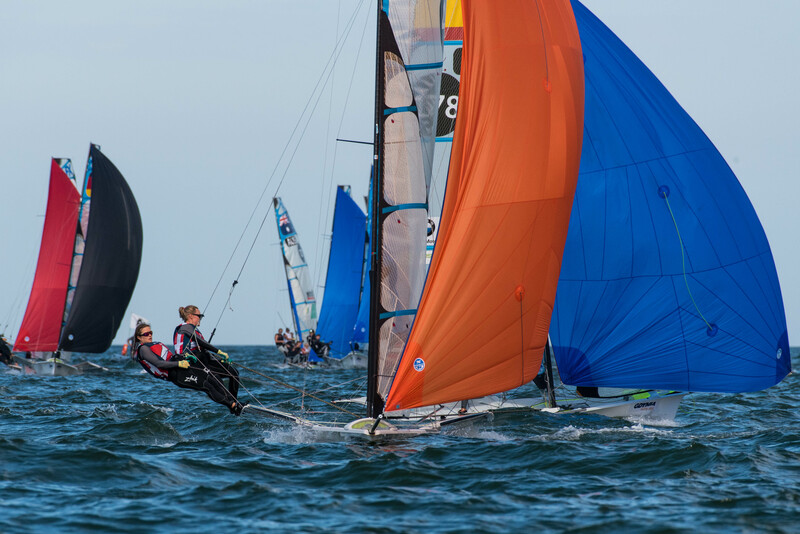 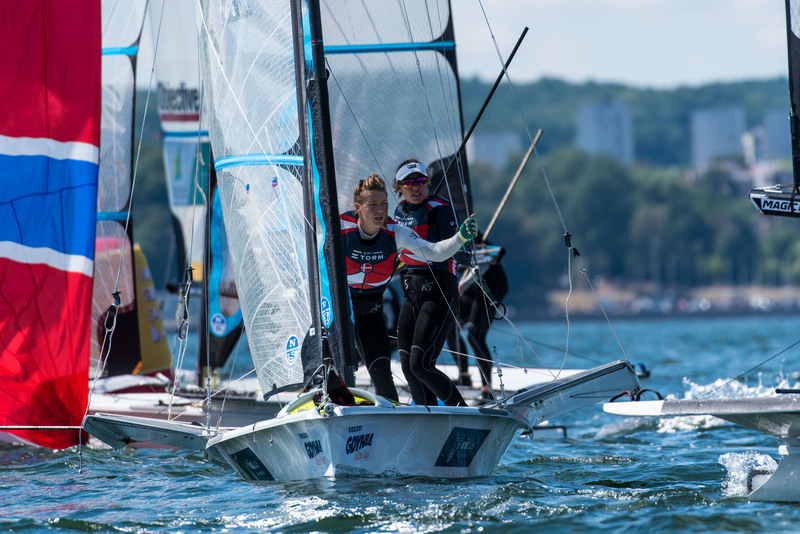 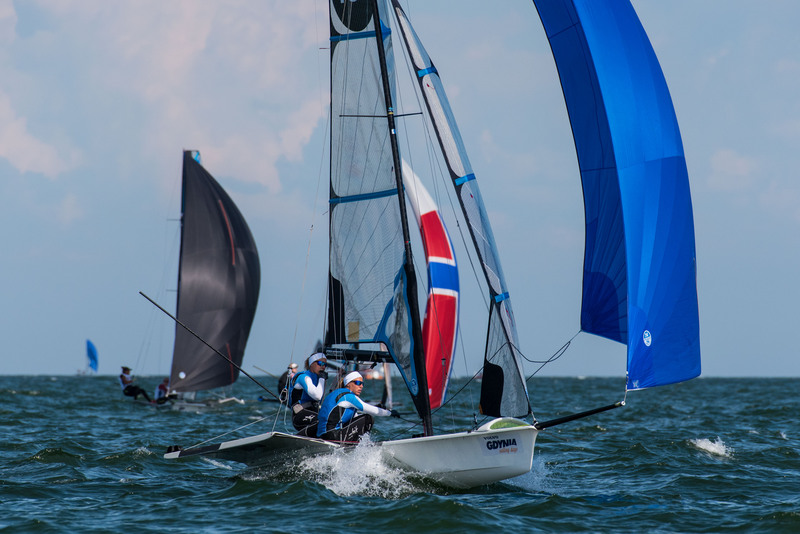 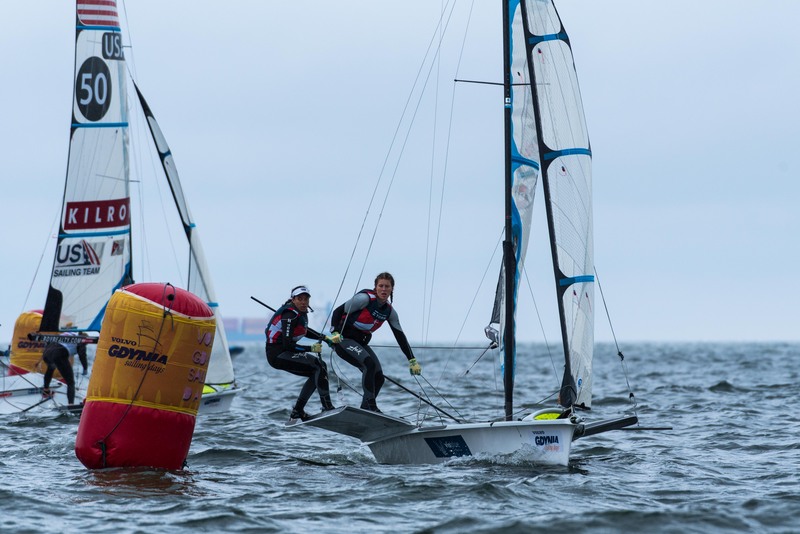 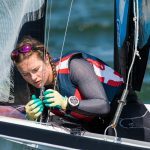 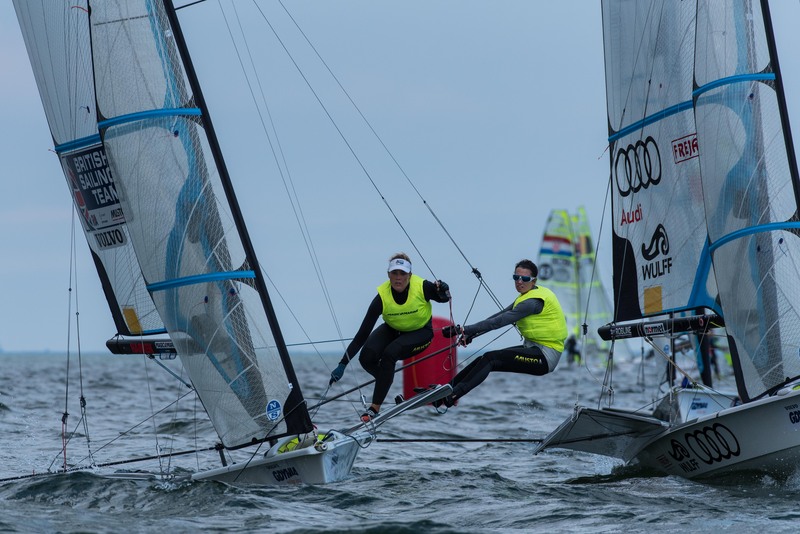 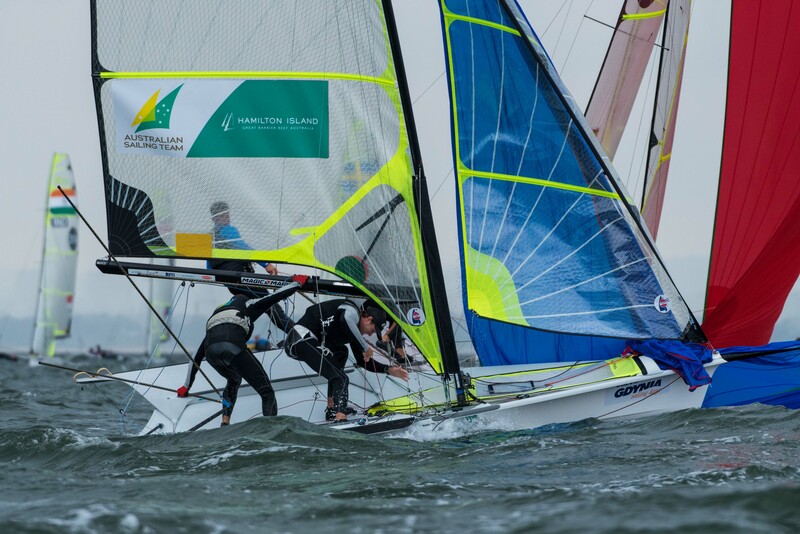 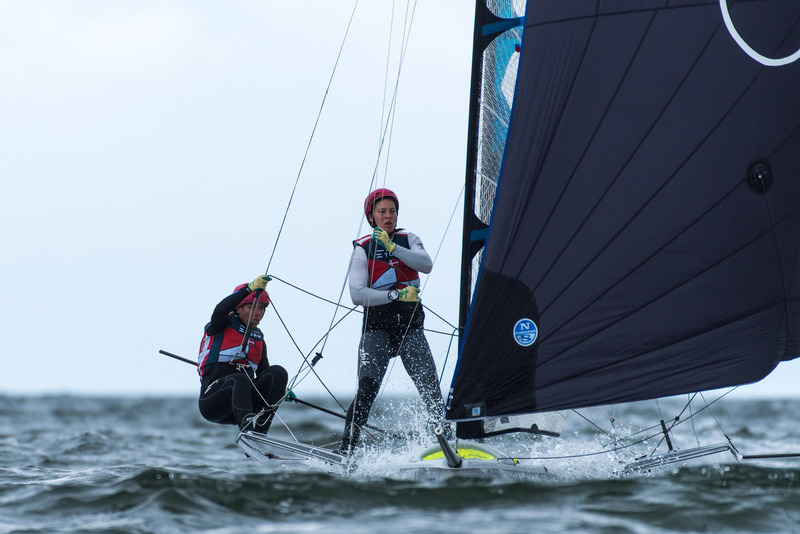 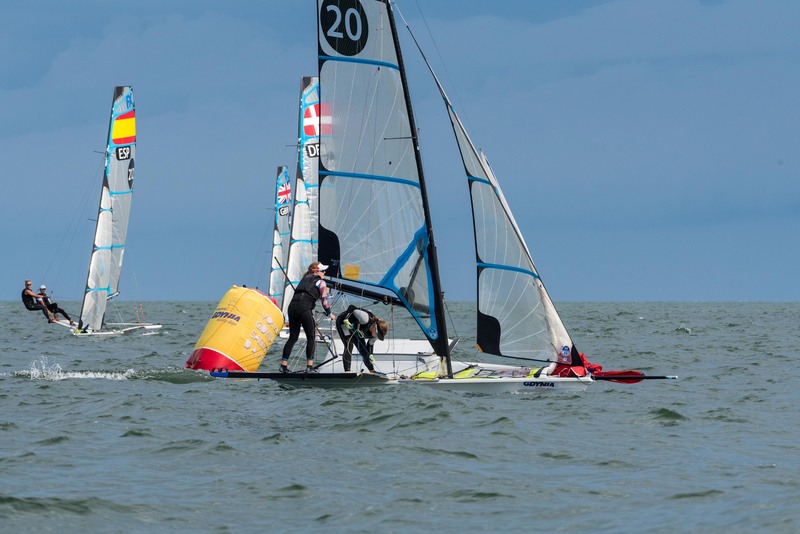 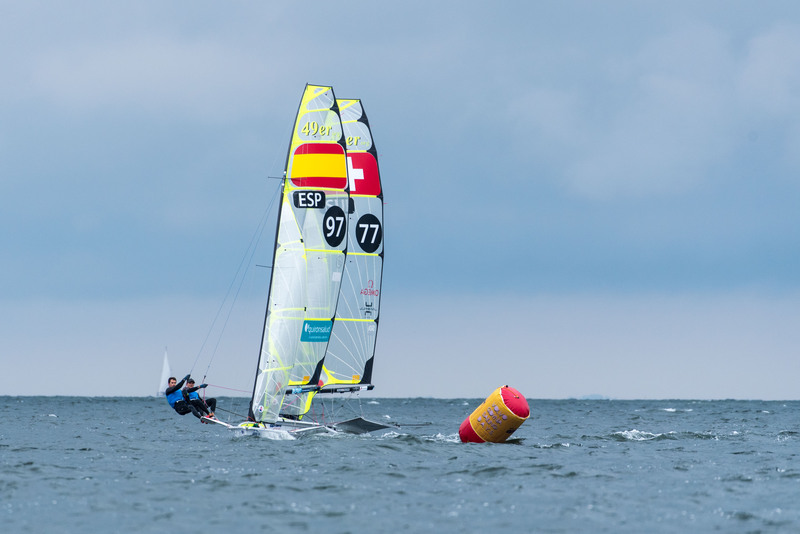 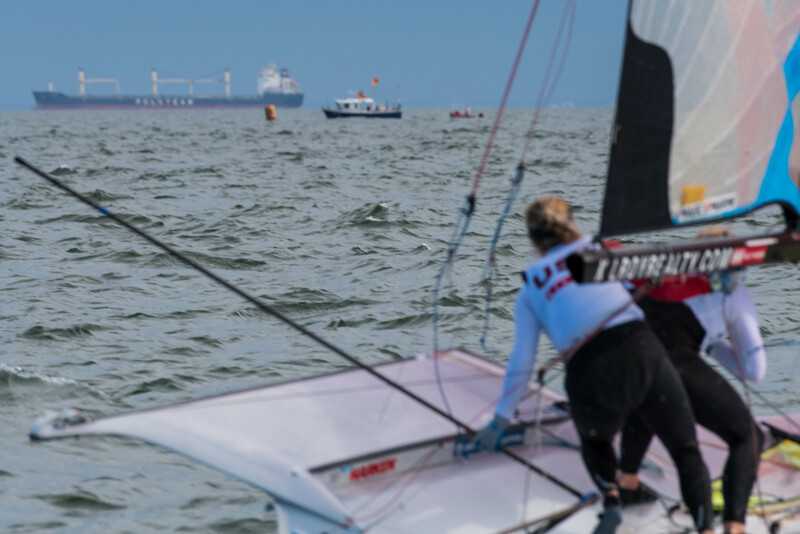 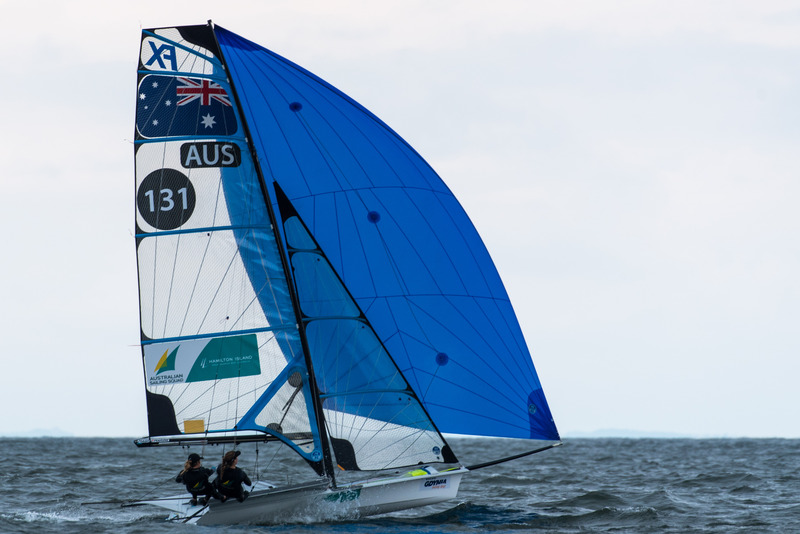 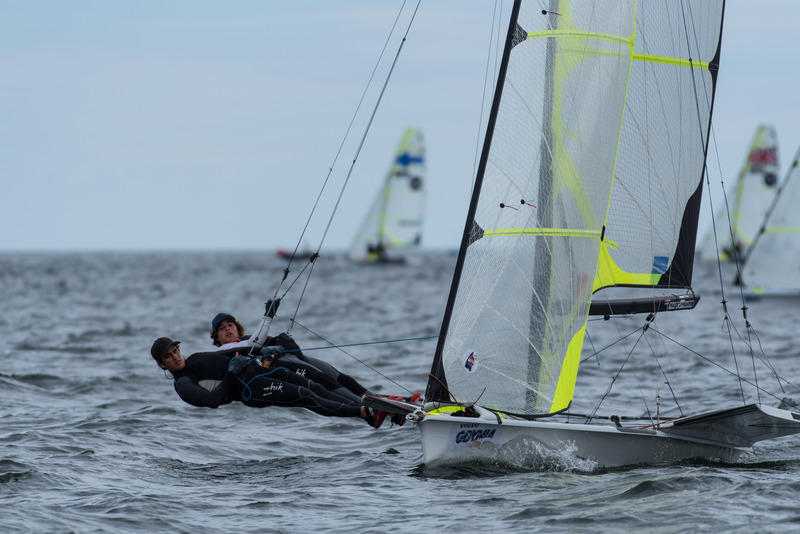 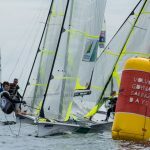 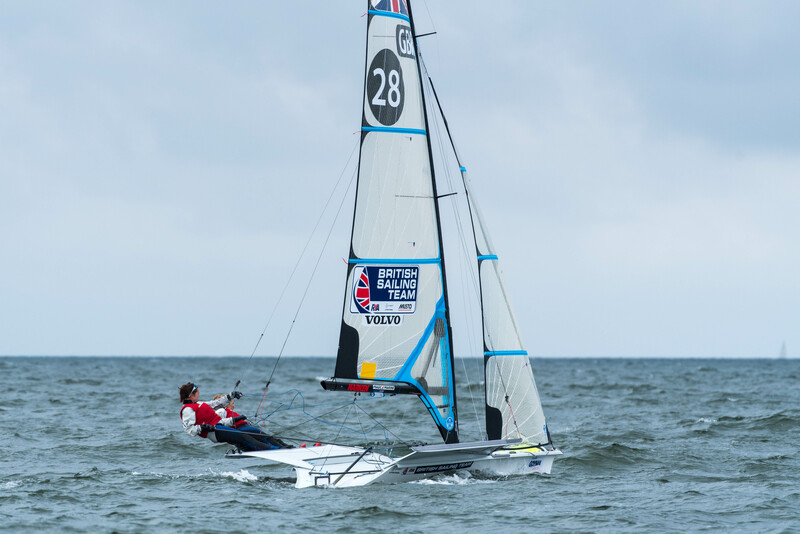 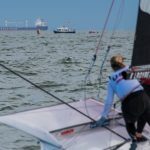 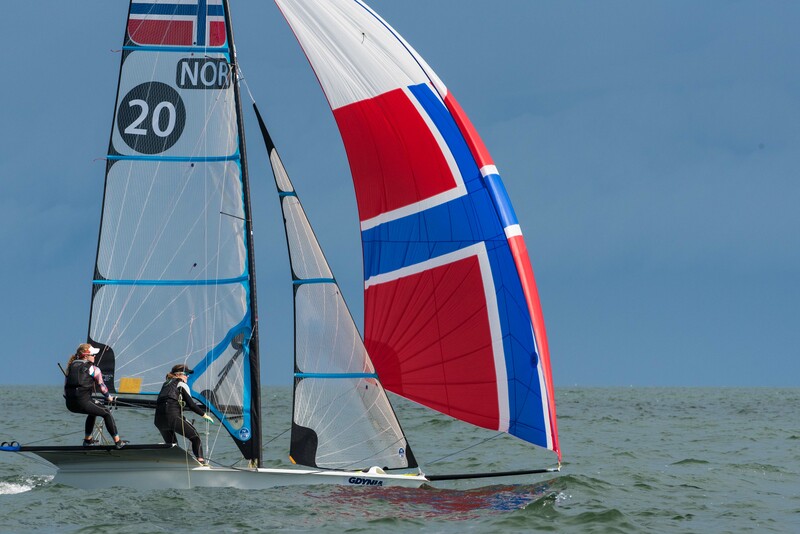 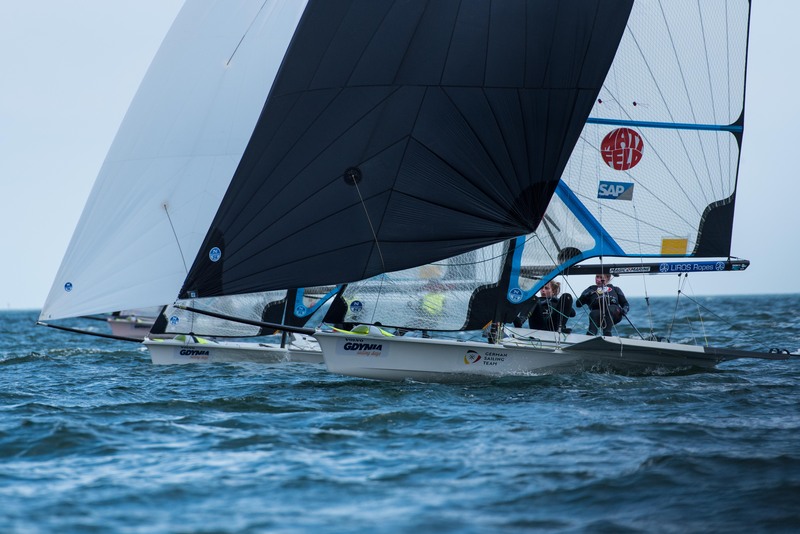 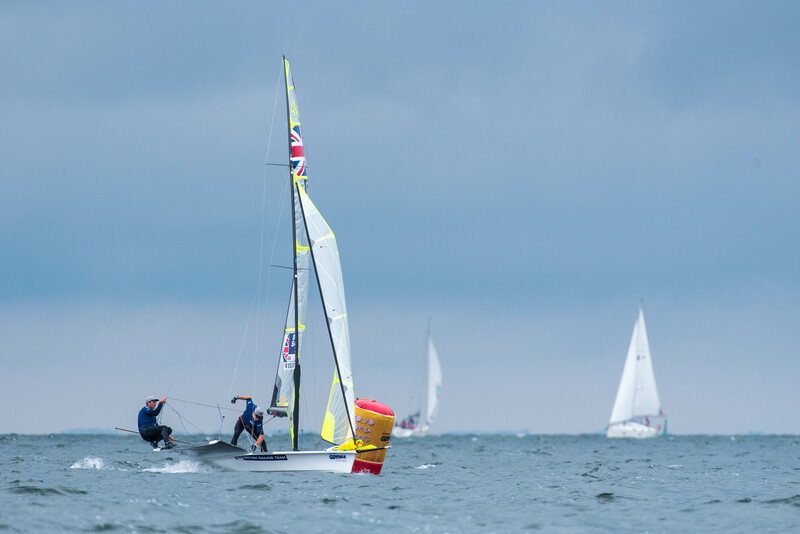 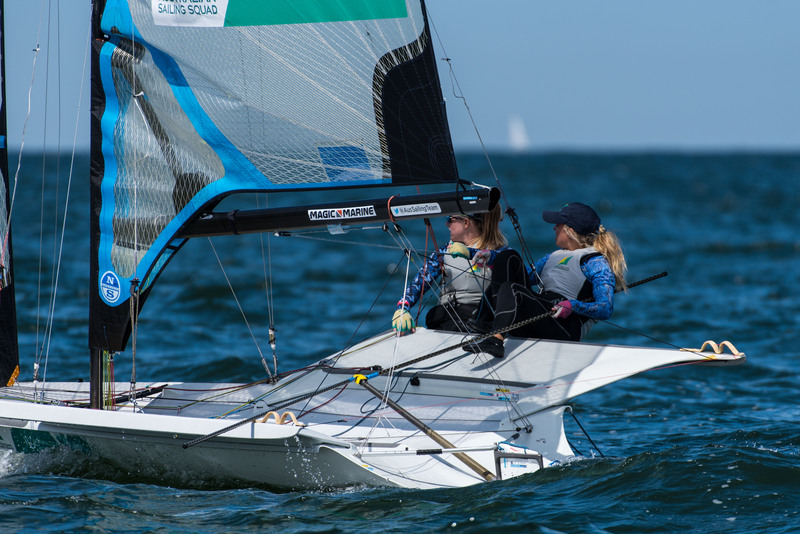 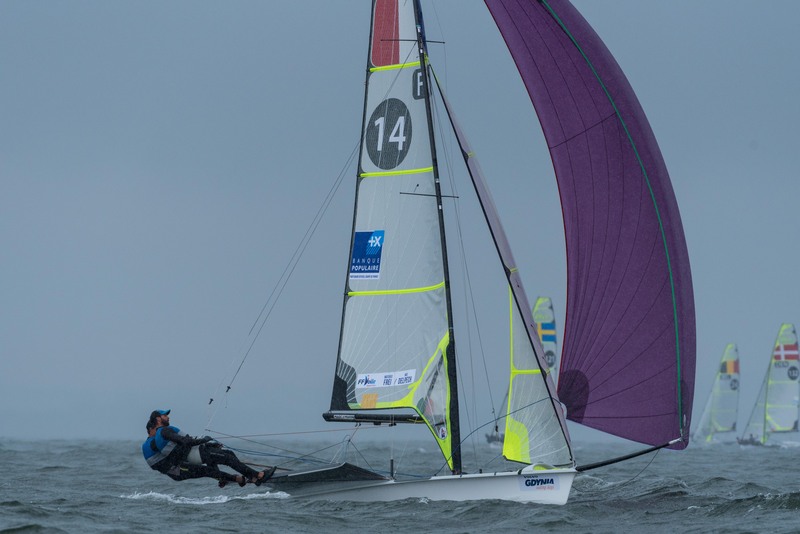 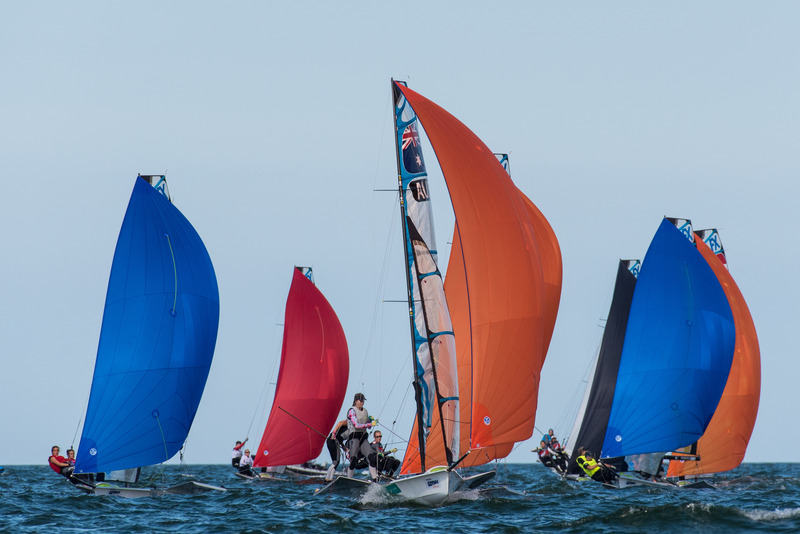 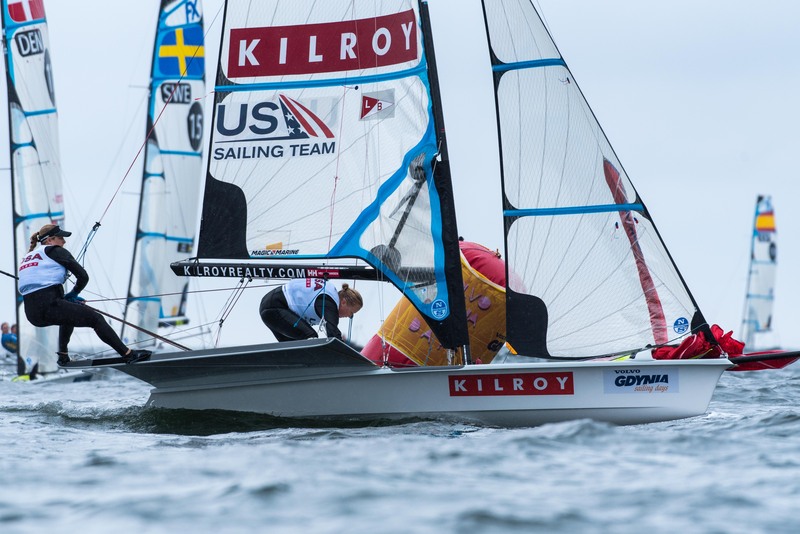 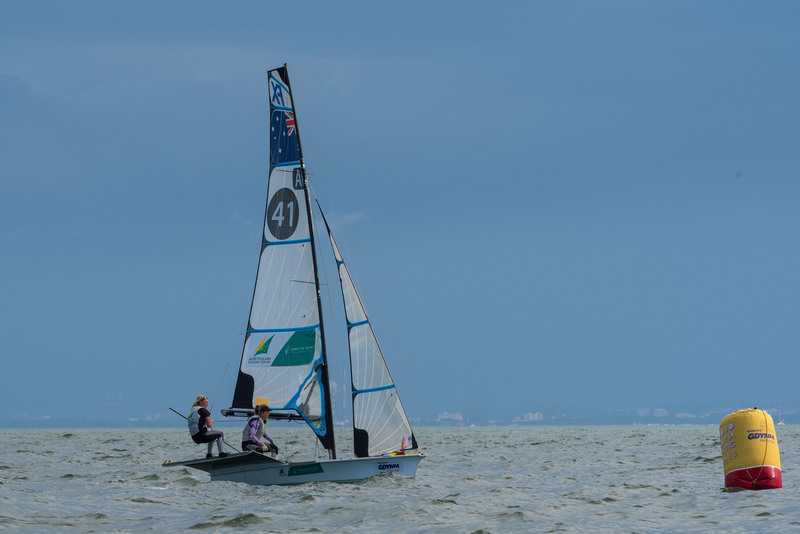 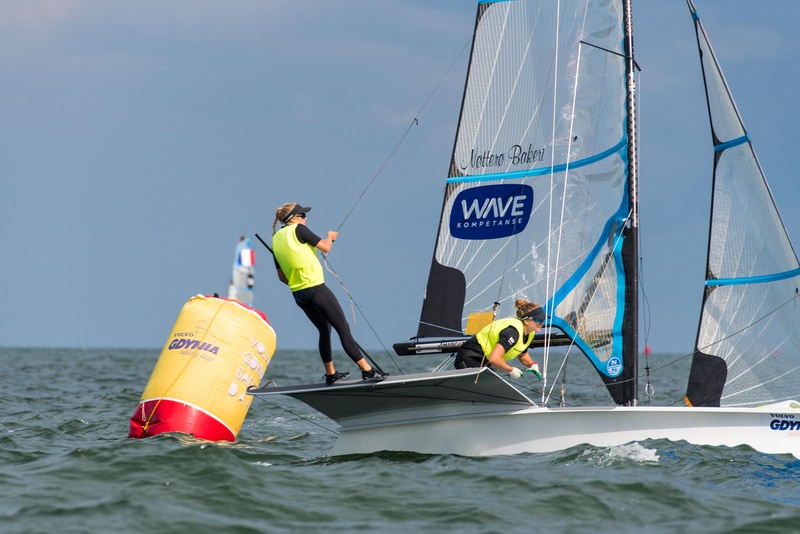 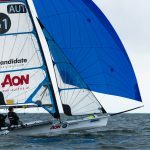 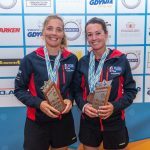 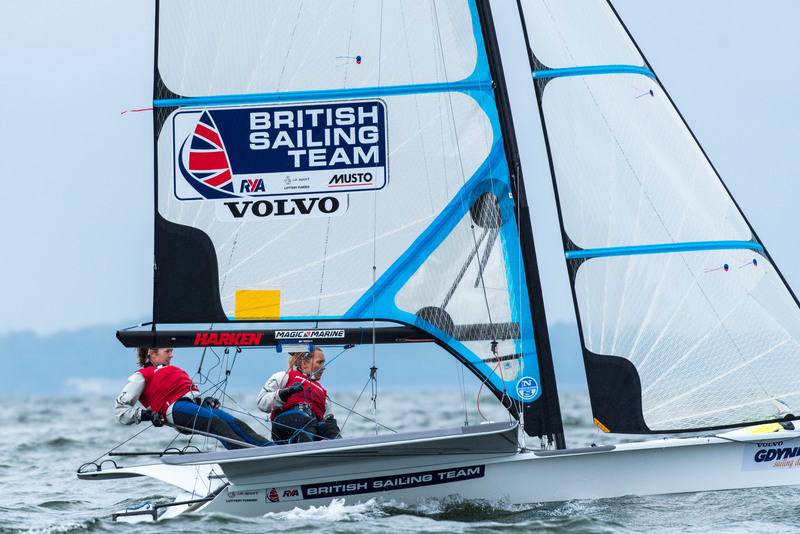 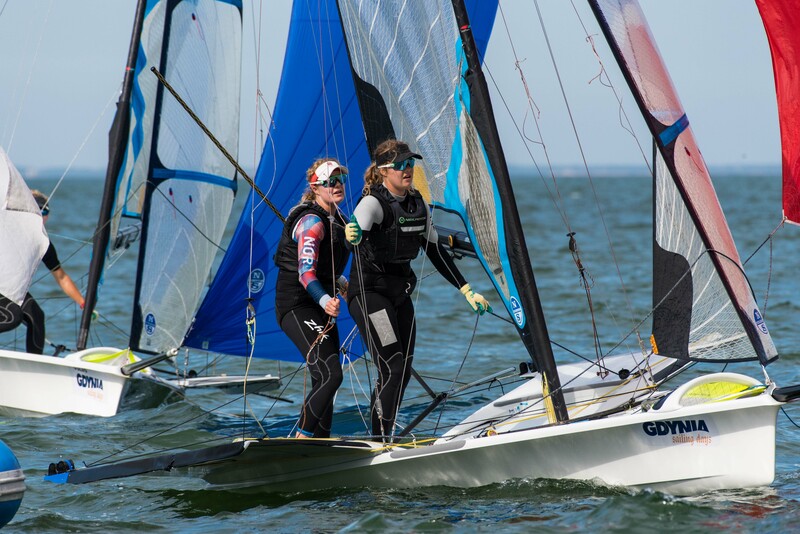 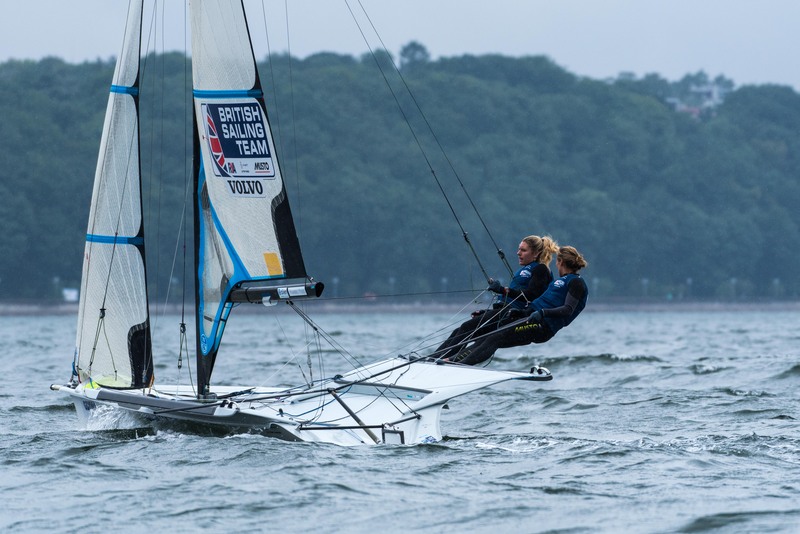 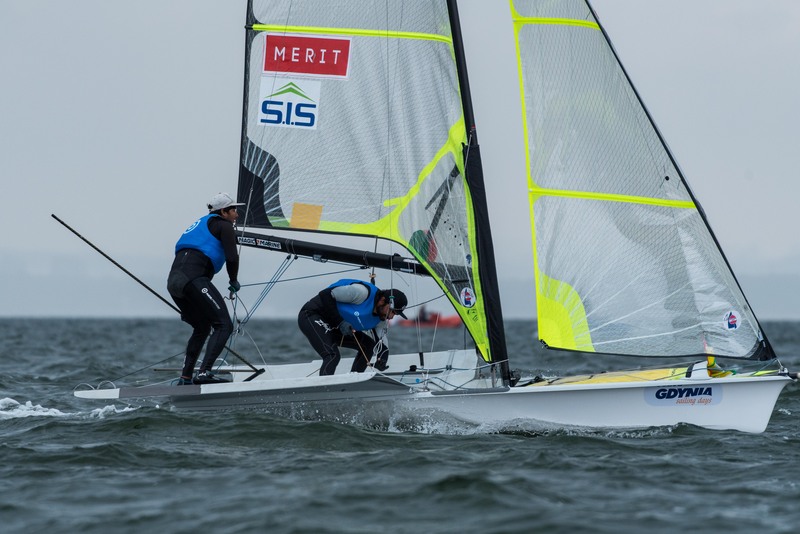 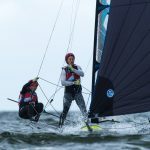 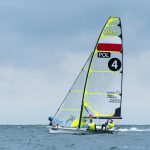 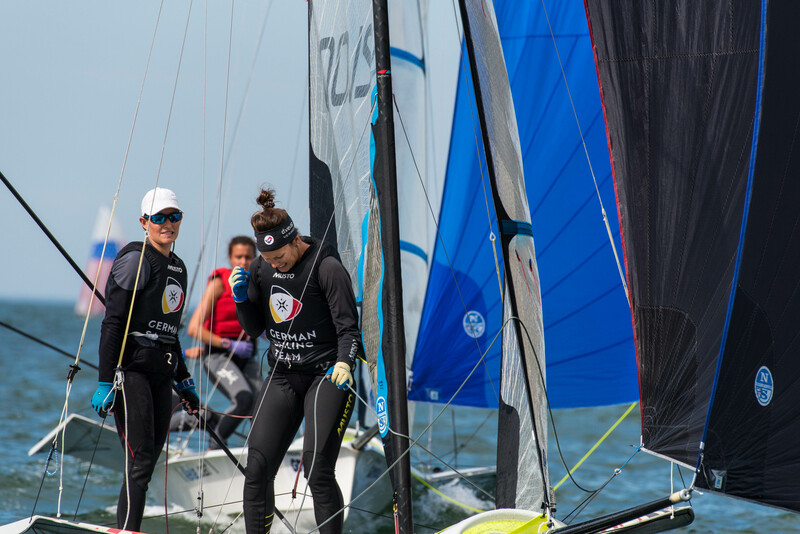 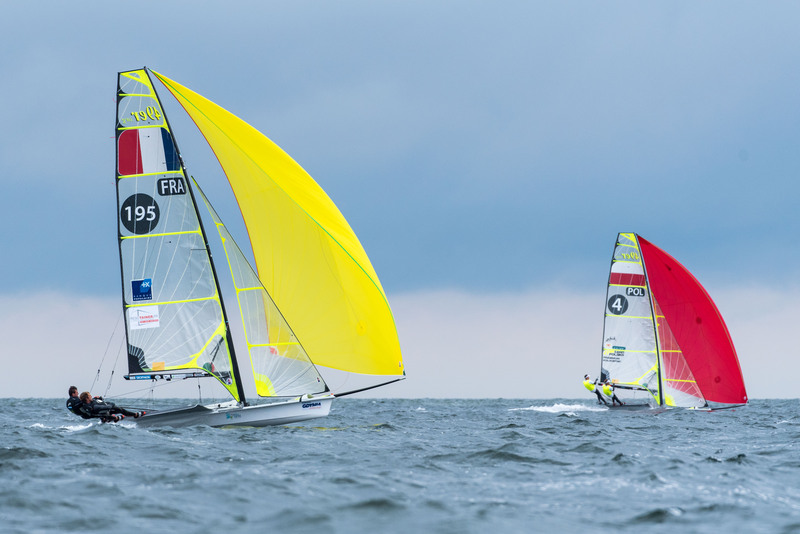 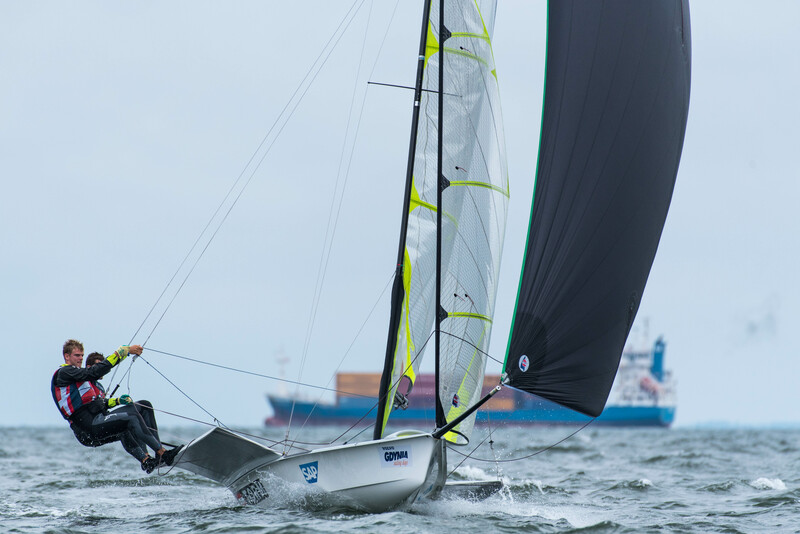 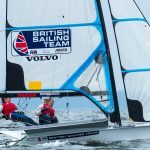 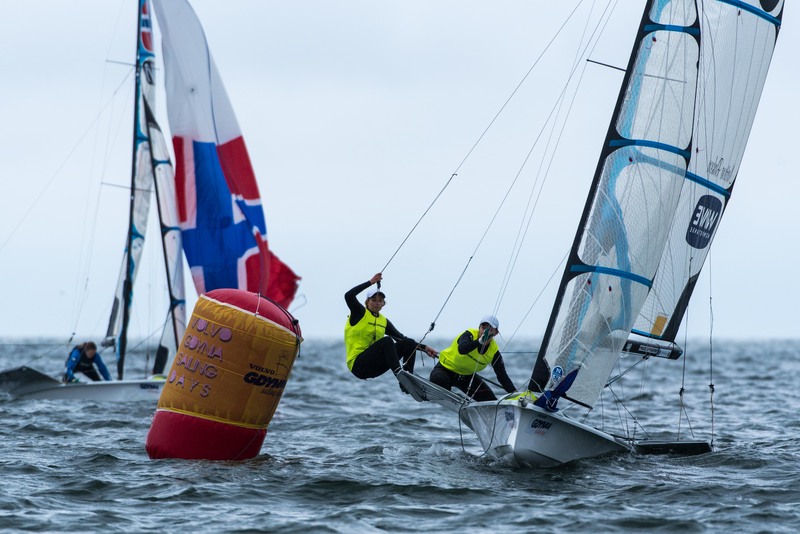 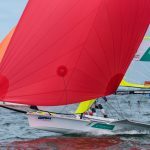 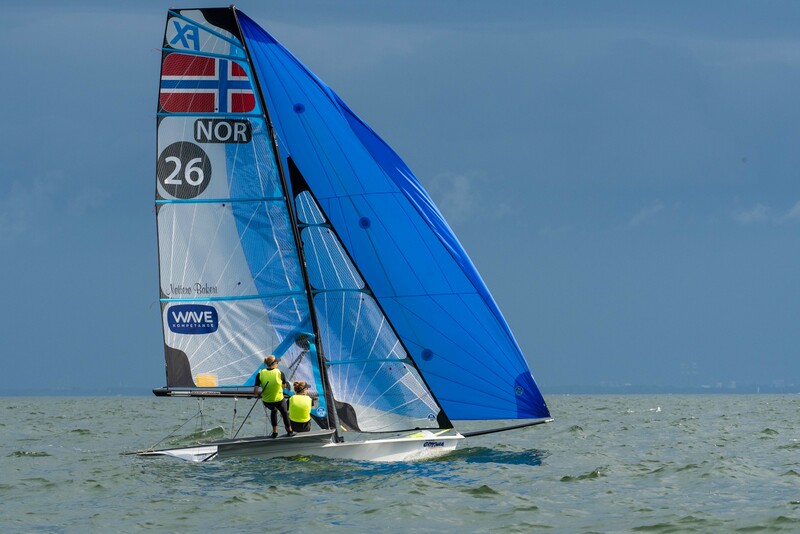 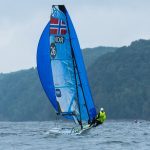 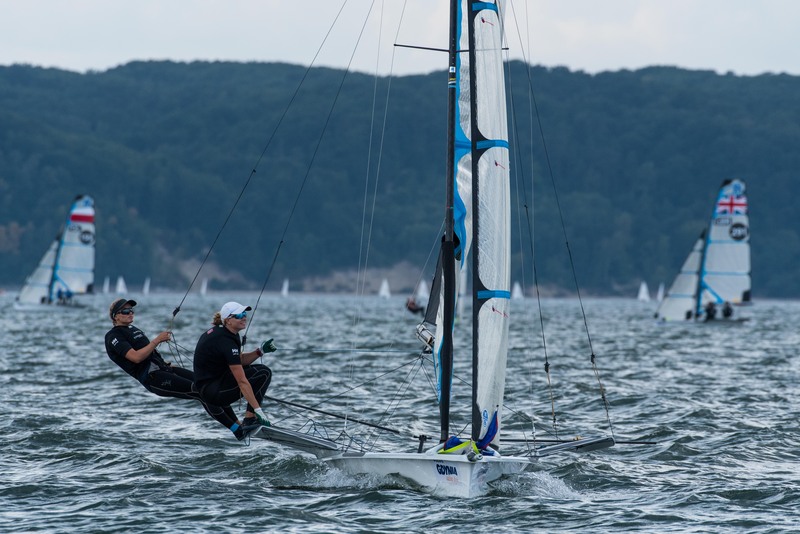 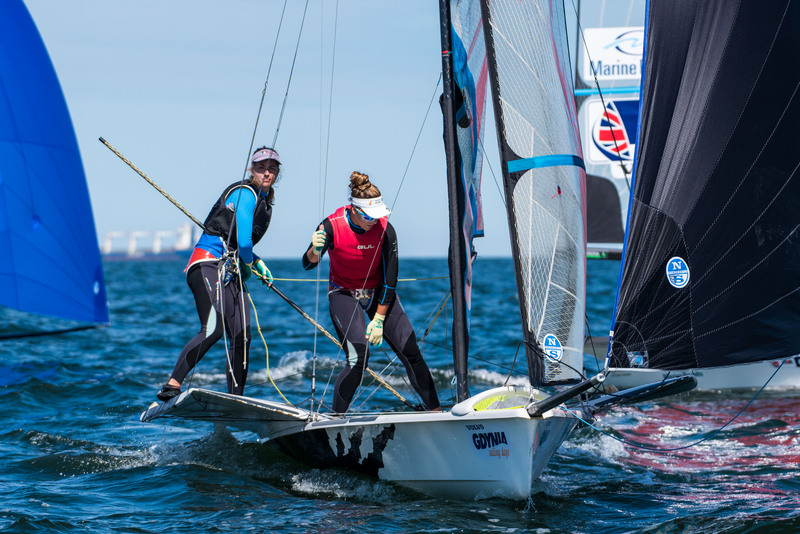 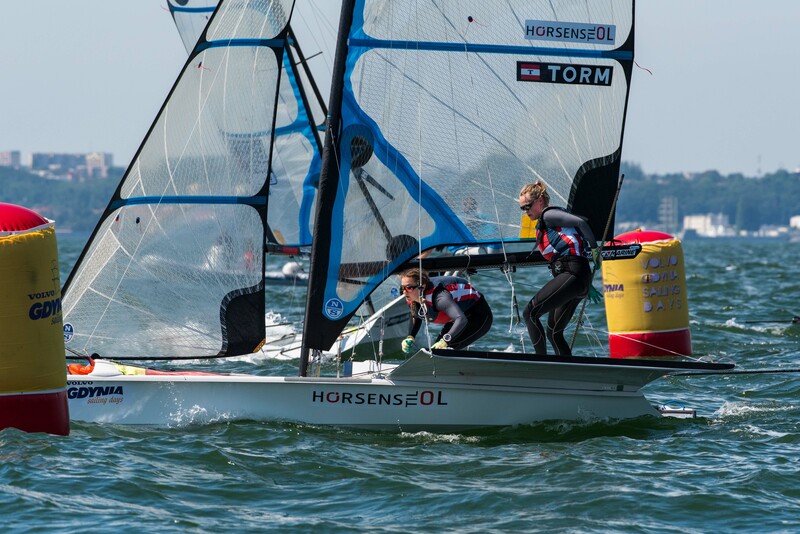 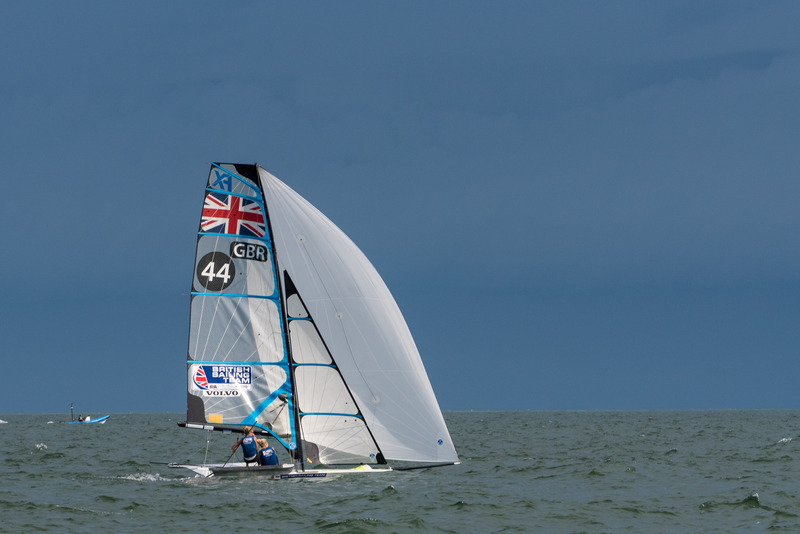 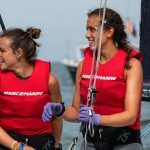 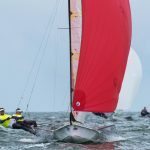 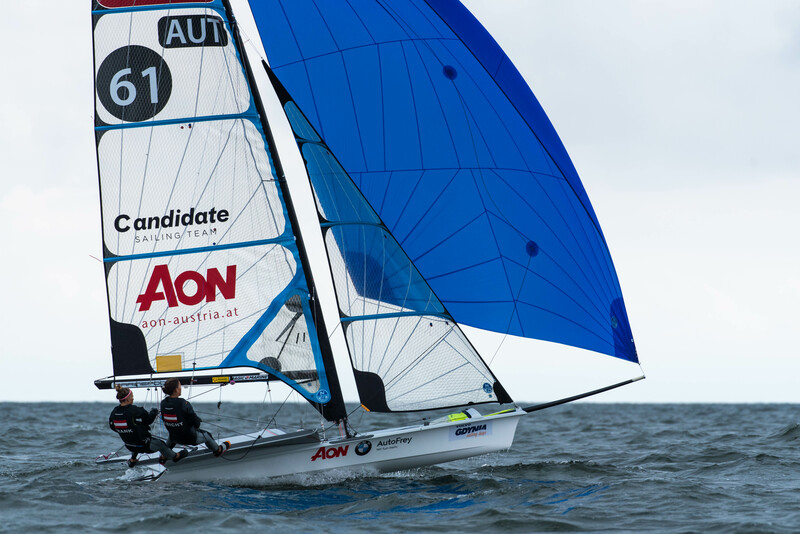 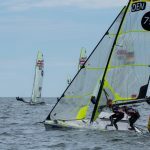 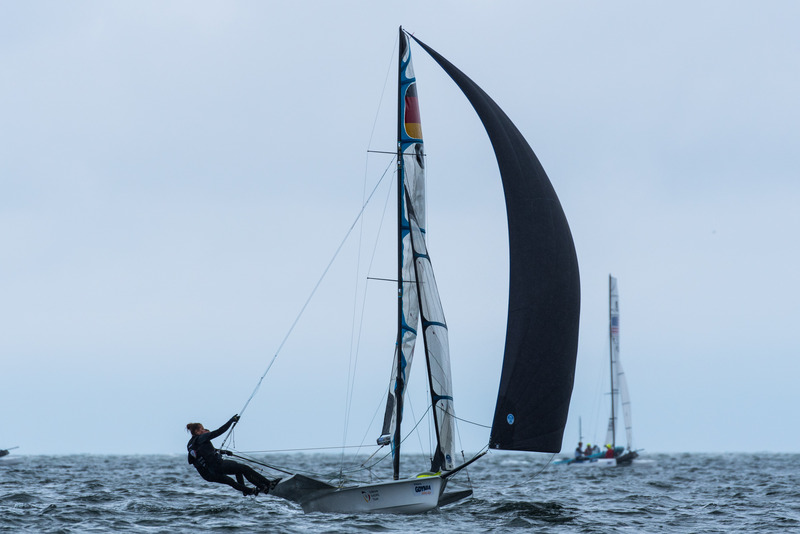 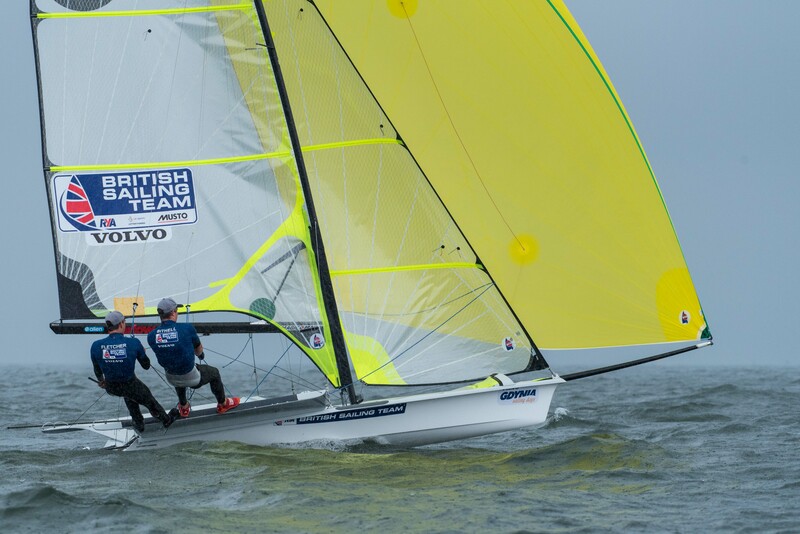 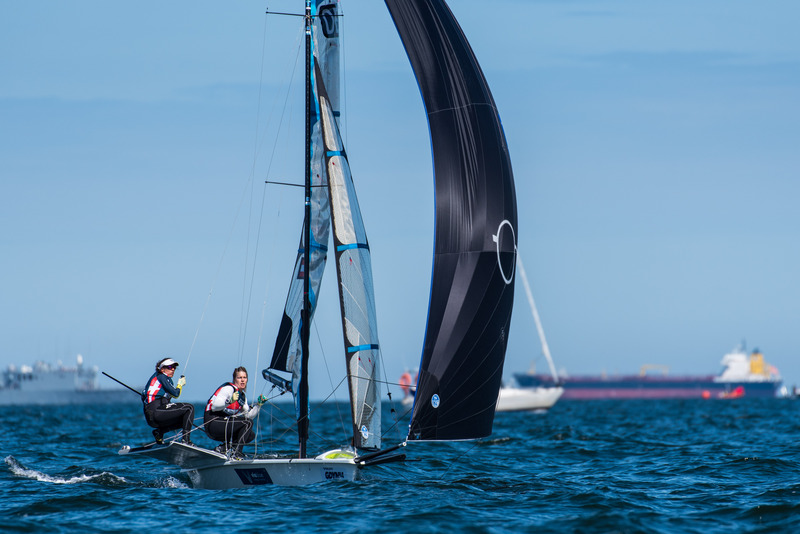 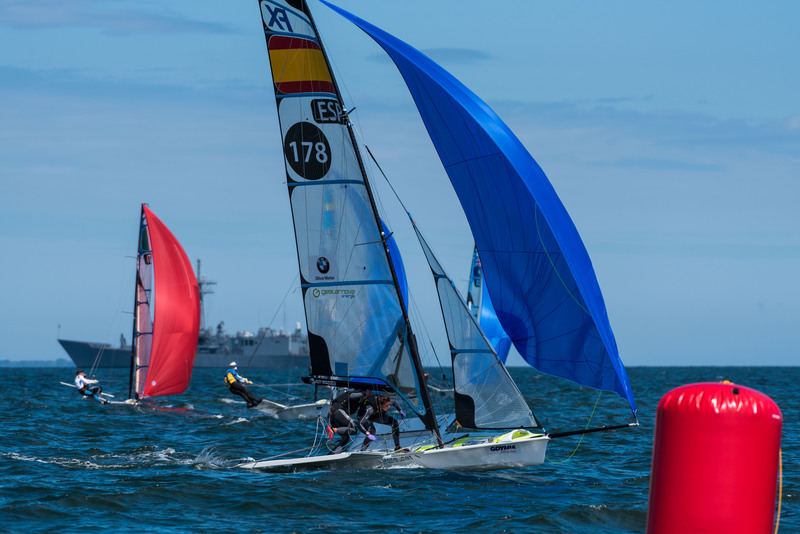 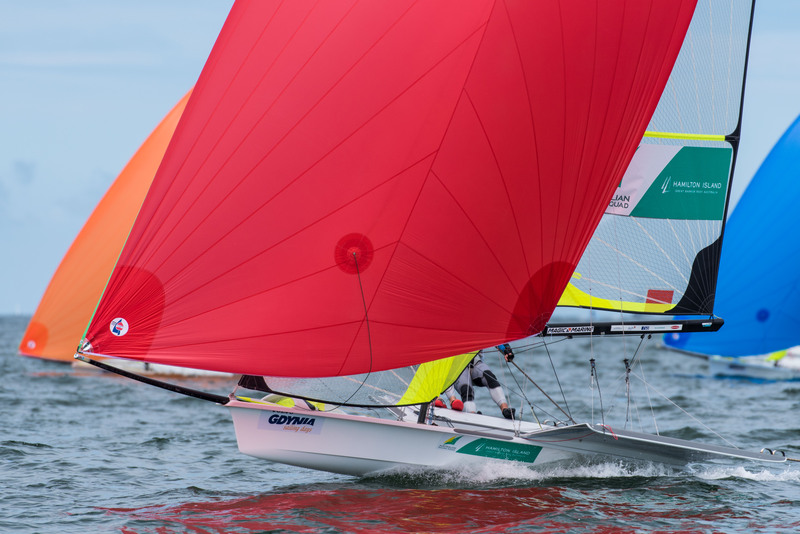 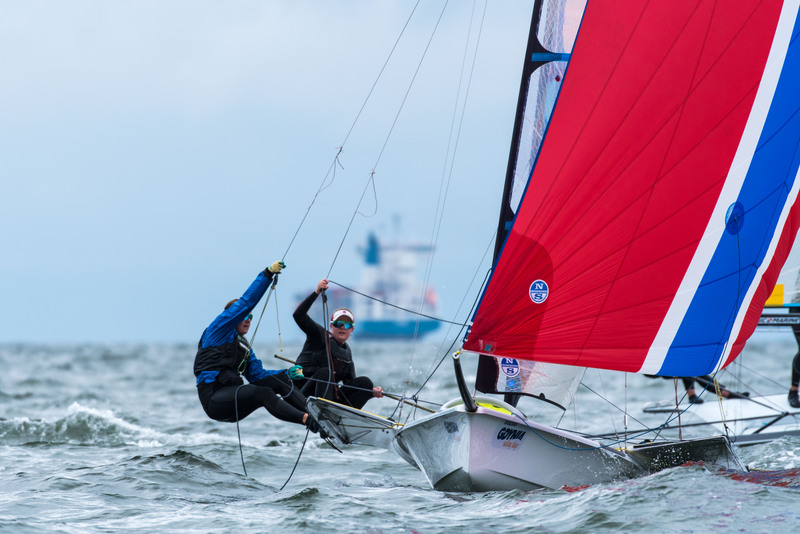 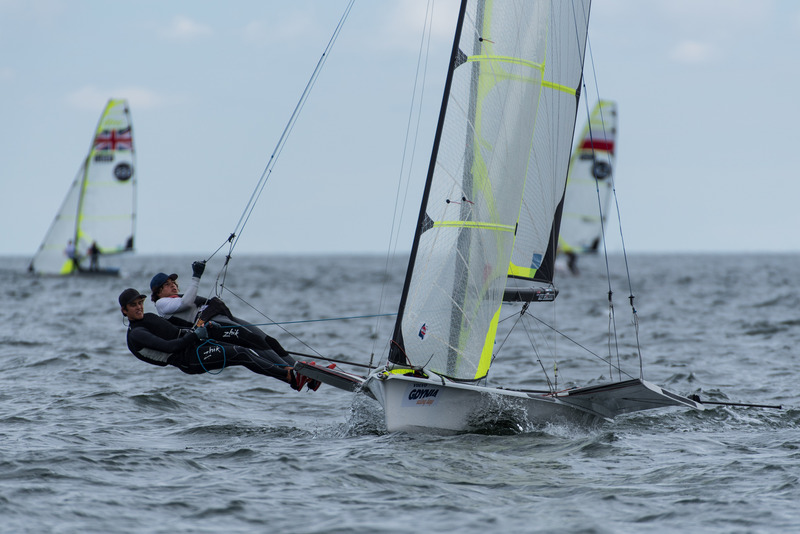 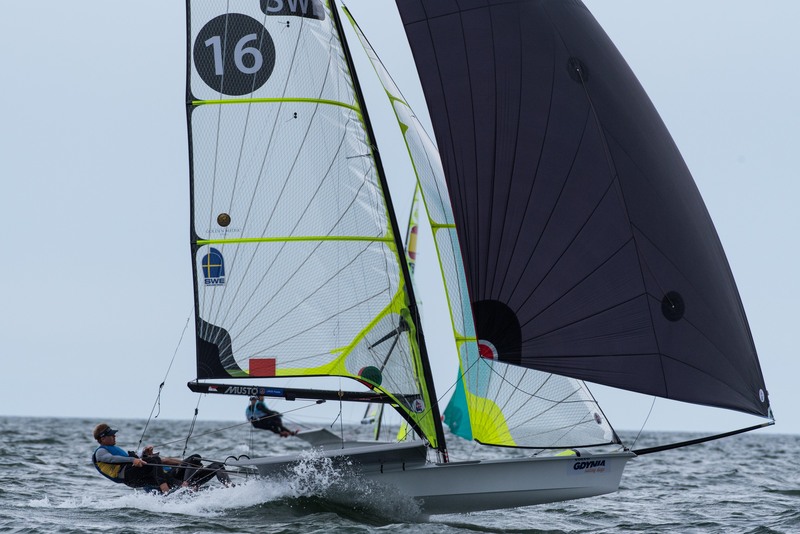 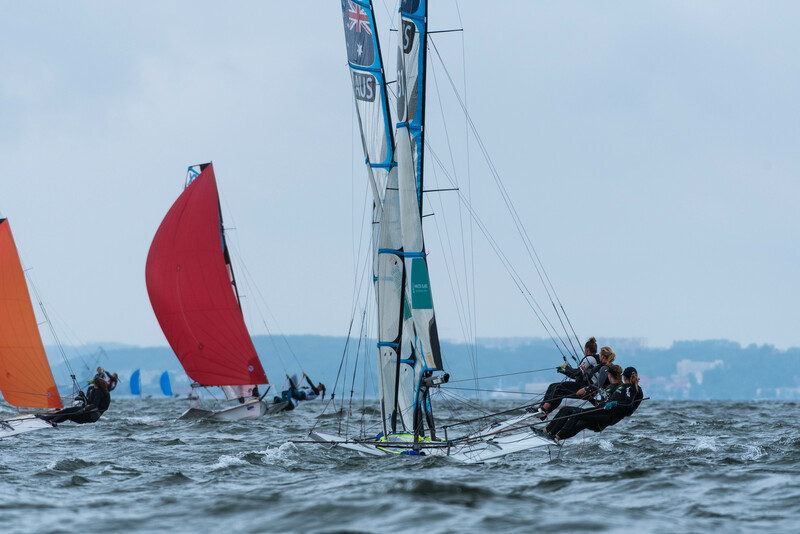 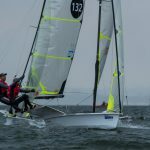 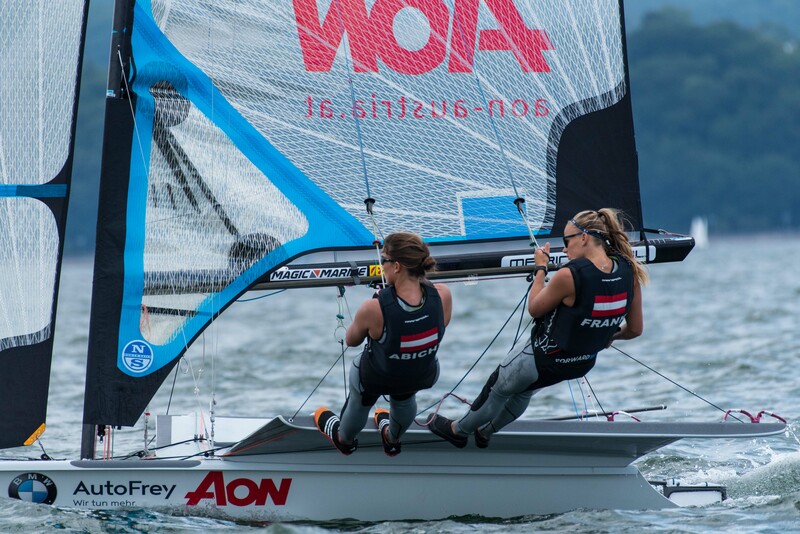 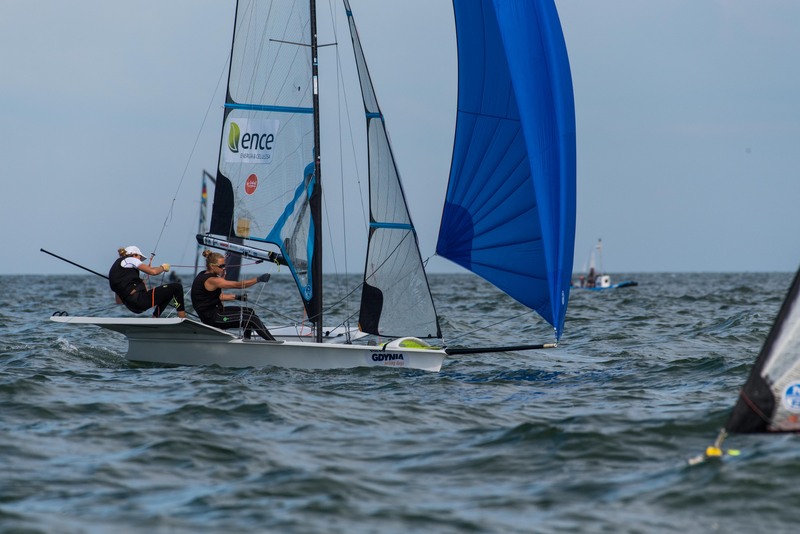 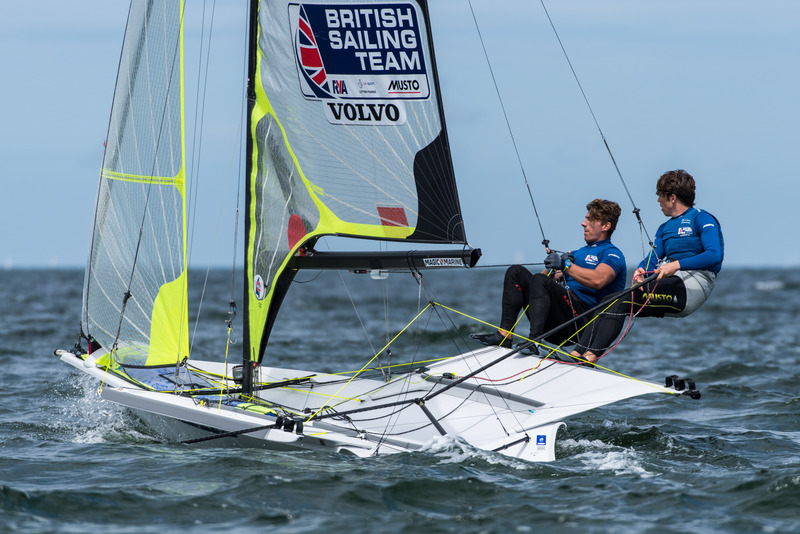 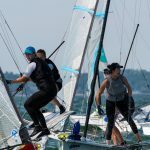 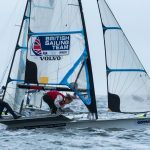 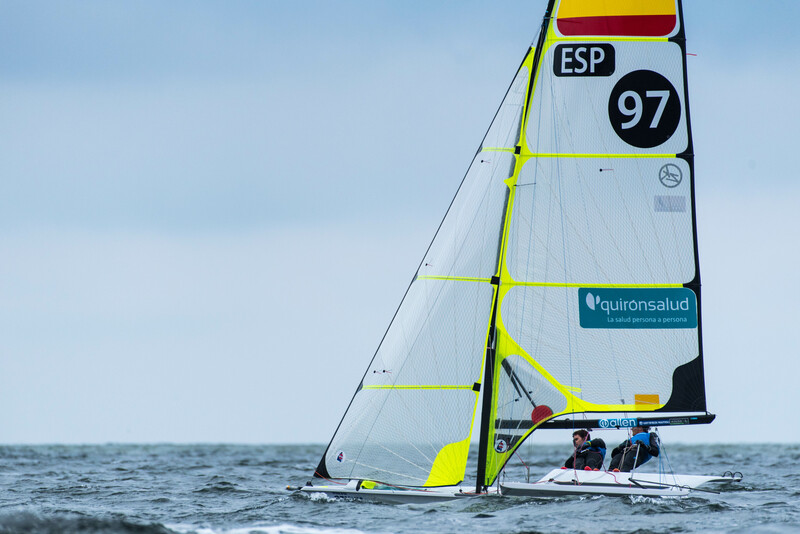 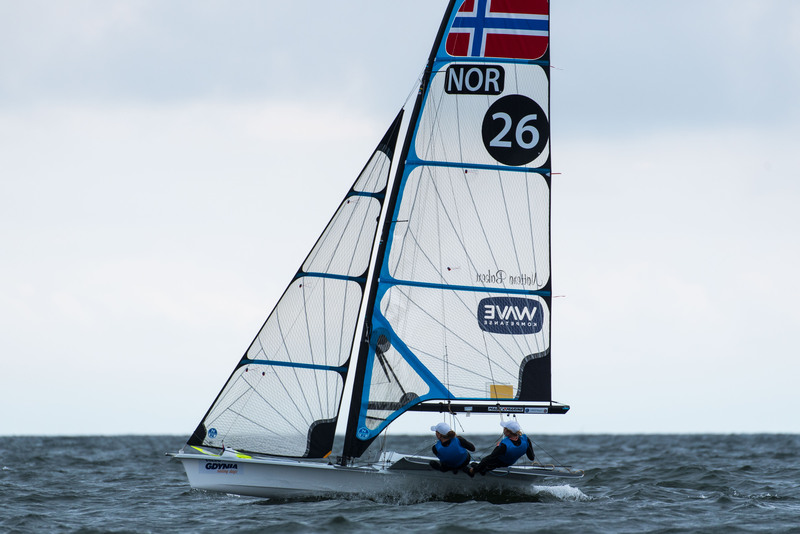 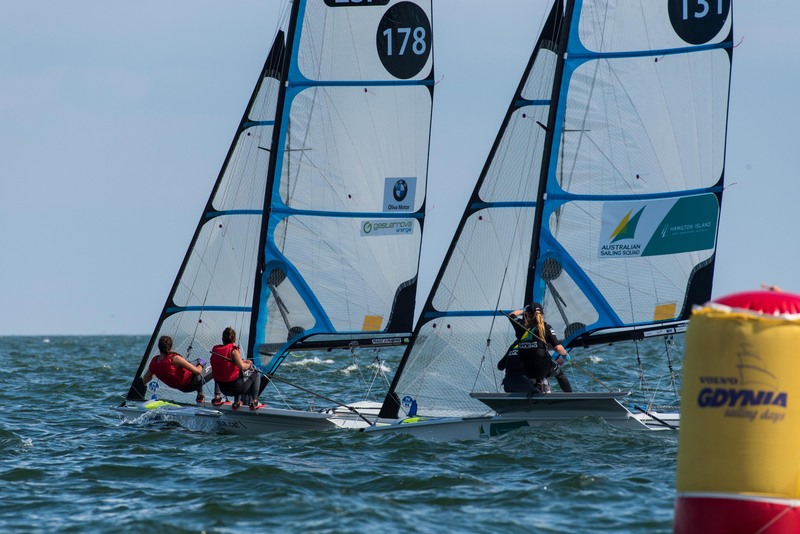 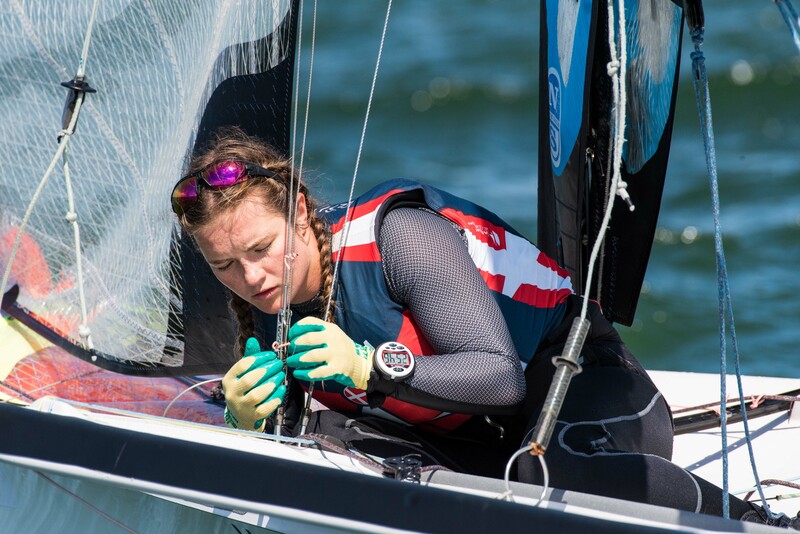 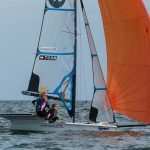 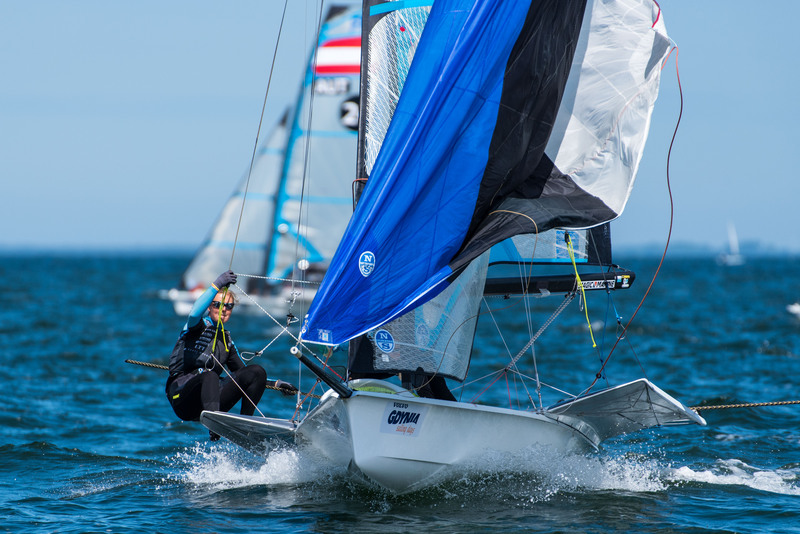 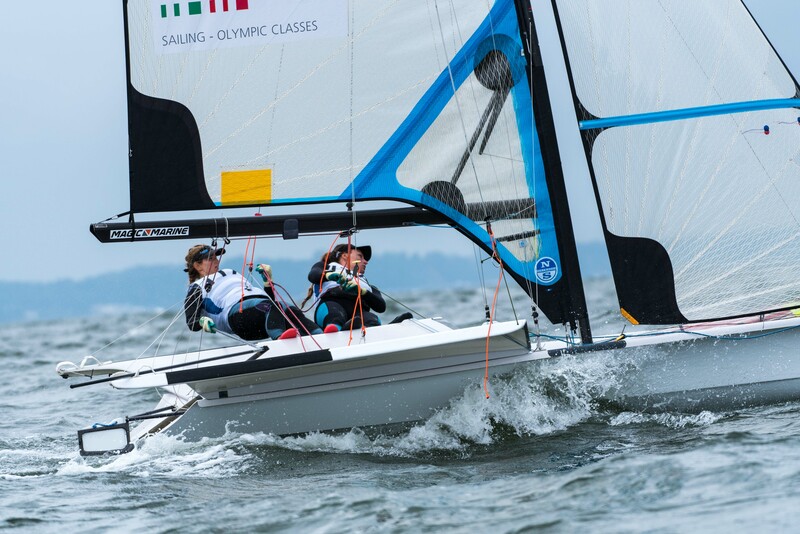 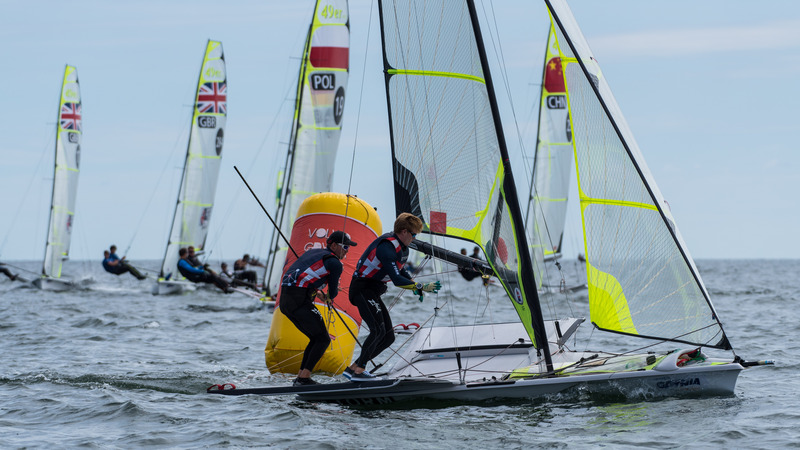 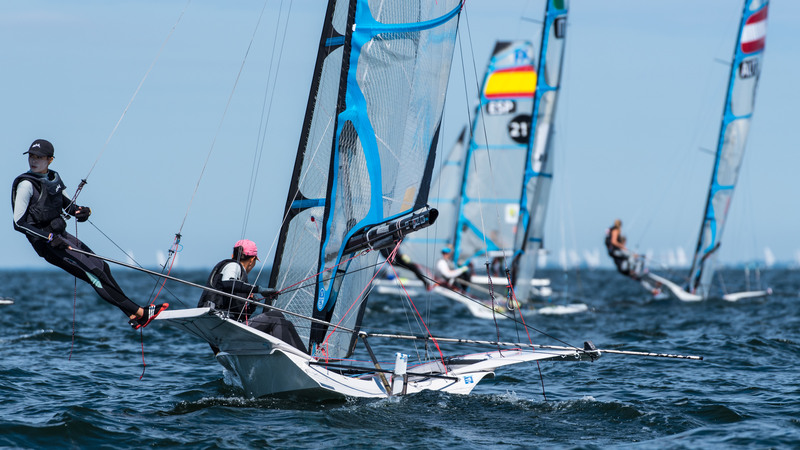 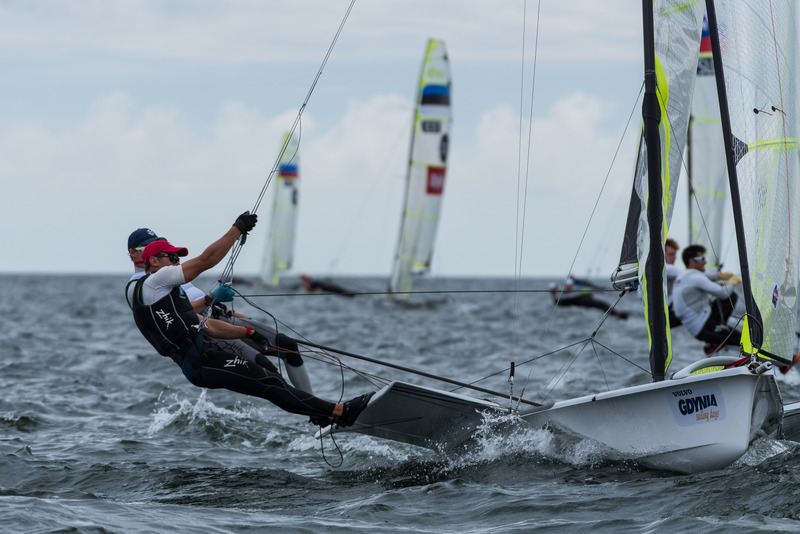 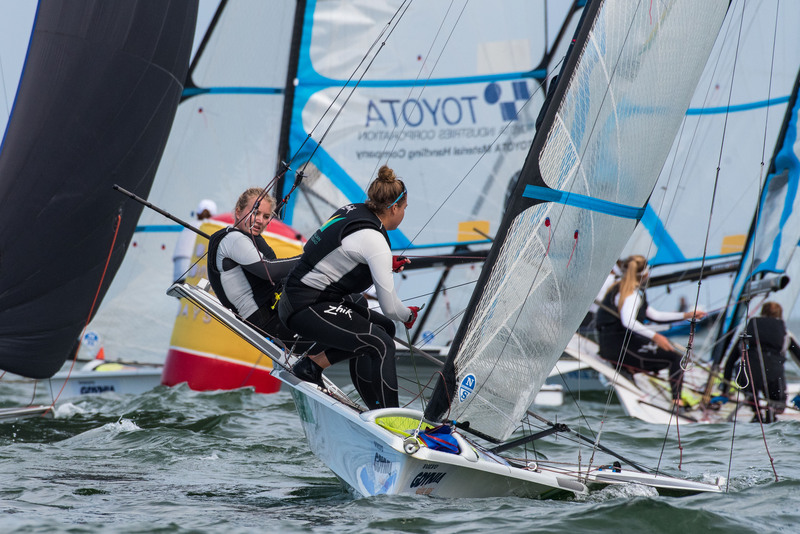 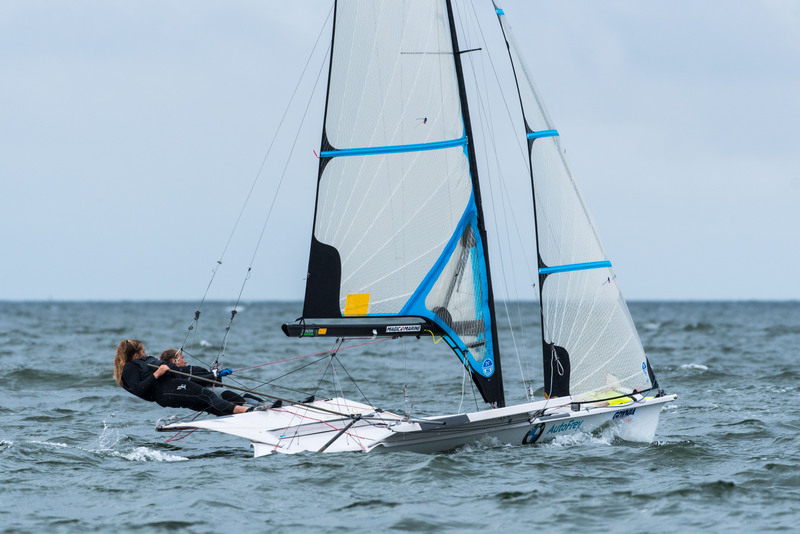 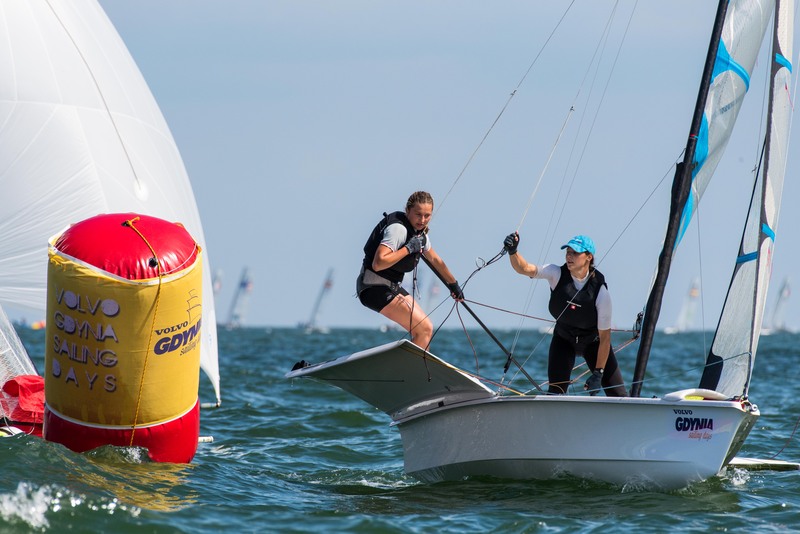 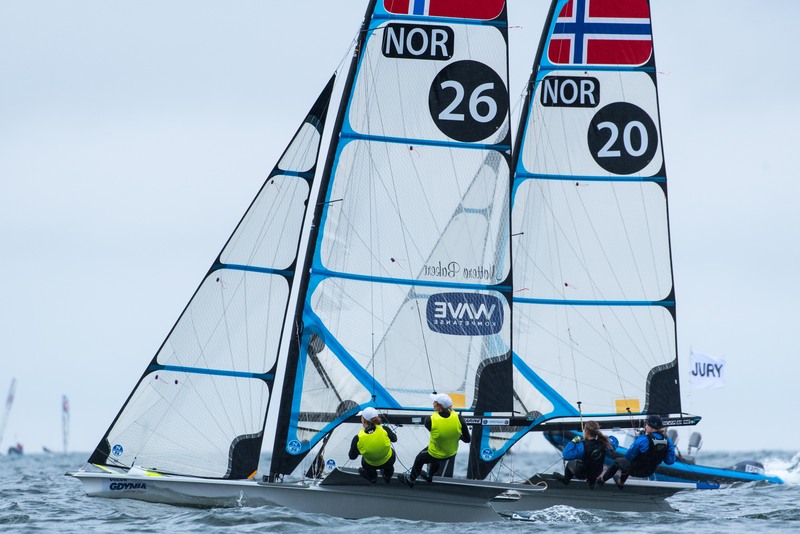 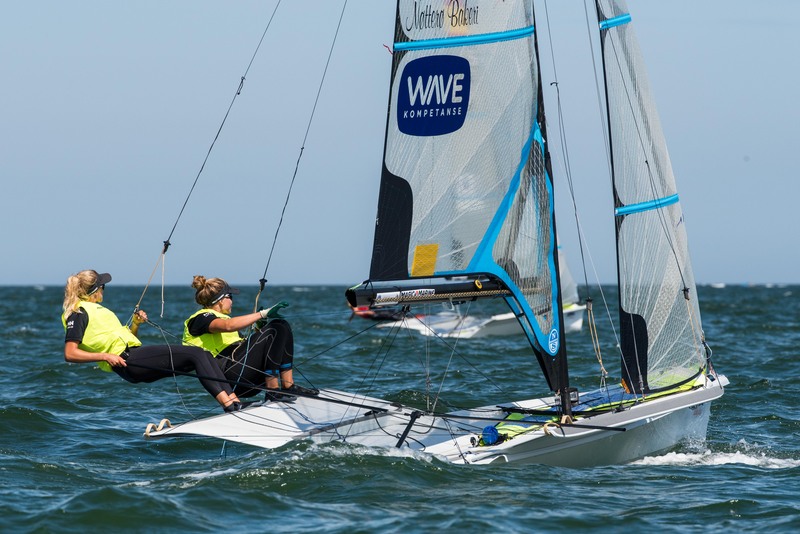 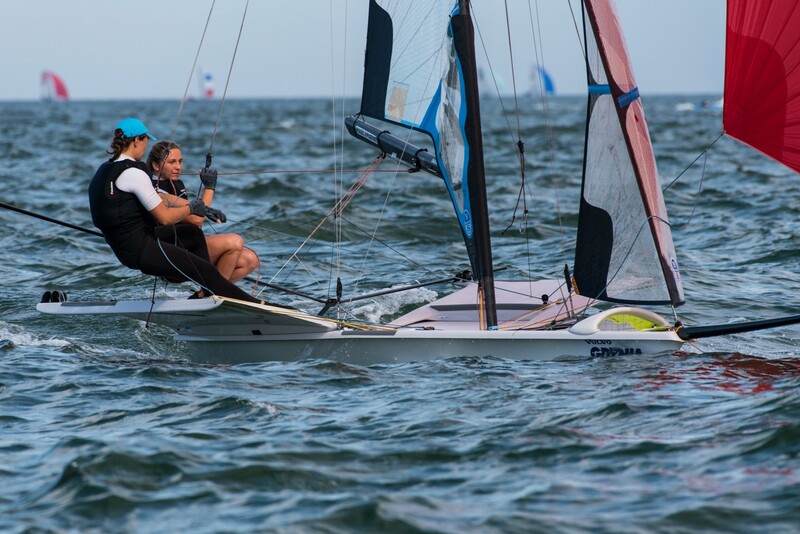 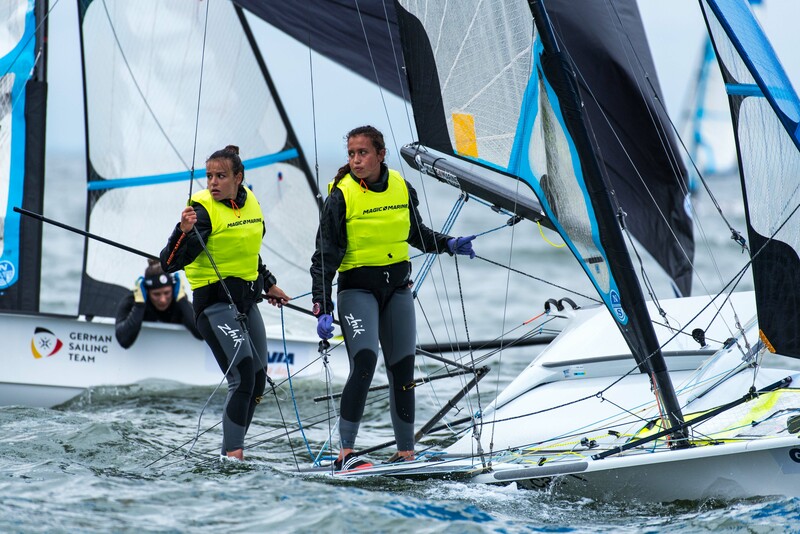 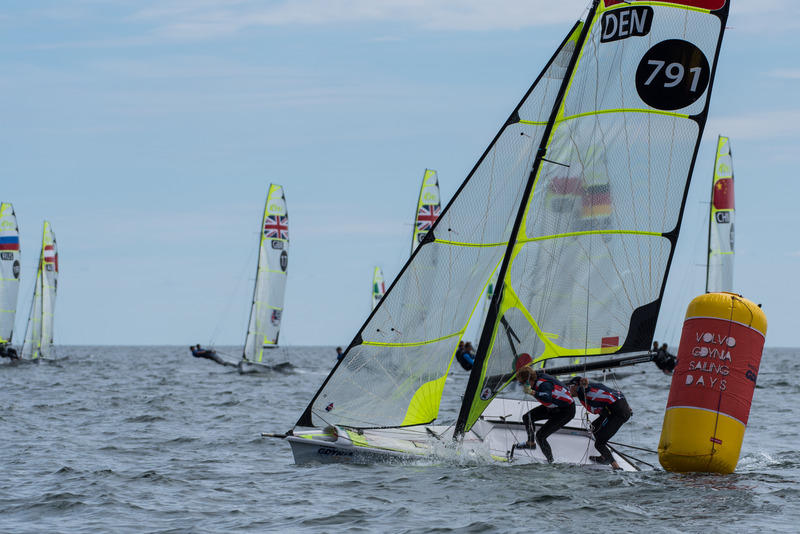 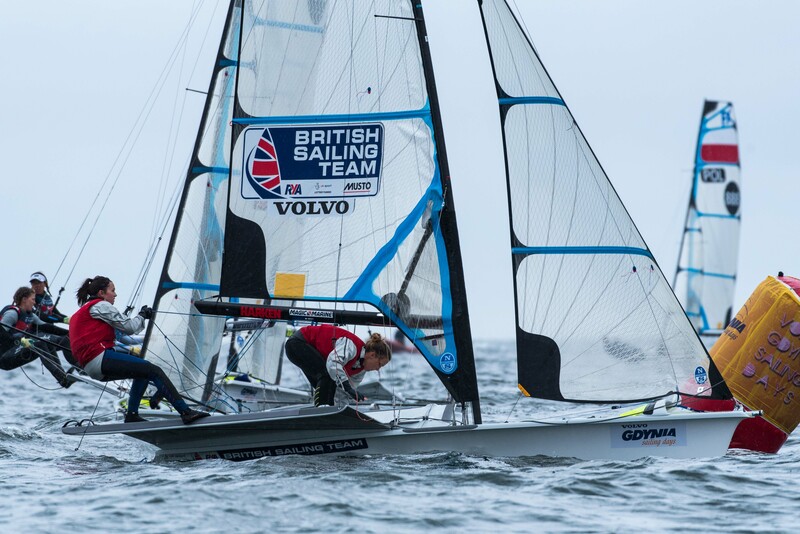 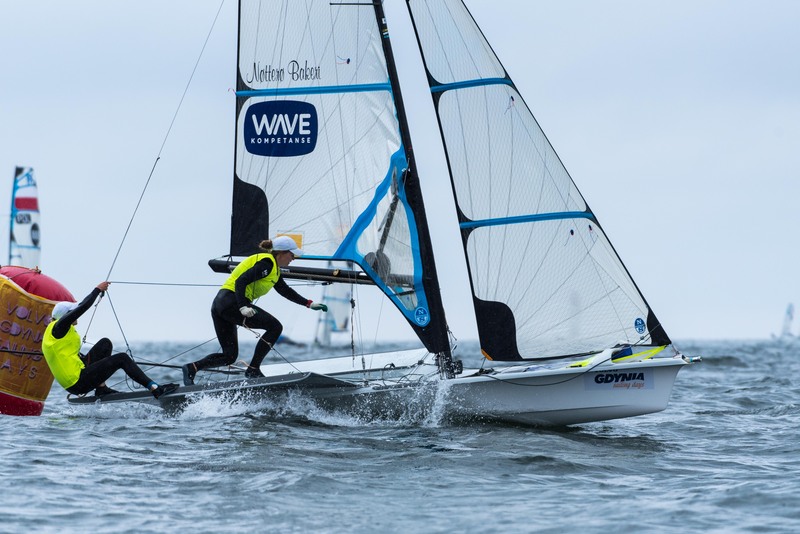 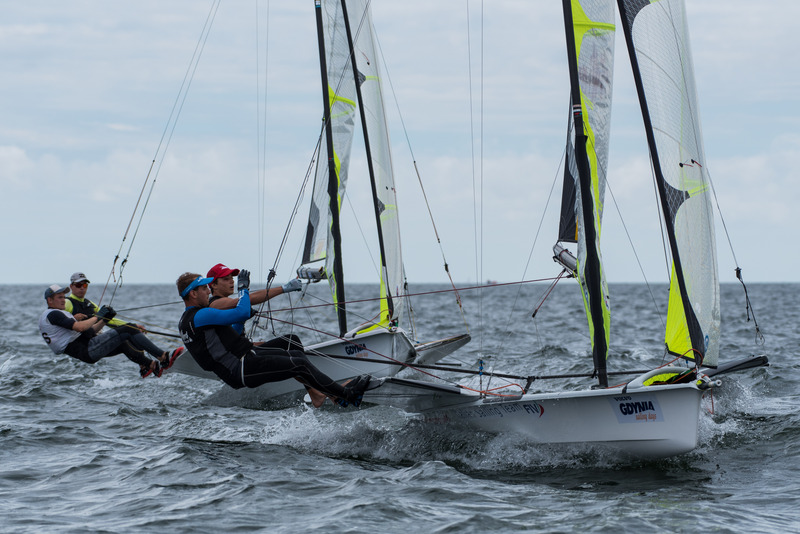 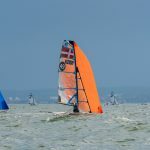 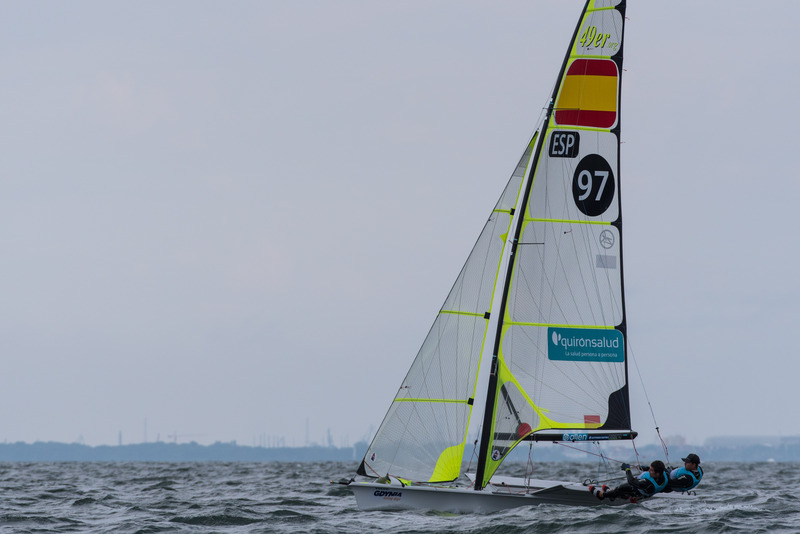 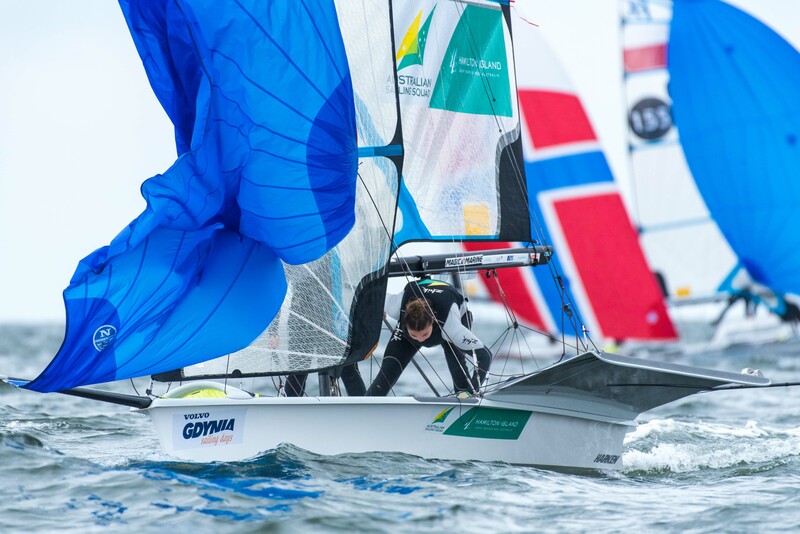 They are being chased hard by a newly formed British team of Sofie Weguelun and Sophie Ainsworth who finished 4th at Kiel week, more than 10 places higher than their countrywomen. 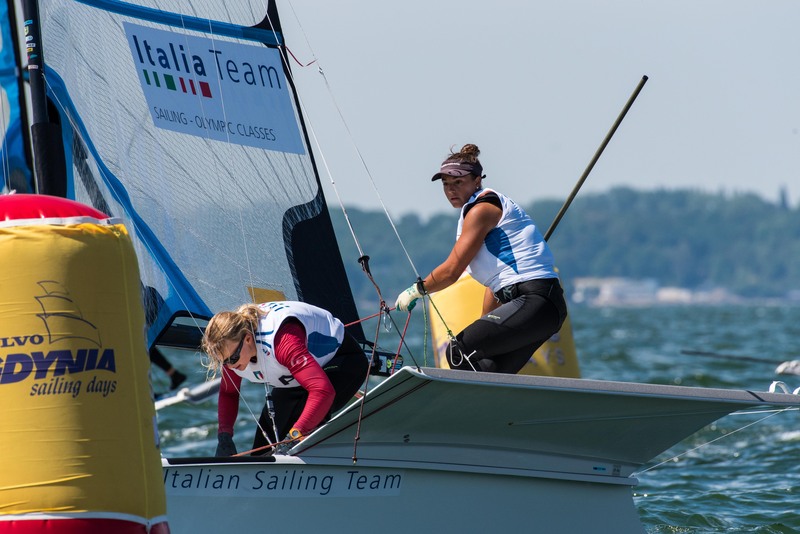 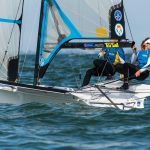 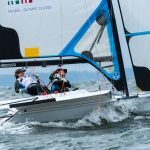 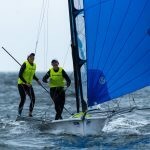 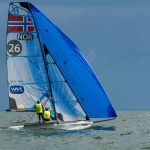 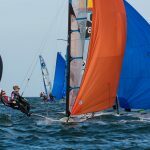 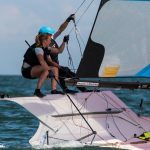 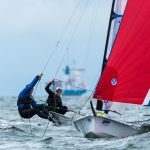 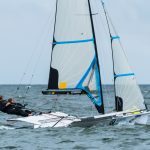 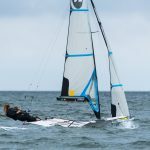 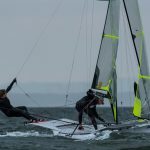 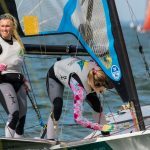 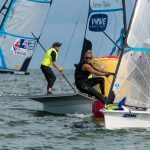 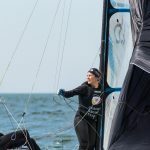 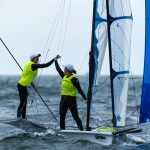 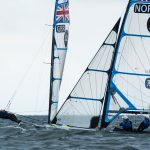 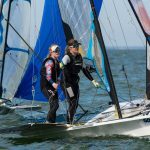 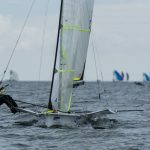 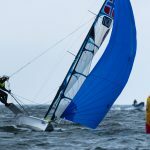 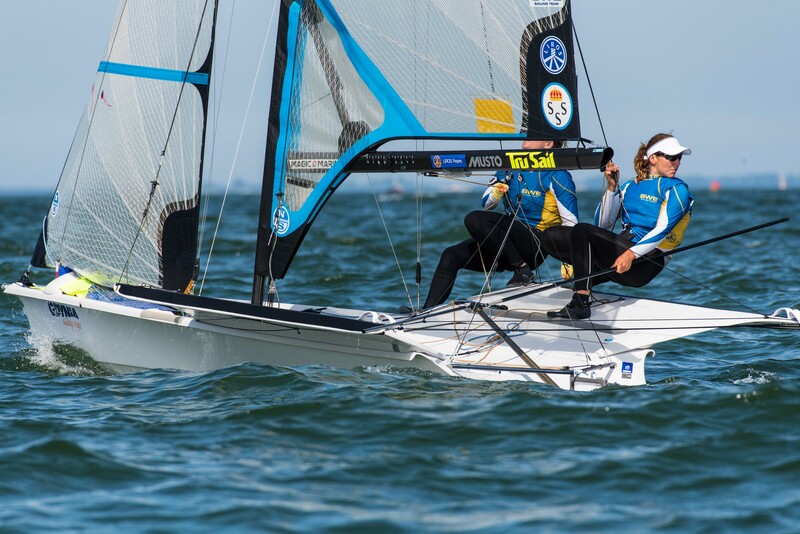 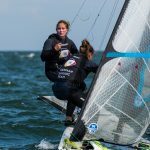 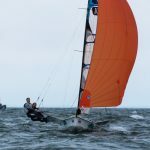 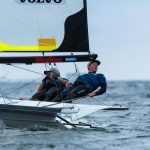 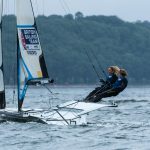 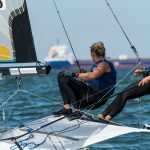 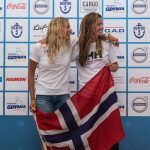 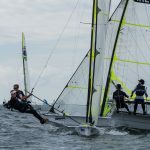 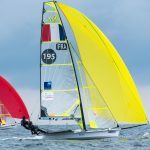 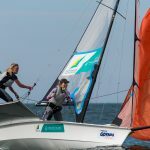 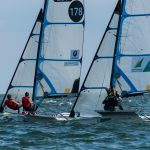 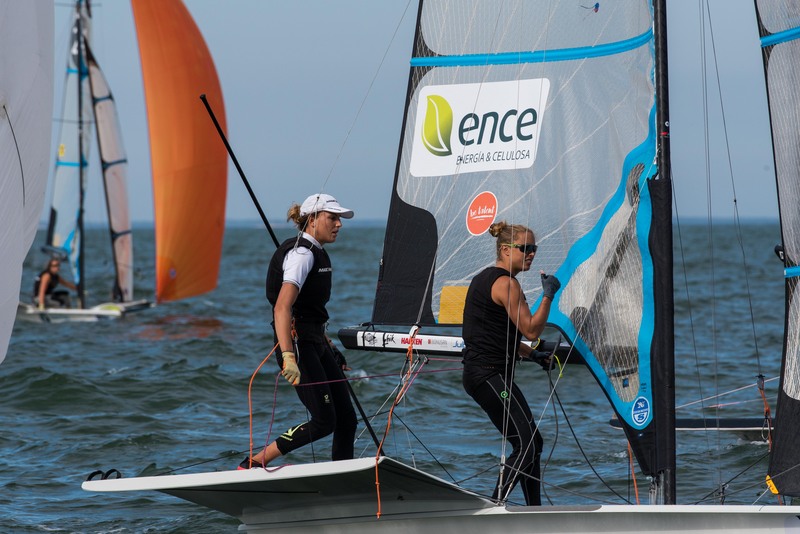 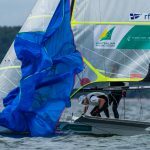 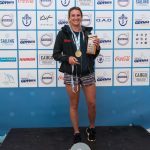 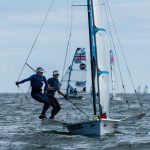 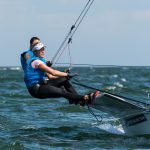 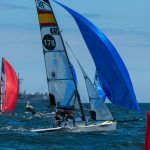 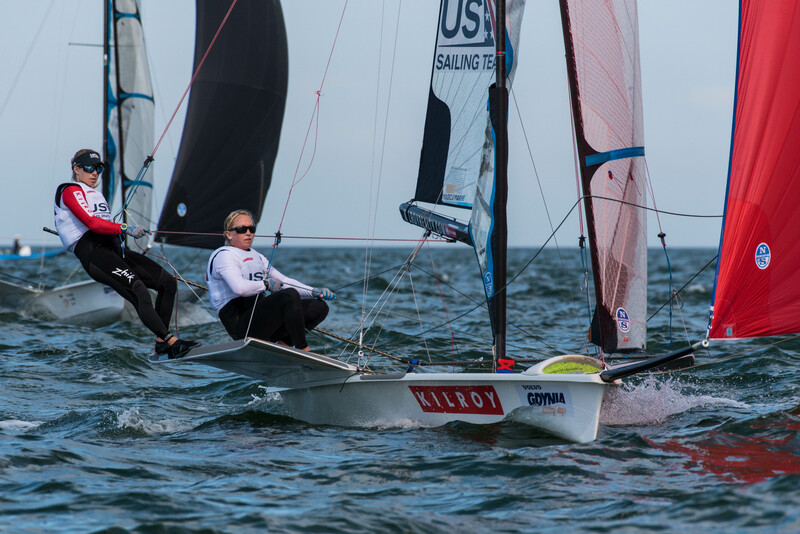 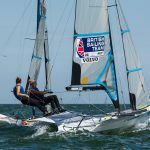 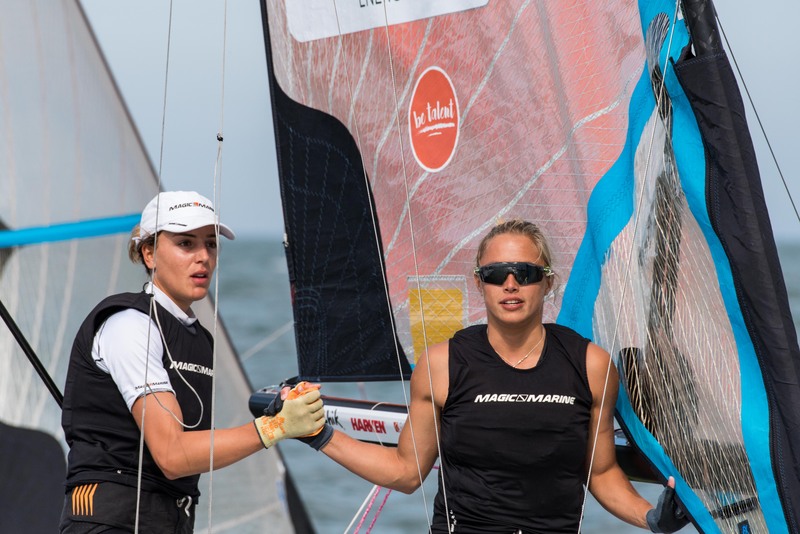 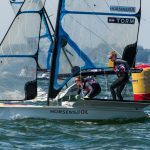 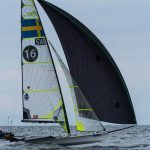 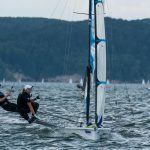 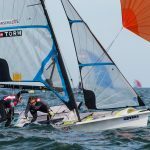 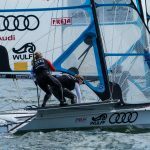 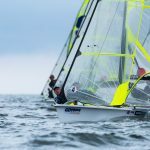 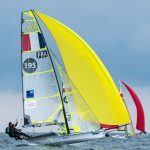 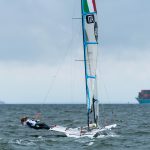 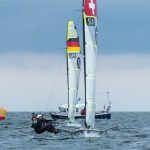 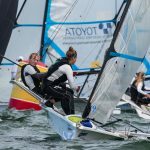 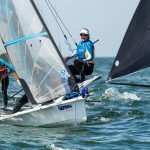 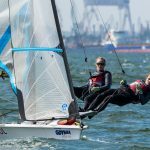 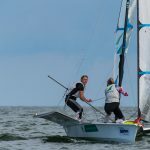 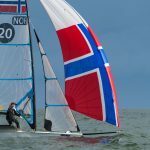 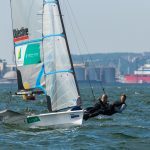 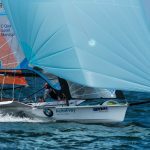 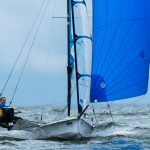 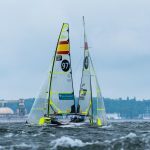 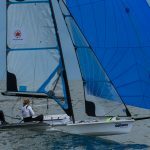 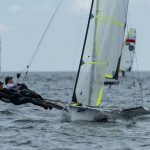 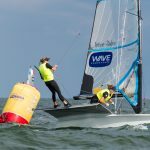 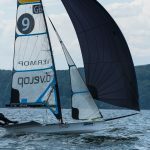 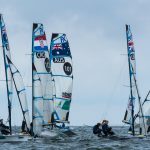 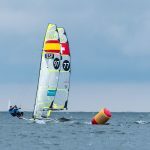 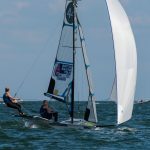 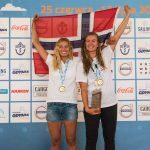 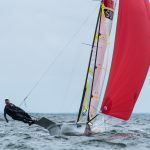 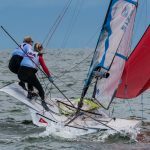 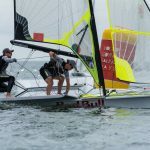 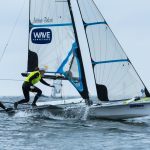 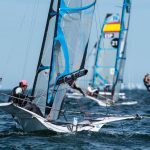 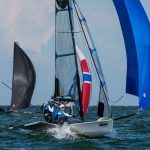 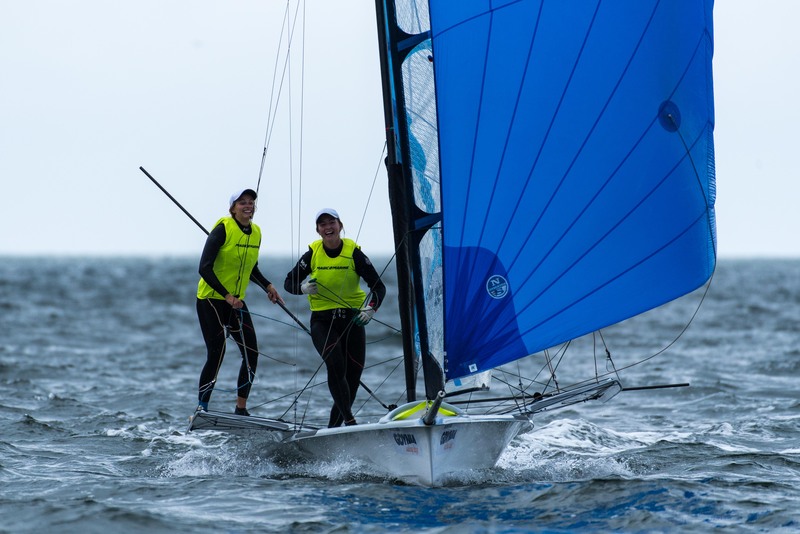 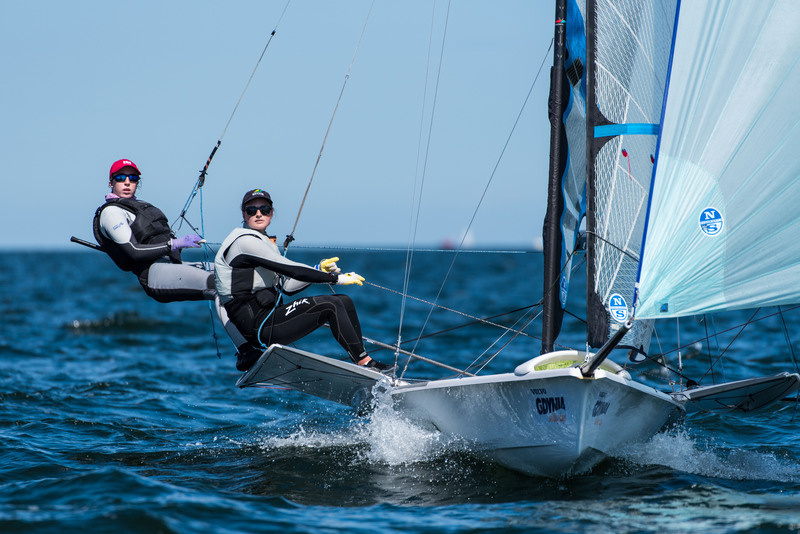 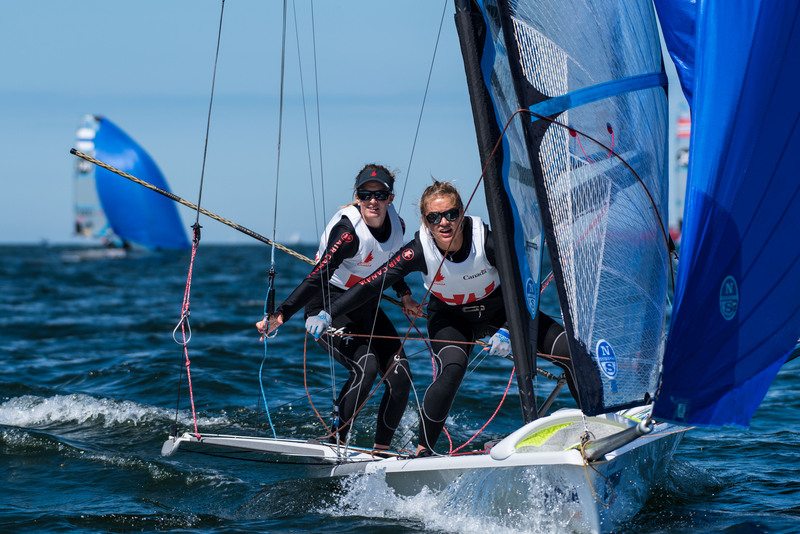 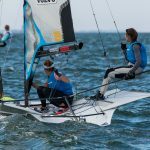 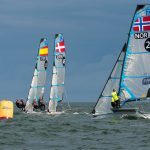 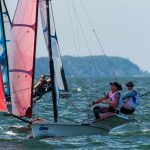 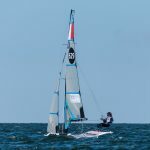 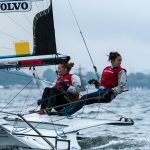 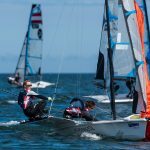 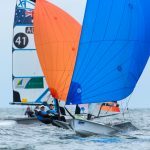 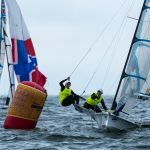 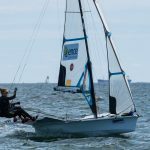 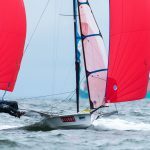 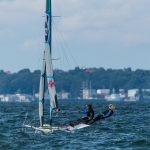 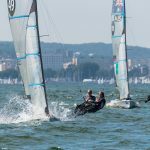 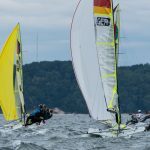 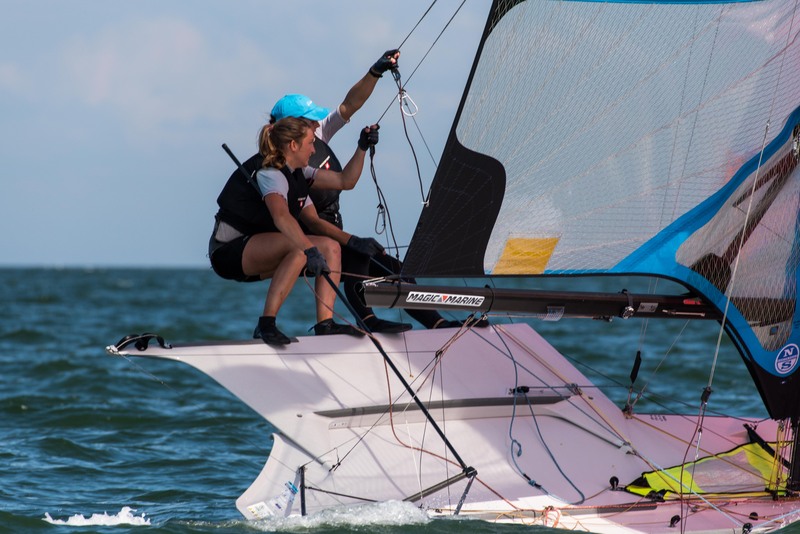 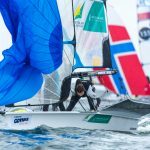 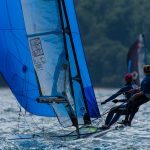 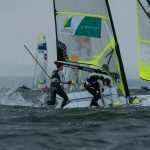 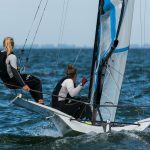 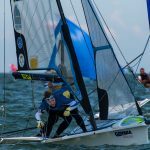 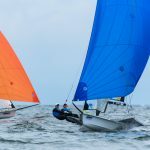 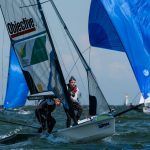 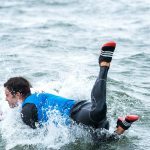 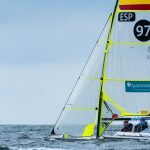 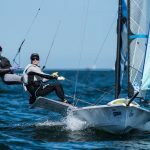 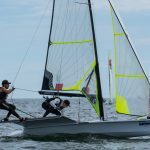 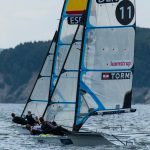 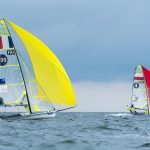 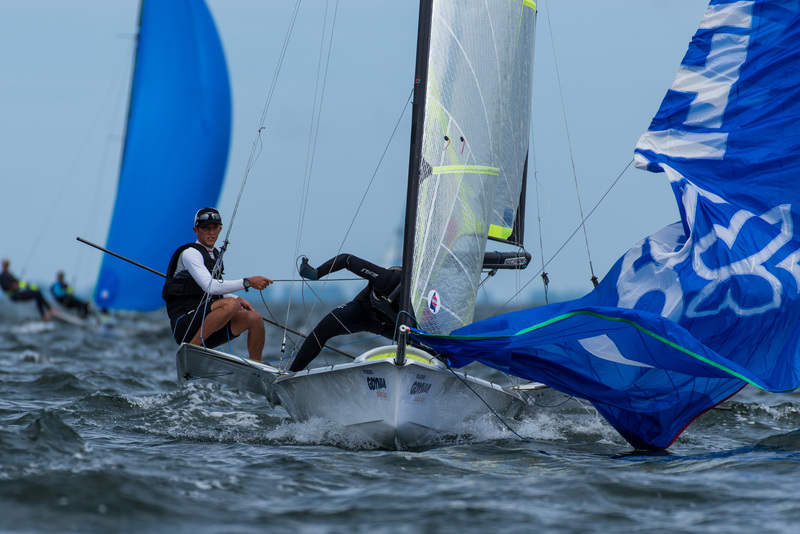 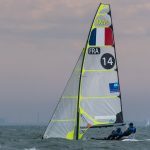 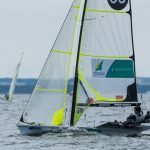 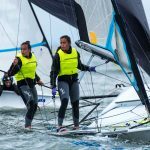 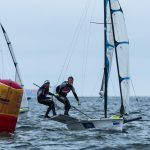 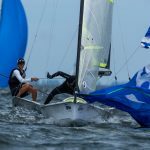 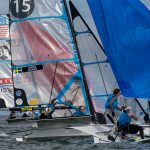 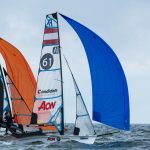 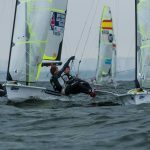 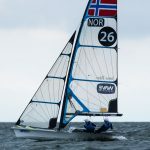 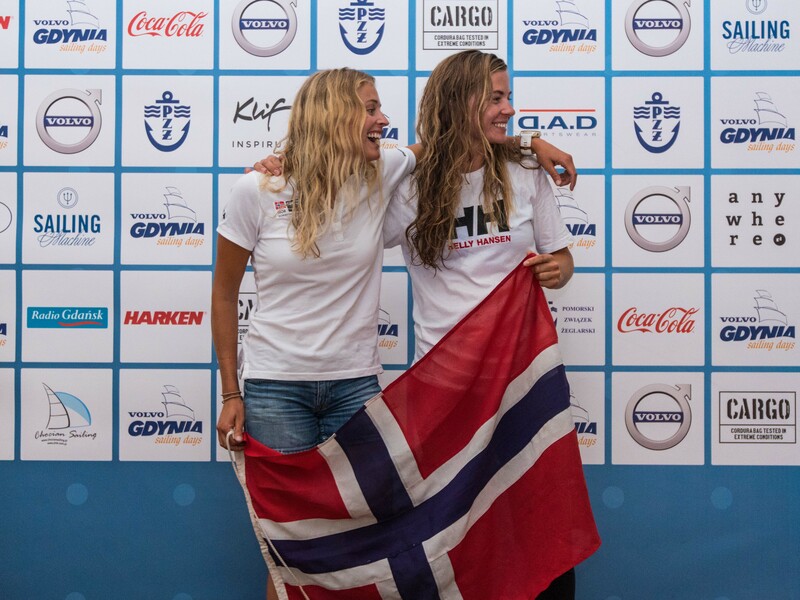 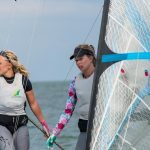 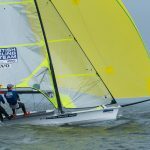 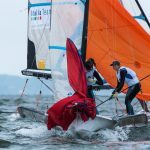 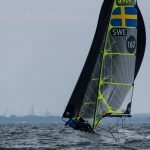 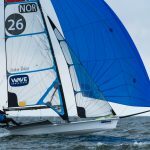 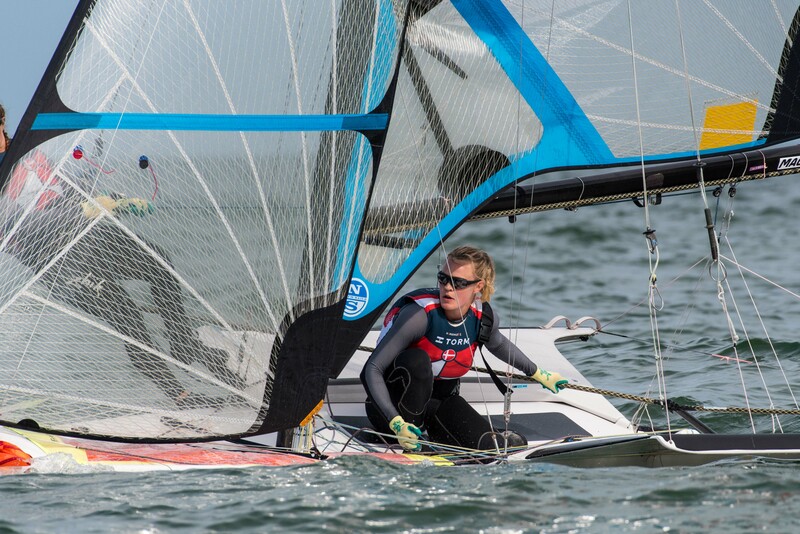 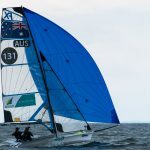 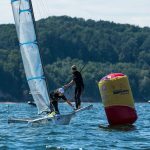 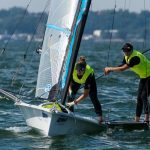 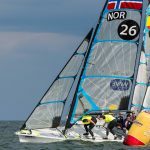 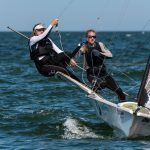 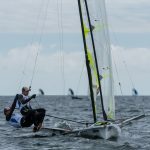 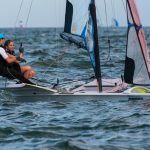 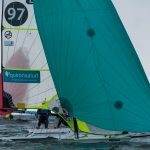 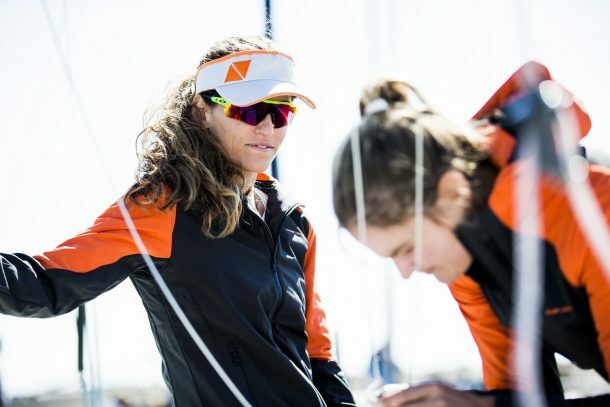 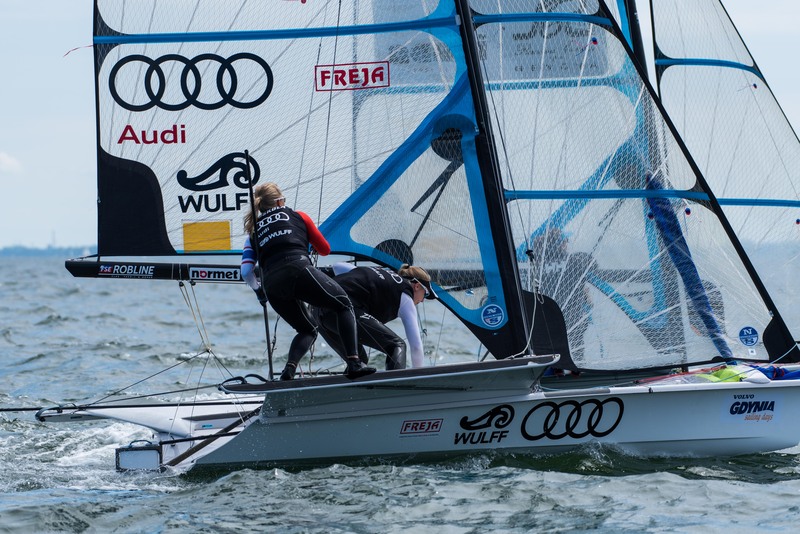 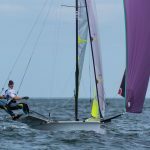 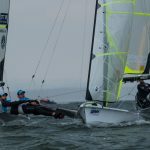 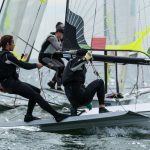 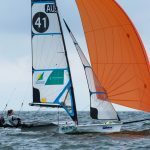 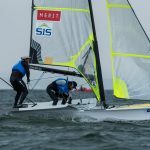 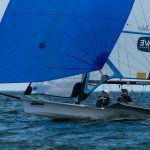 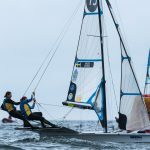 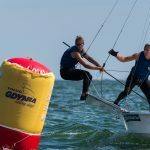 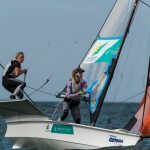 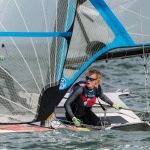 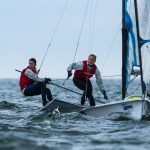 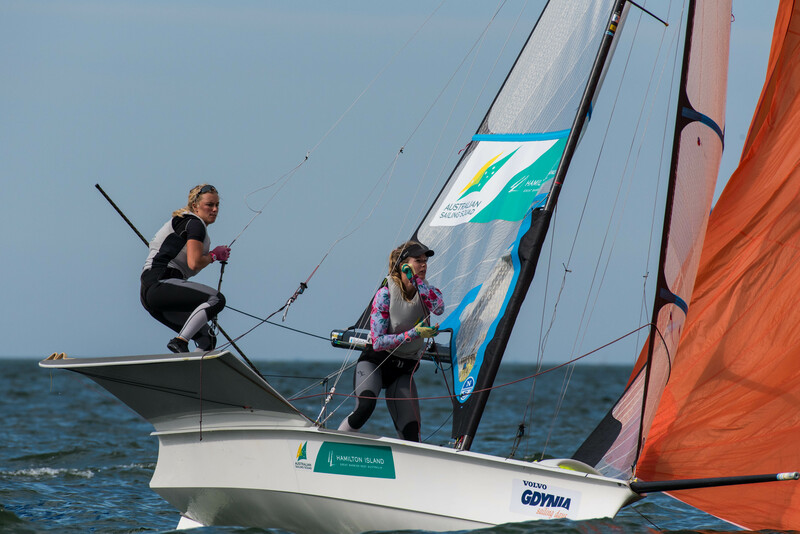 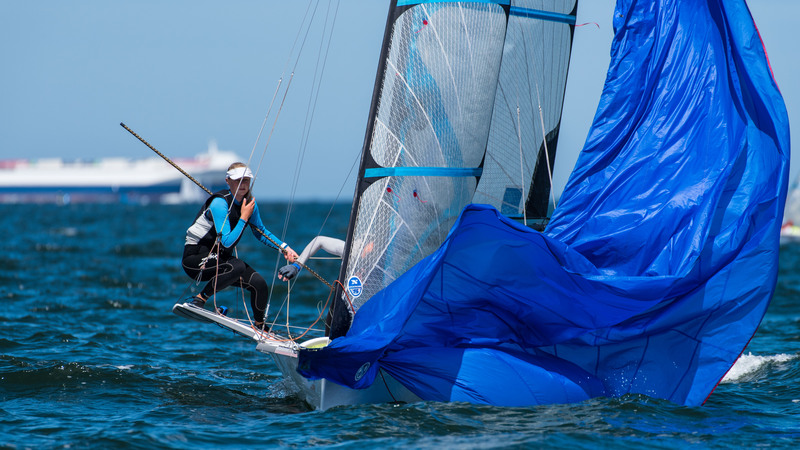 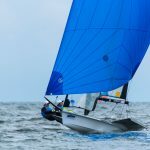 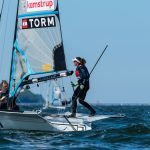 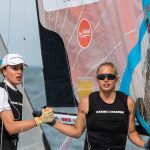 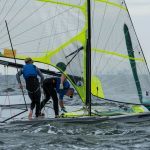 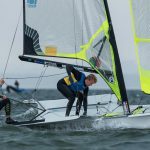 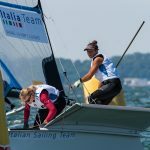 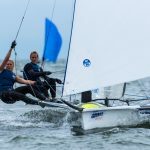 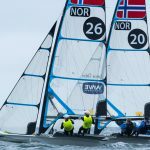 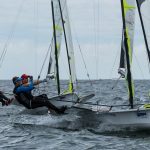 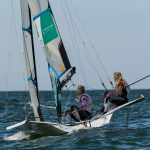 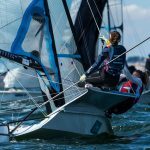 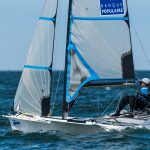 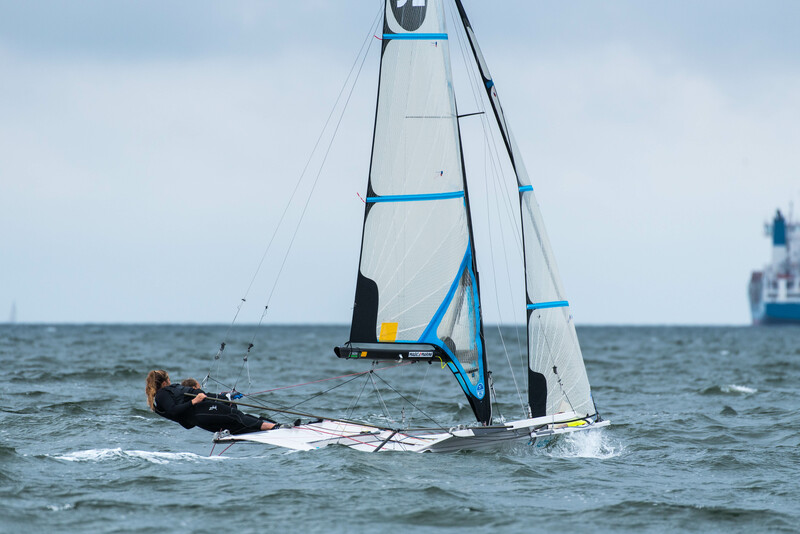 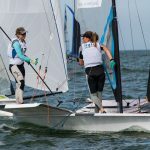 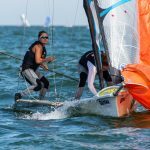 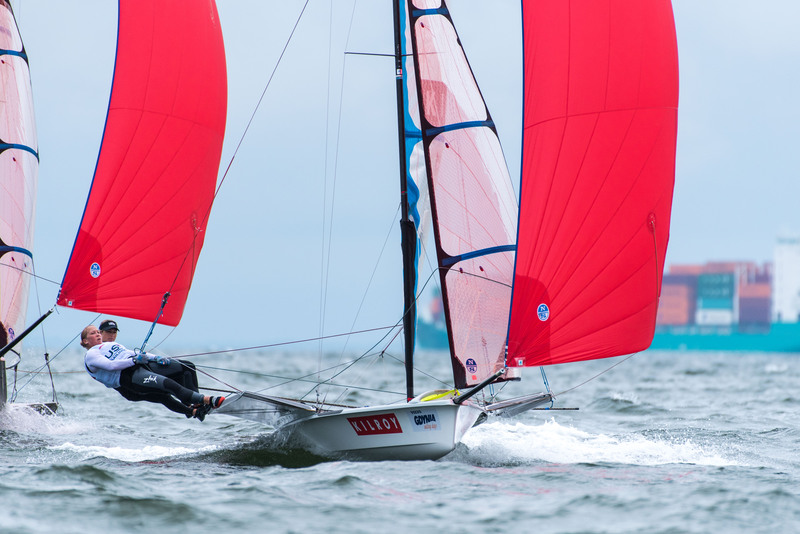 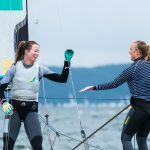 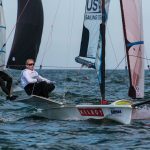 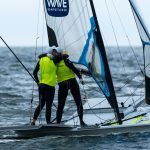 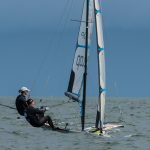 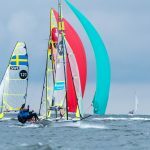 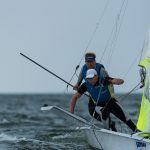 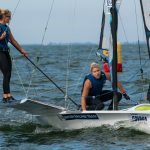 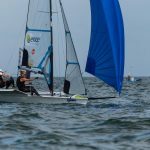 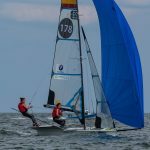 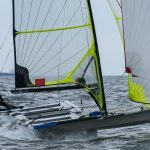 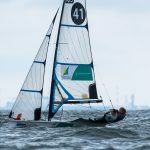 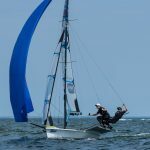 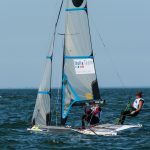 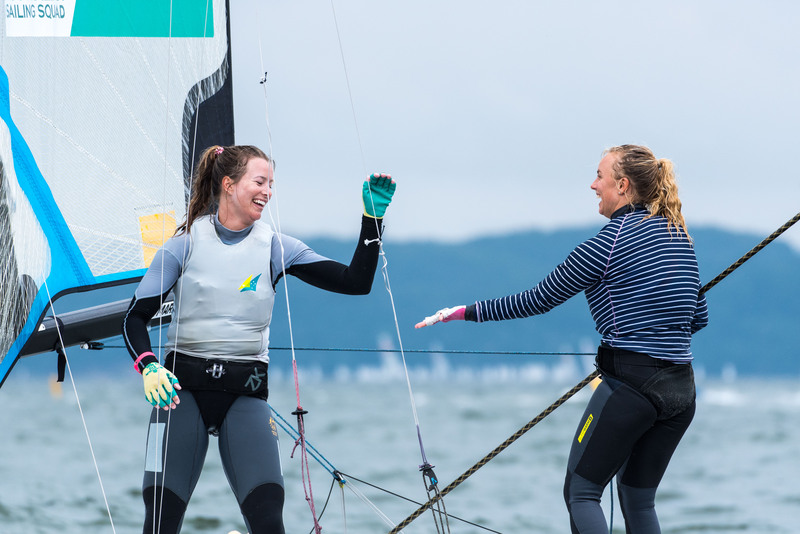 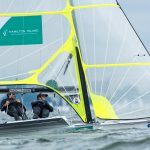 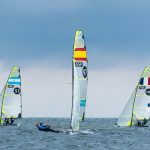 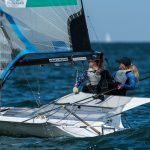 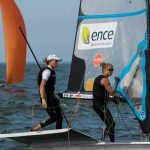 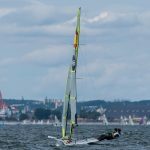 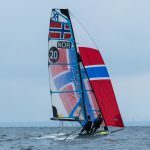 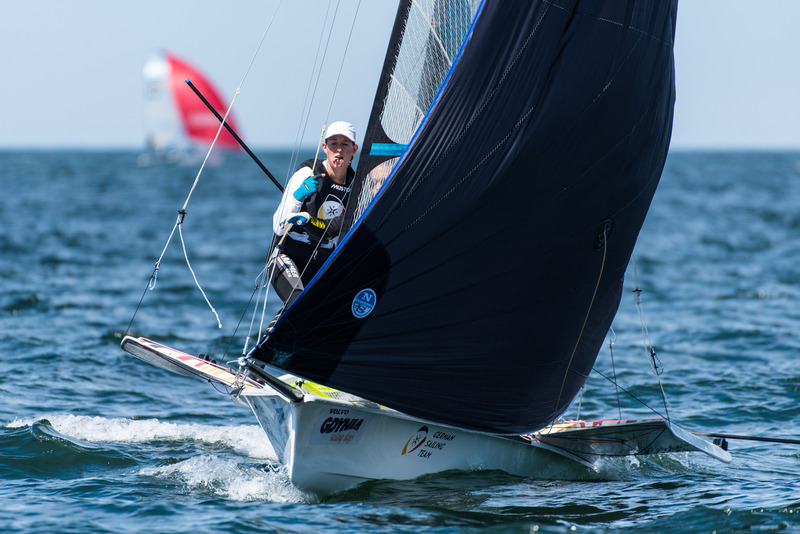 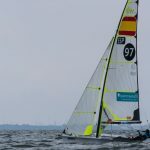 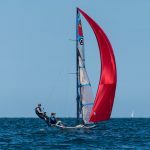 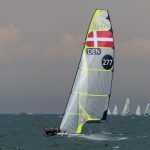 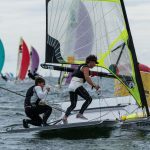 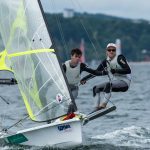 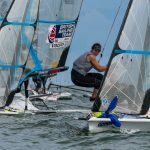 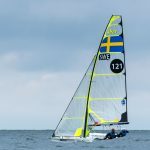 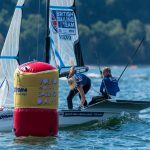 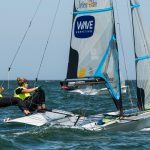 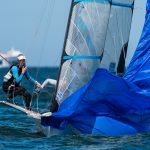 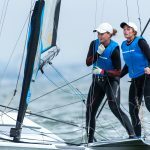 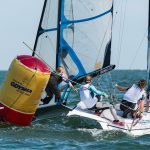 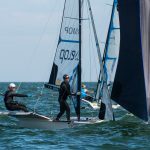 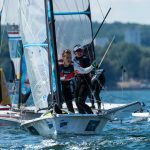 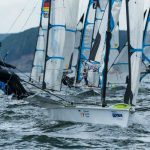 Helene Naess and Marie Ronningen (NOR) got off to a hot start to the season, with top 5 finishes at Palma and Hyeres, but struggled a bit in the breezier conditions of Kieler Woche last week. 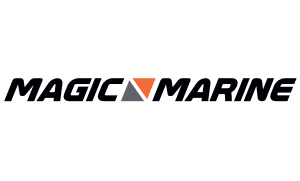 They’ll be looking to rekindle their early season form. 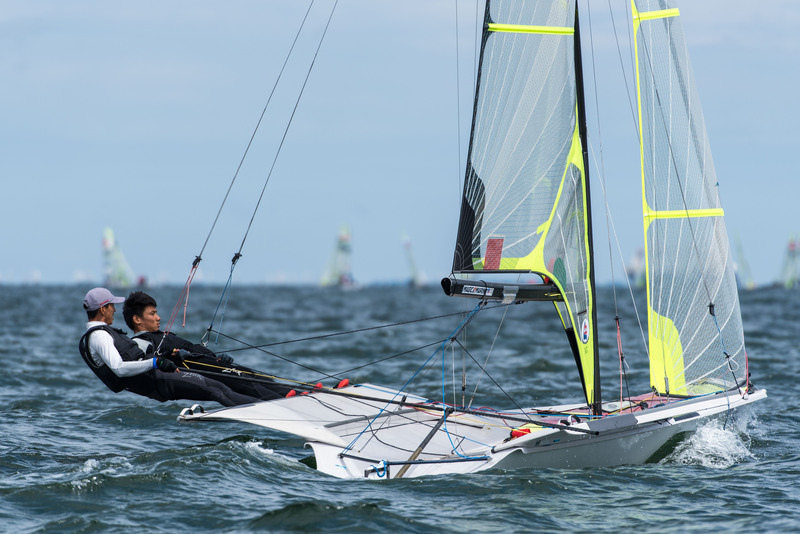 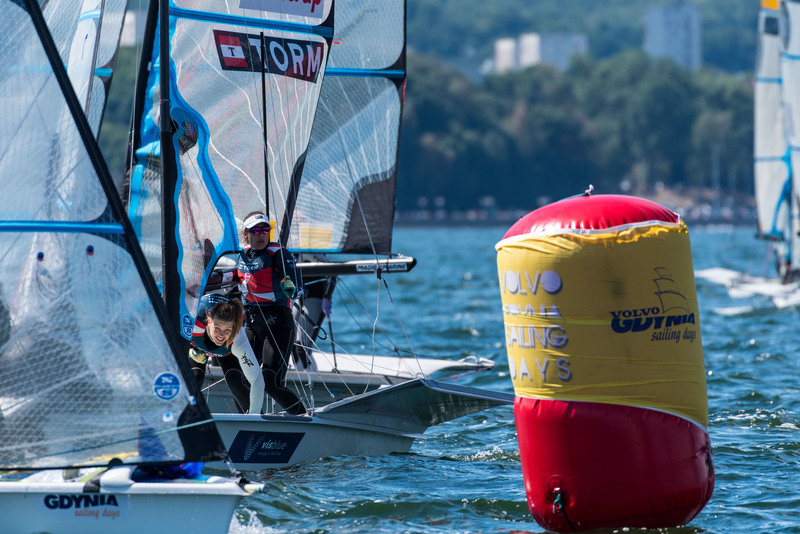 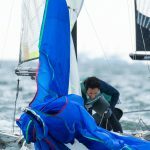 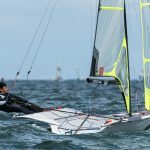 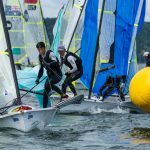 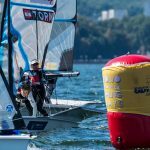 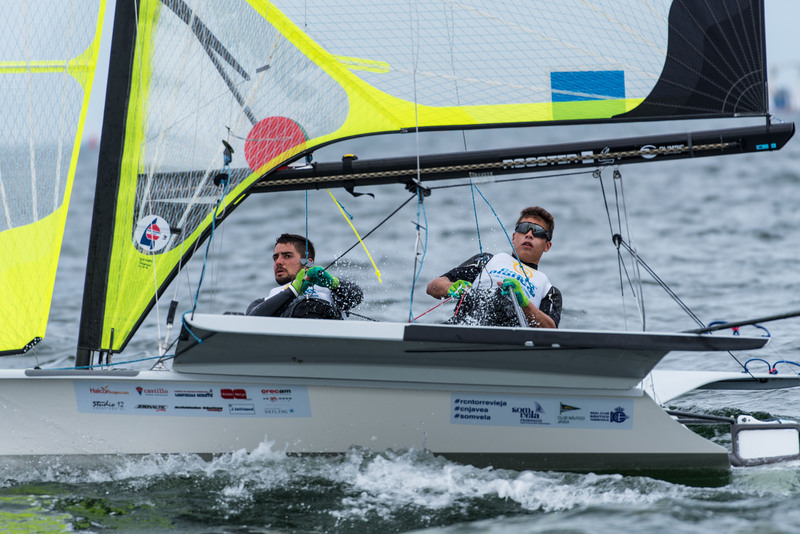 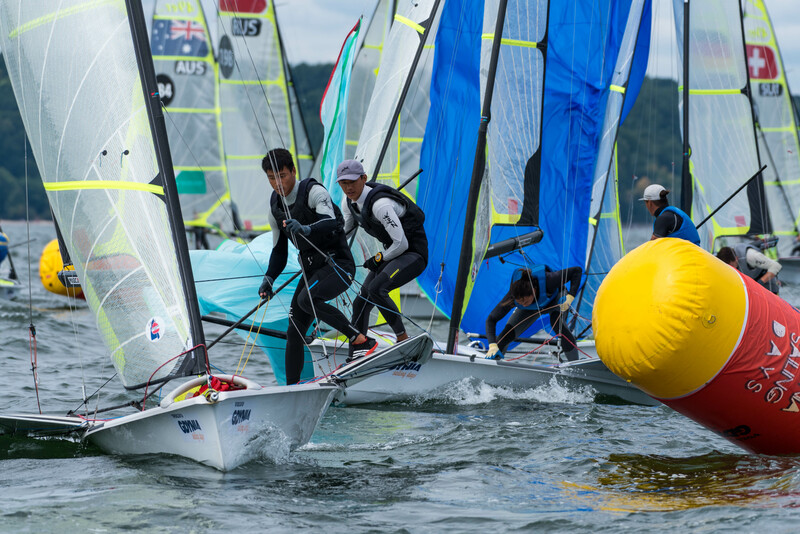 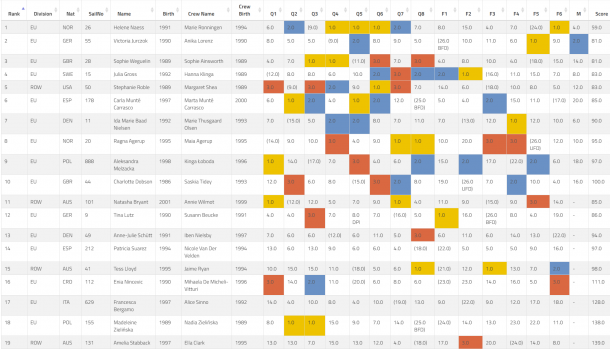 Chika Hatae and Hiroka Itakura (JPN) finished last season with a great Sailing World Cup Japan, and have showed consistently descent finishes this year. 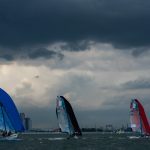 It may be too much to ask of them to take this as a first major title, but they have shown consistent improvement over the past two seasons and would be contenders in a light championship. 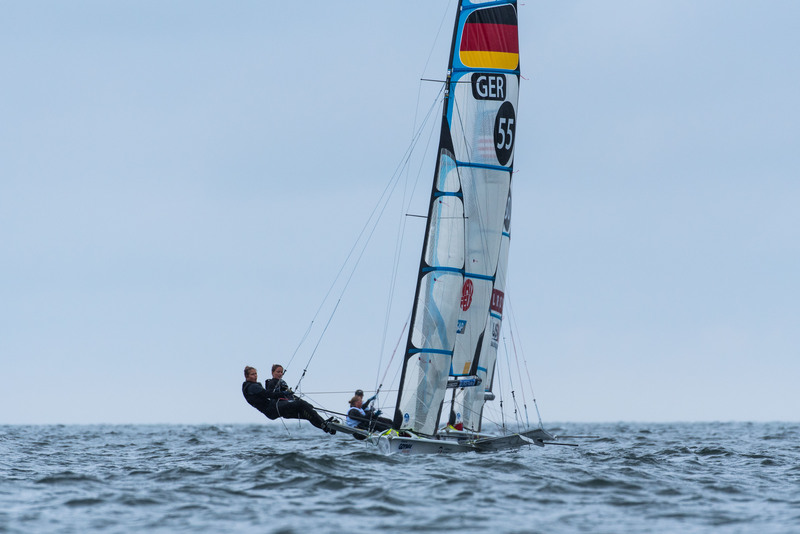 Finally we must mention the return to the fleet of Paris Henken, newly teamed up with Anna Tobias. 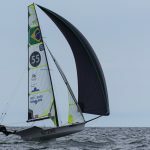 Paris has been absent since Rio, at University in the USA. 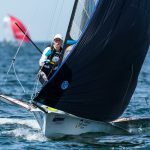 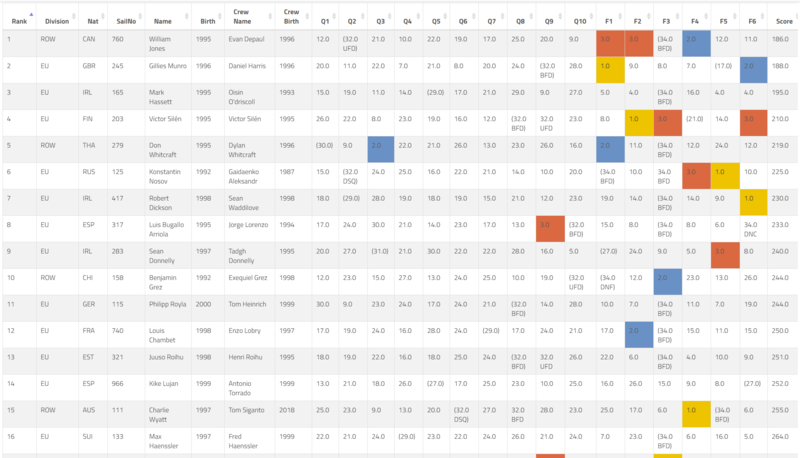 Anna Tobias (formerly Tunnicliffe) is making her second return to Olympic sailing after winning the radial in London 2008, and is taking up crewing now off the basis or her global ranking in Crossfit. 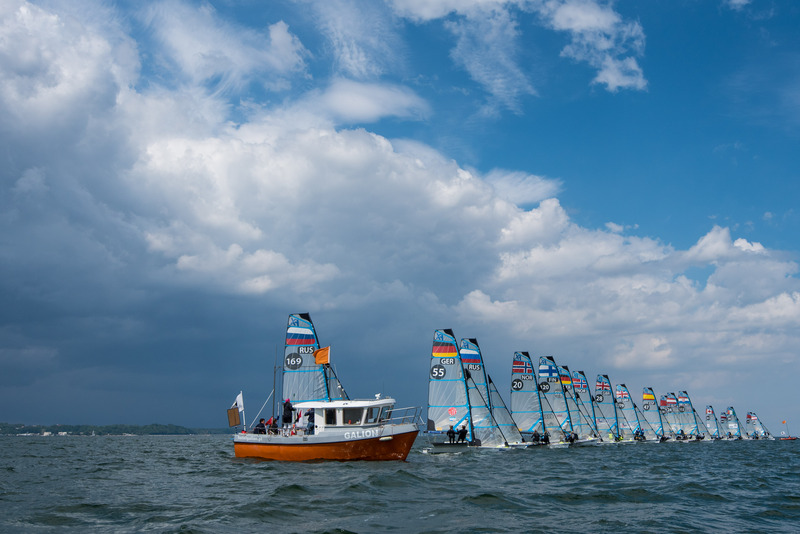 The fleet is set, and it will be a week of drama. 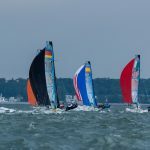 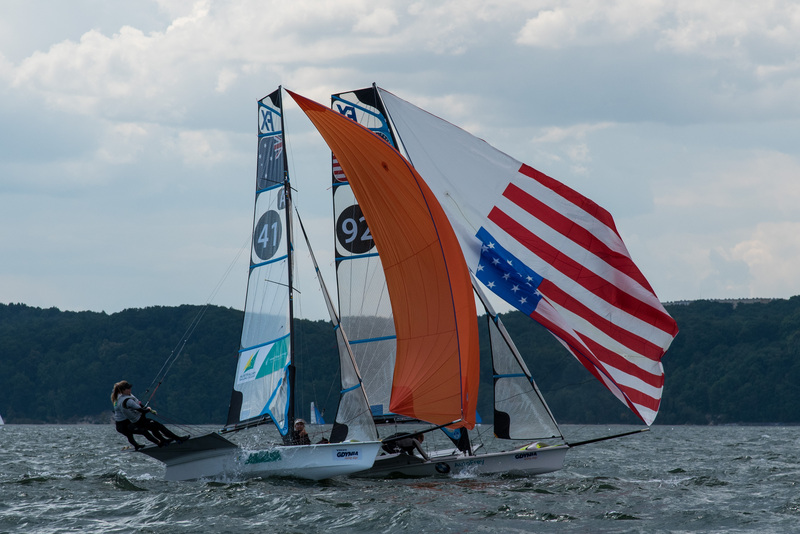 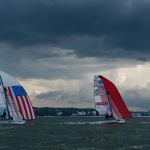 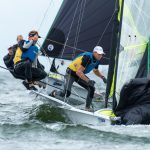 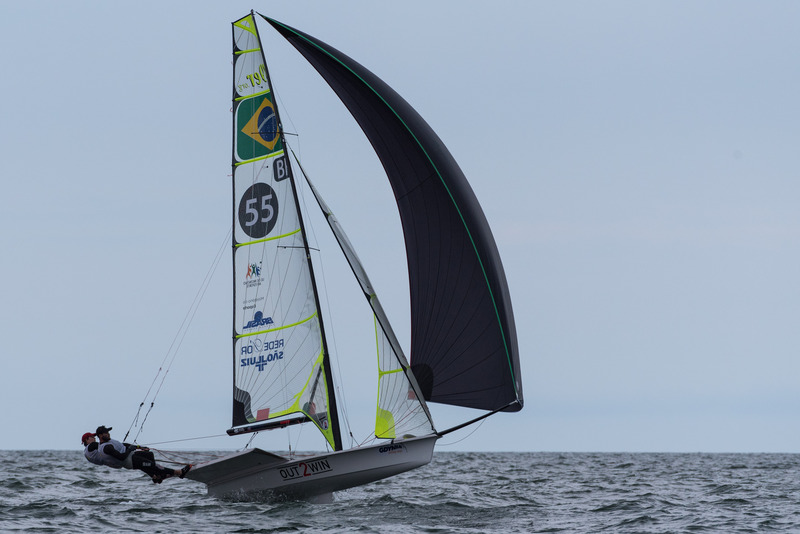 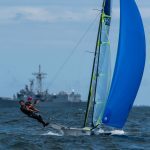 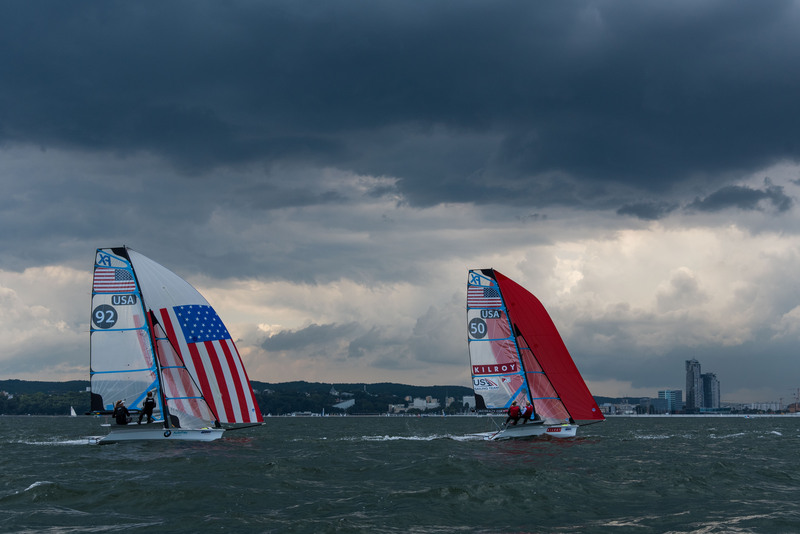 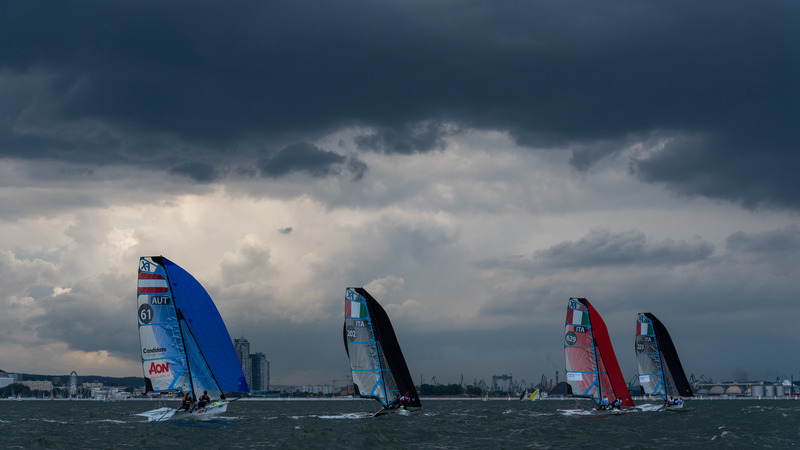 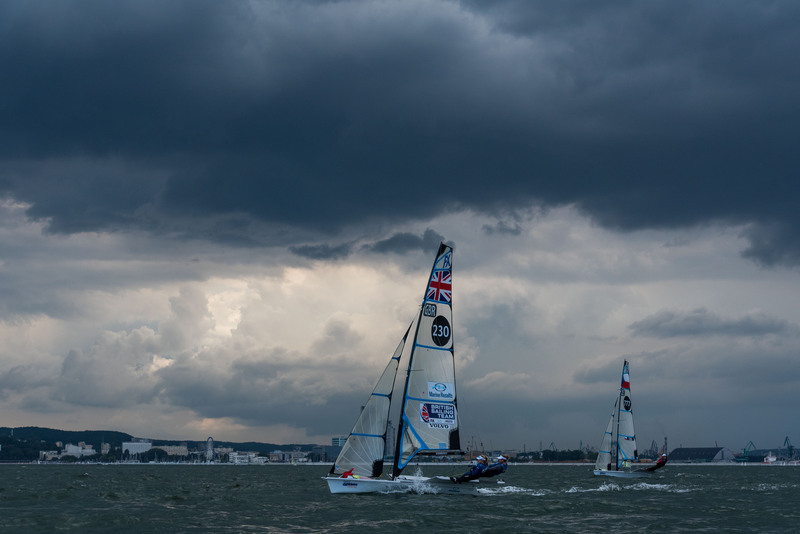 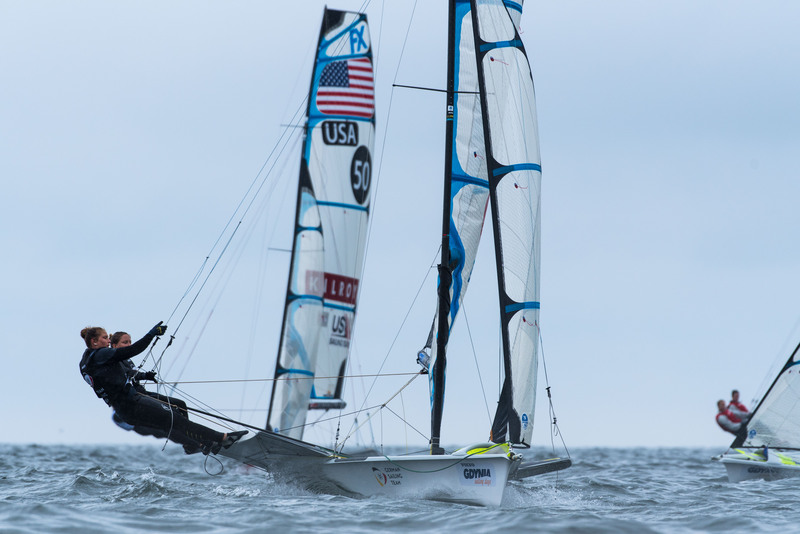 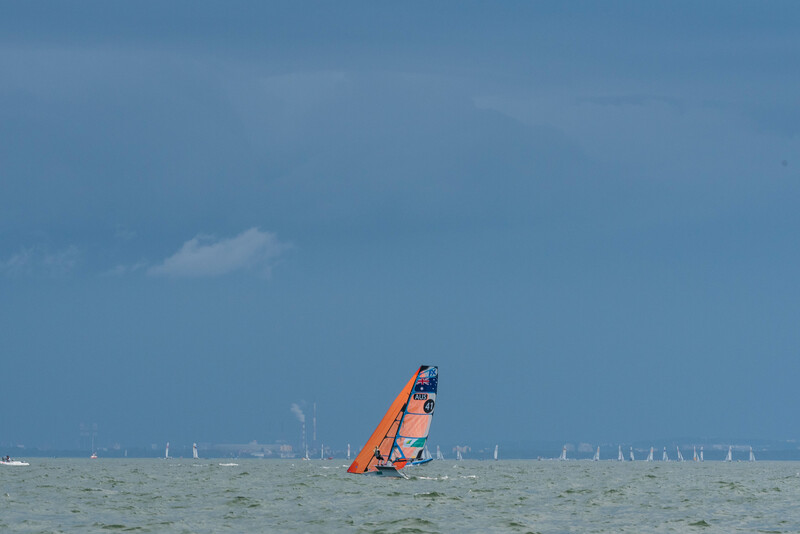 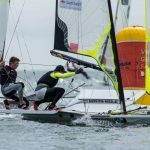 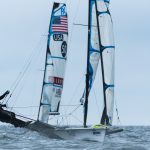 Many of the biggest names of 49erFX sailing are not back to competing, many resting after the conclusion of the Volvo Ocean Race, others resting up for the big test in Aarhus next month. 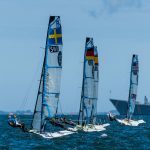 It’s a talented and deep fleet, it will be exciting to see who can build momentum and take this championship.